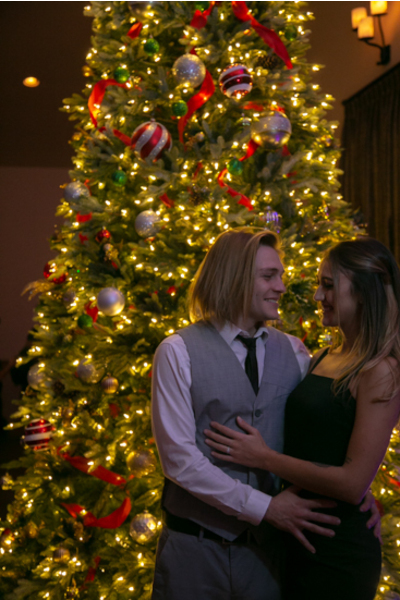 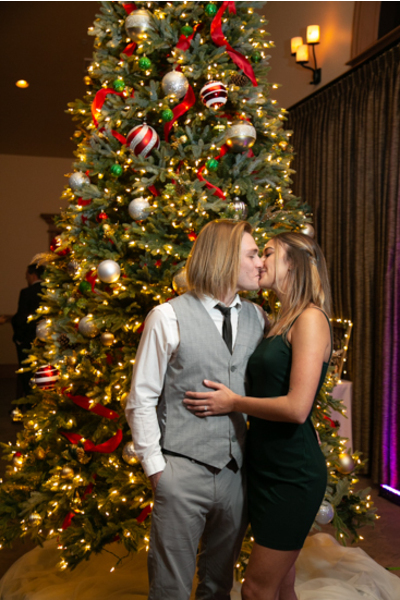 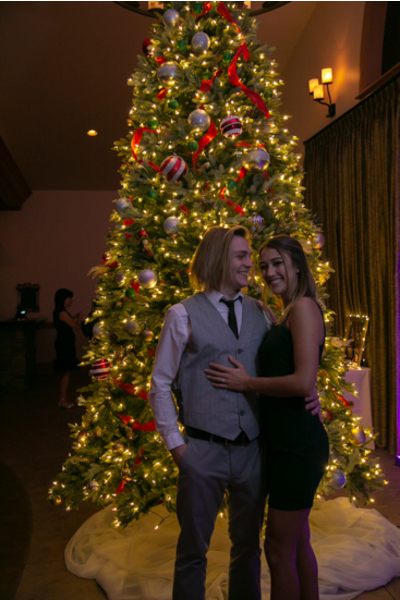 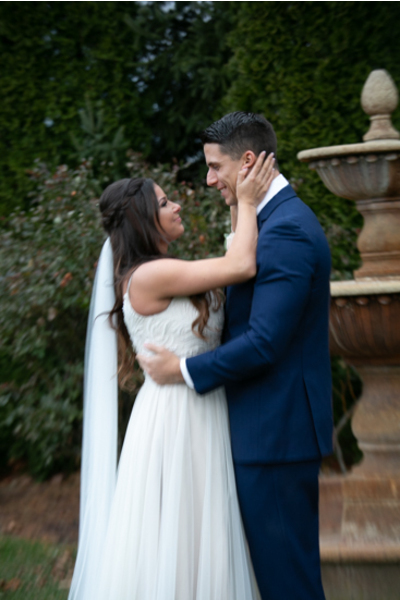 Congratulations to Jackie and Luke! 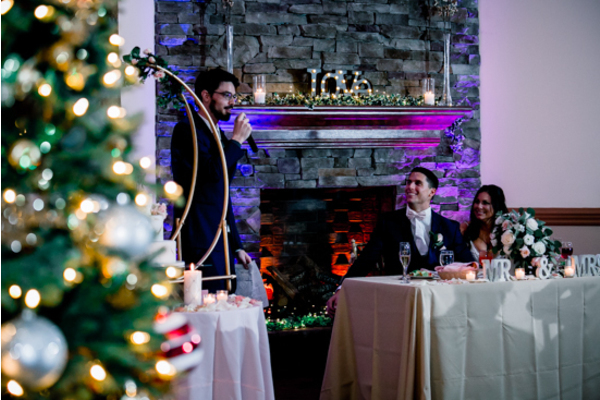 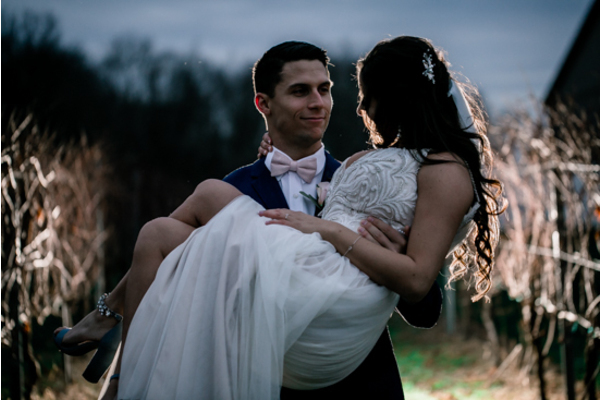 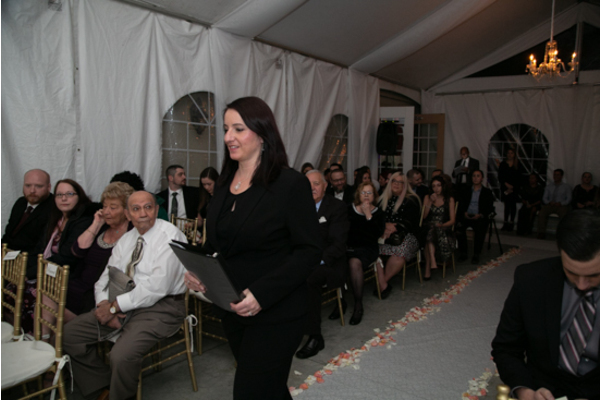 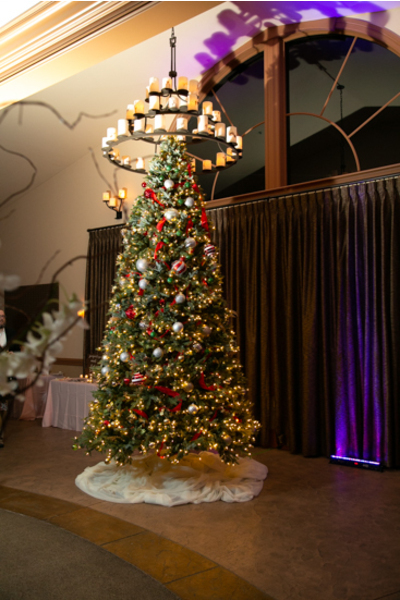 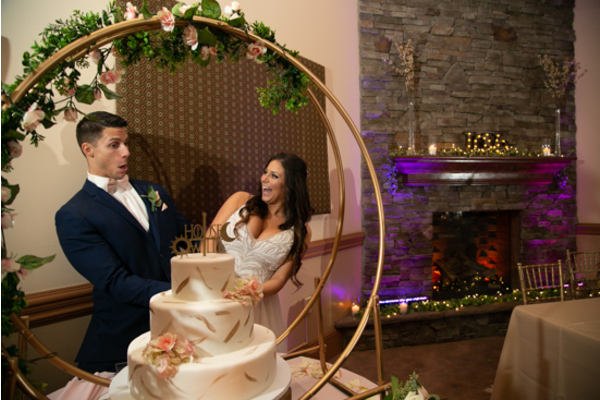 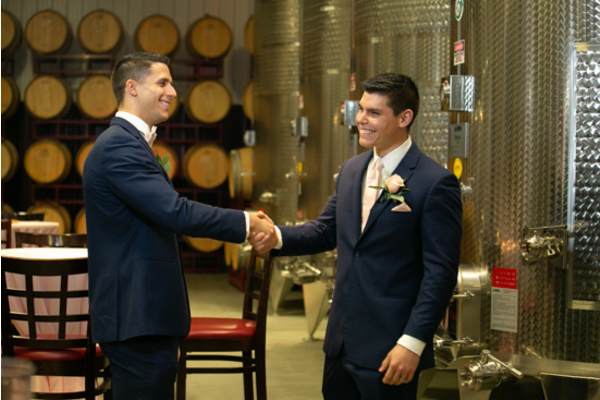 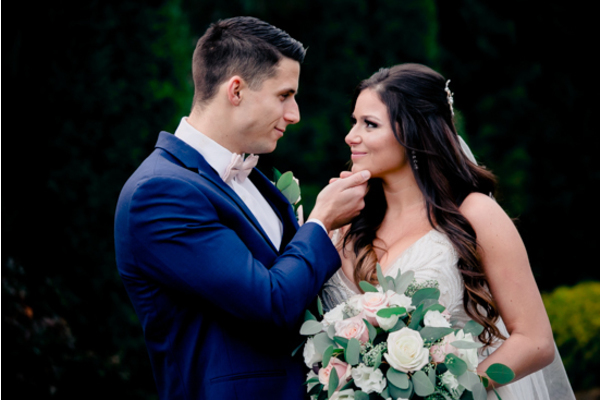 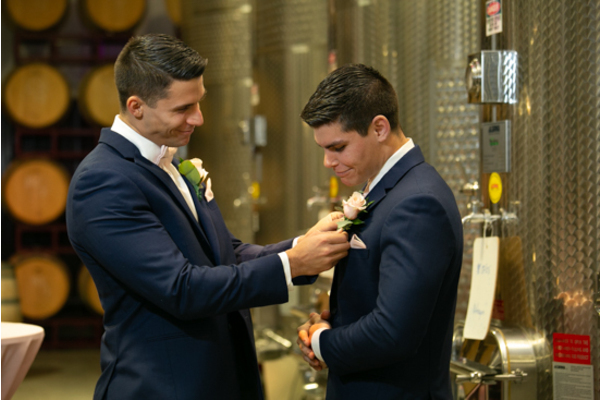 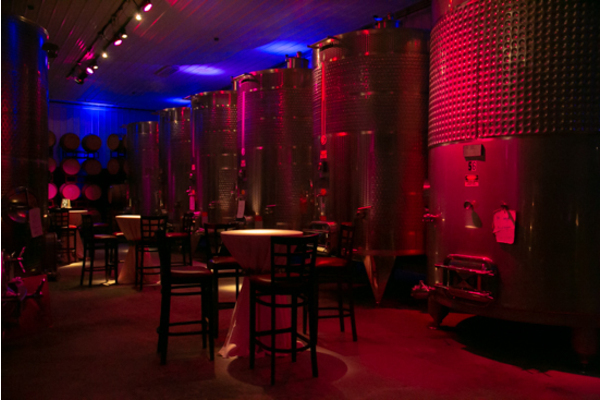 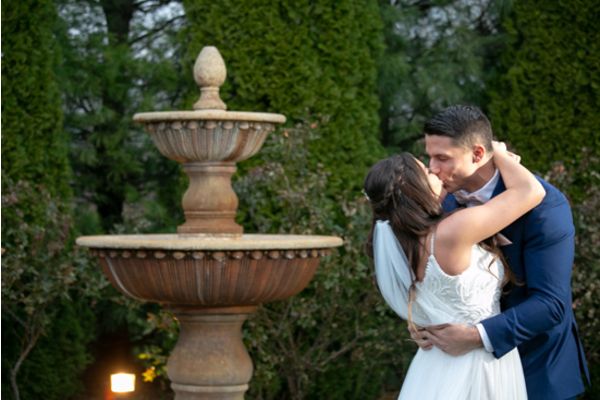 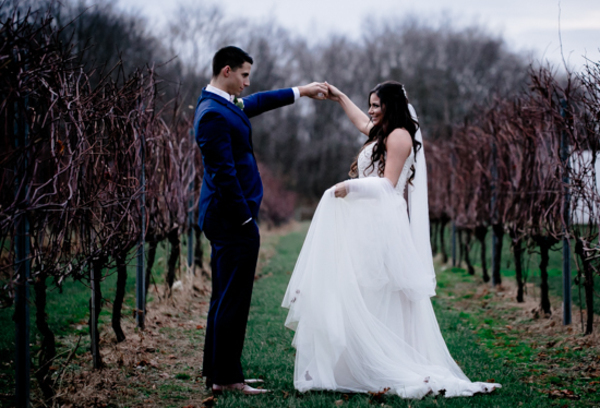 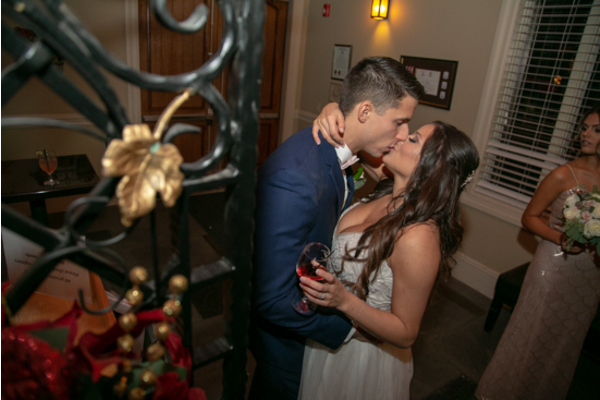 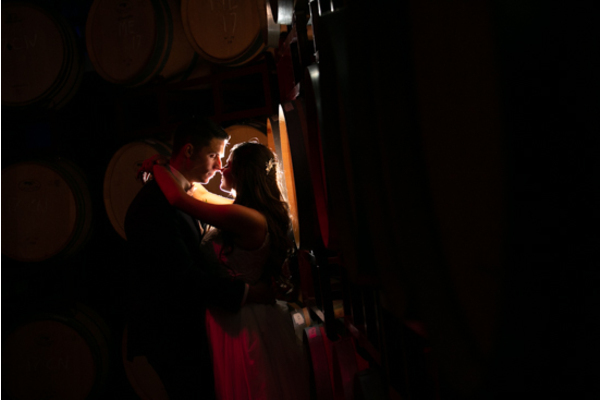 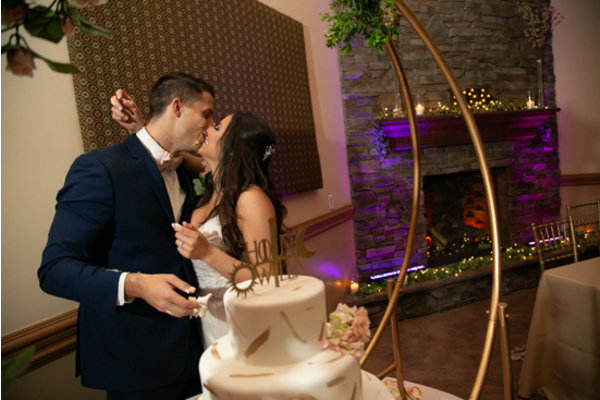 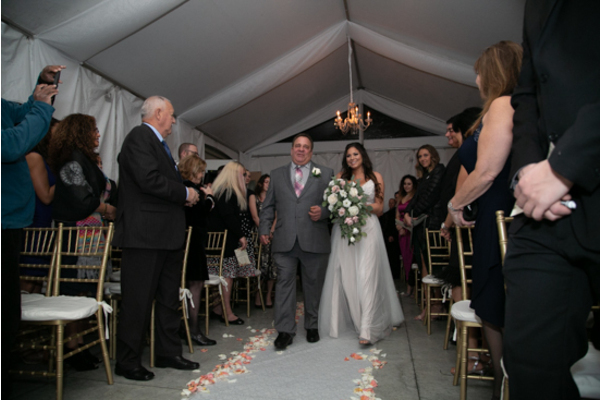 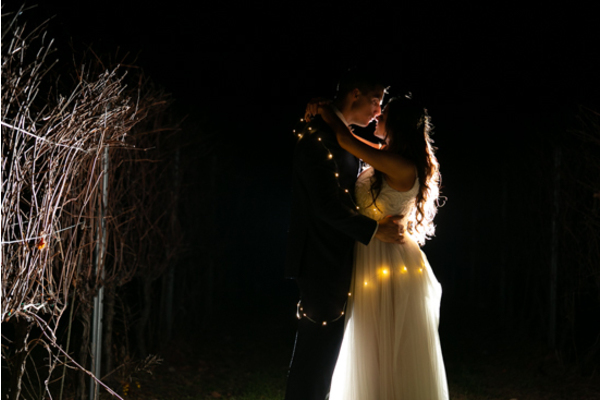 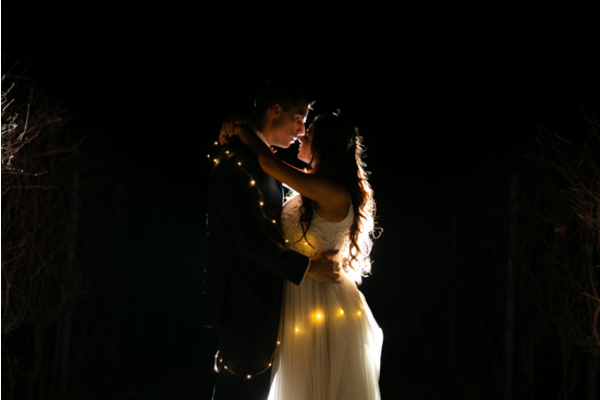 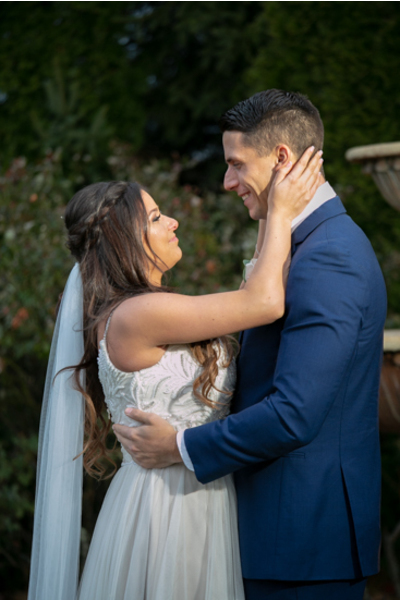 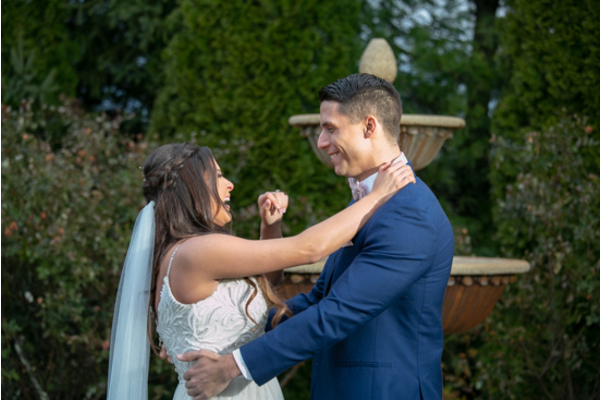 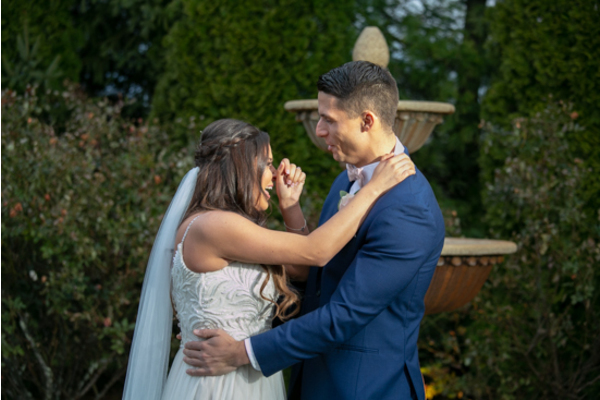 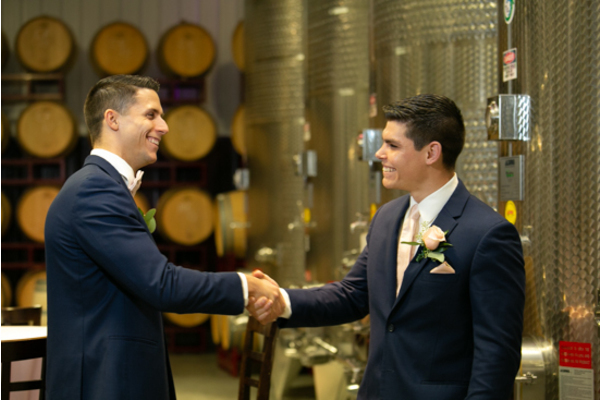 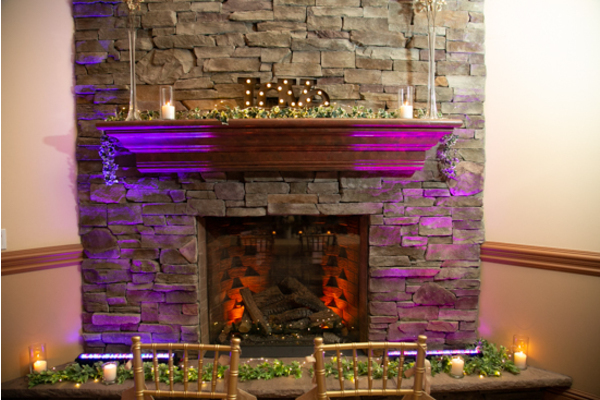 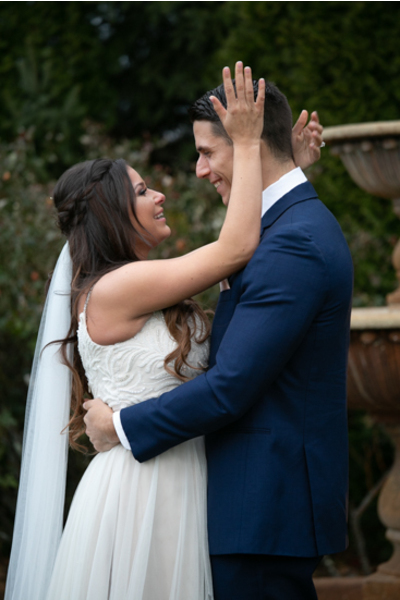 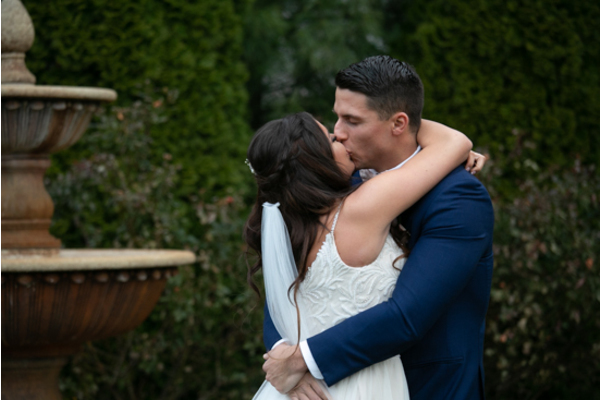 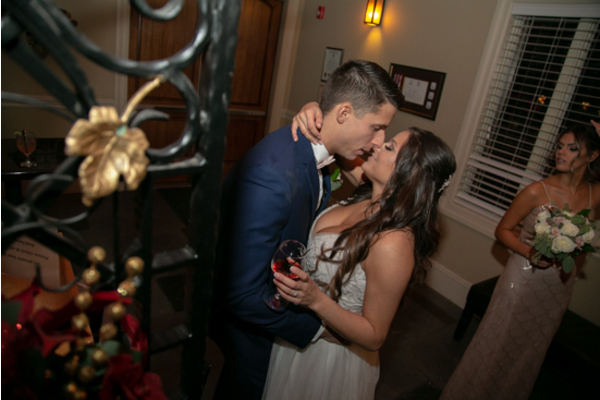 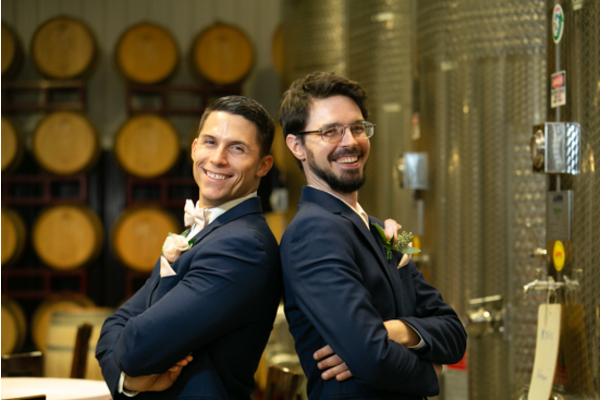 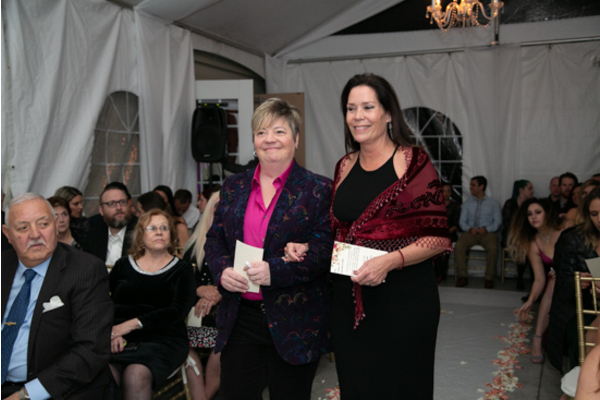 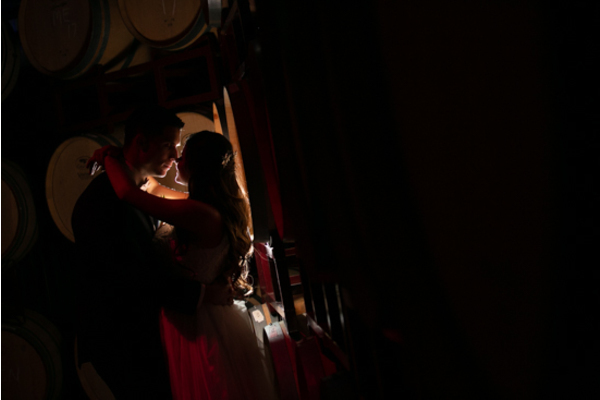 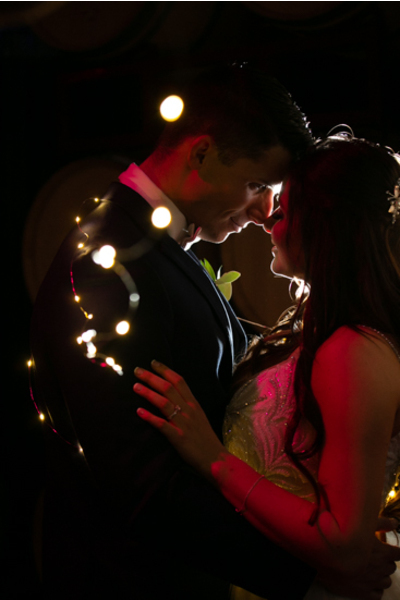 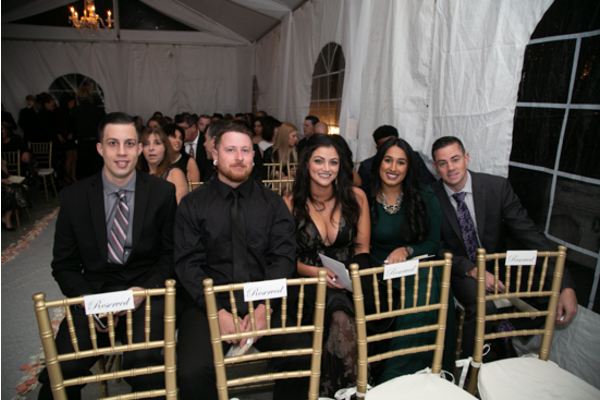 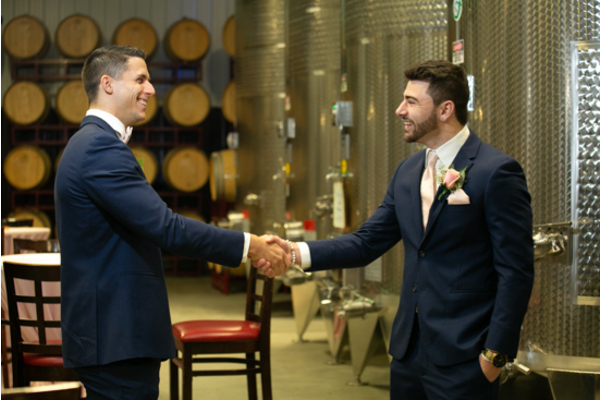 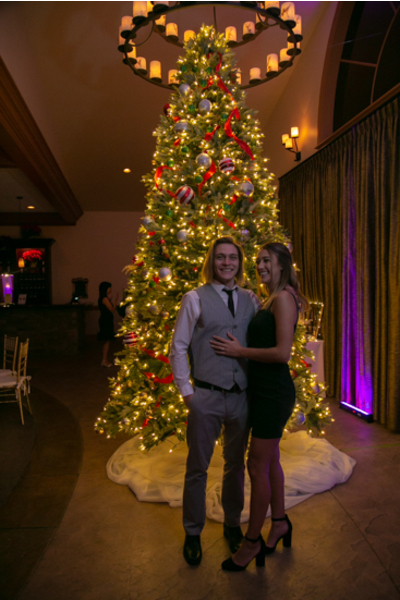 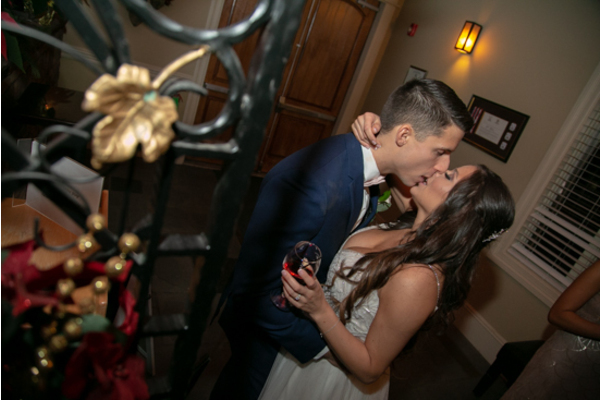 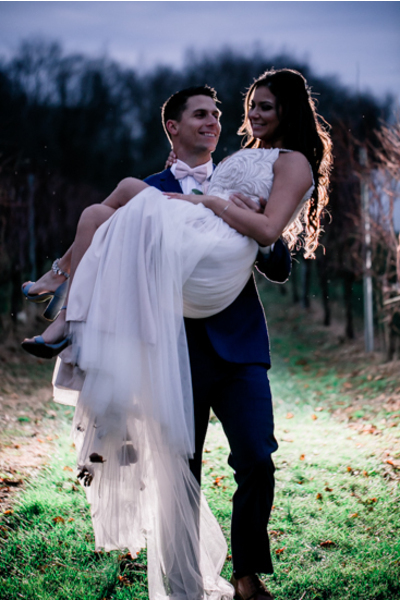 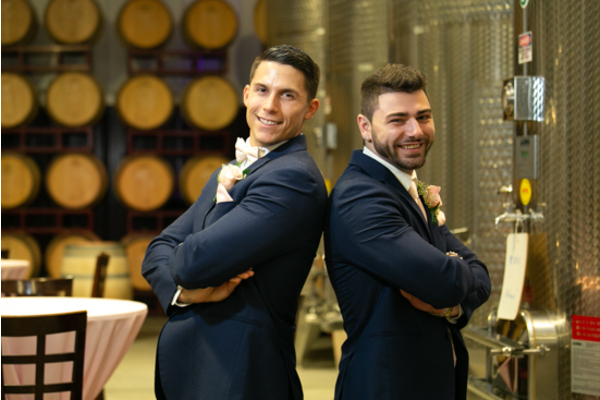 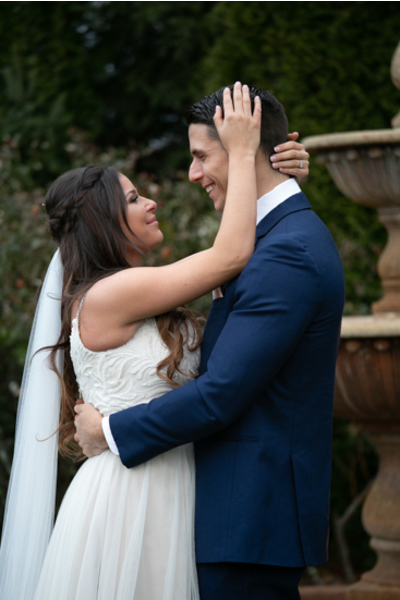 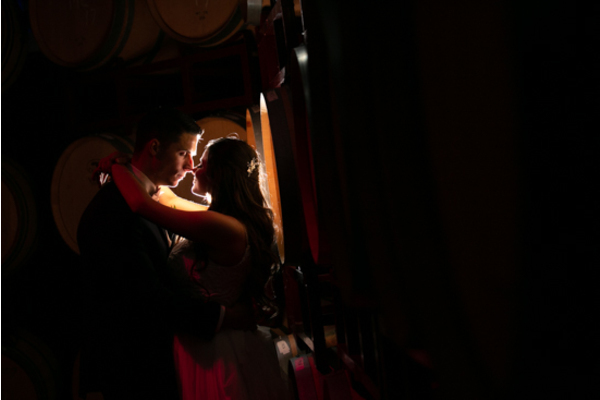 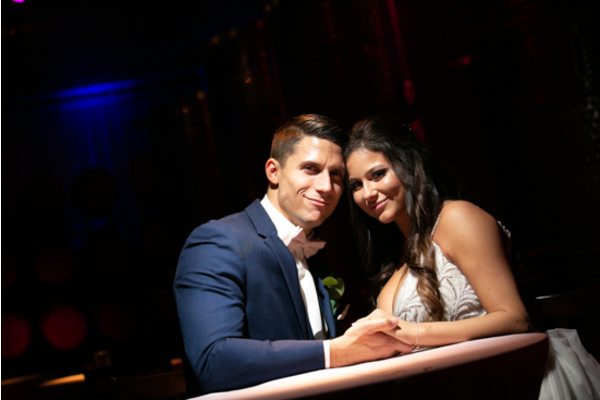 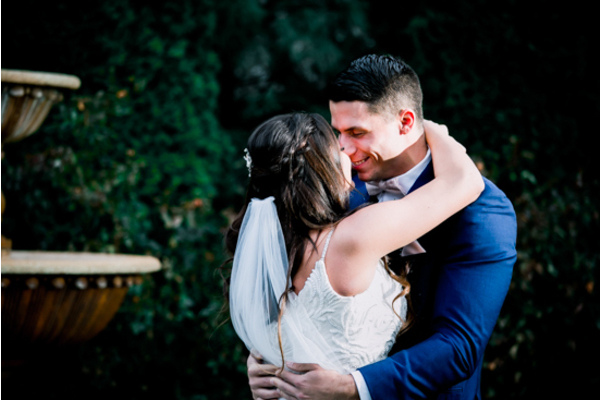 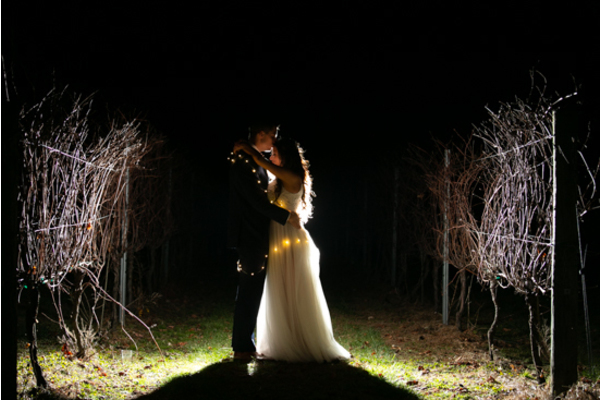 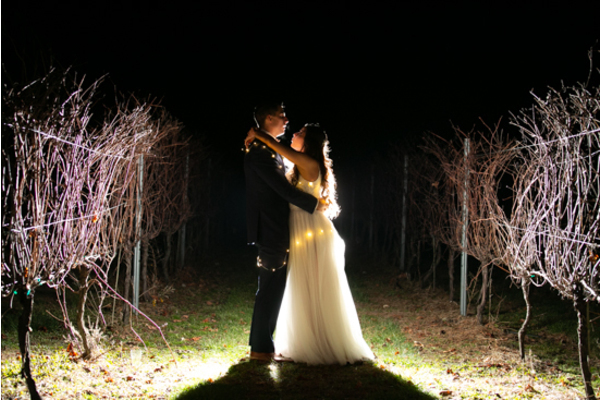 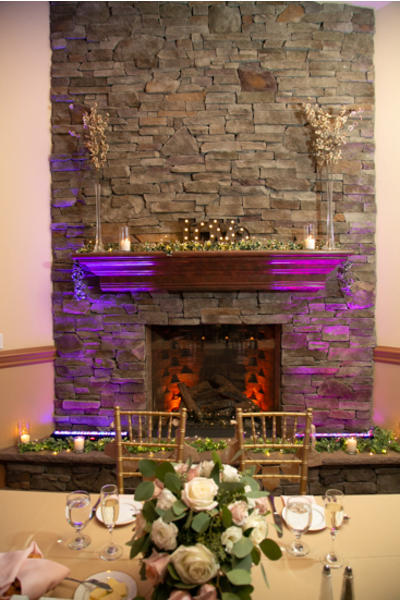 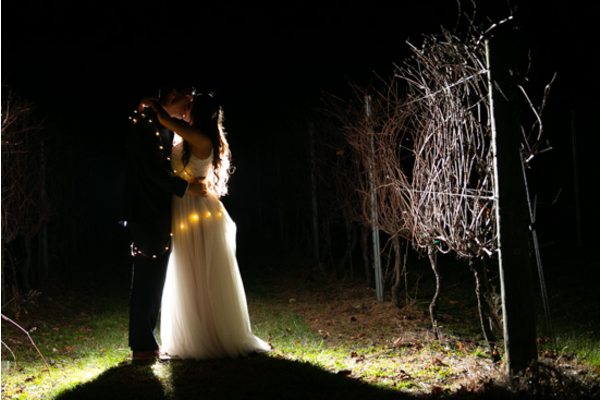 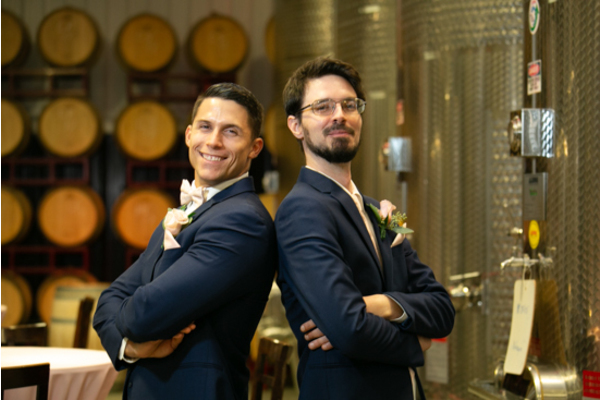 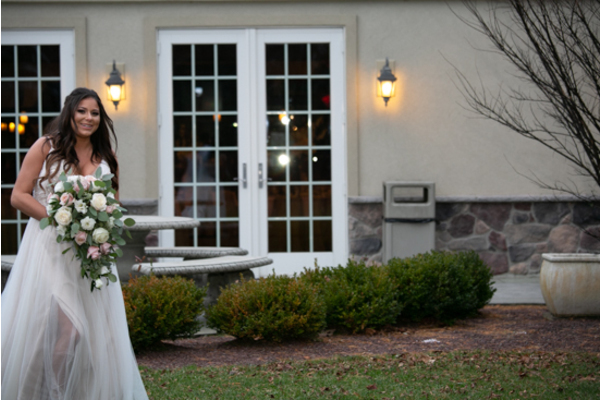 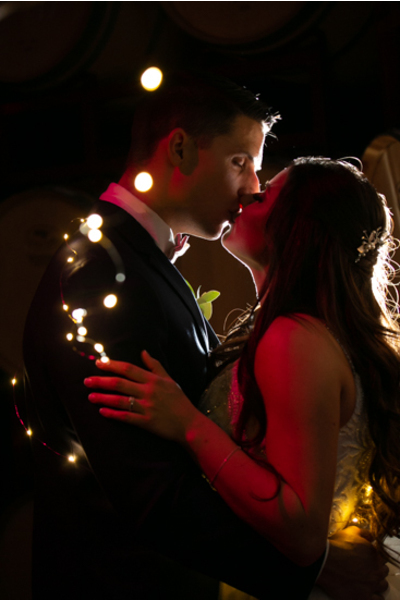 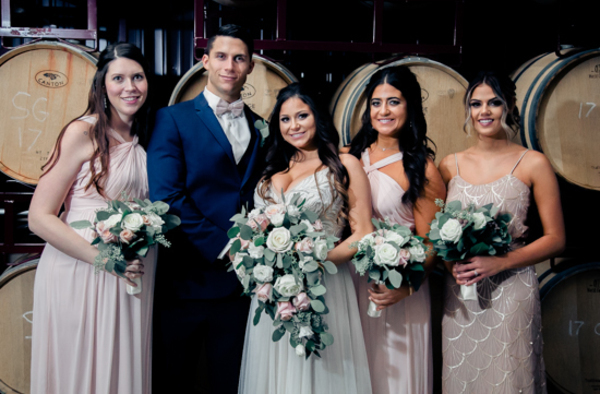 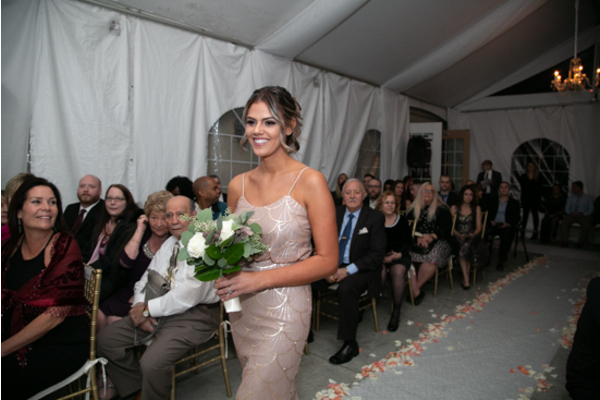 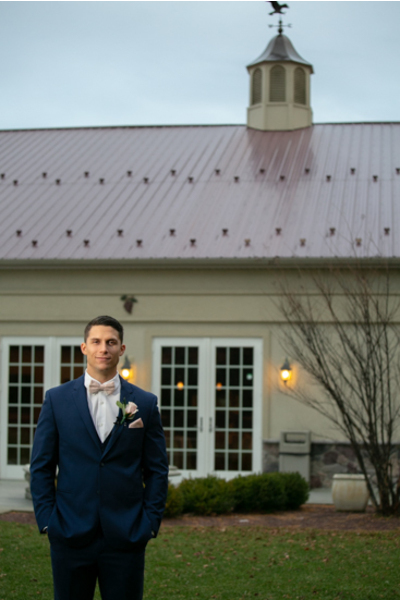 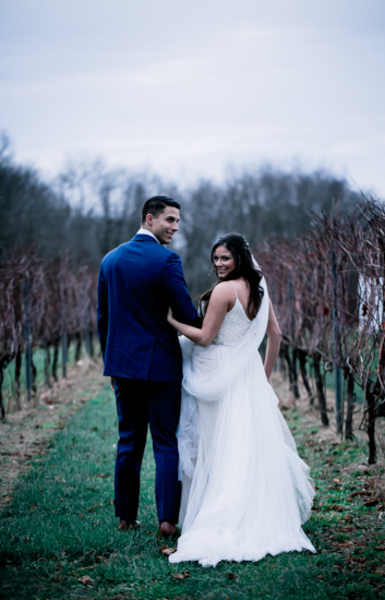 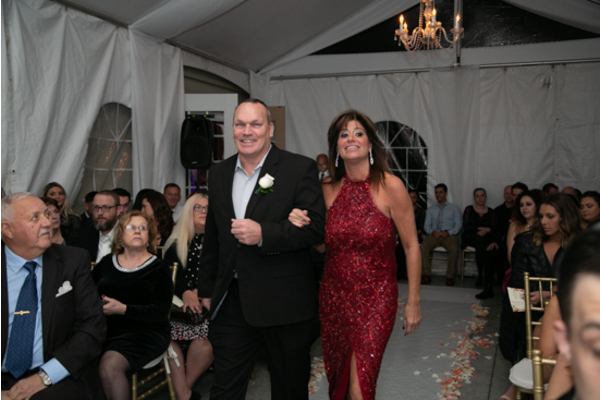 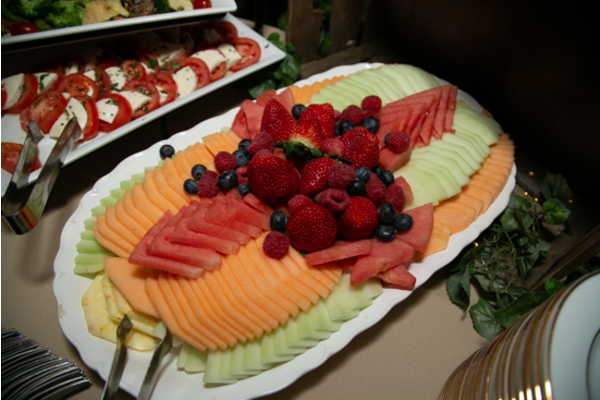 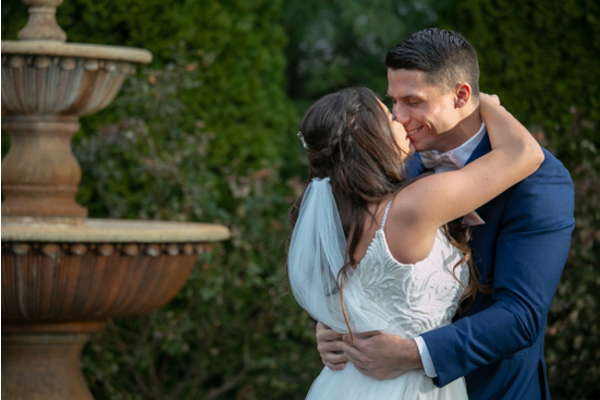 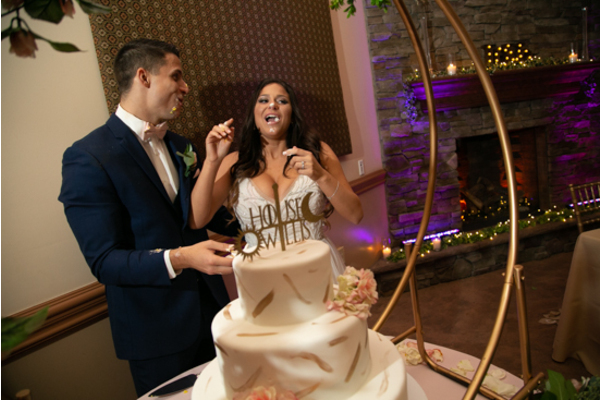 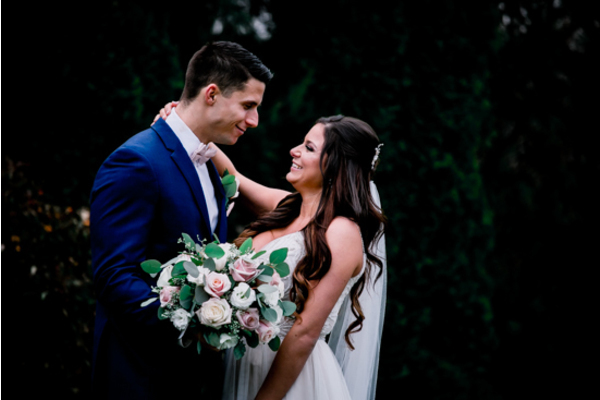 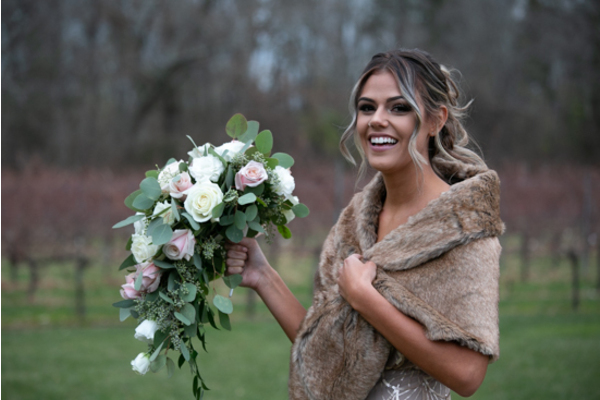 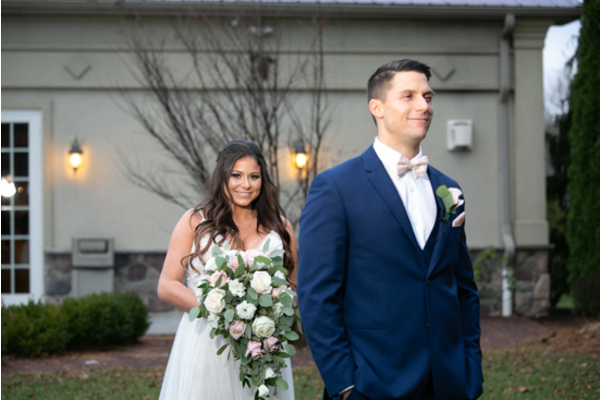 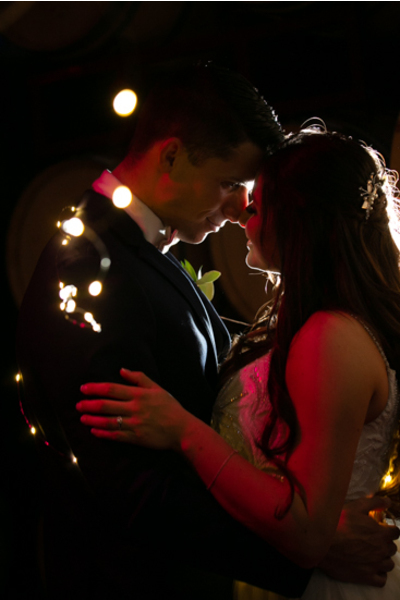 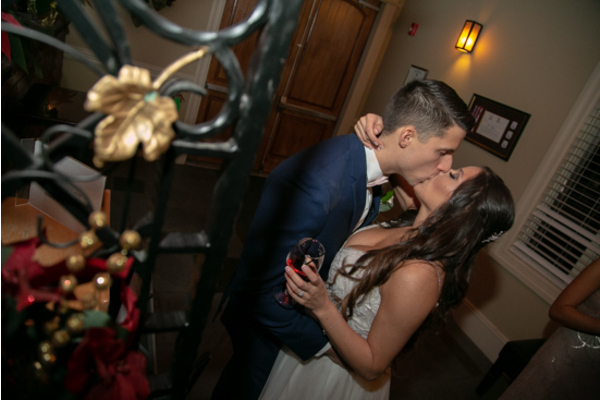 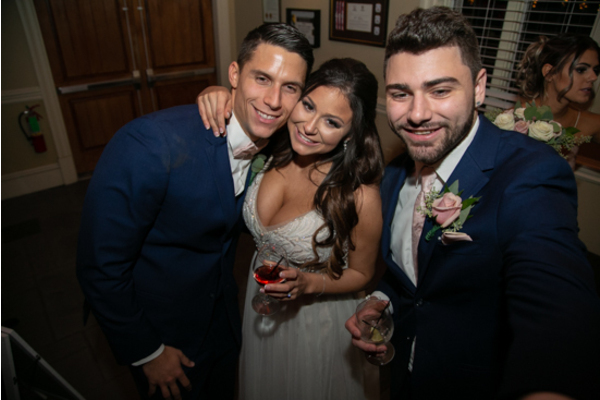 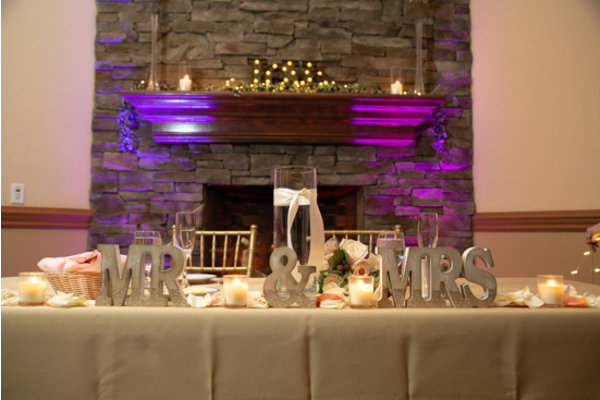 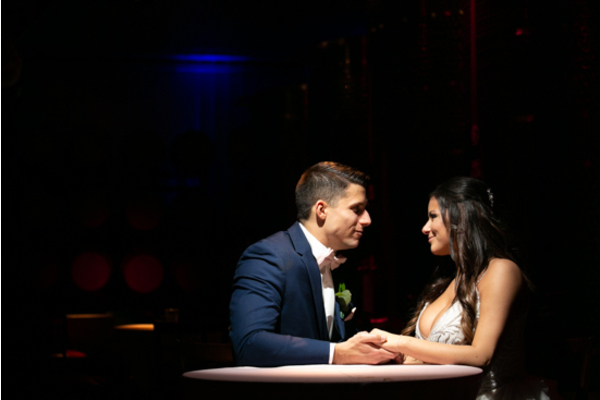 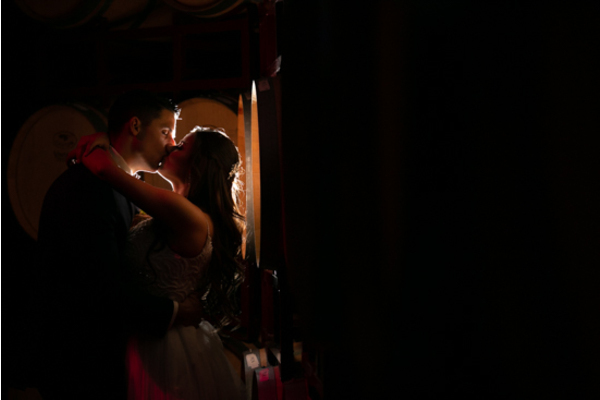 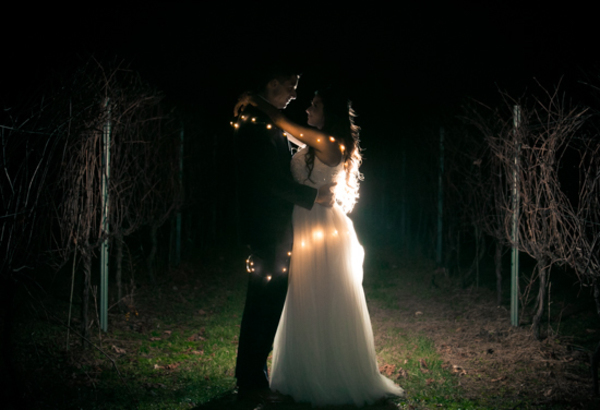 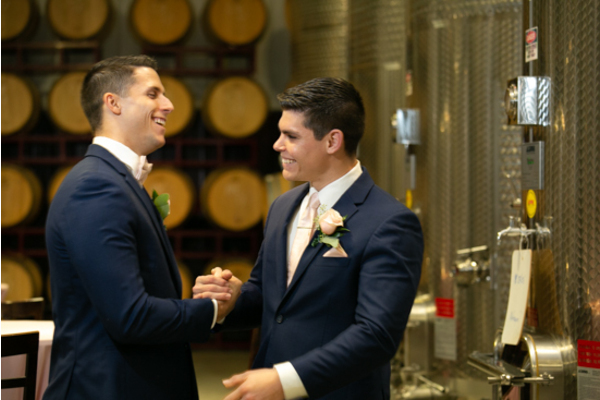 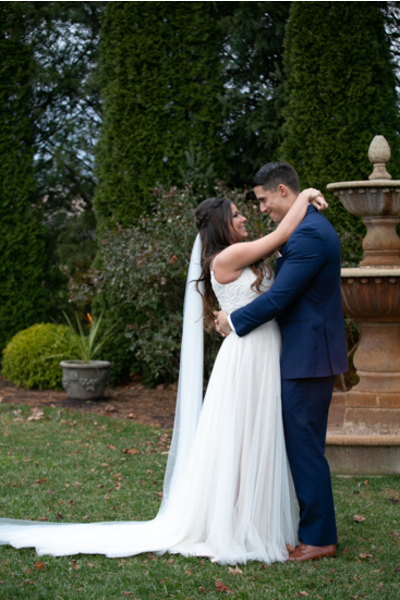 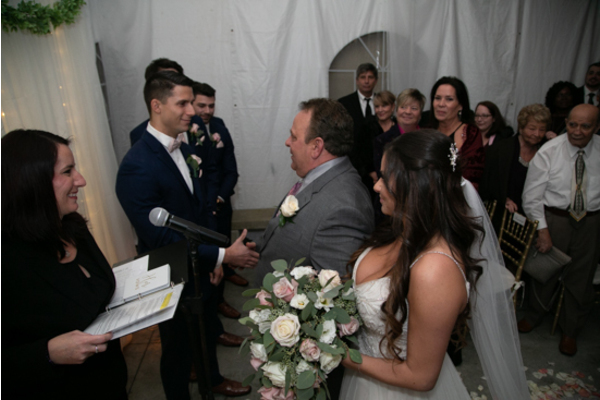 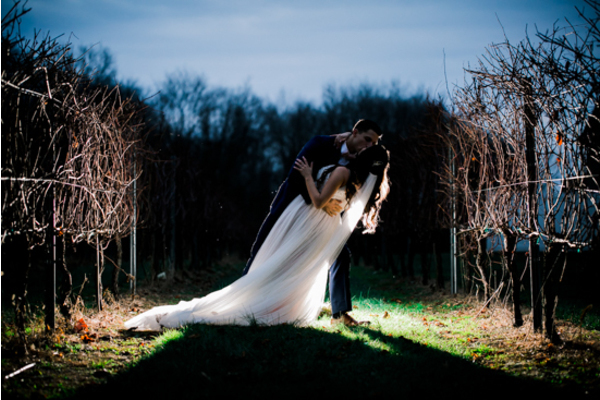 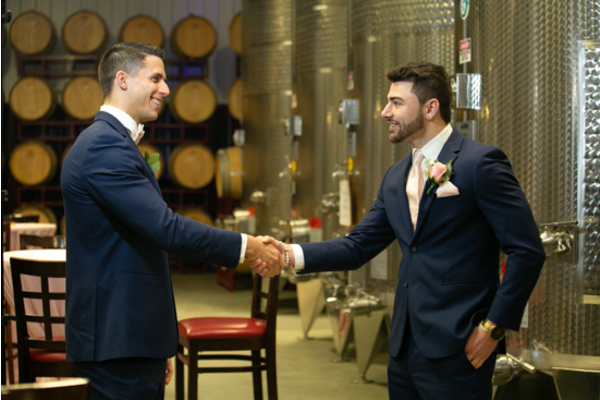 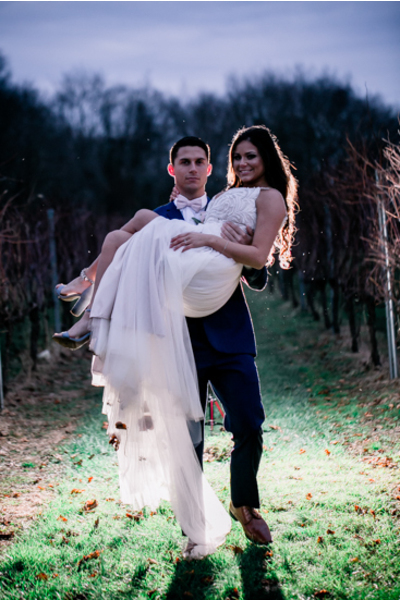 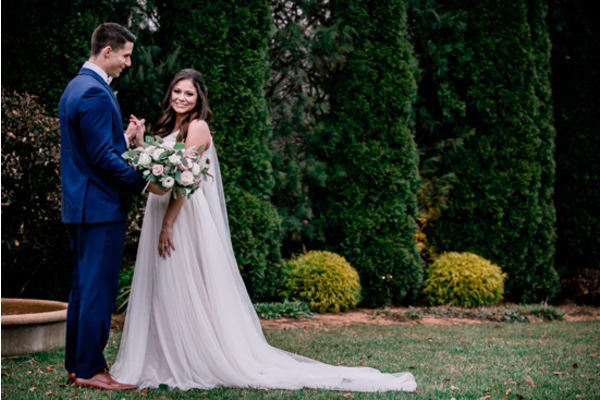 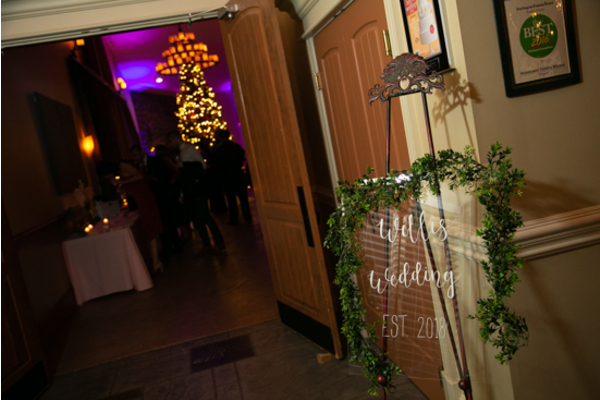 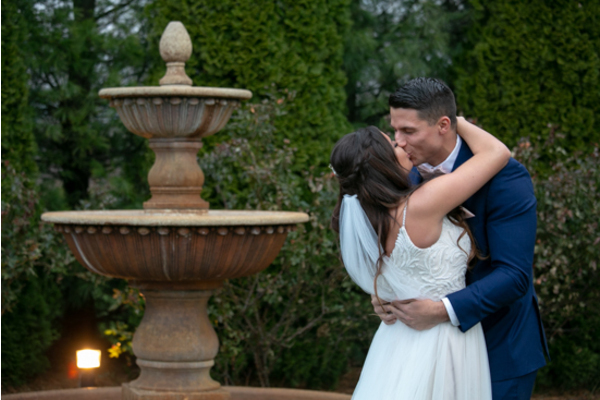 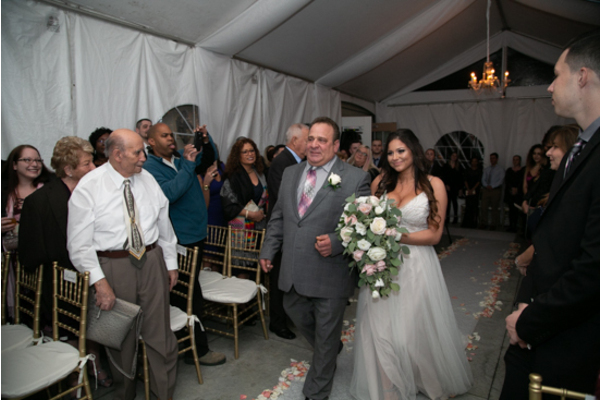 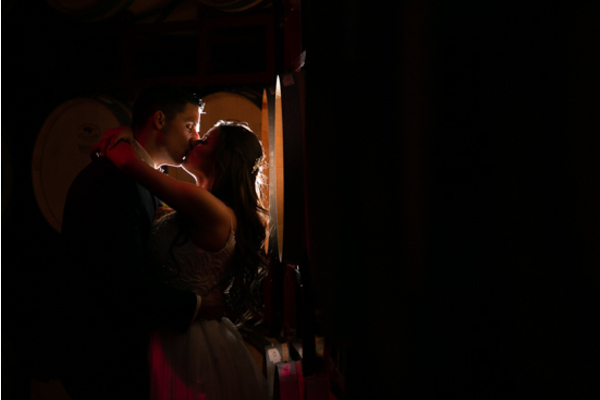 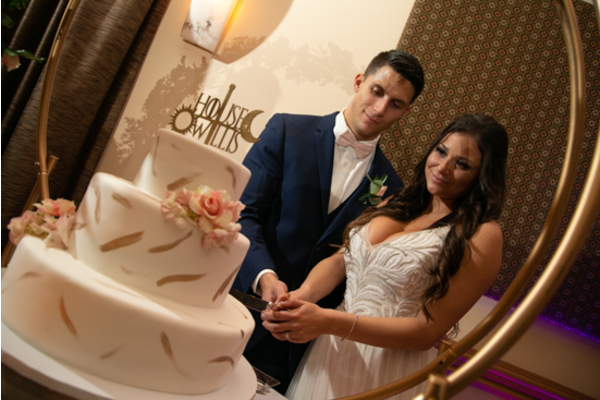 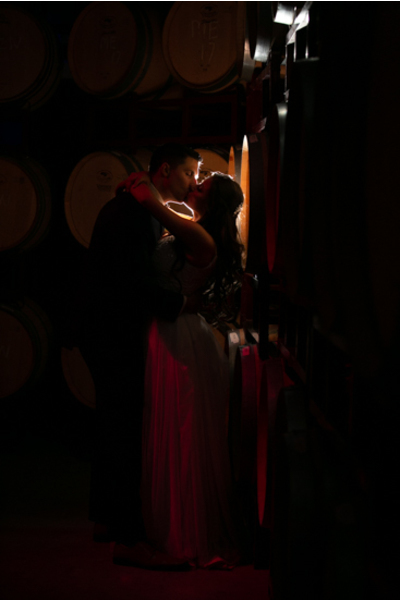 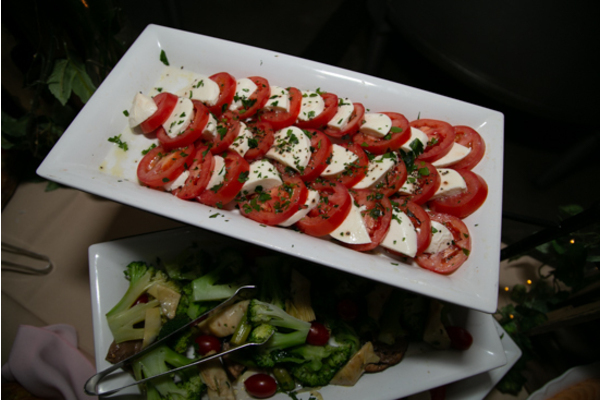 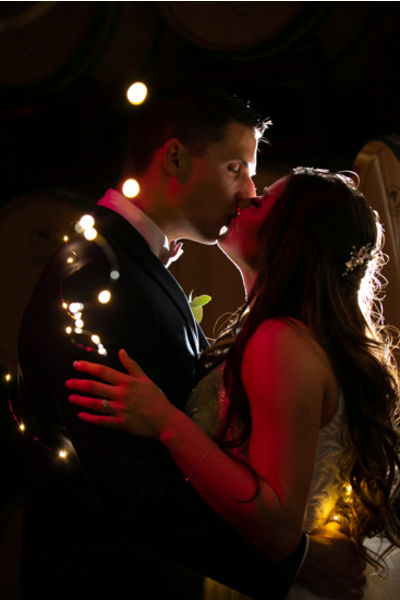 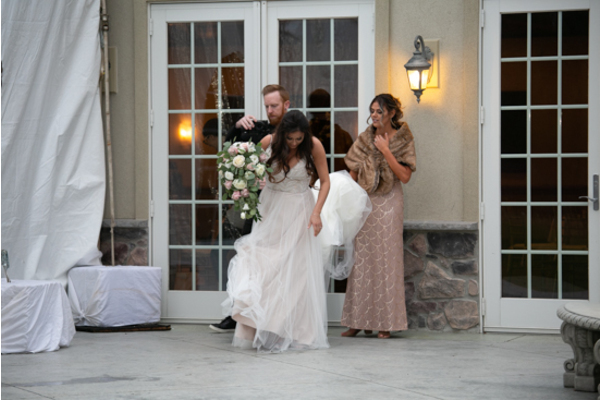 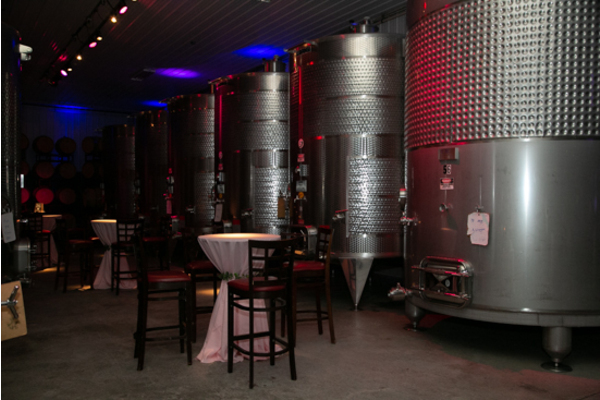 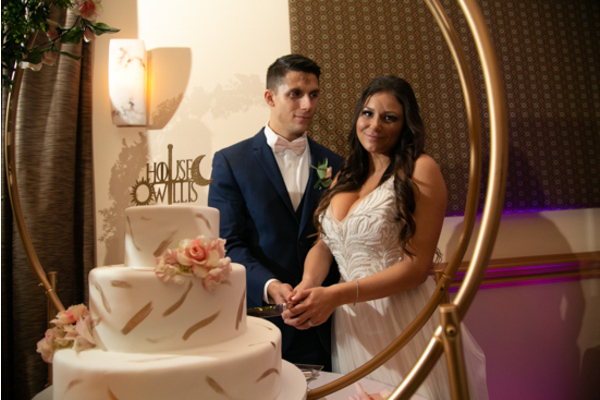 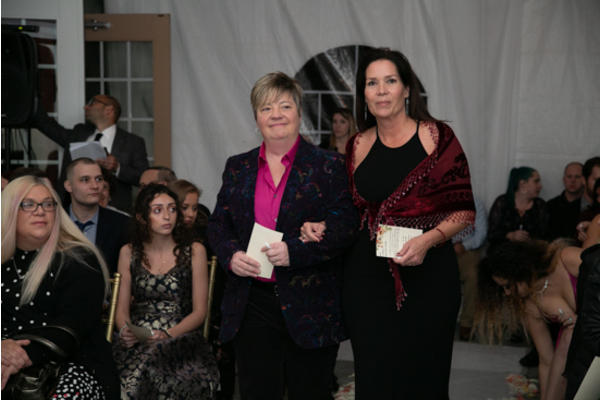 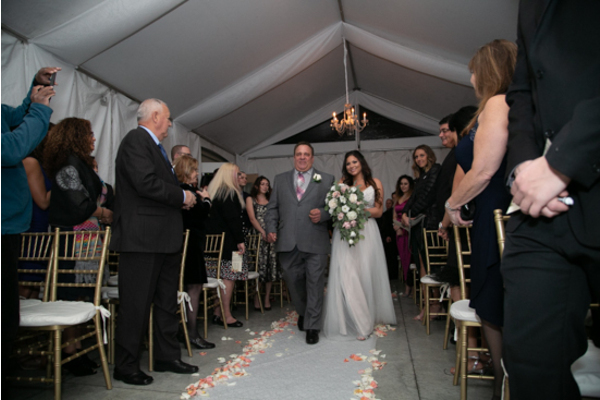 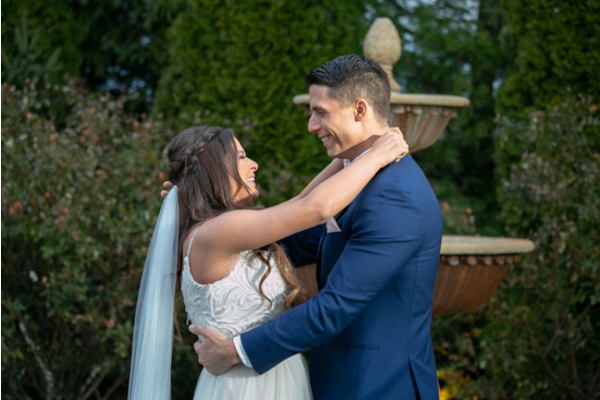 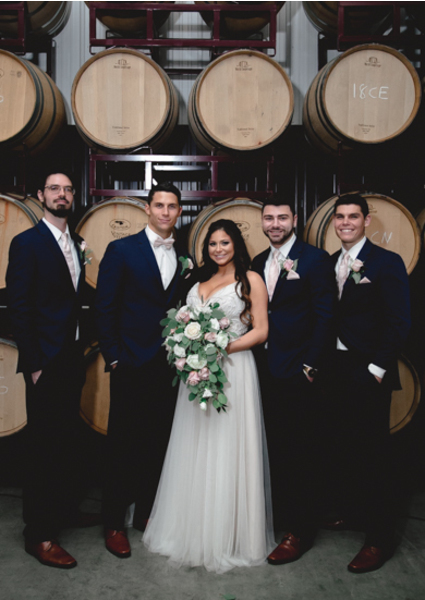 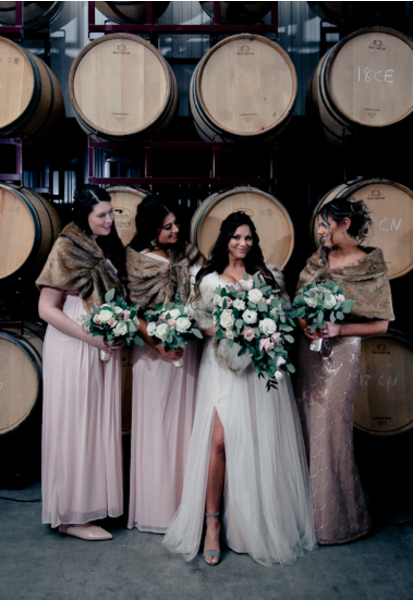 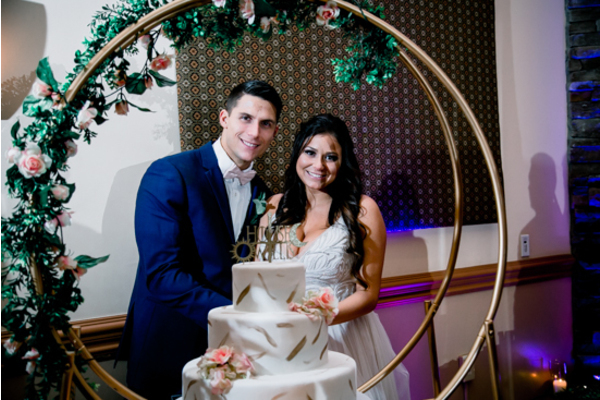 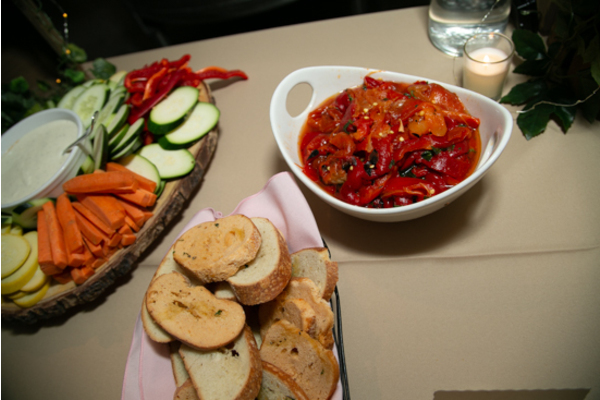 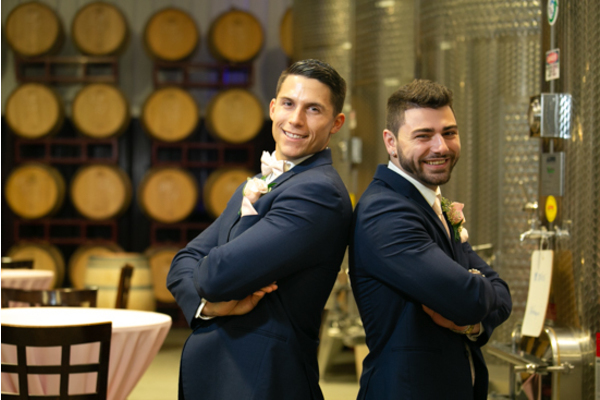 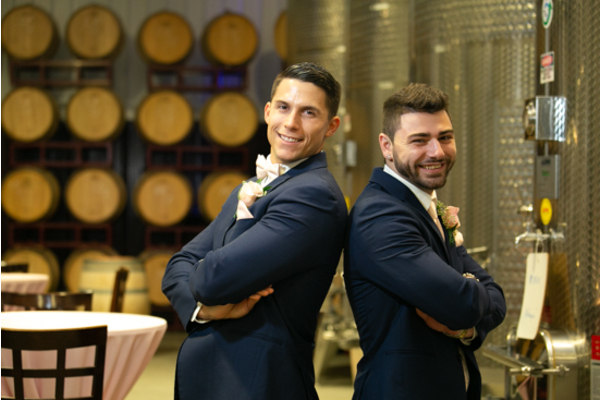 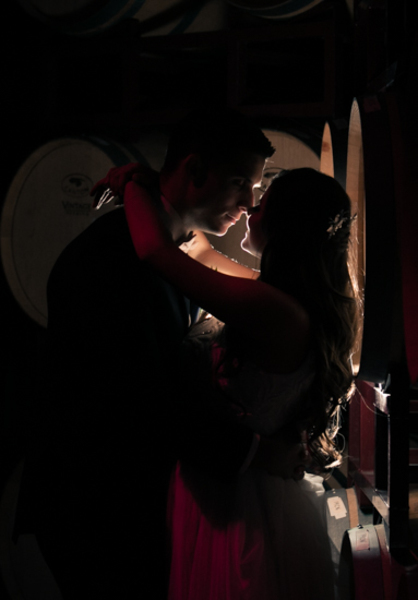 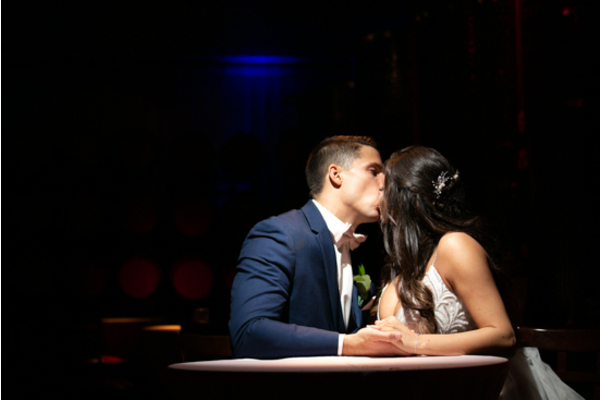 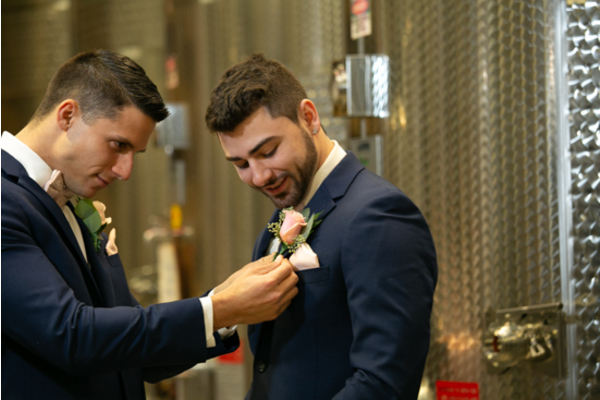 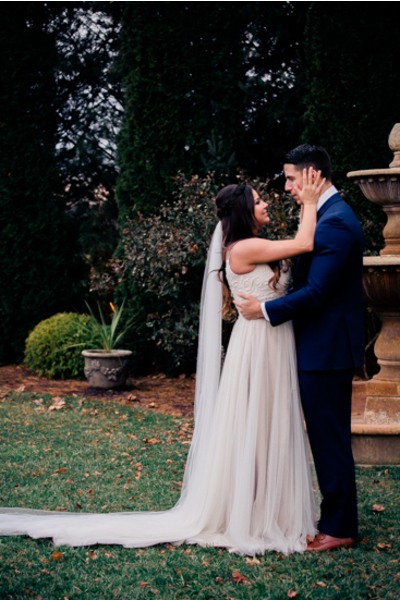 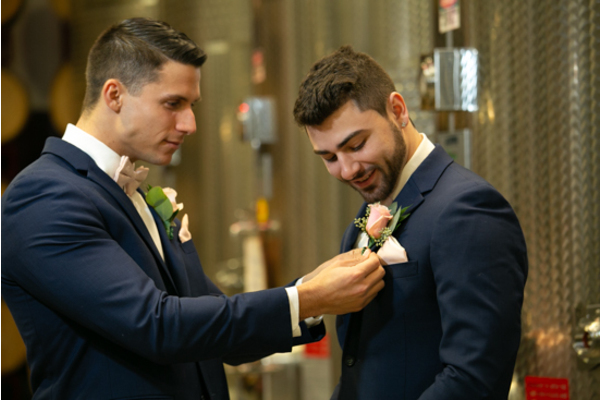 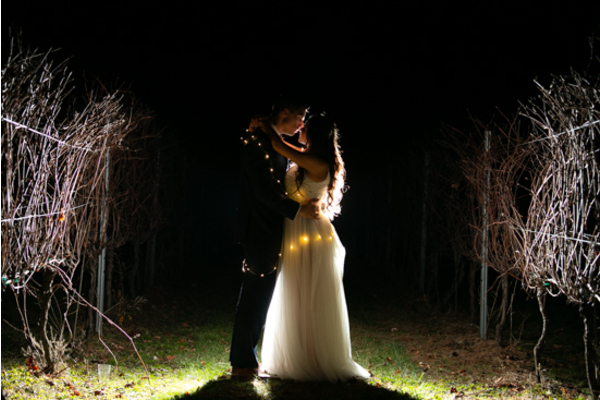 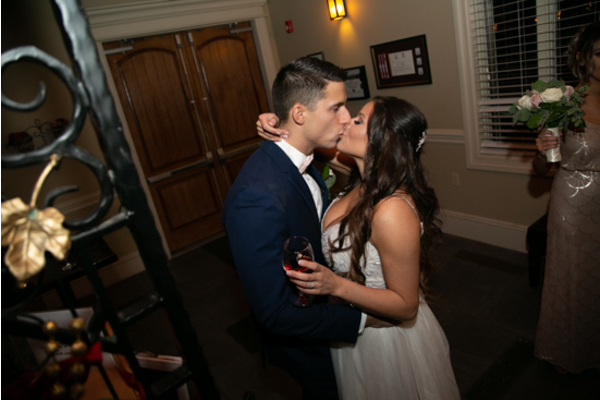 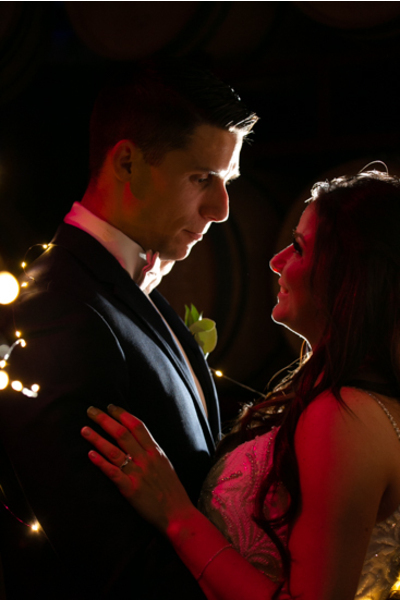 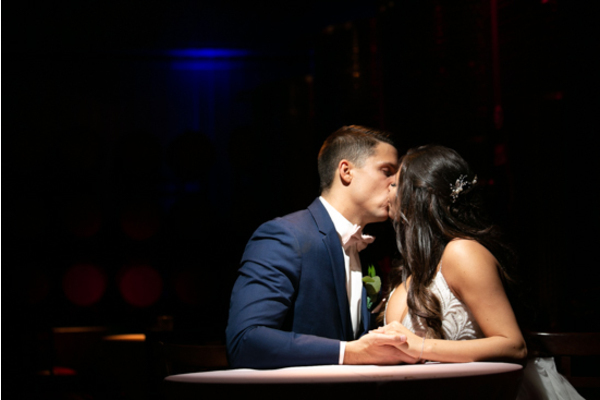 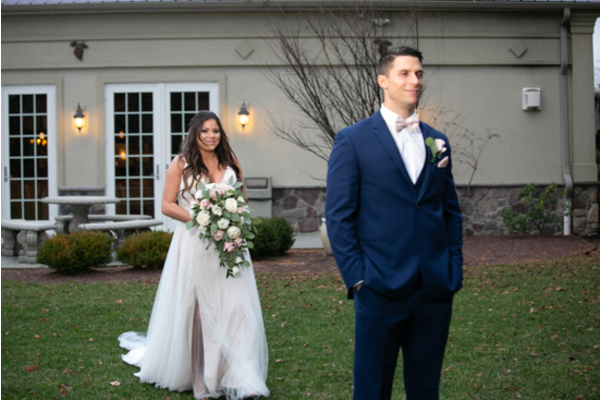 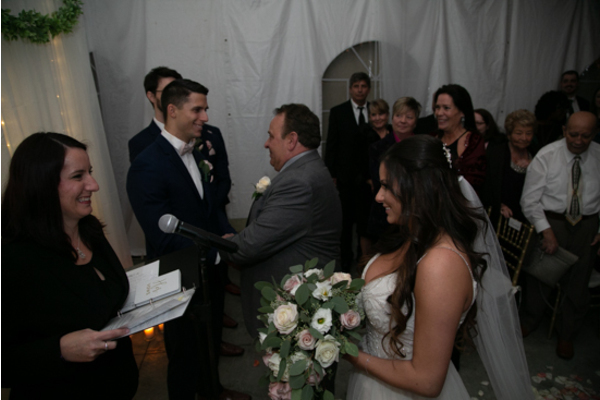 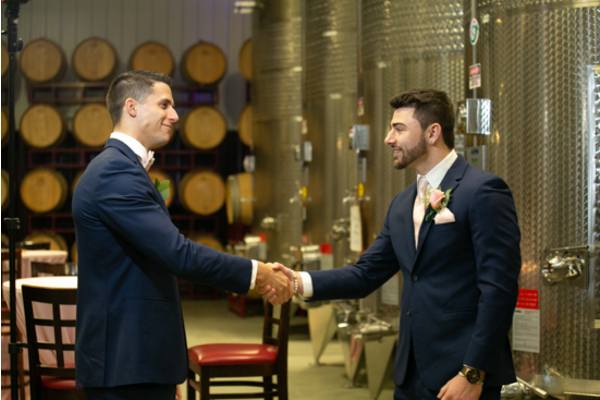 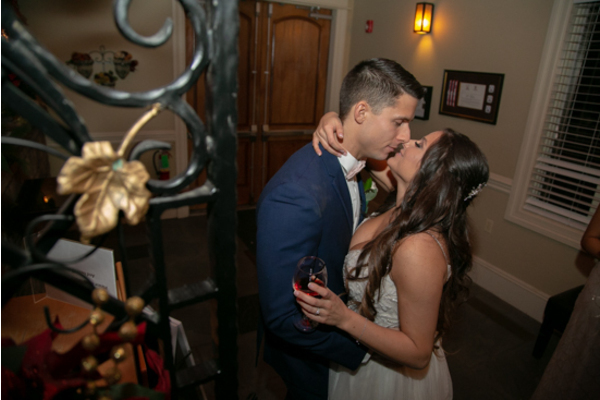 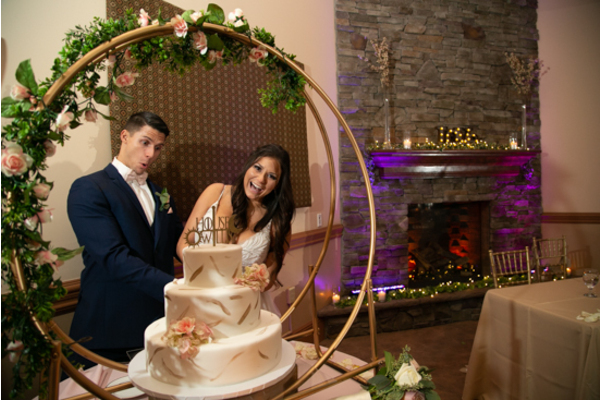 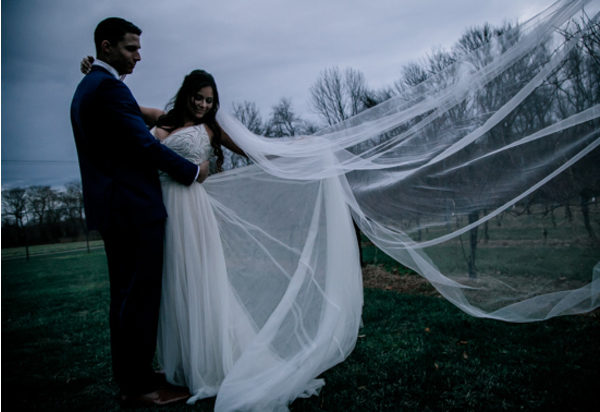 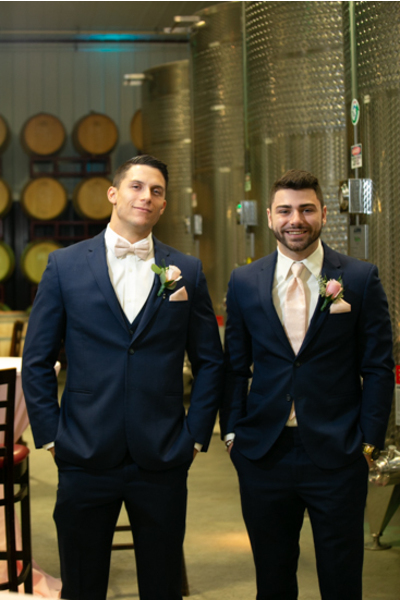 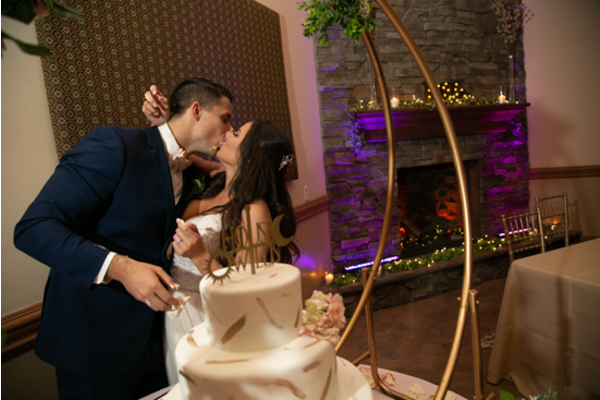 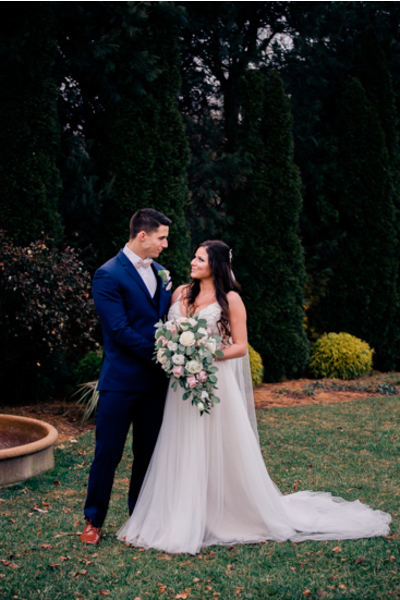 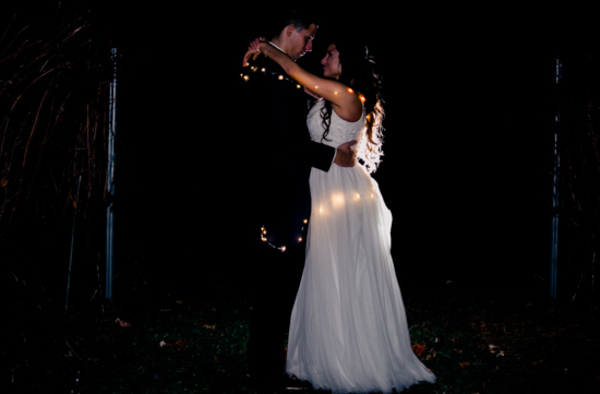 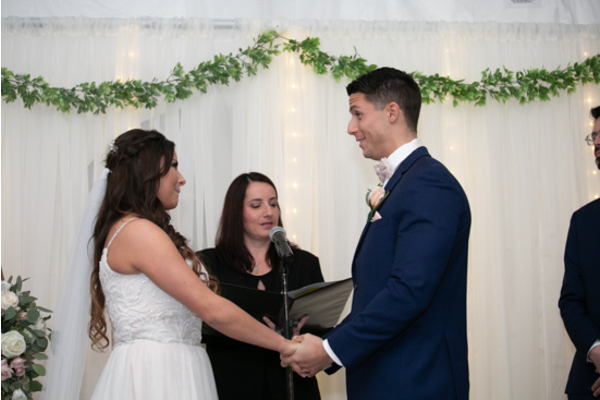 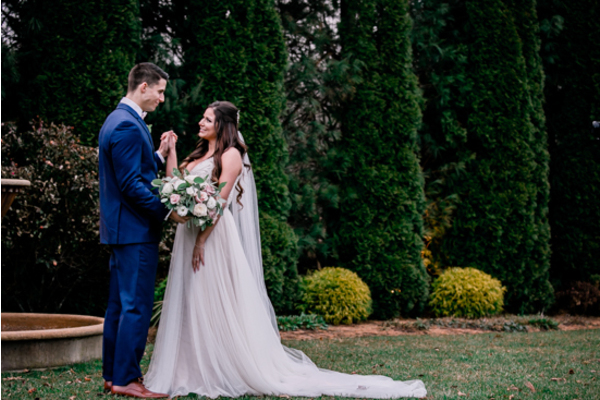 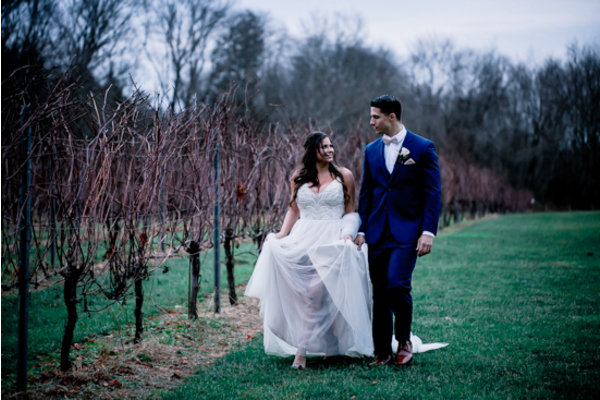 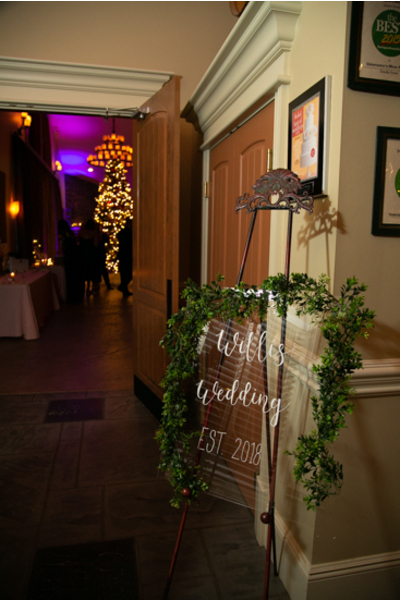 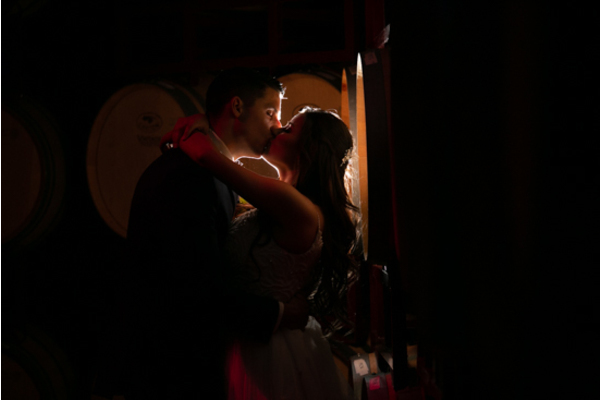 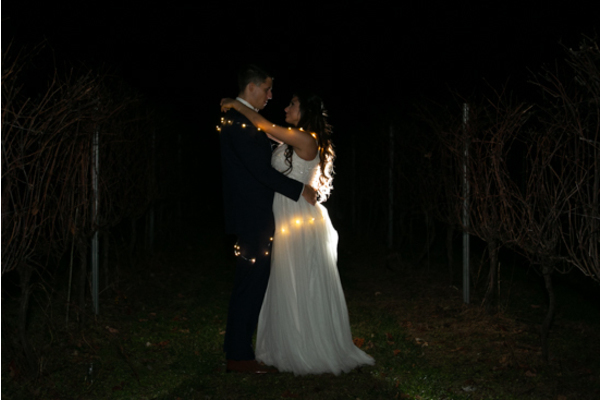 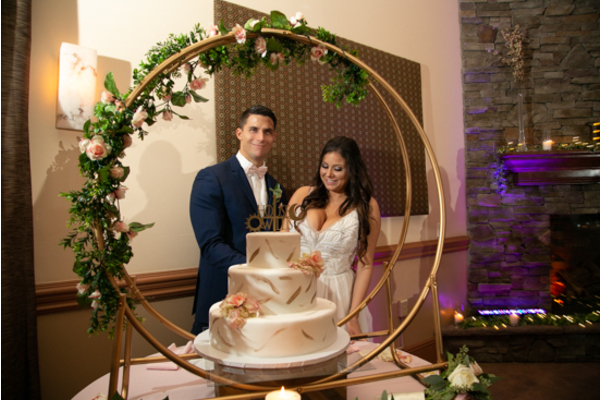 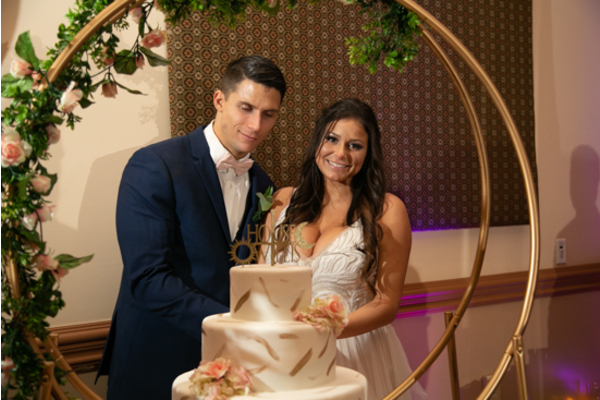 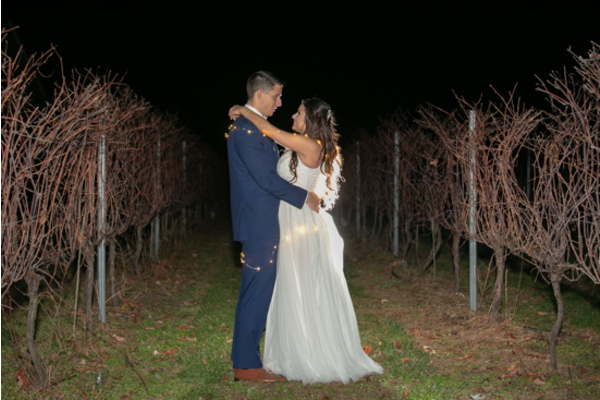 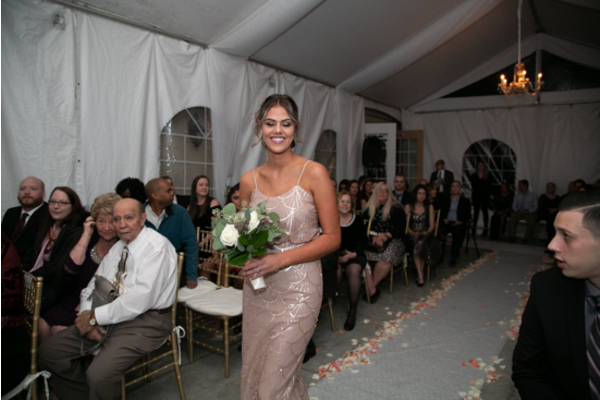 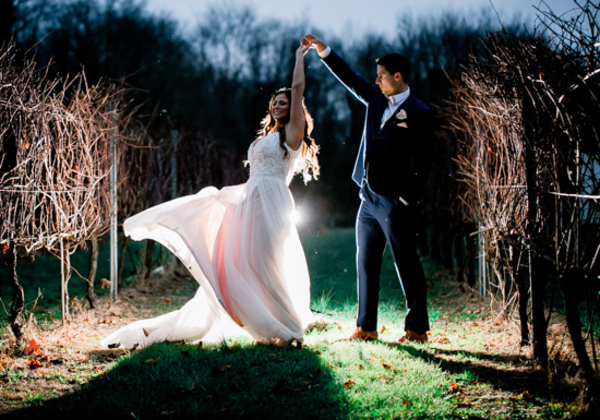 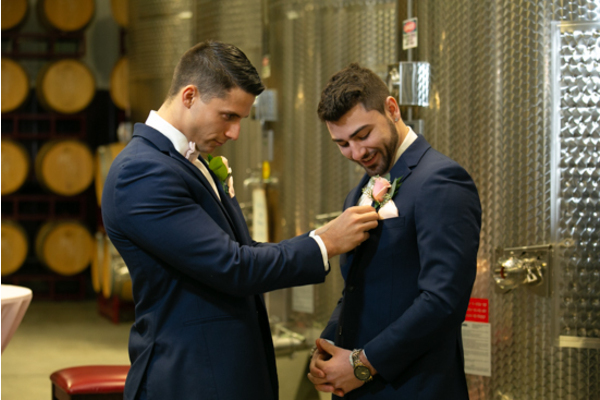 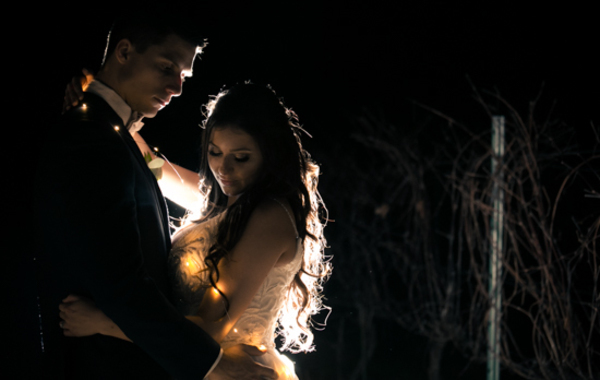 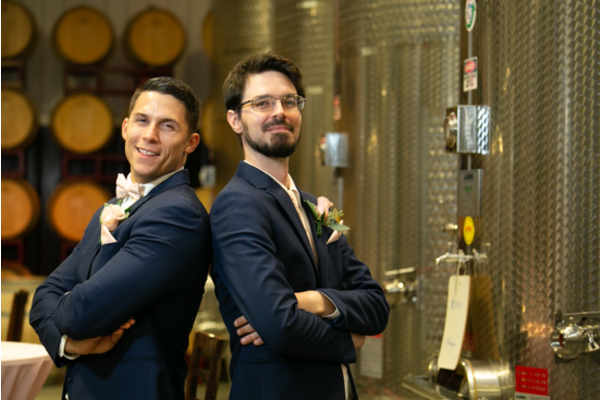 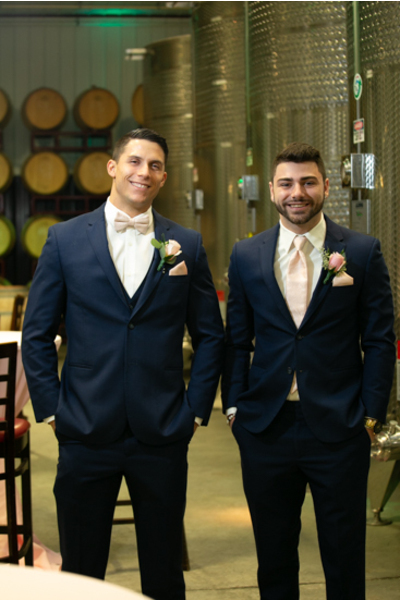 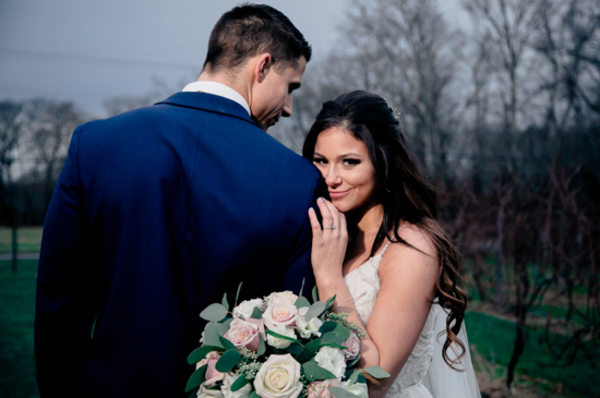 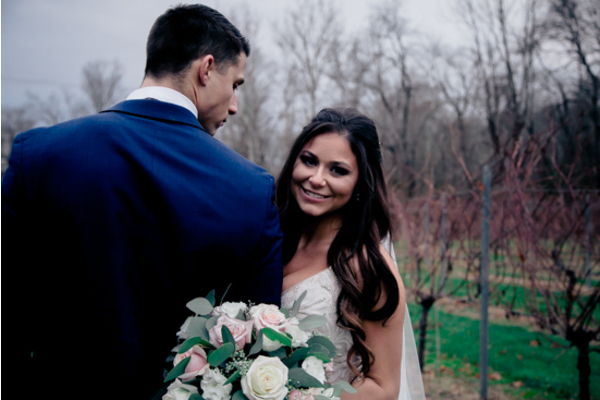 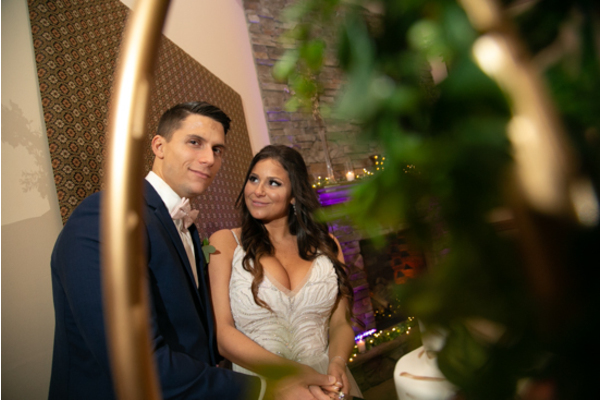 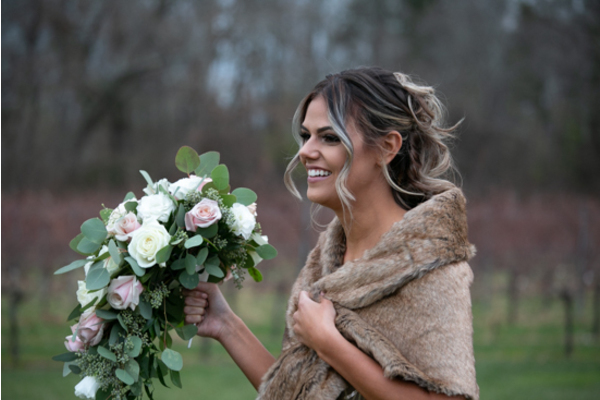 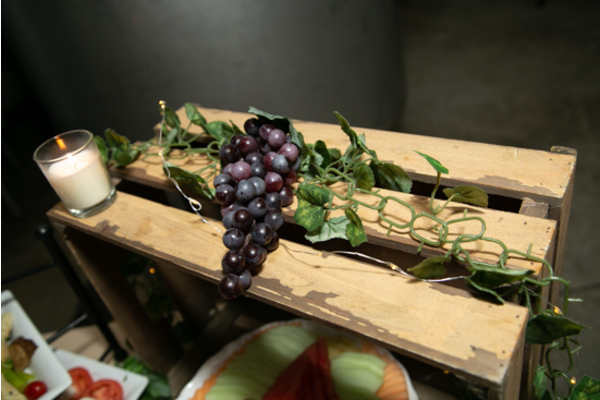 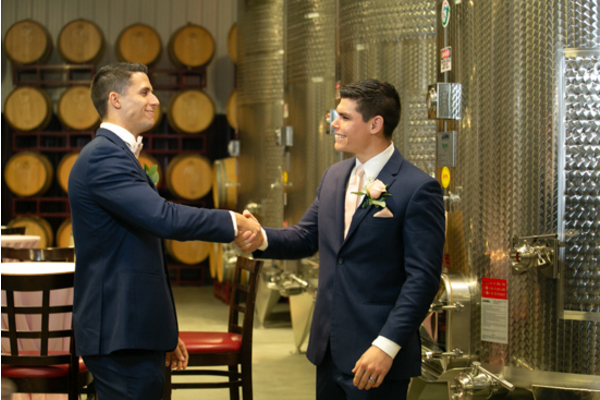 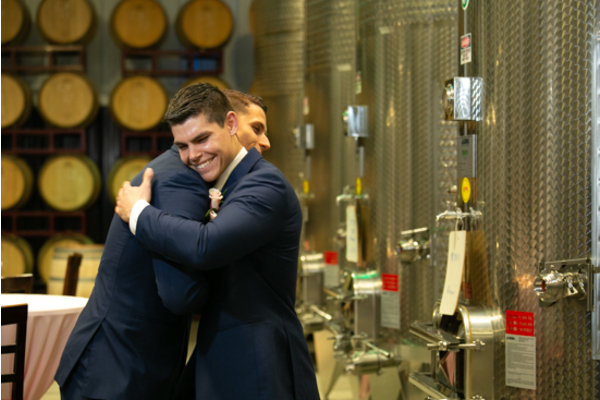 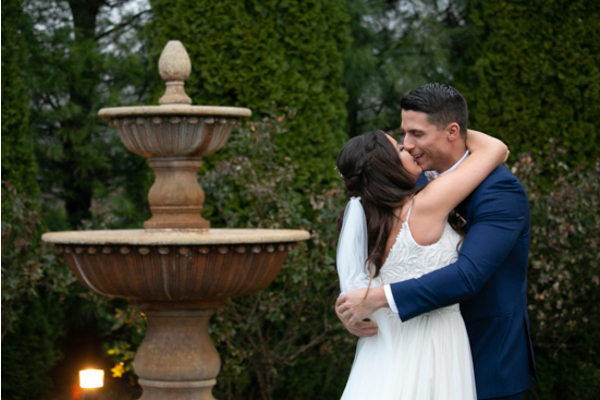 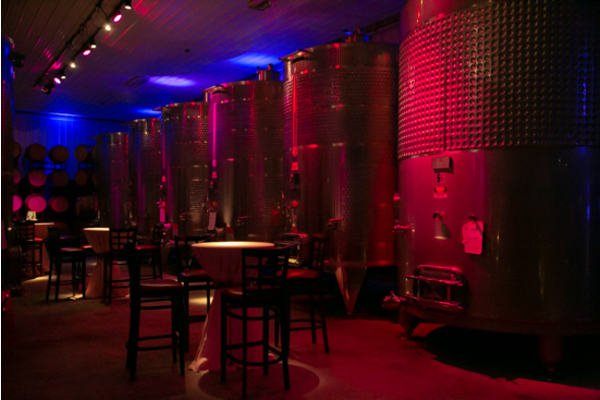 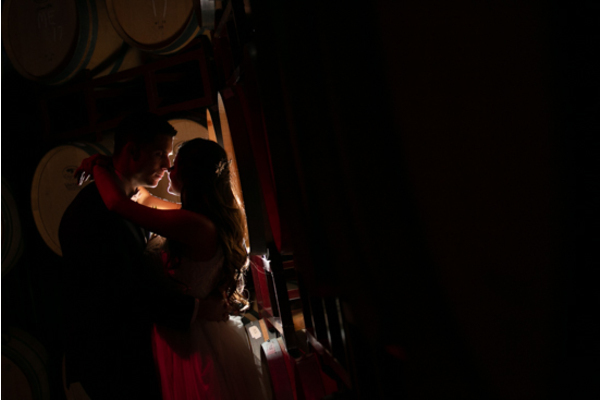 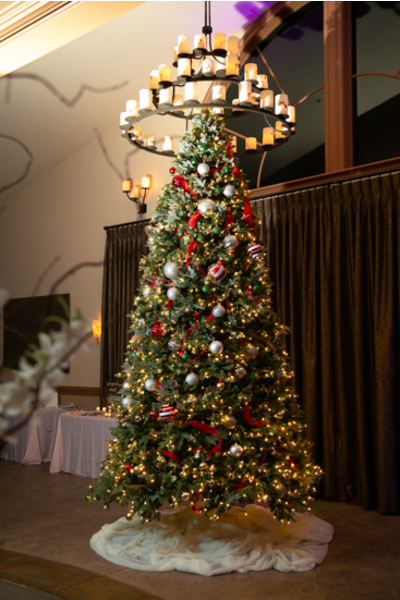 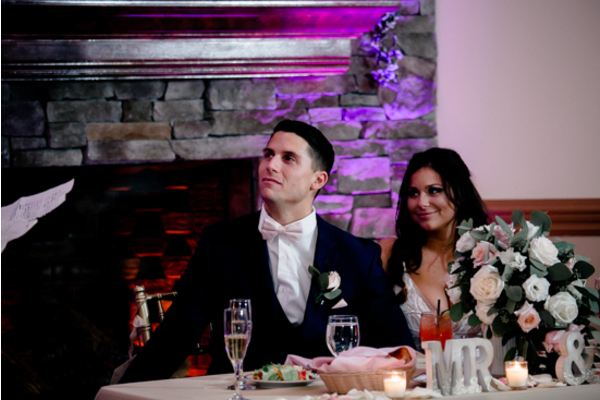 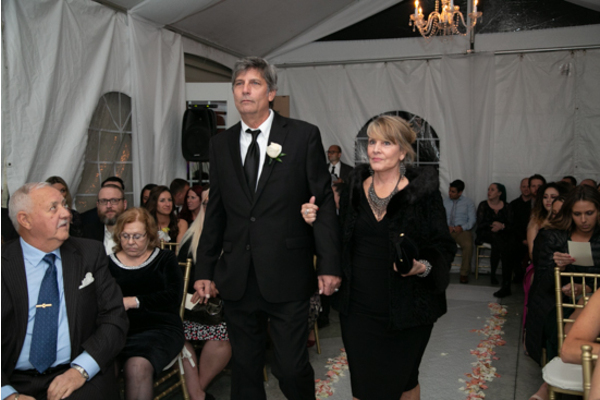 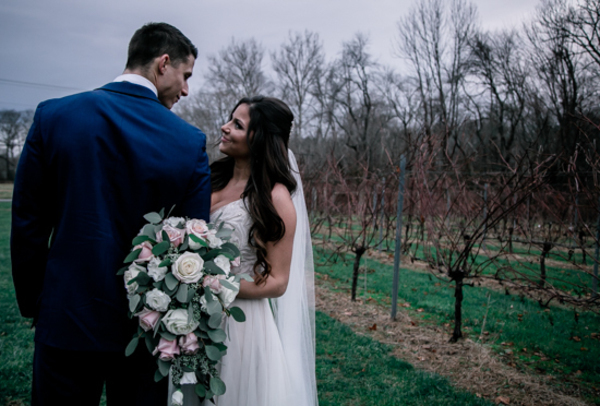 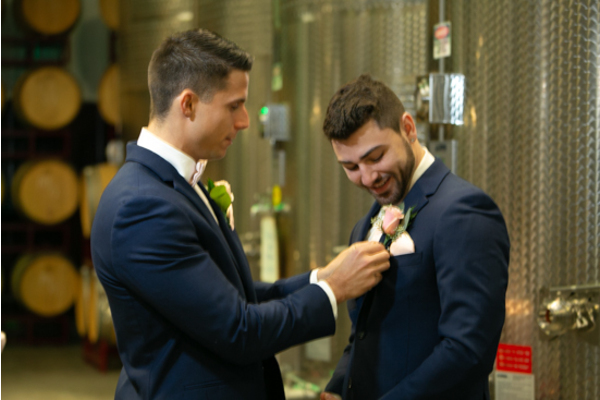 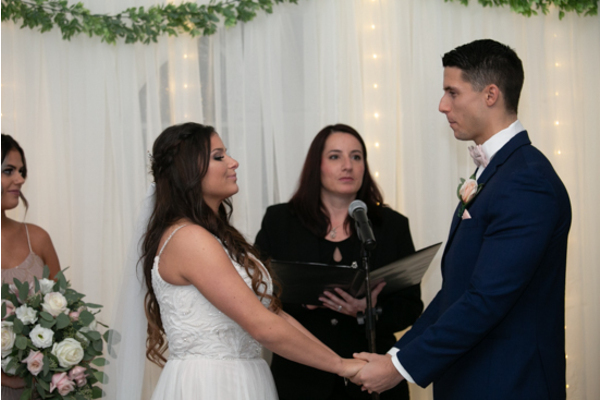 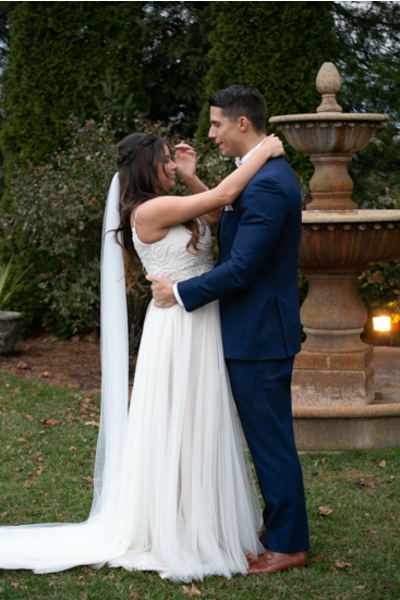 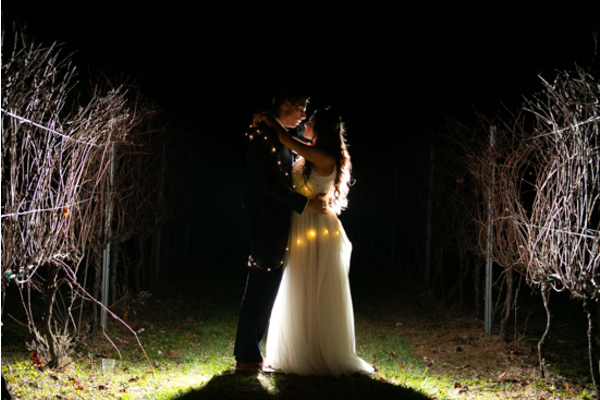 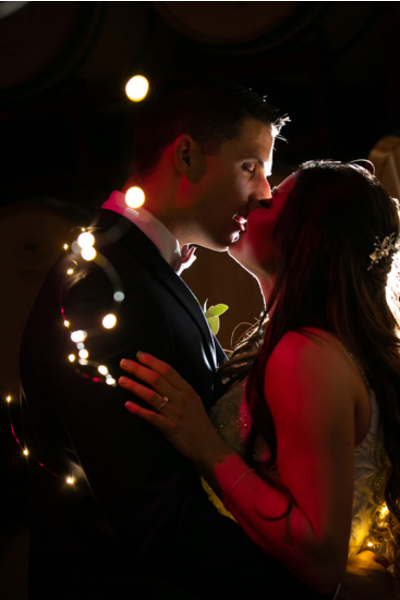 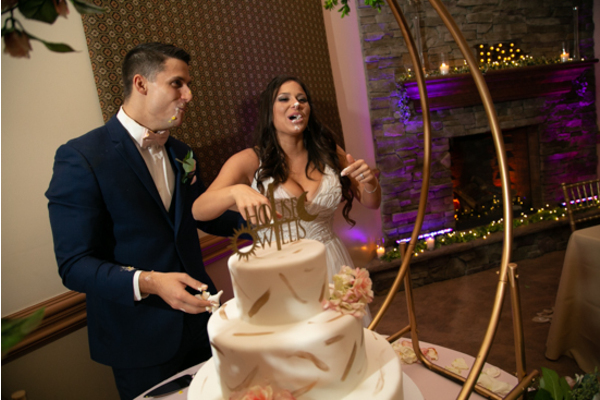 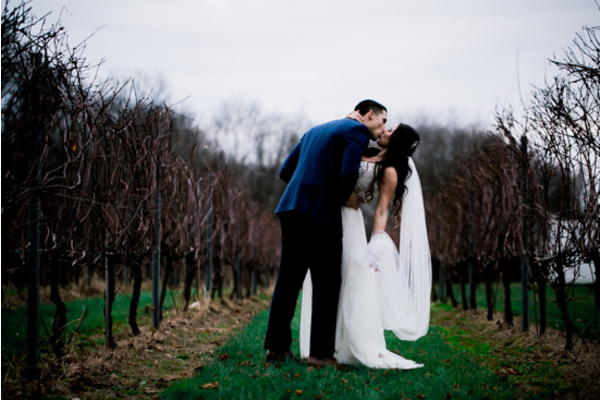 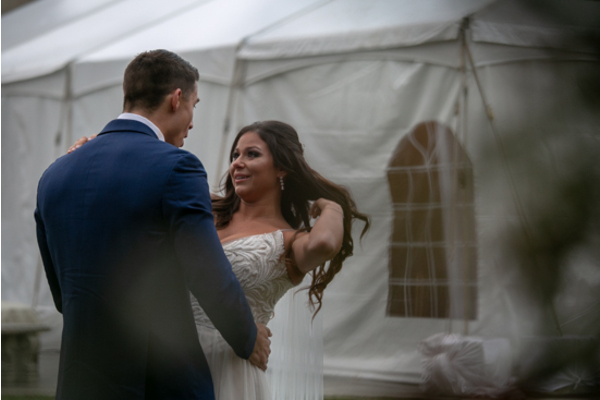 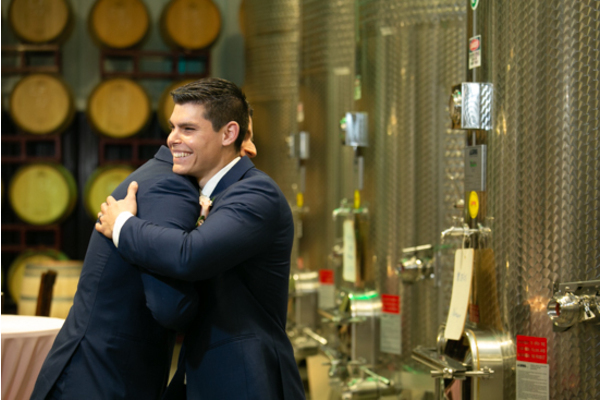 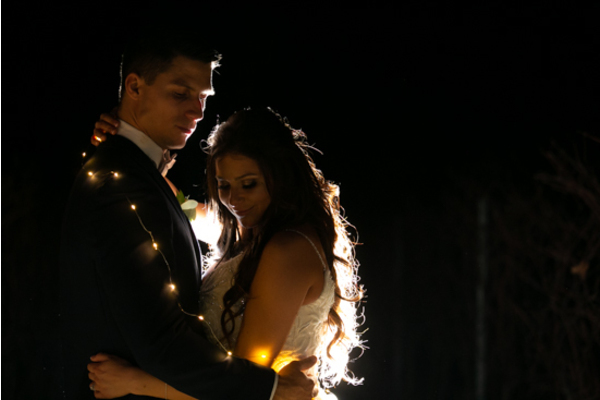 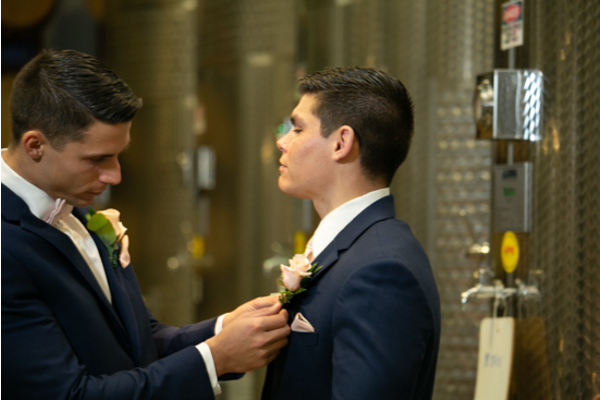 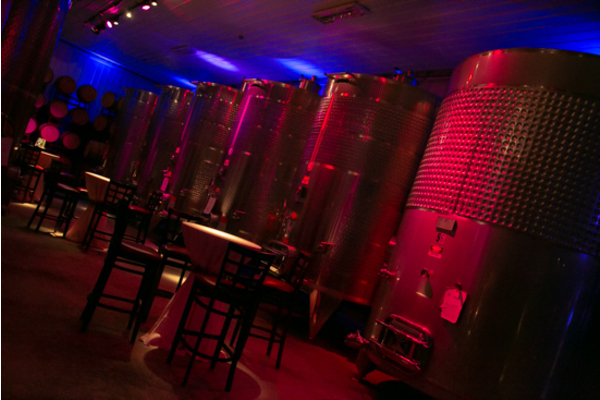 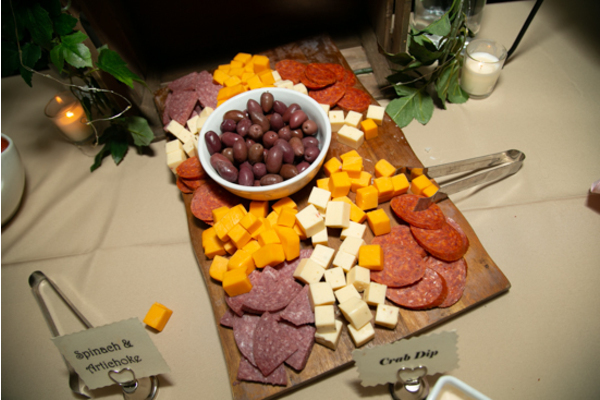 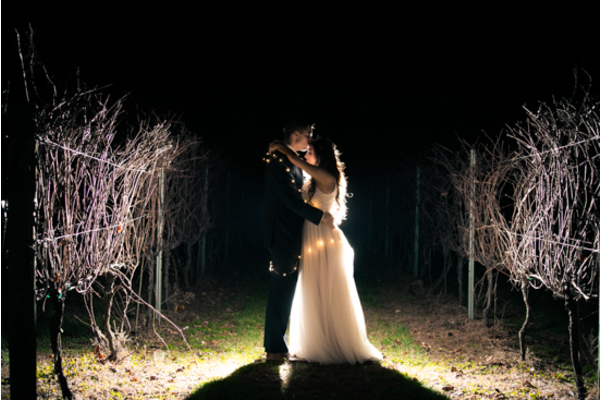 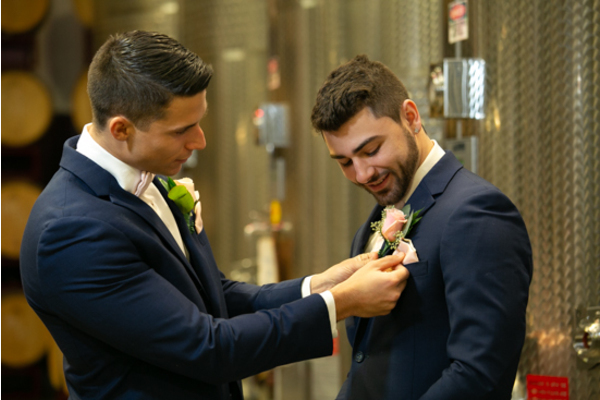 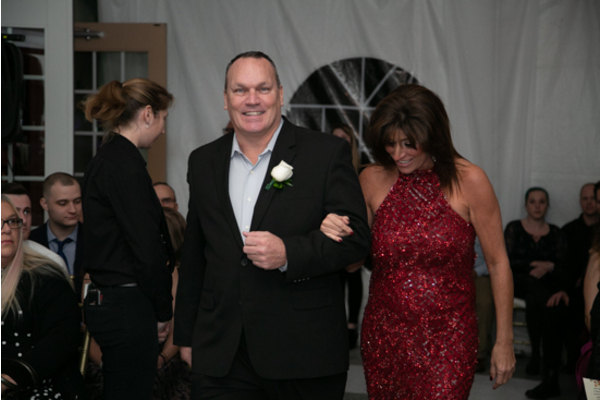 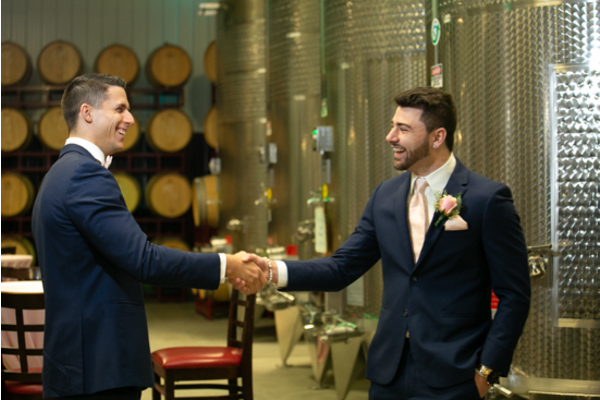 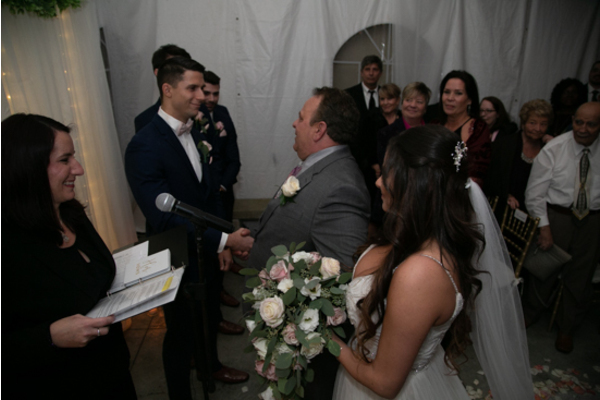 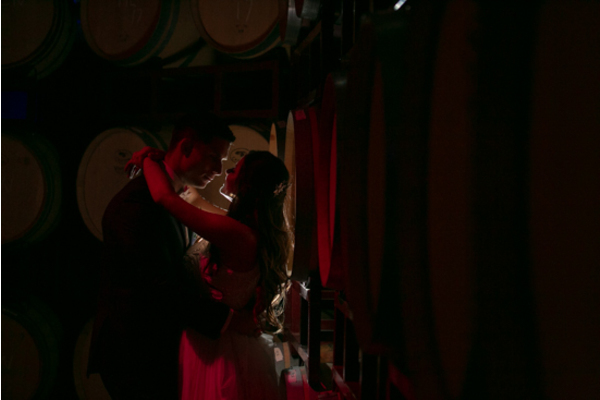 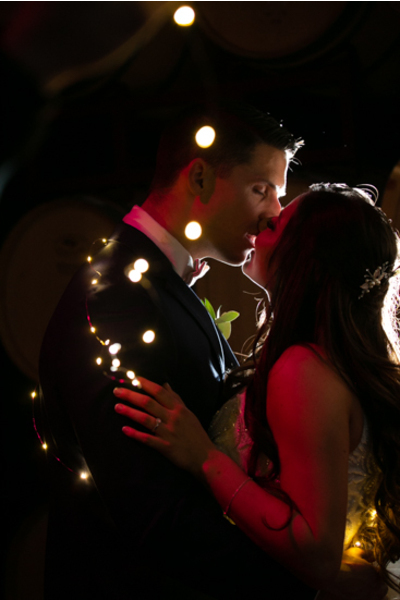 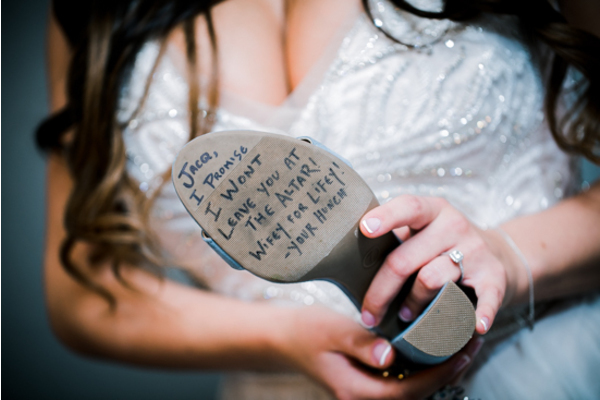 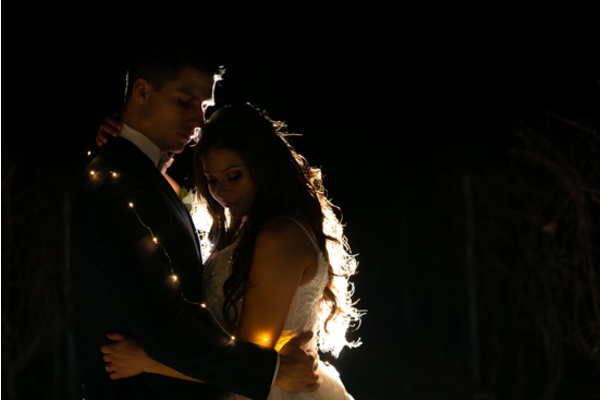 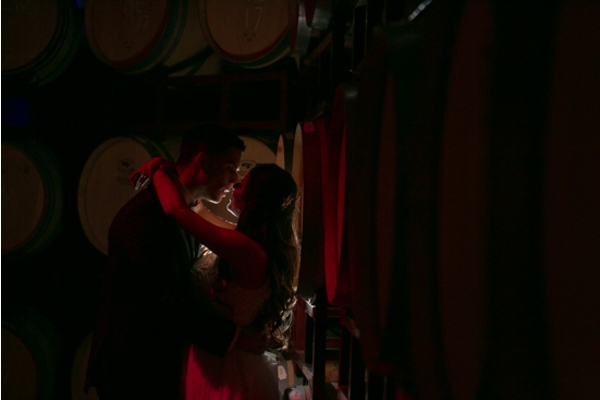 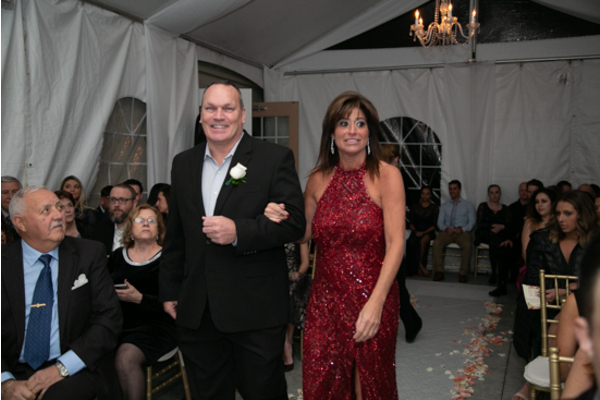 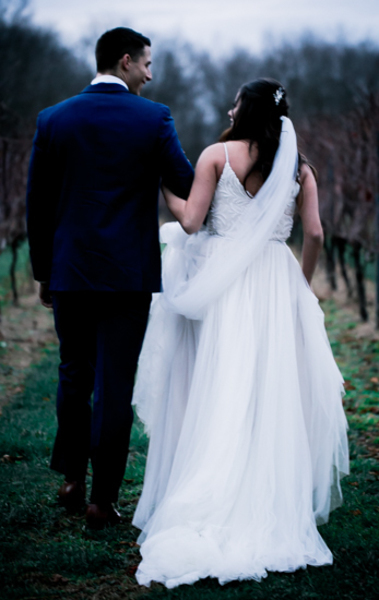 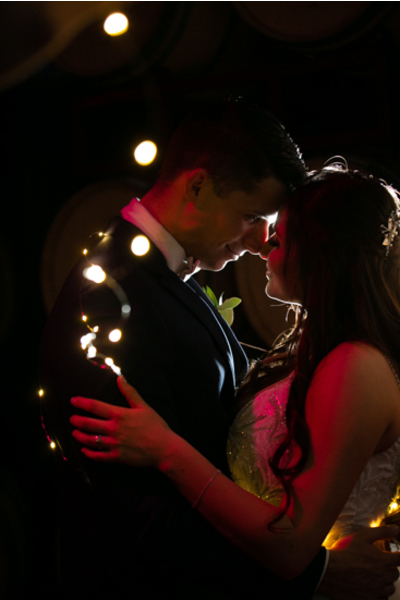 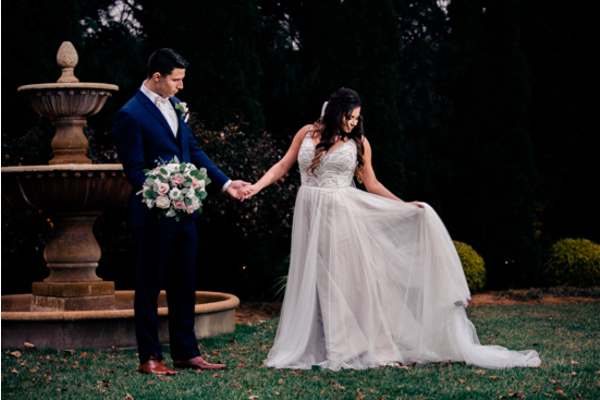 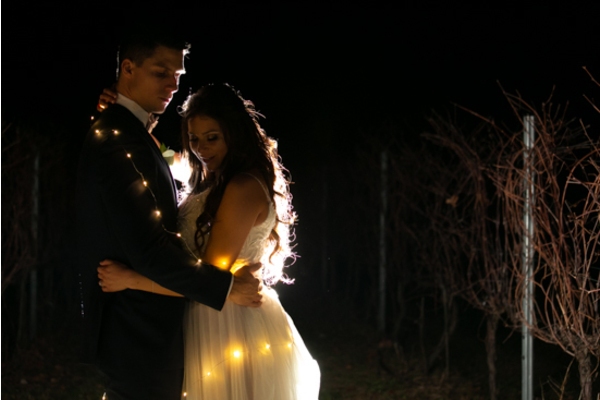 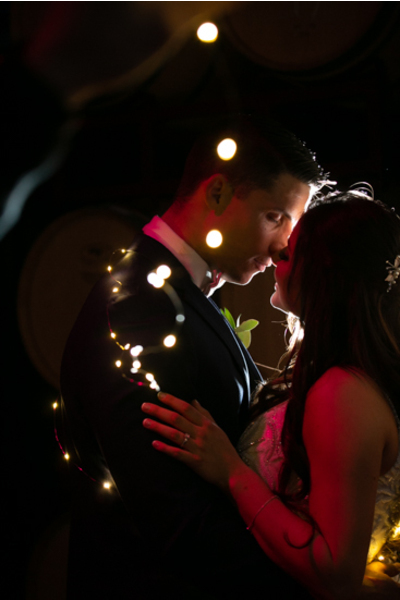 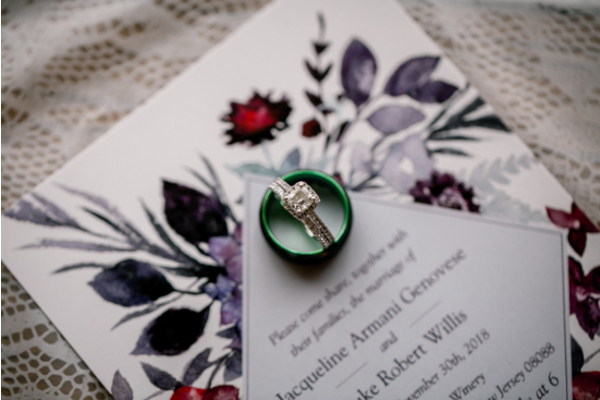 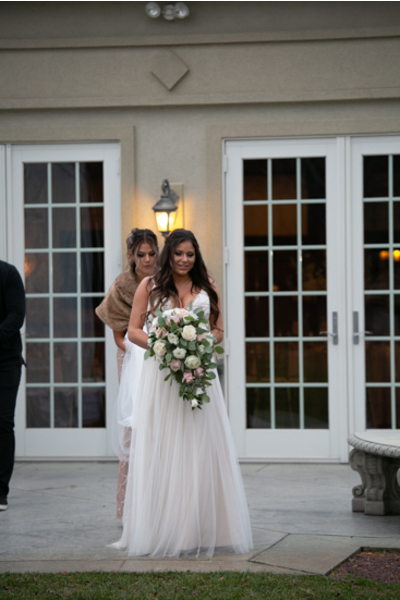 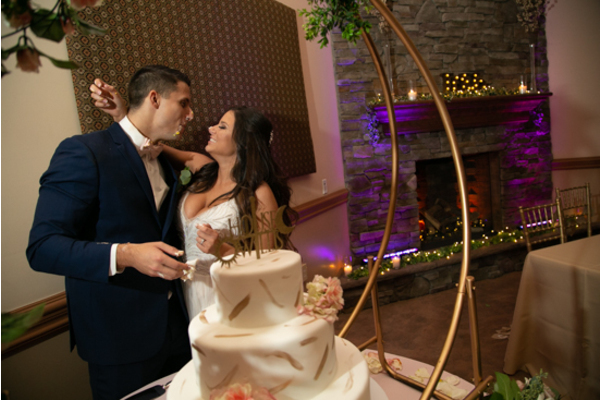 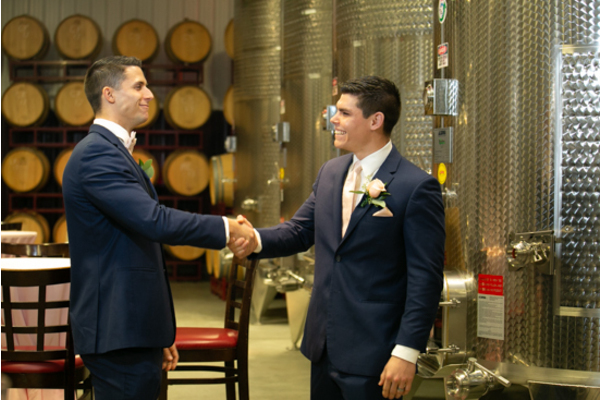 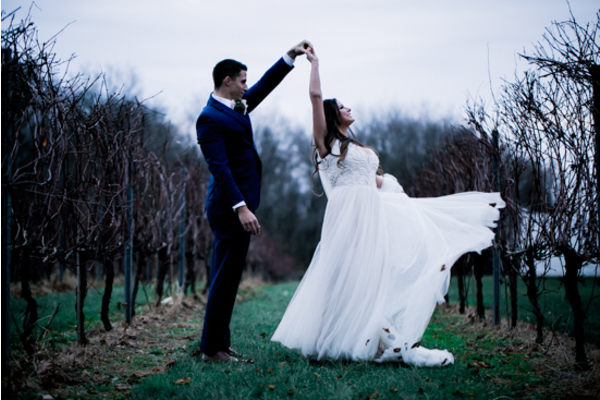 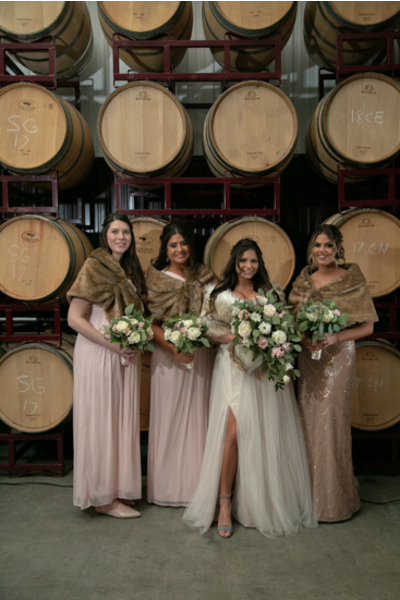 They had a spectacular fall wedding at Valenzano Winery in Shamong, New Jersey. 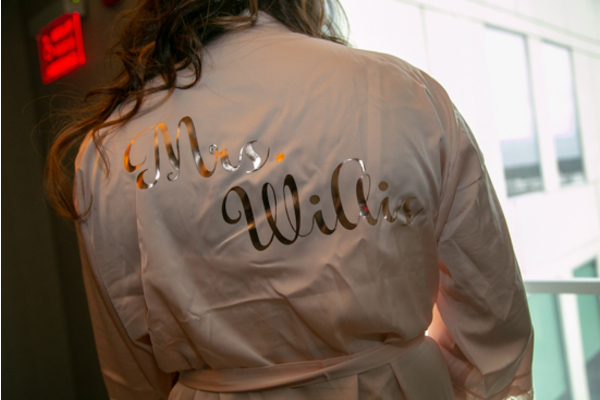 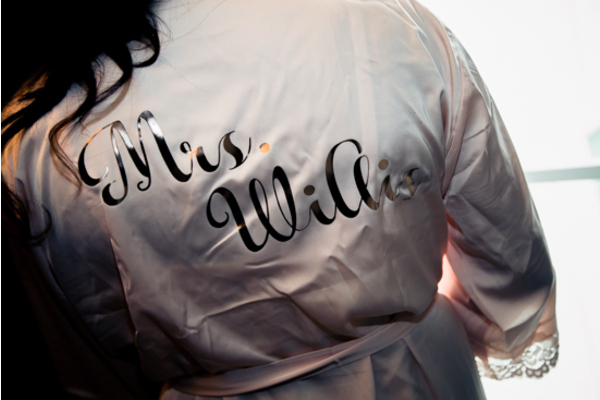 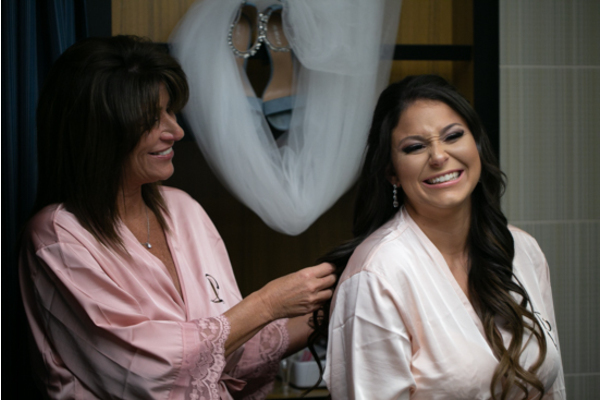 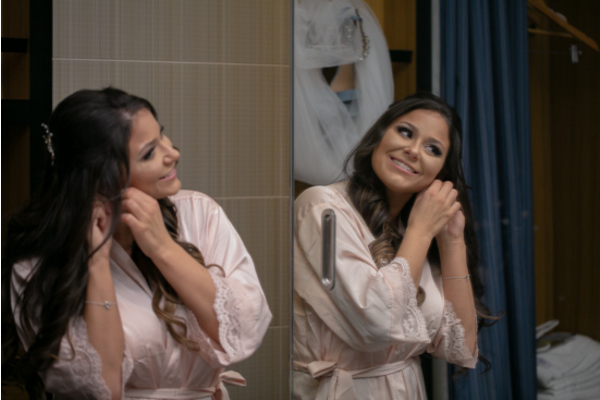 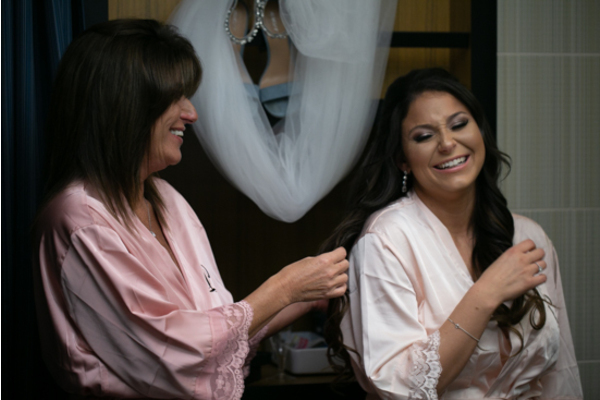 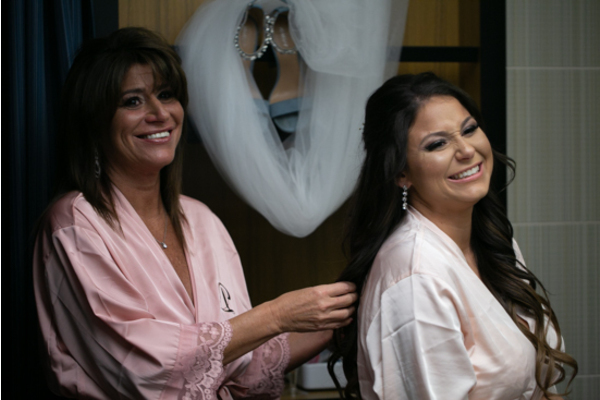 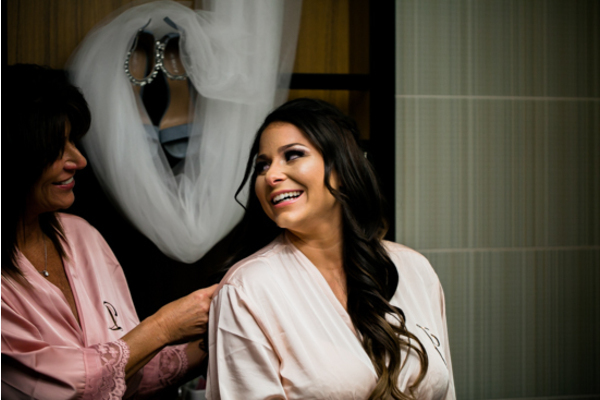 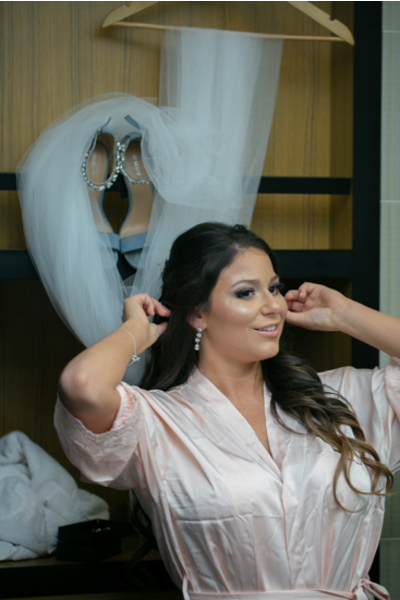 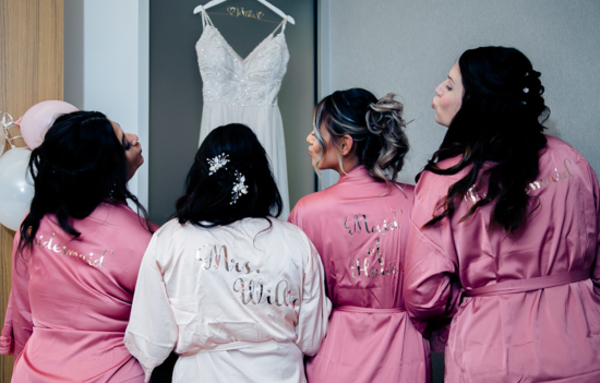 Jackie began her day surrounded by her beautiful bridesmaids dressed in pink silk robes. 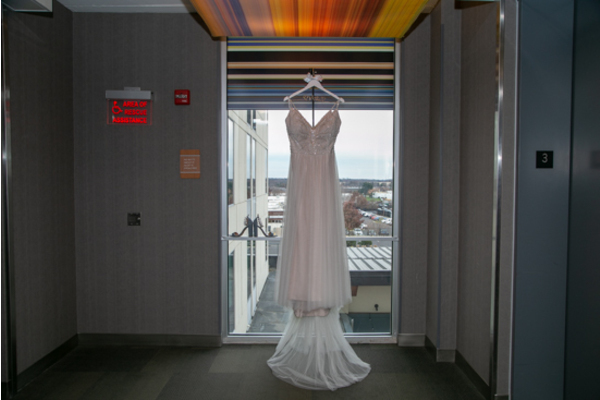 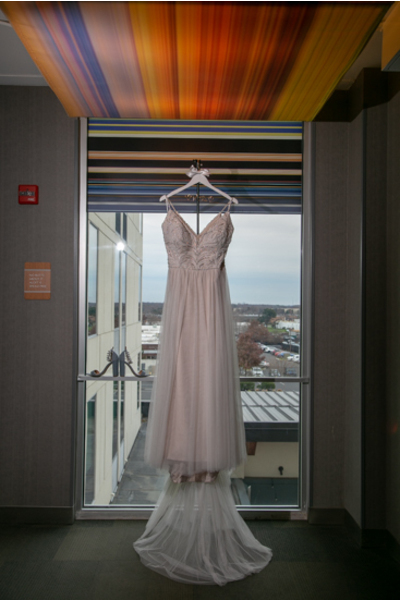 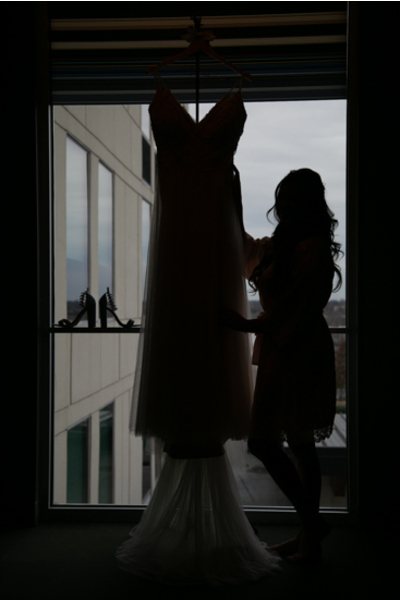 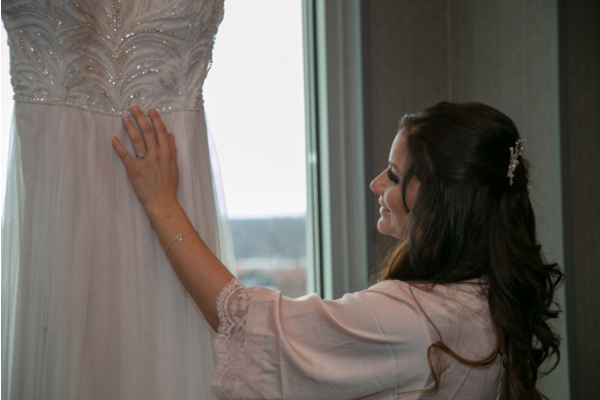 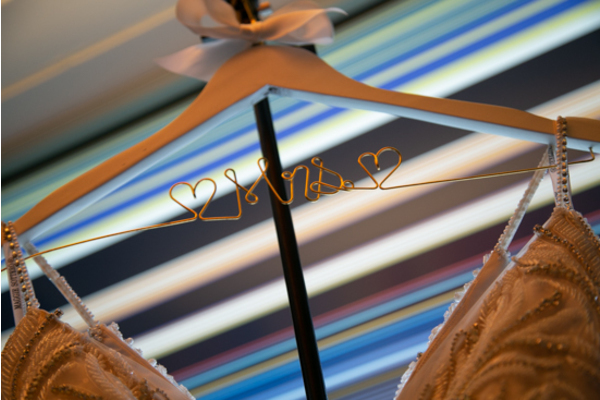 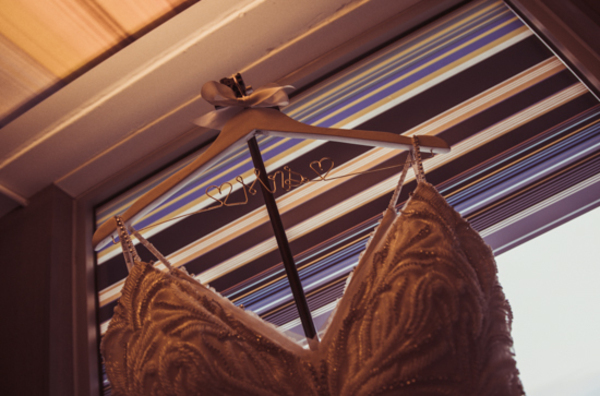 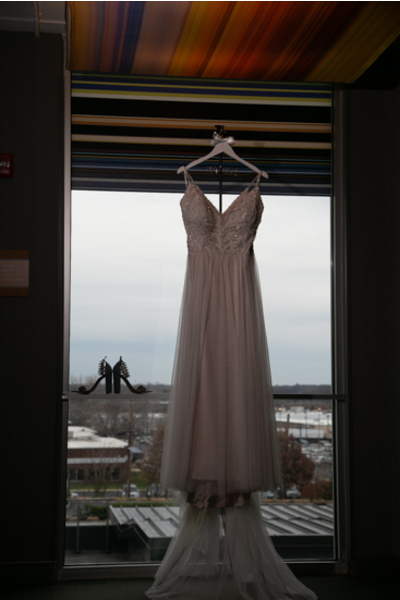 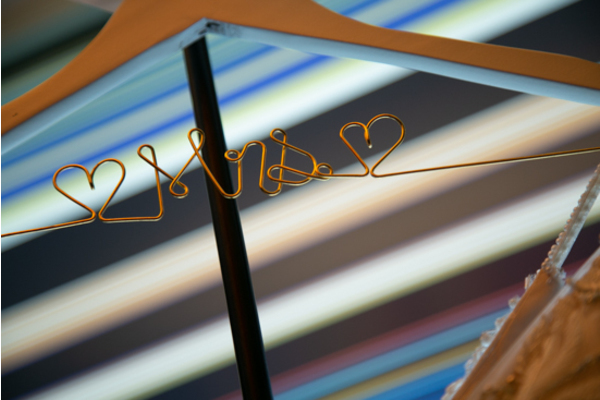 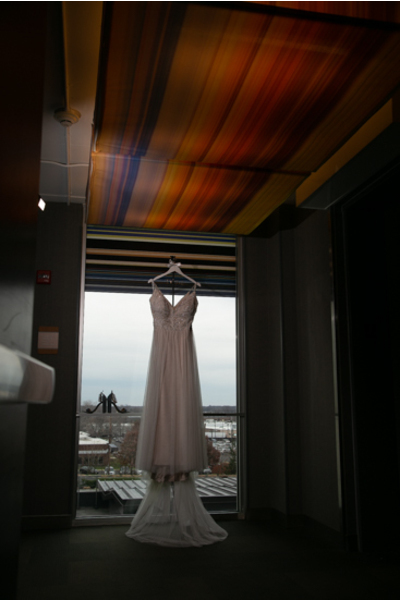 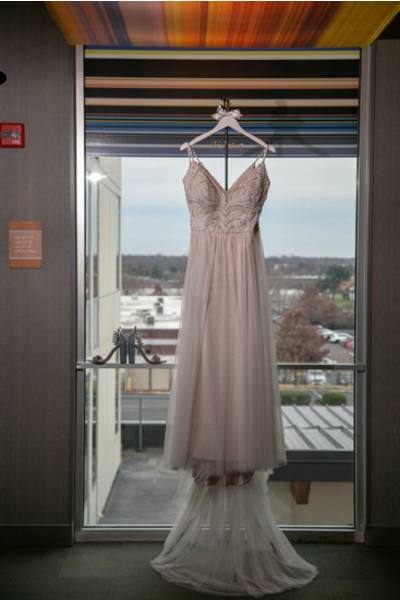 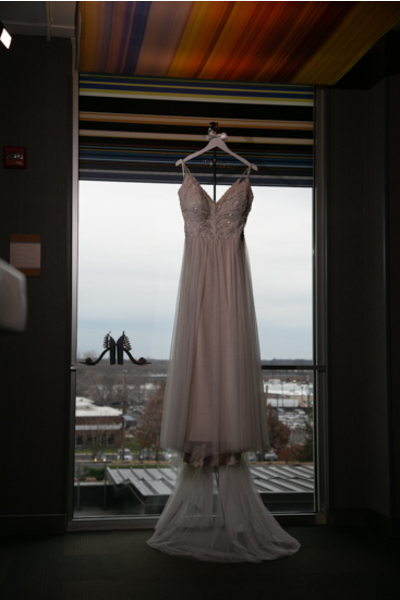 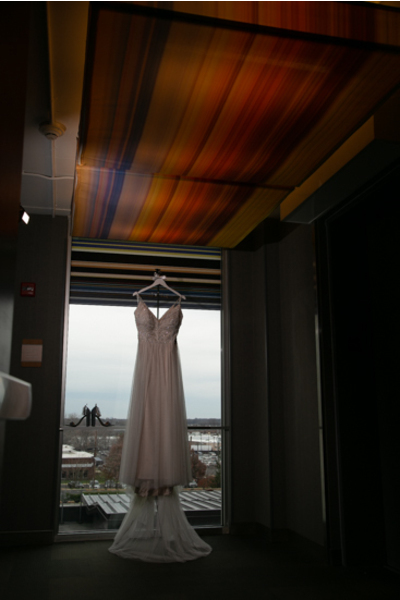 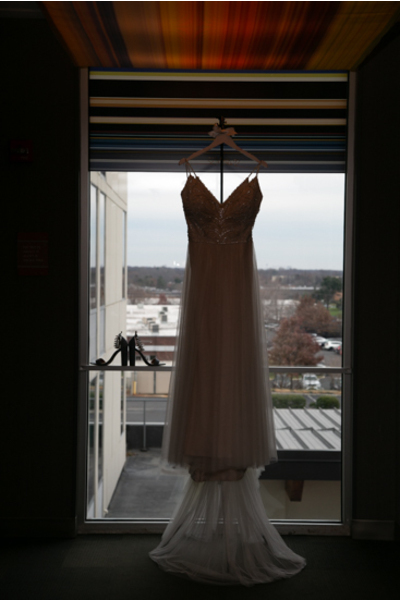 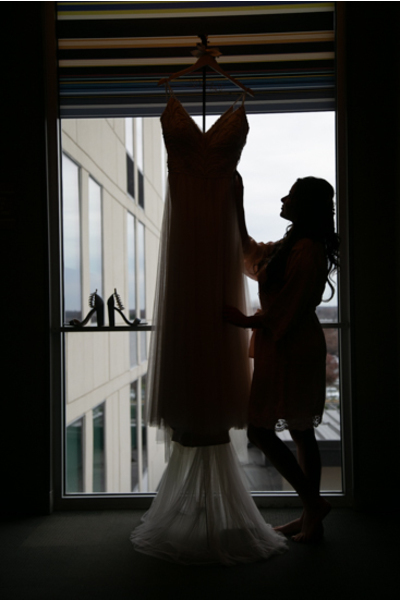 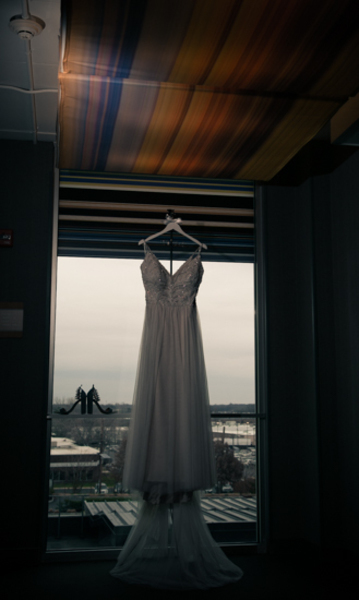 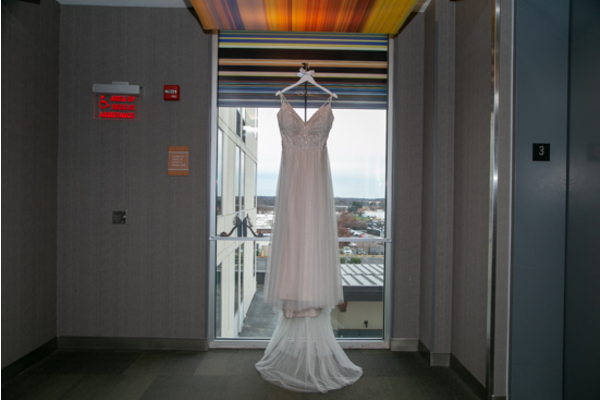 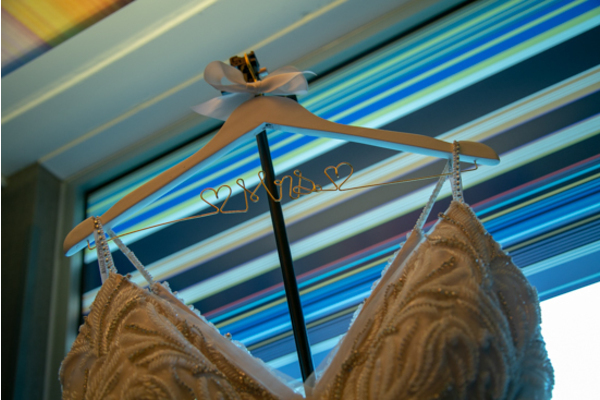 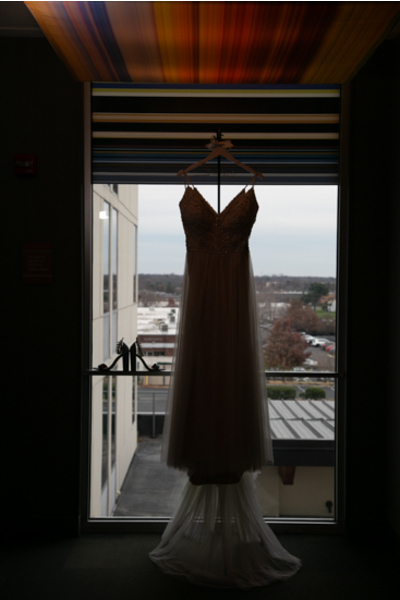 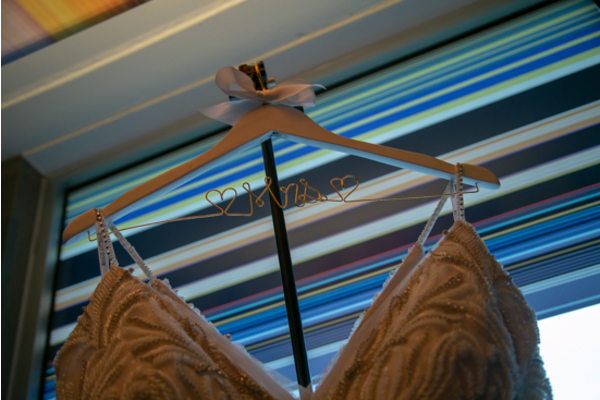 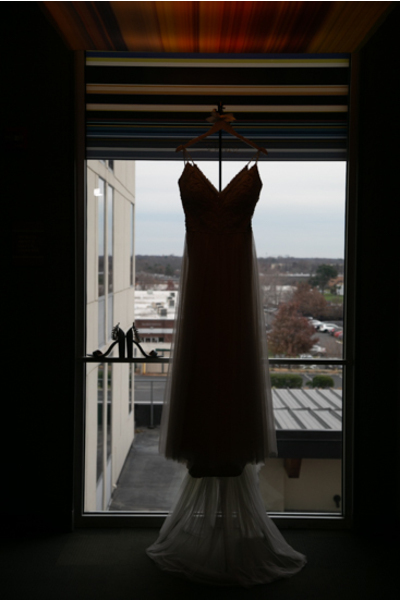 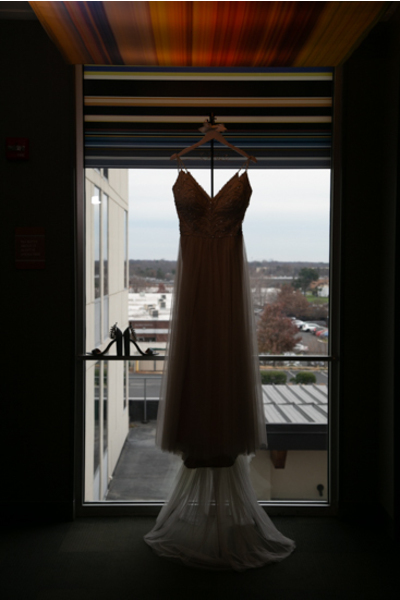 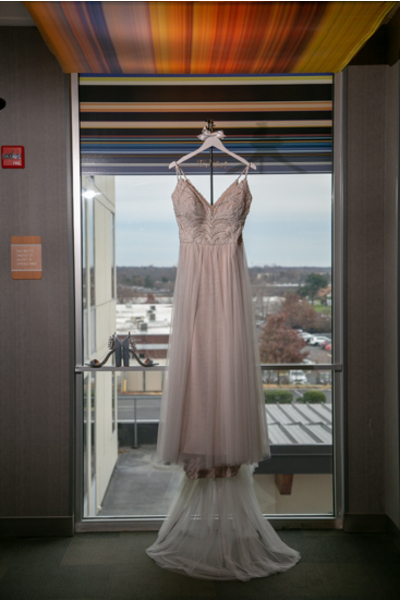 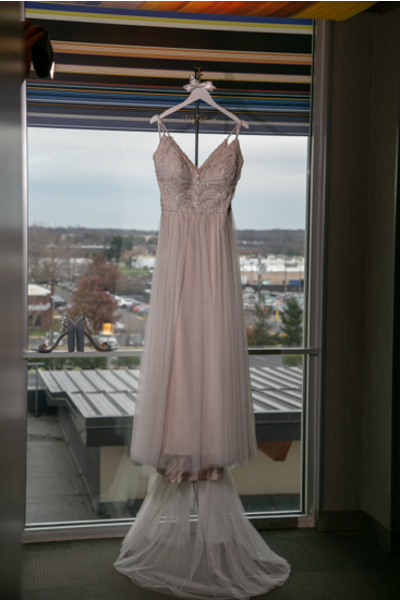 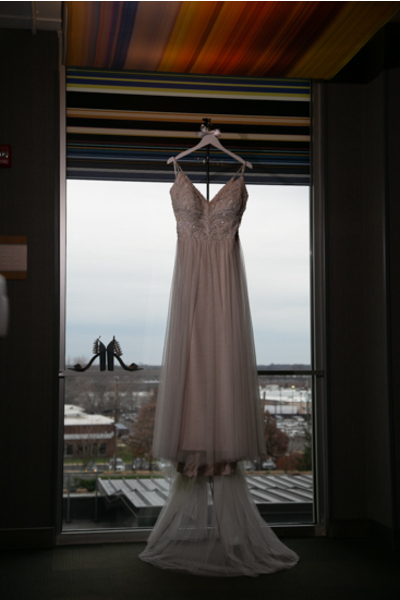 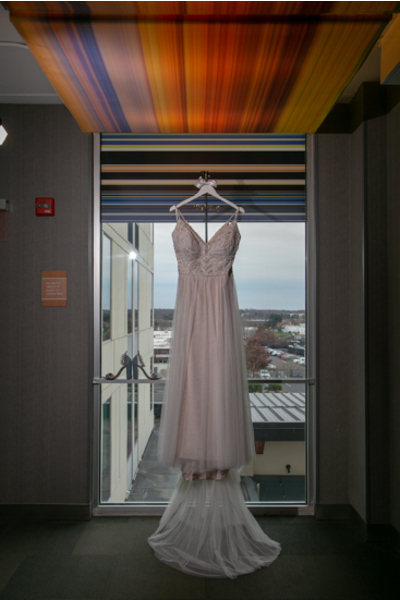 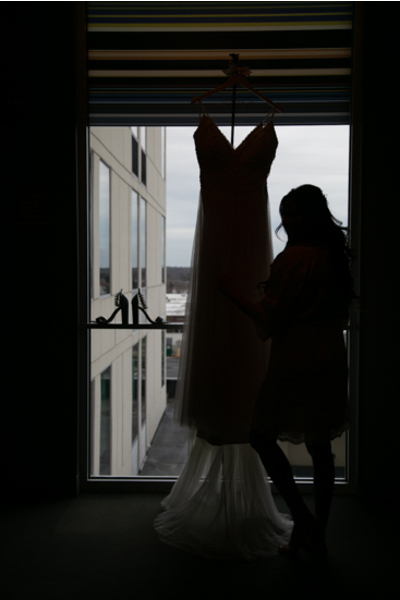 Jackie’s elegant dream dress hung down her window as she and her bridesmaids popped champagne and celebrated! 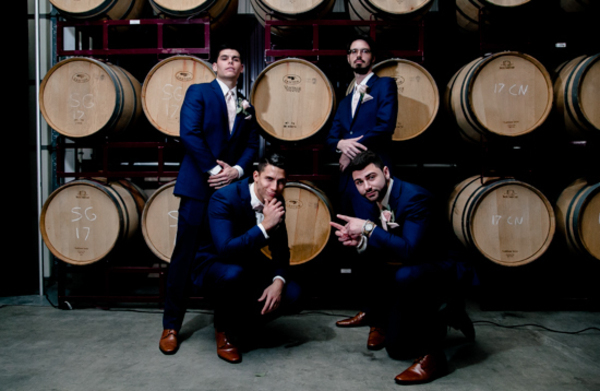 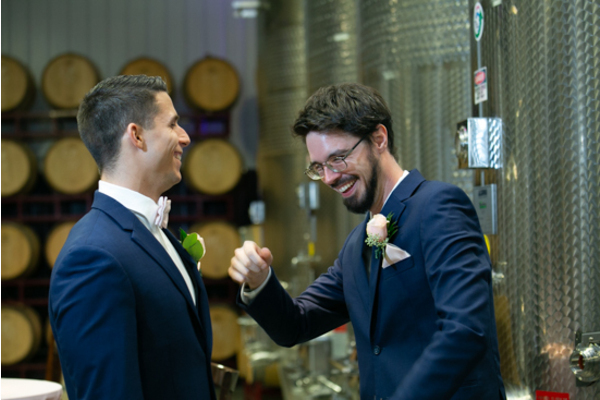 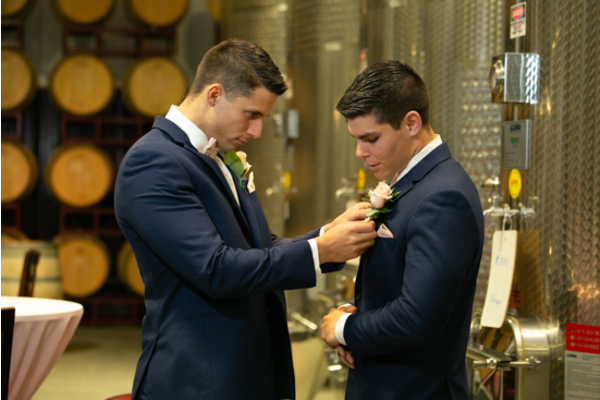 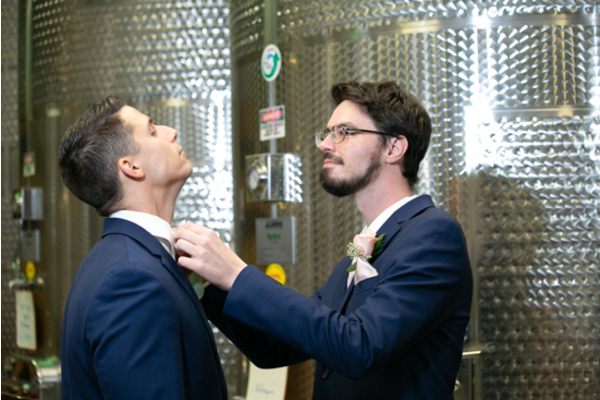 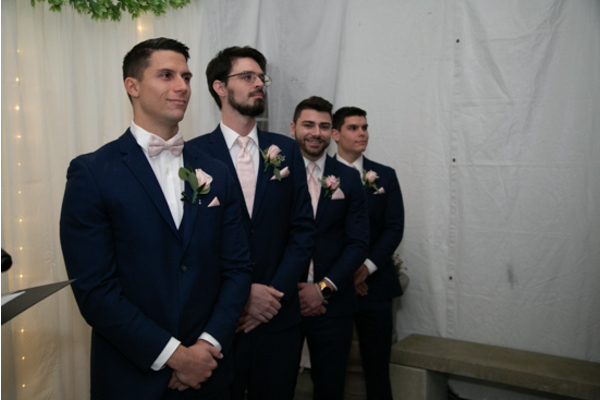 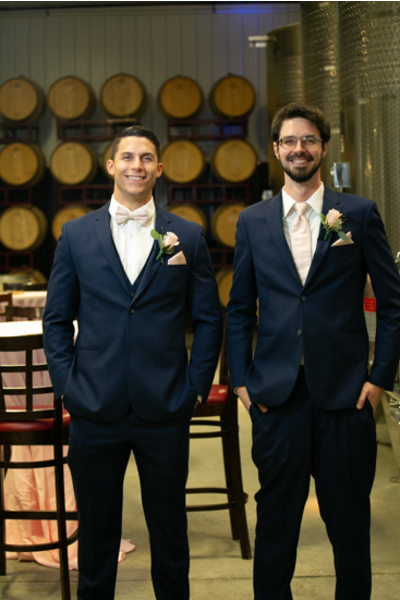 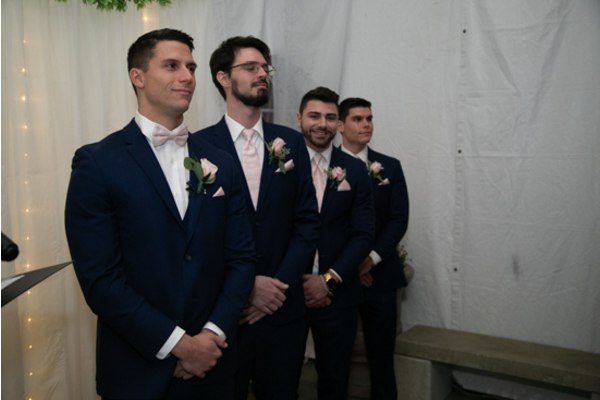 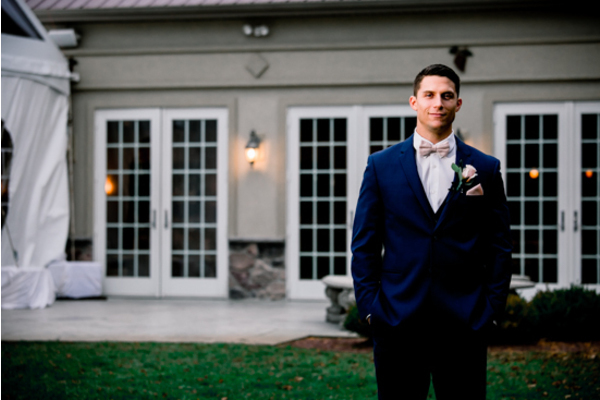 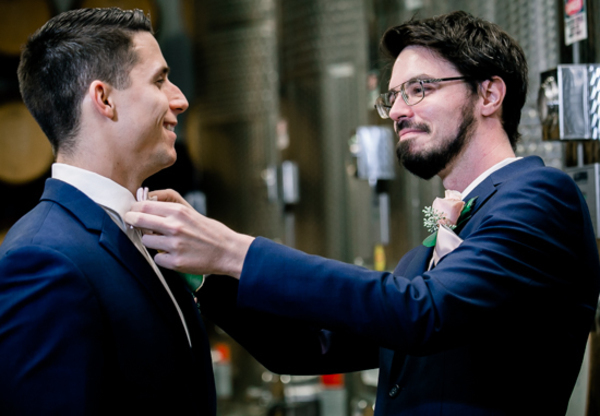 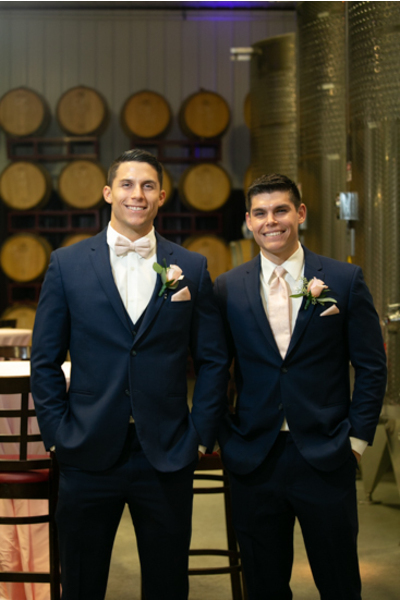 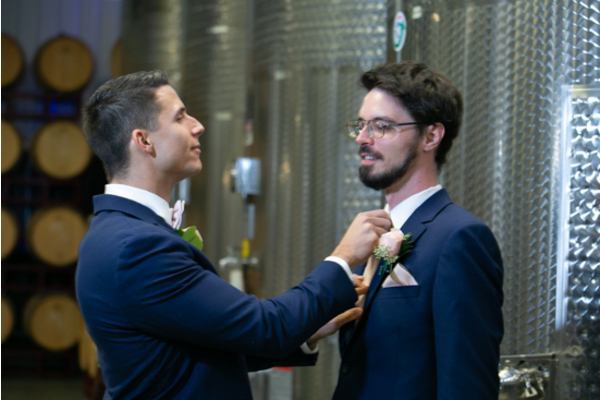 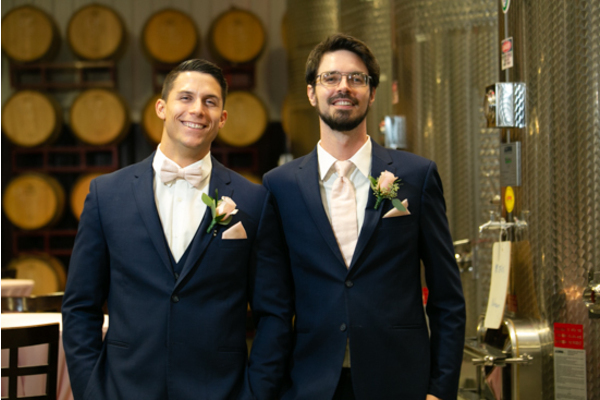 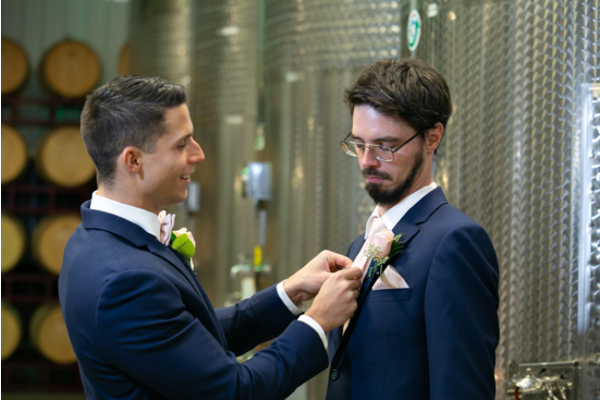 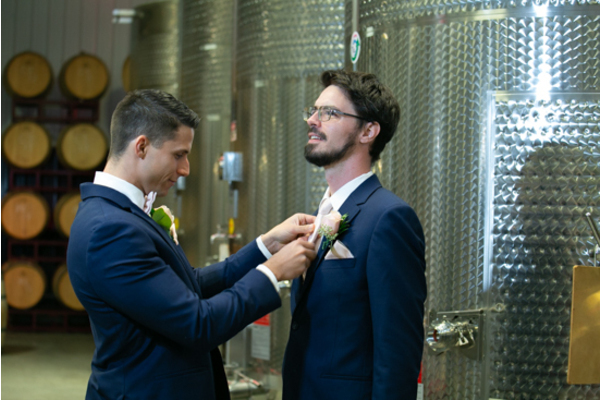 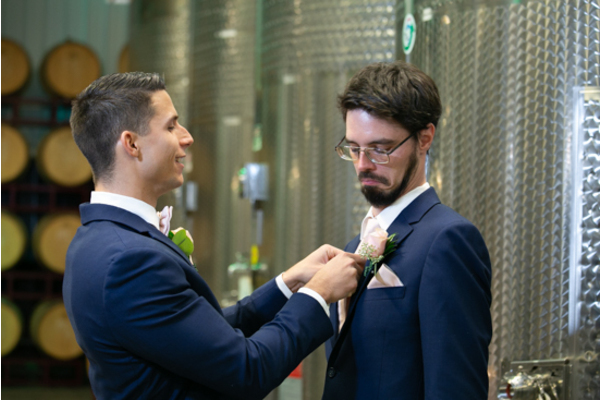 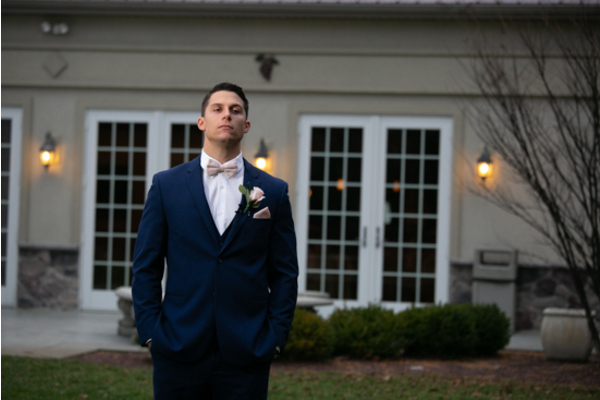 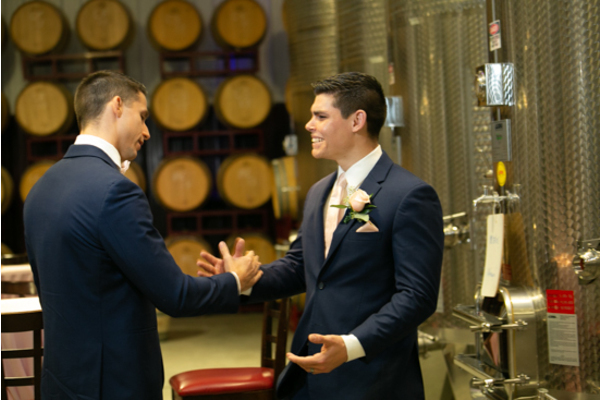 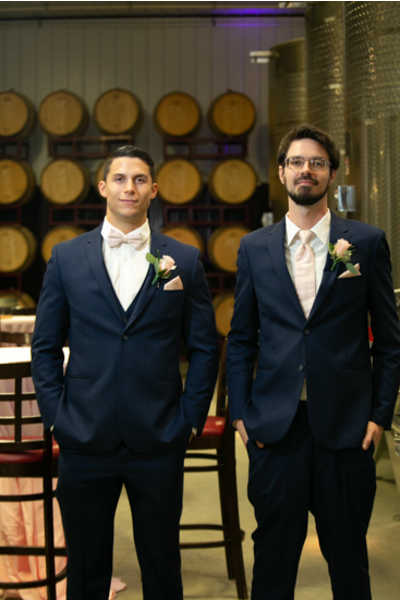 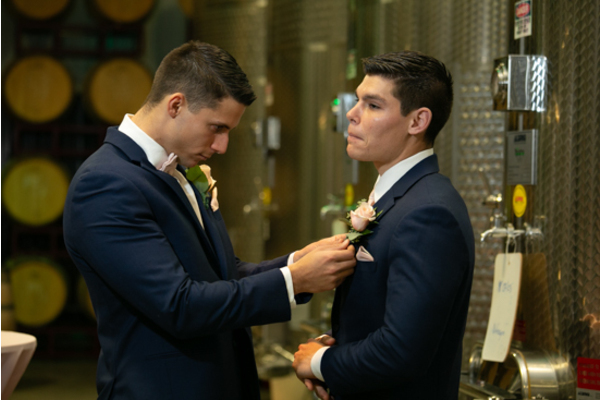 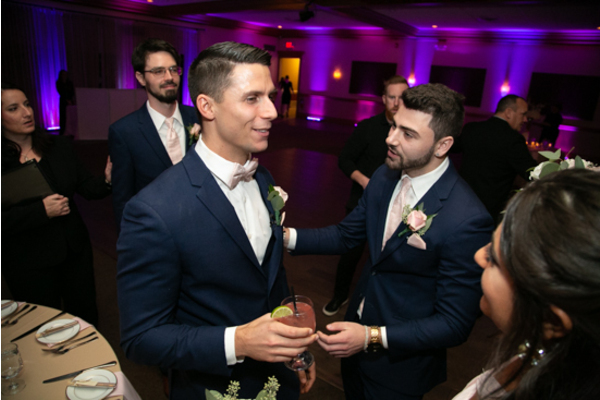 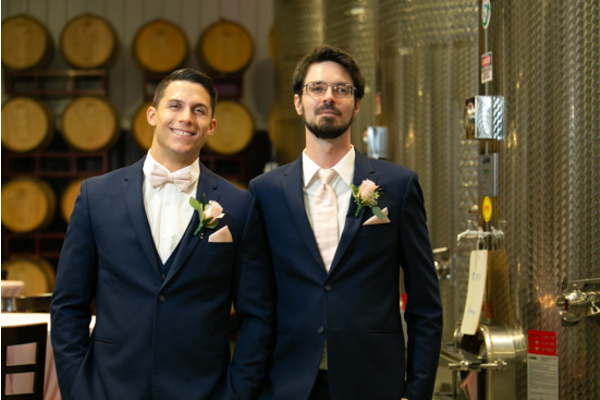 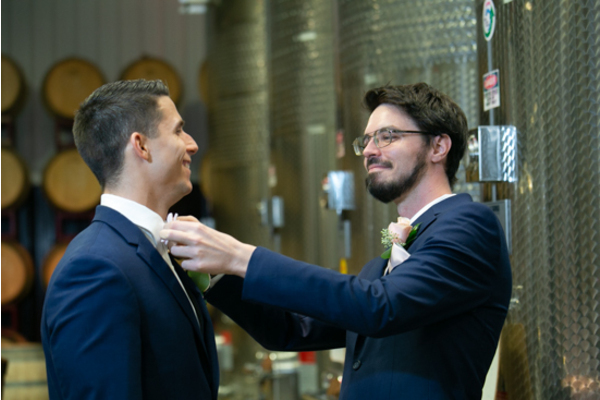 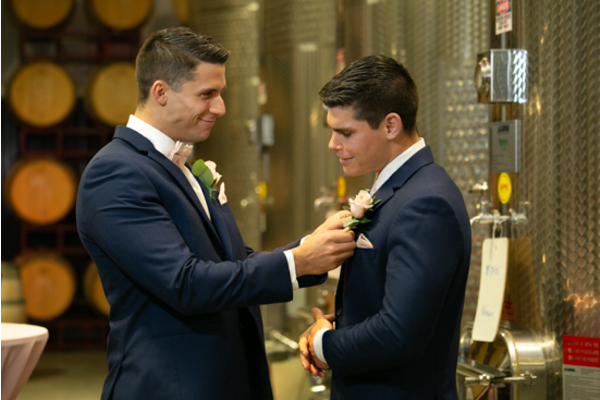 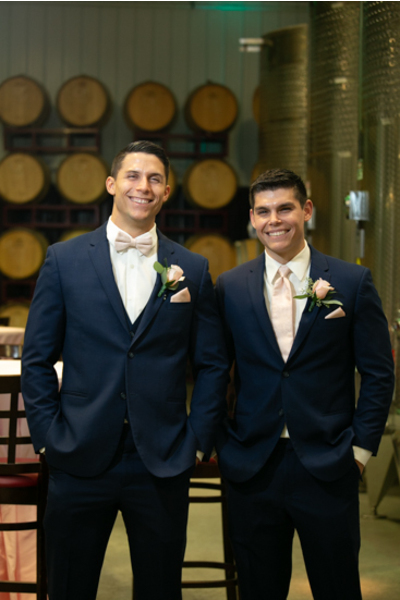 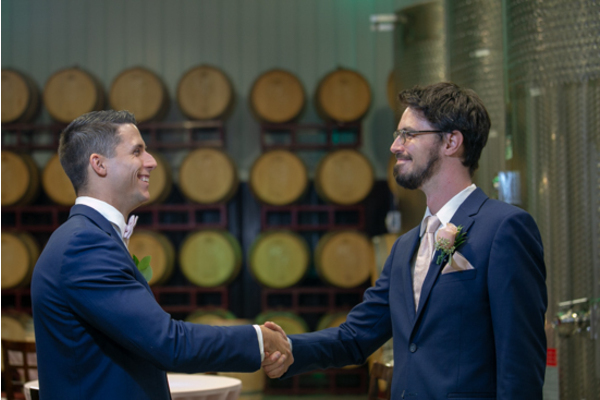 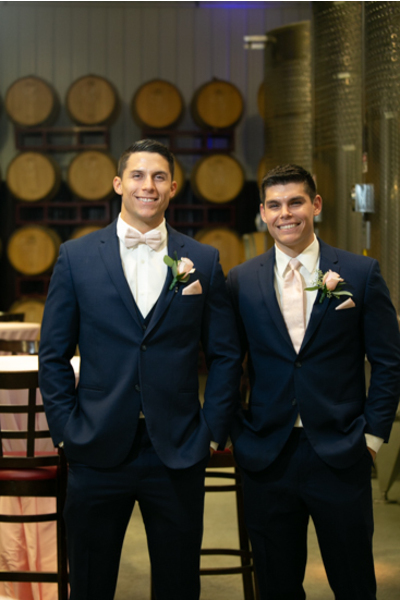 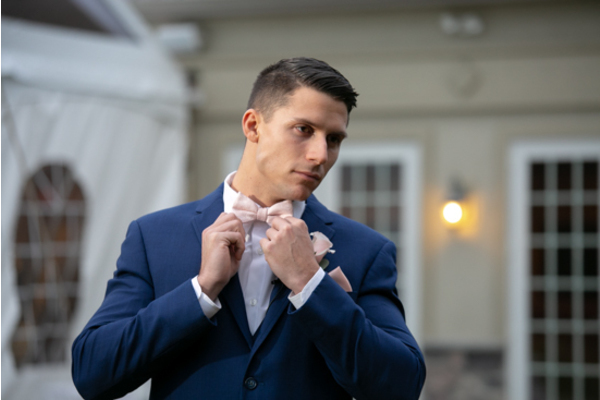 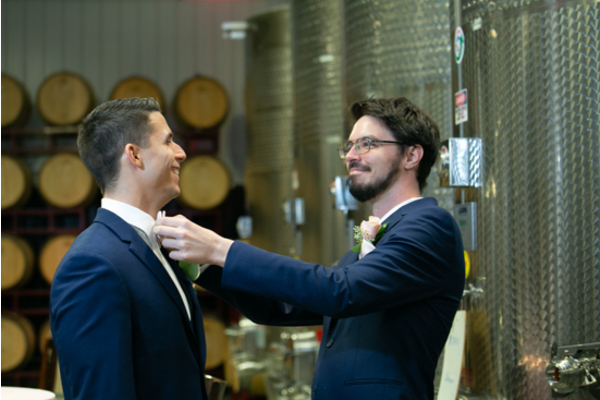 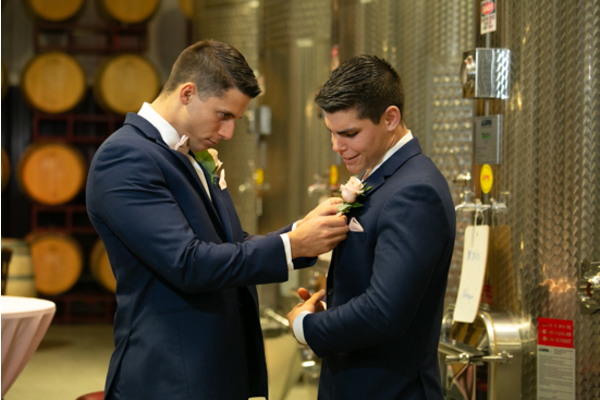 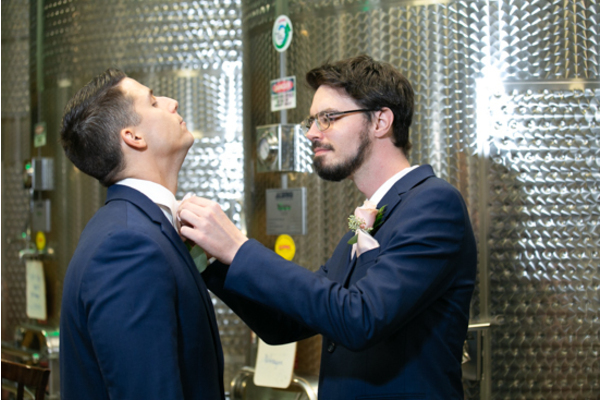 Nearby, Luke was all smiles as he completed his look with his groomsmen by his side. 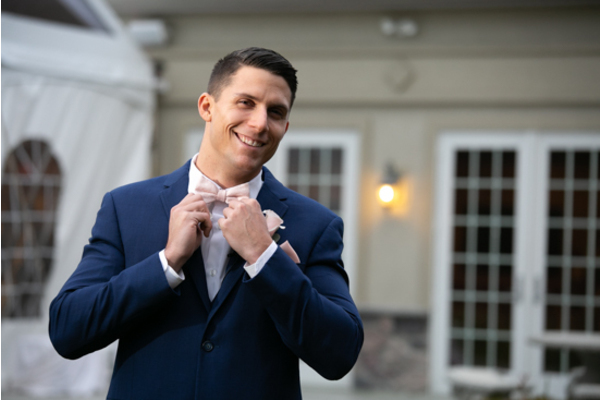 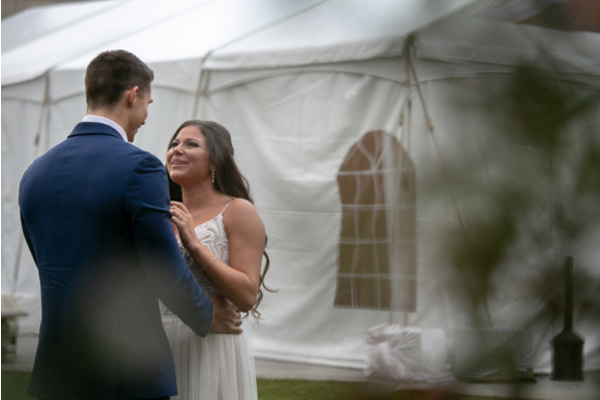 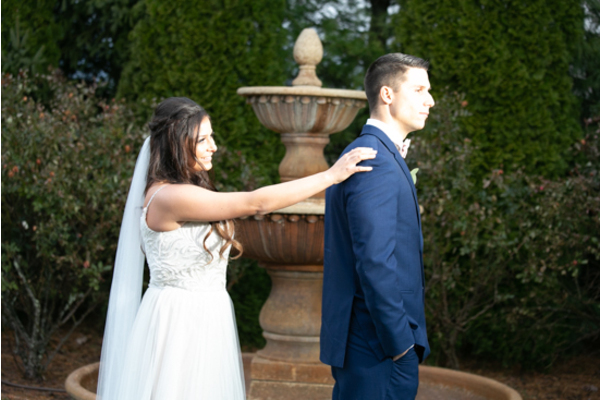 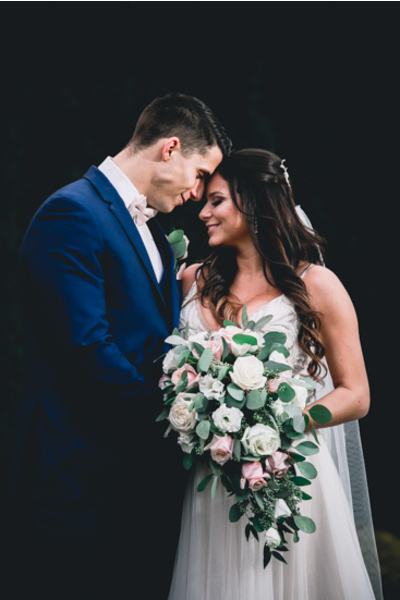 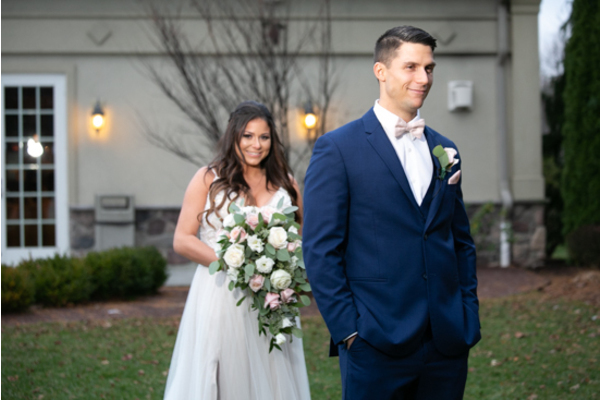 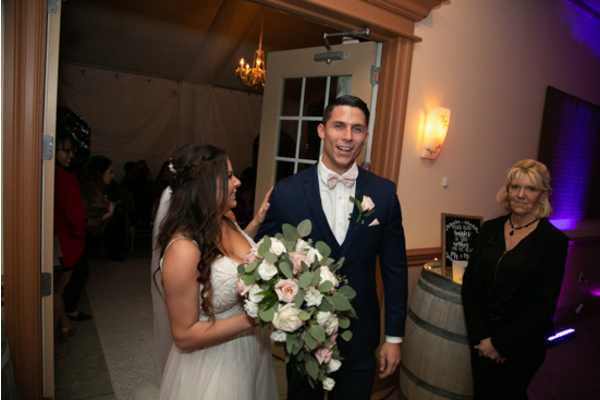 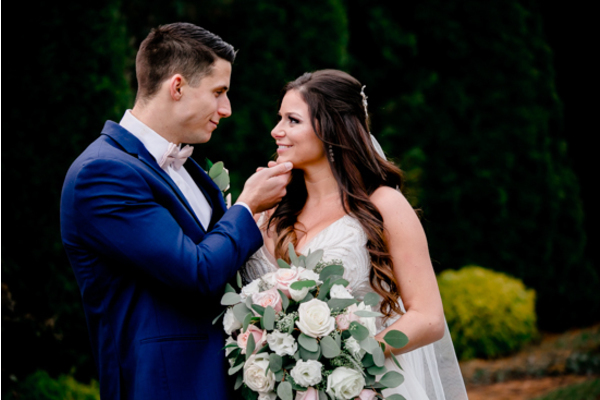 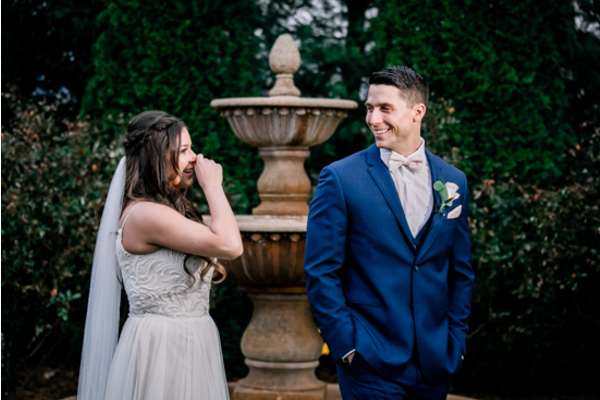 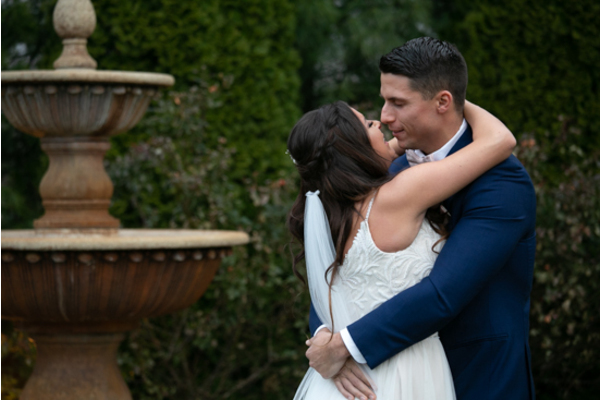 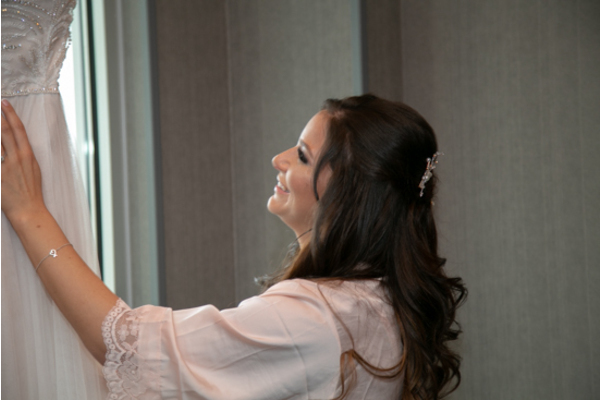 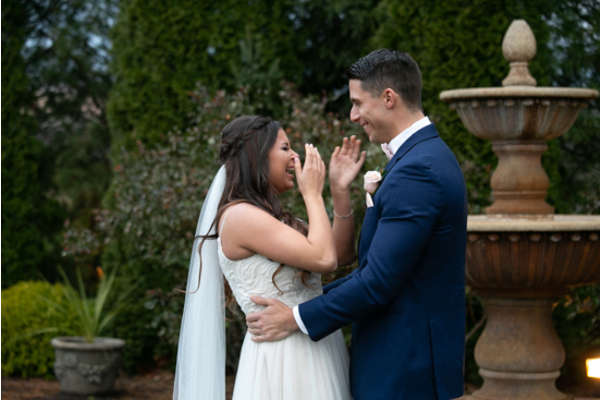 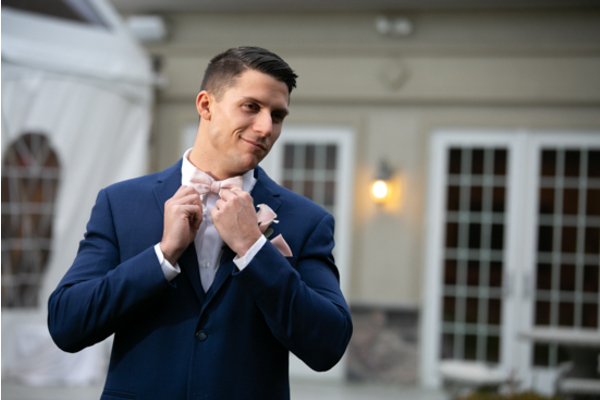 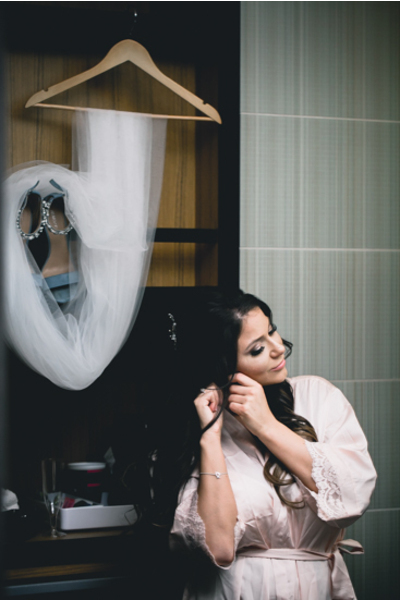 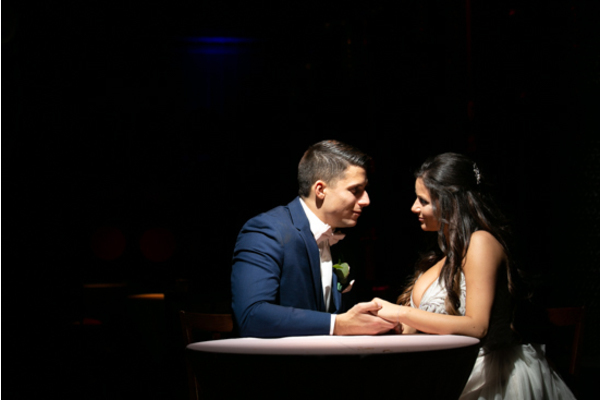 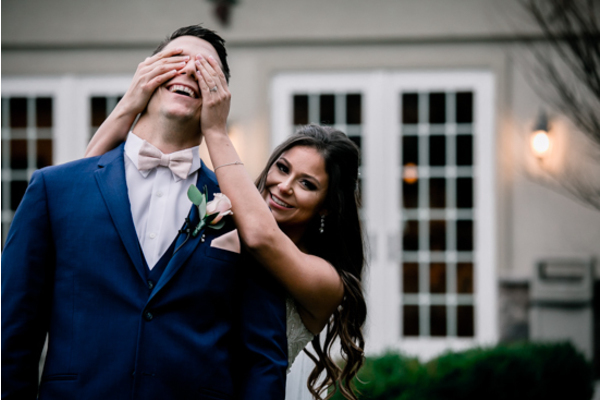 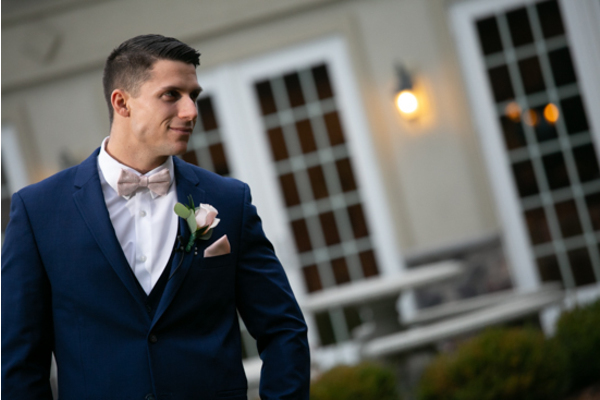 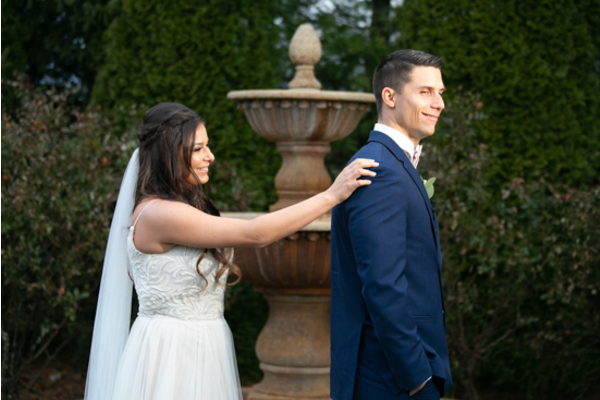 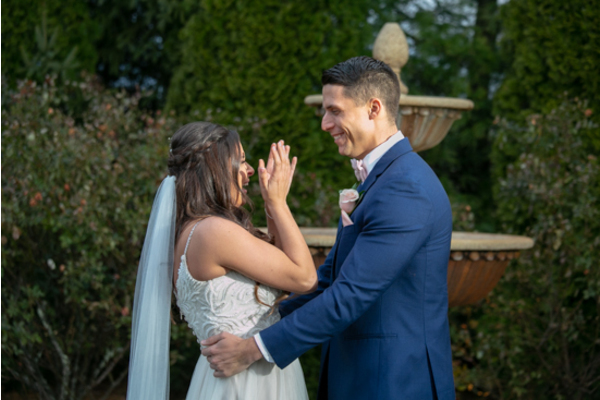 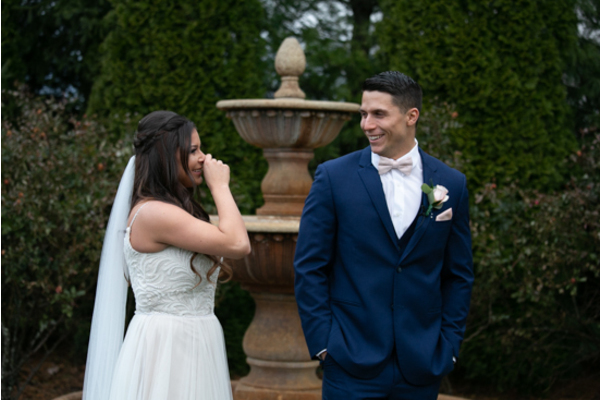 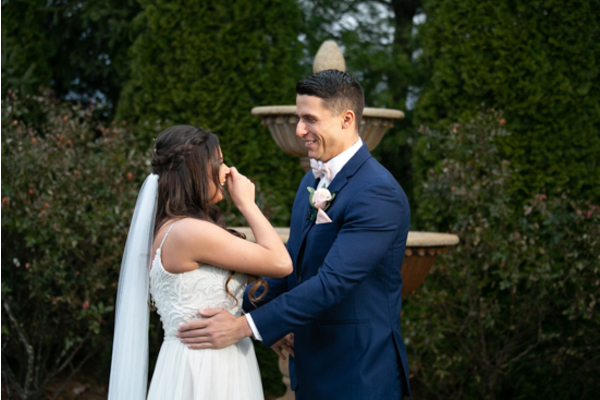 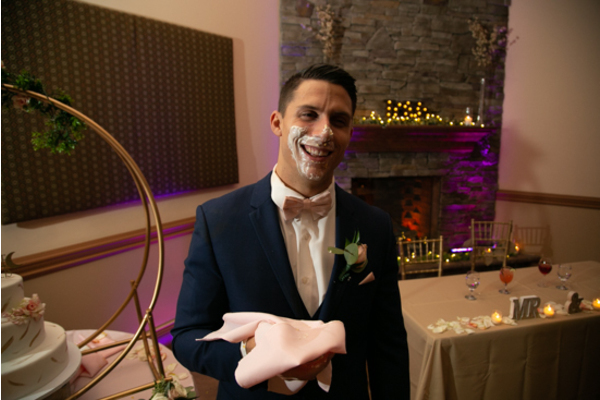 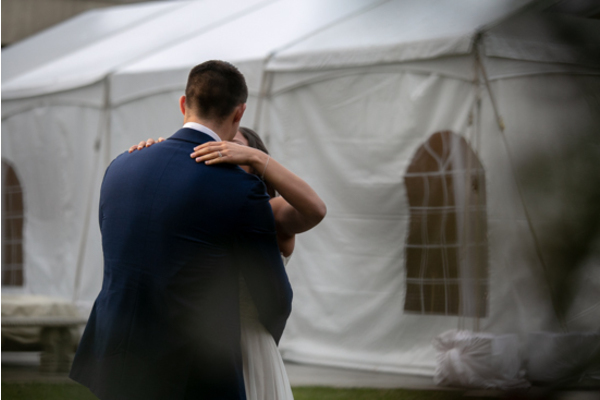 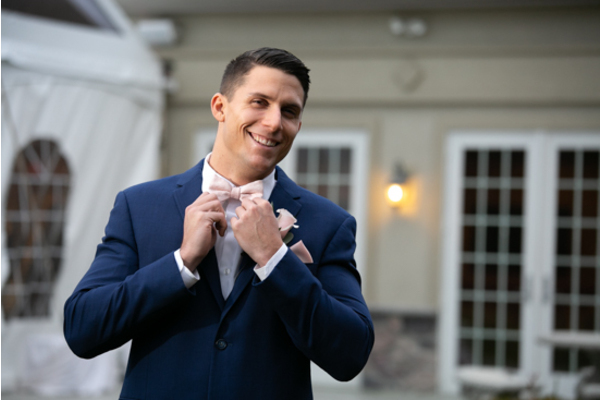 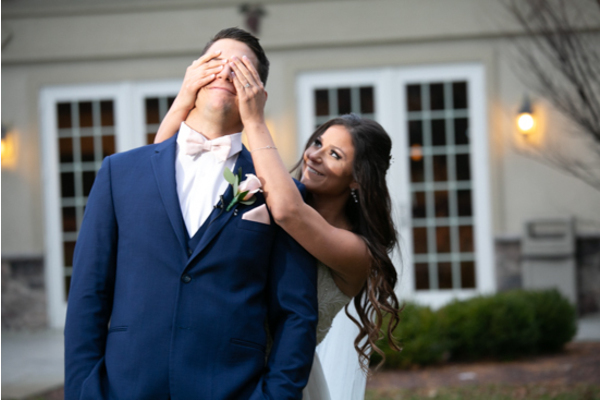 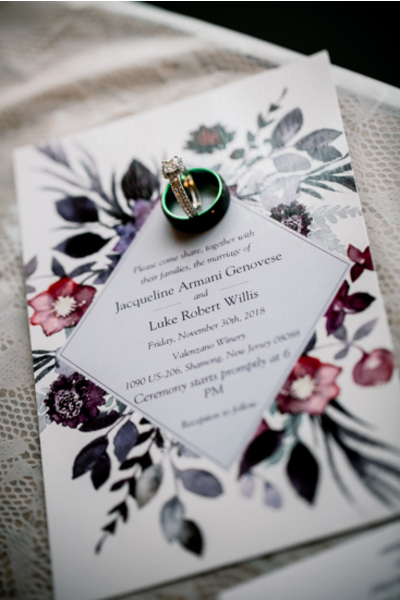 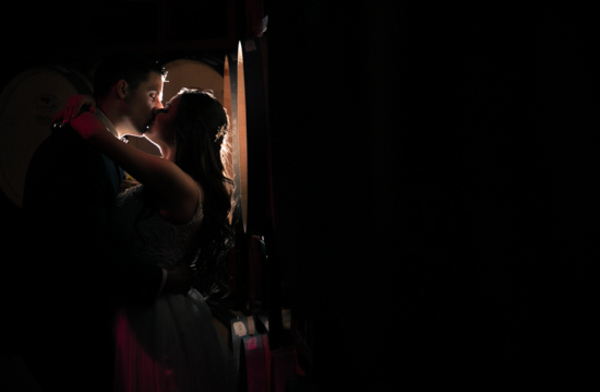 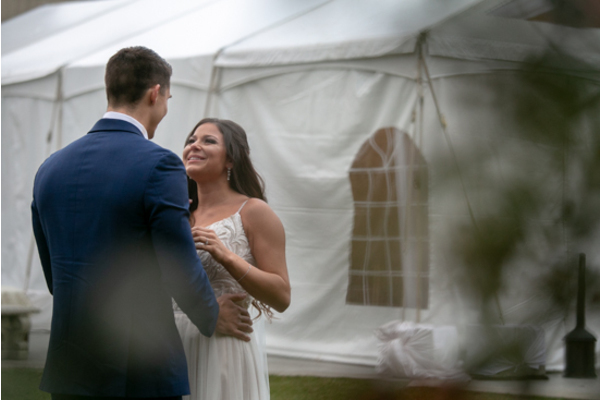 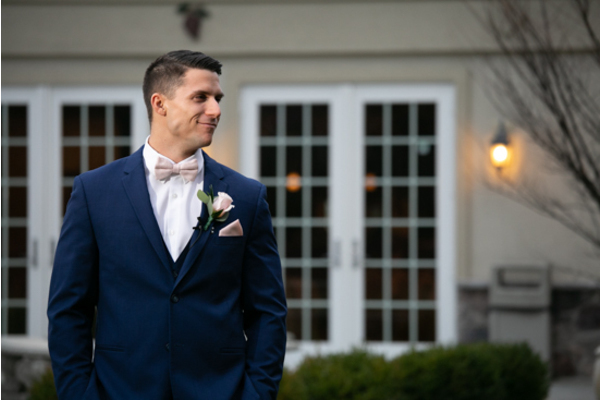 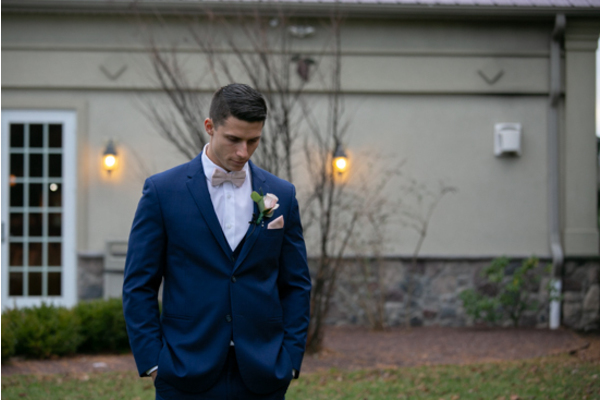 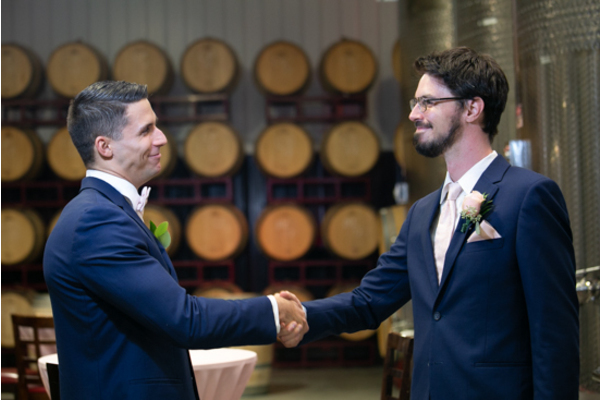 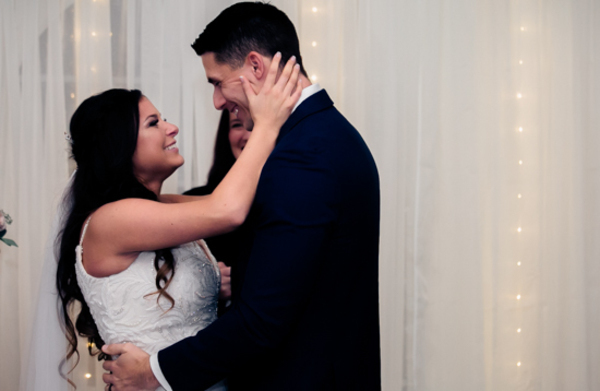 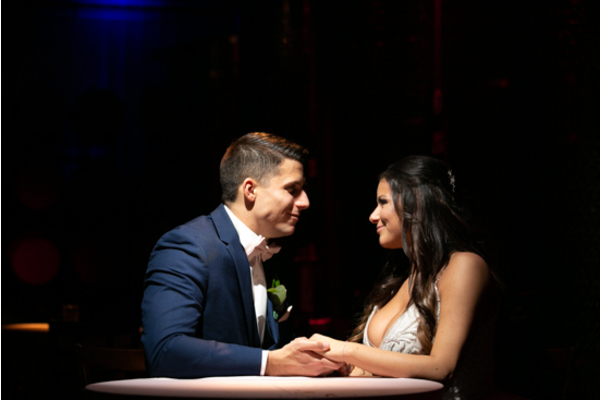 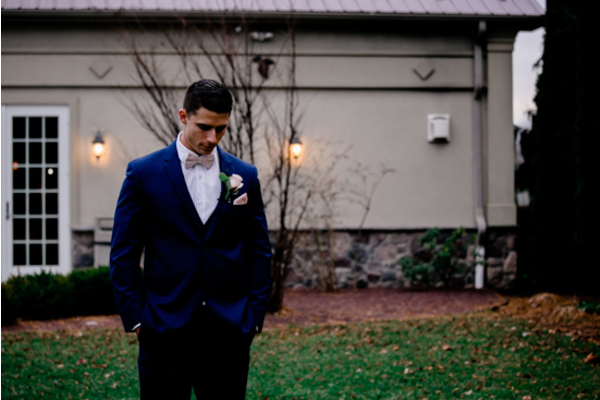 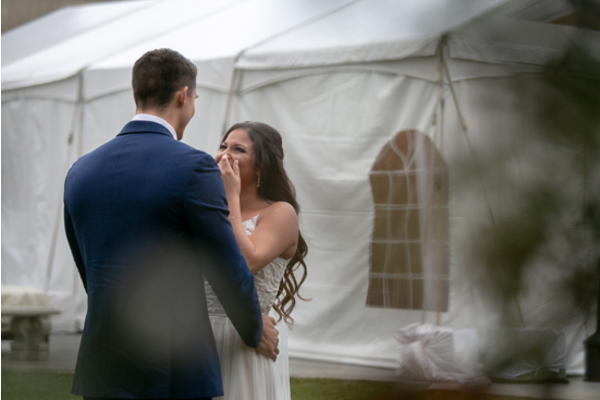 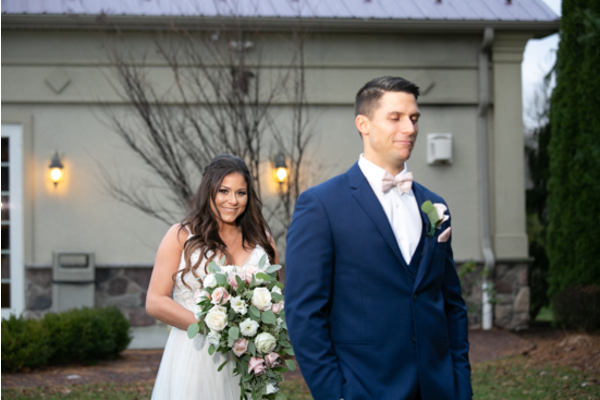 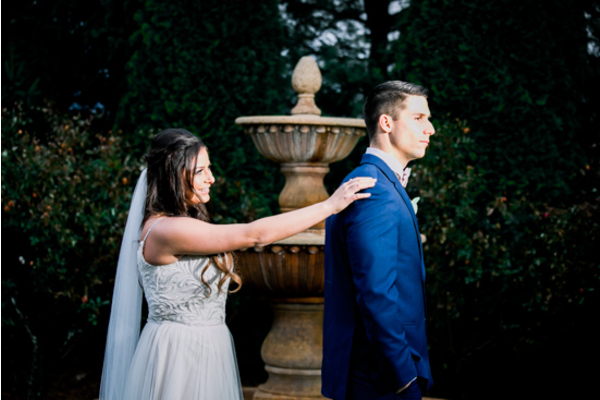 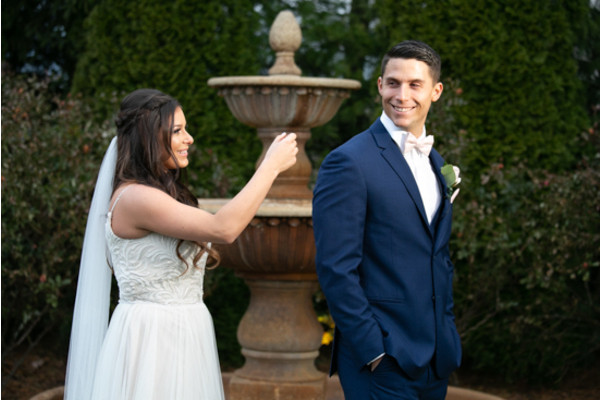 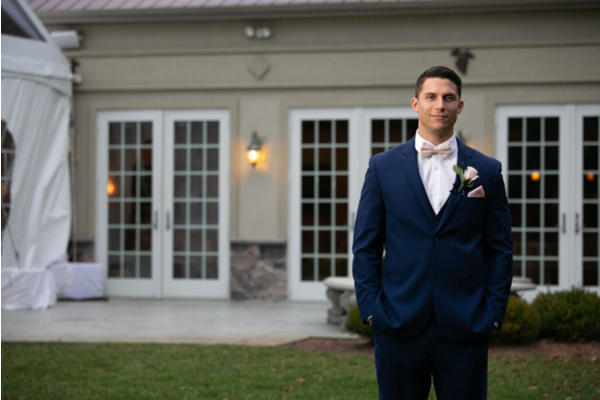 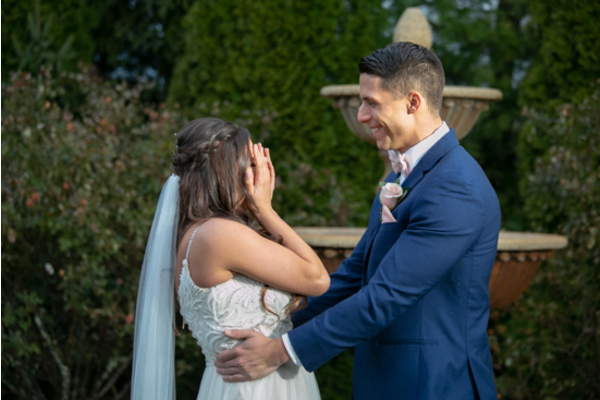 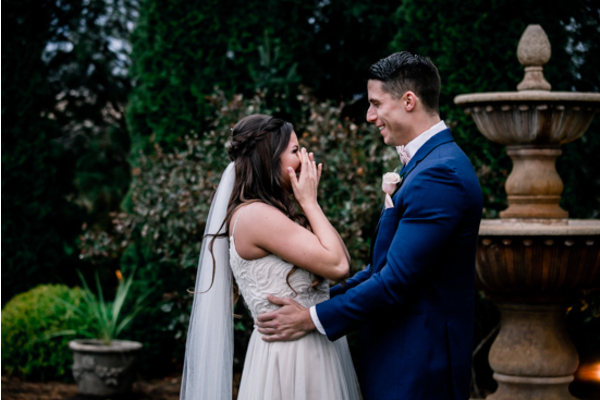 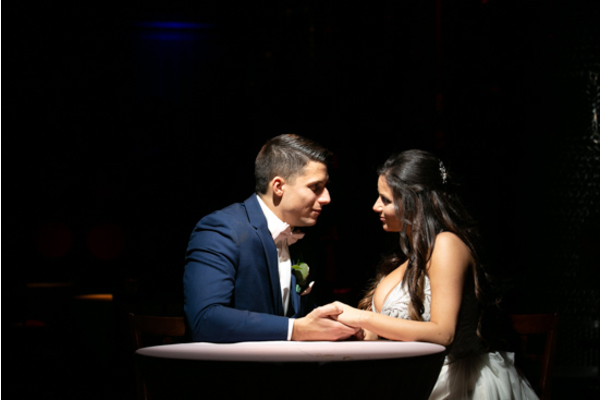 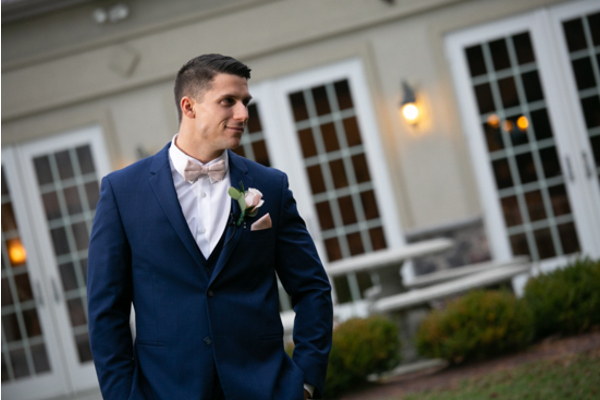 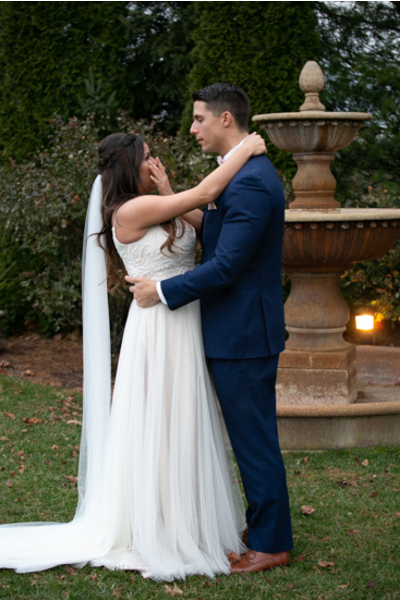 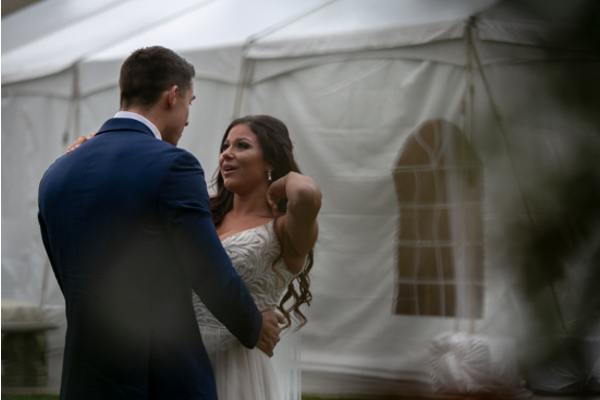 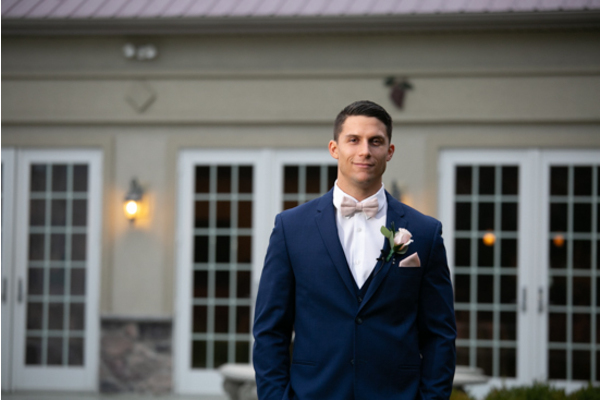 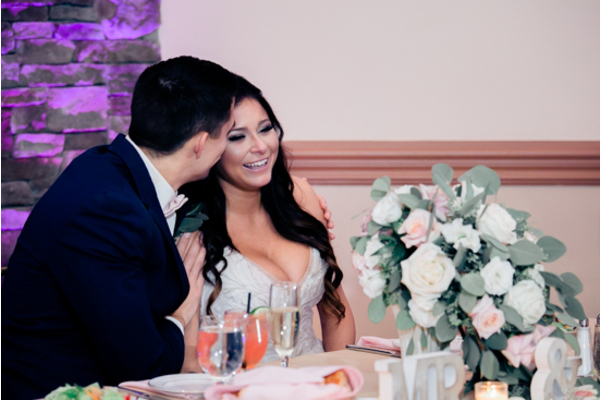 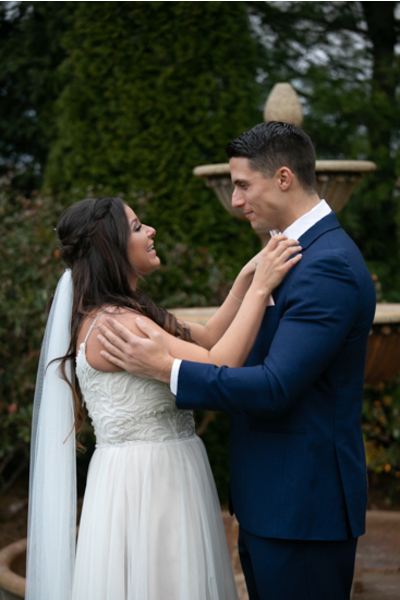 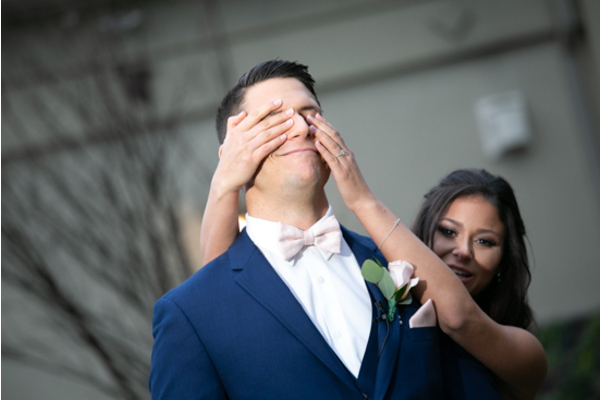 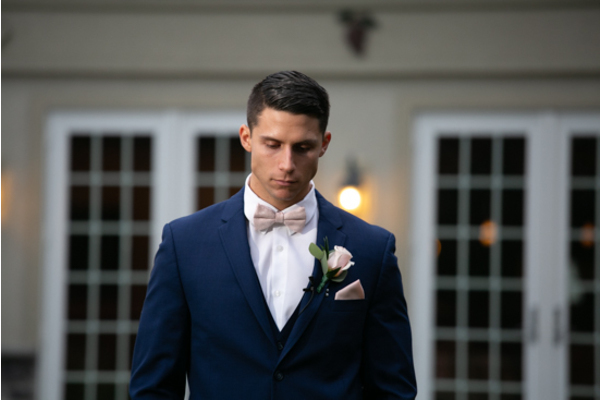 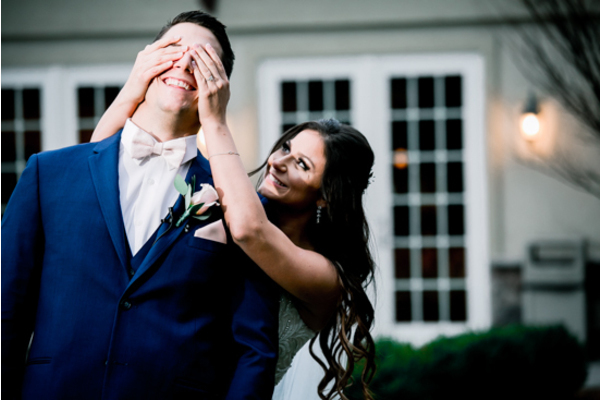 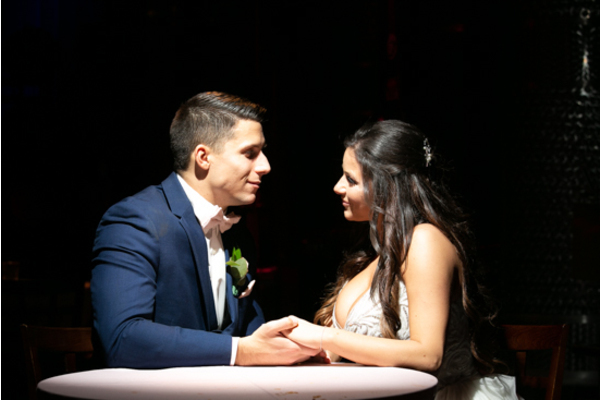 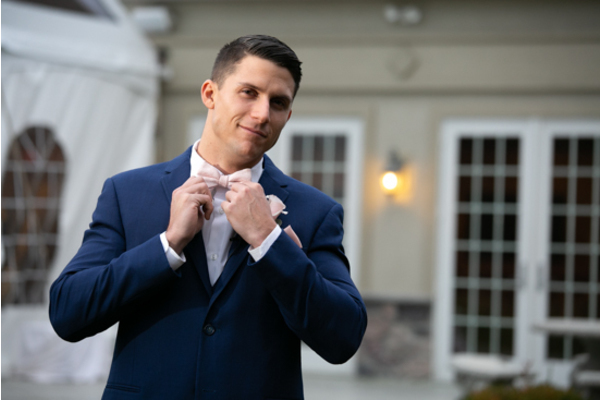 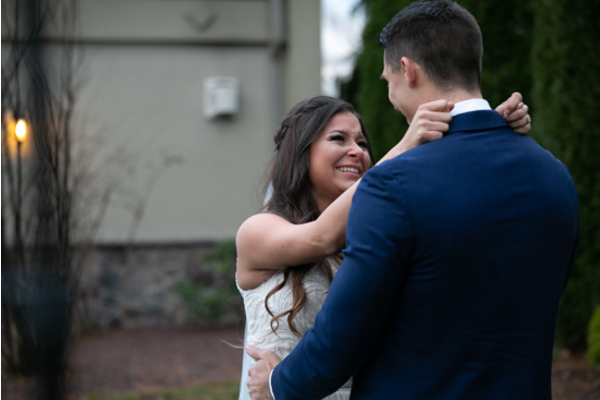 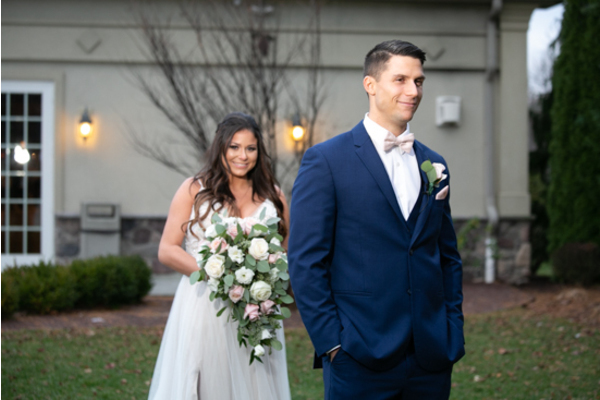 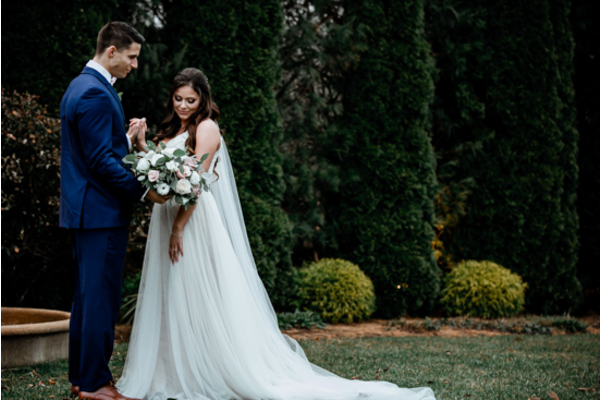 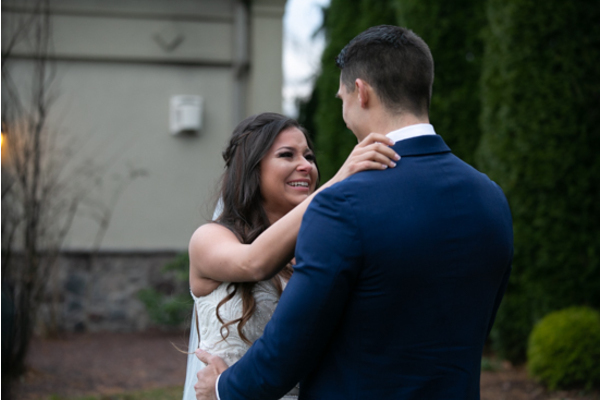 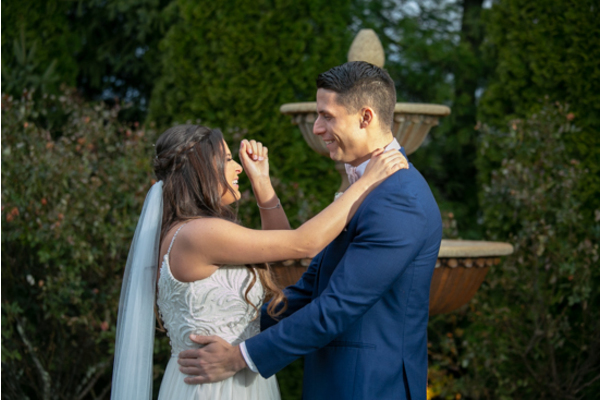 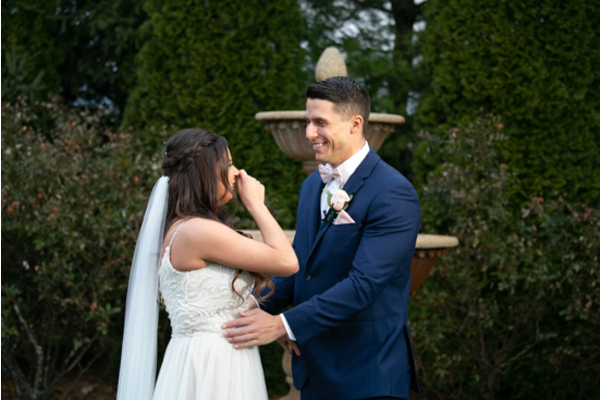 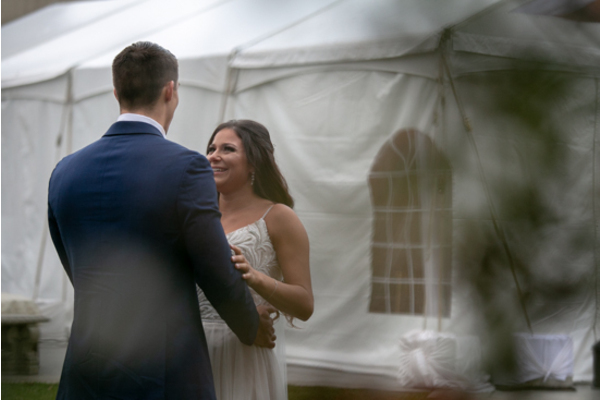 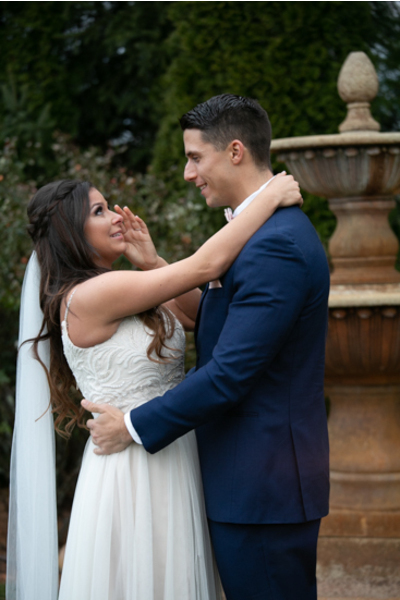 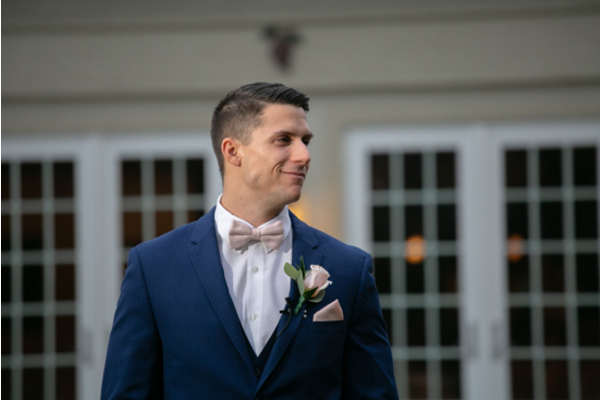 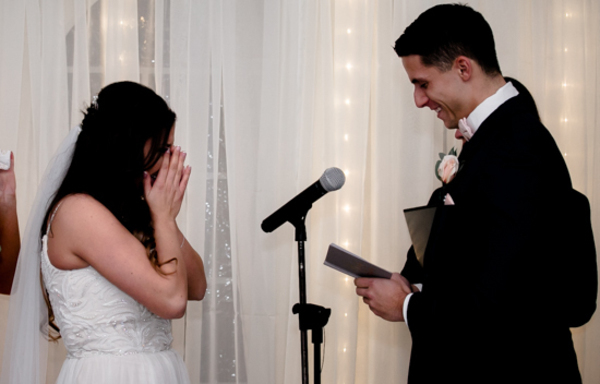 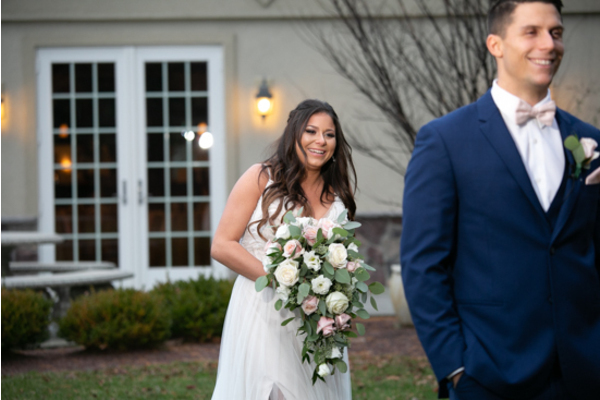 Our NJ Wedding Photographer was there for the perfect moment as Jackie surprised Luke with her first look. 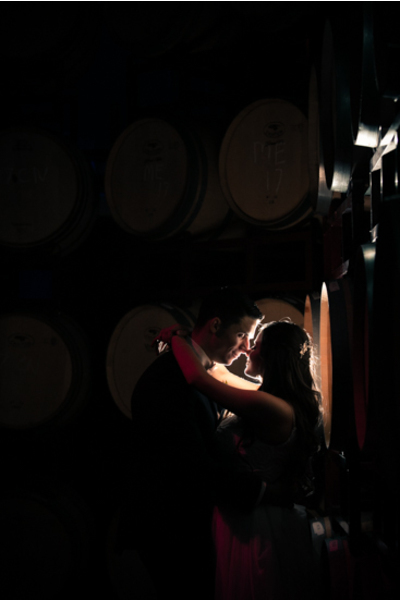 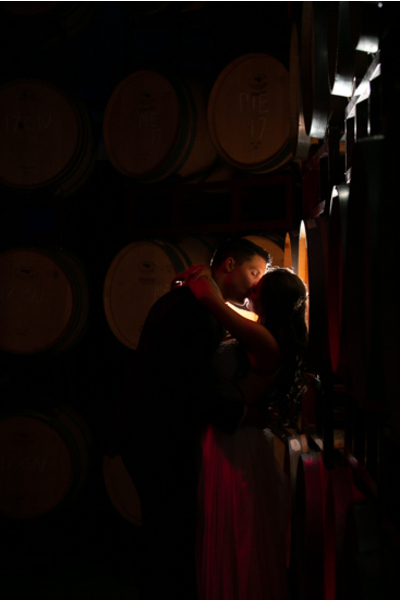 The couple enjoyed every moment together taking portraits outside on the winery grounds. 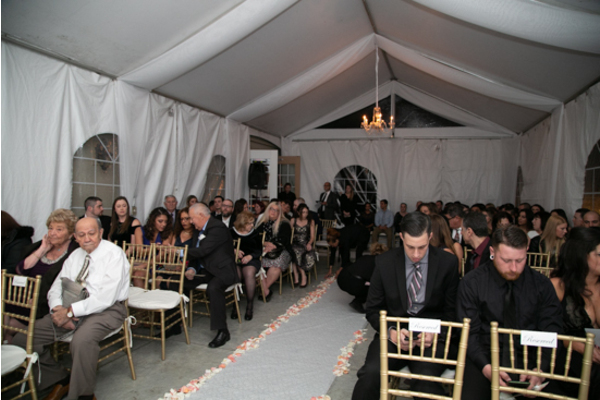 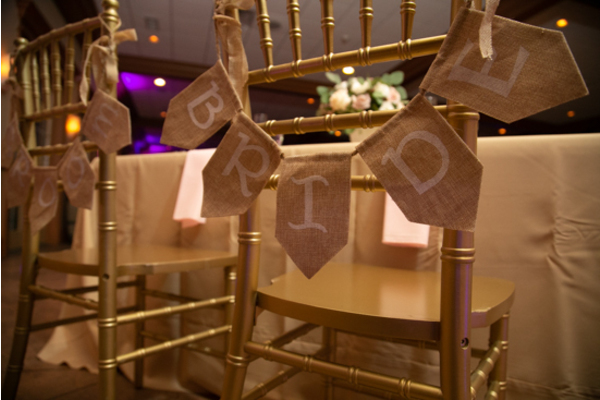 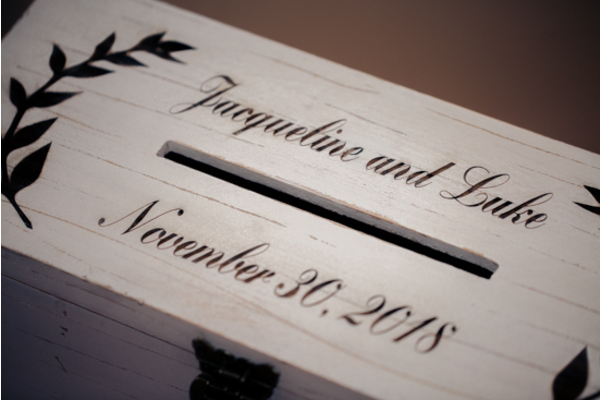 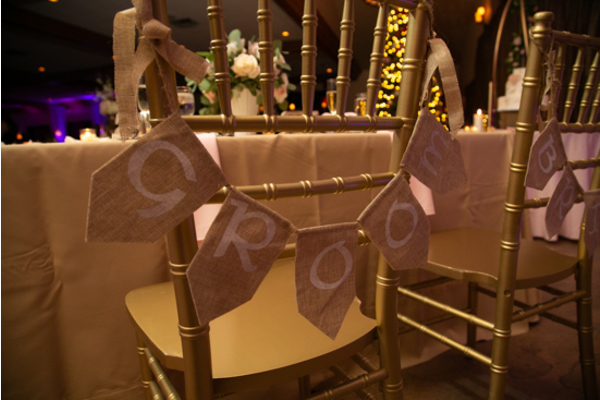 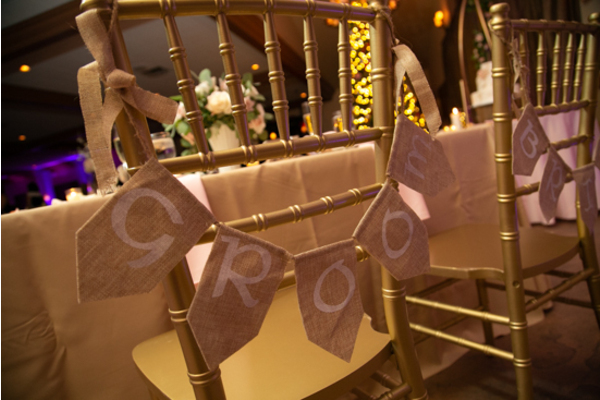 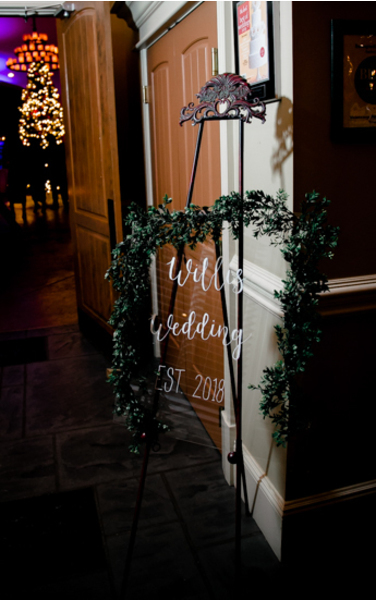 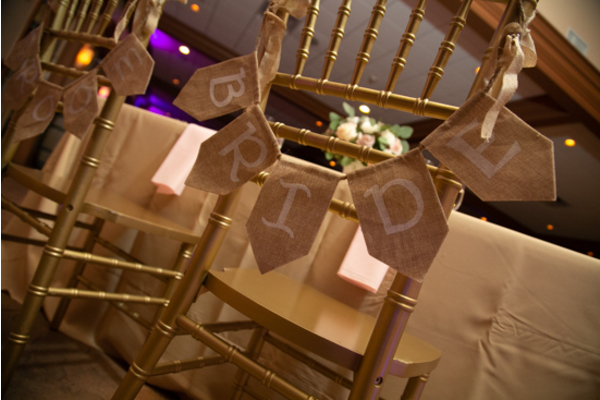 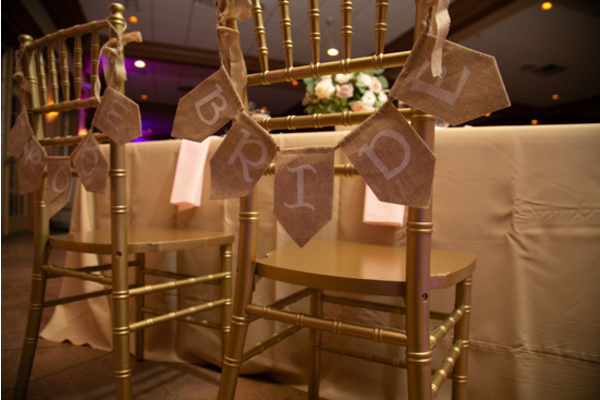 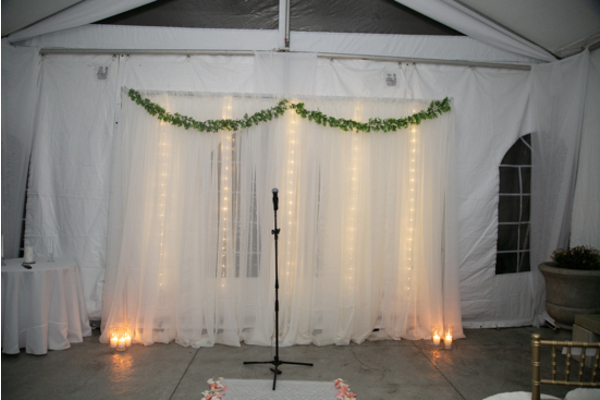 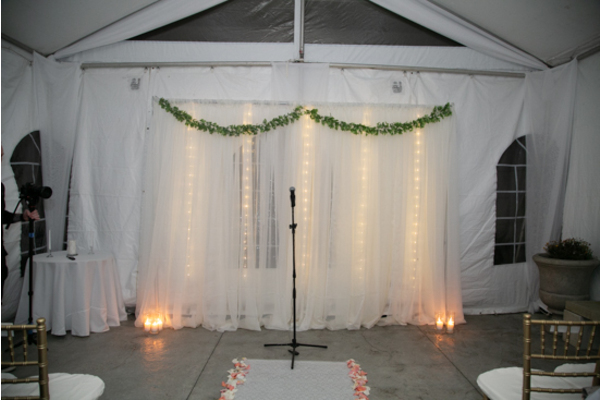 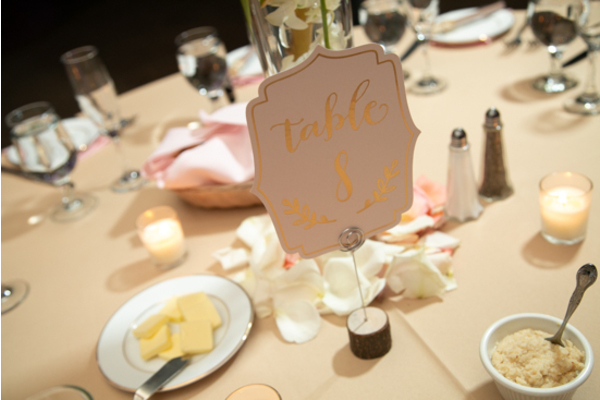 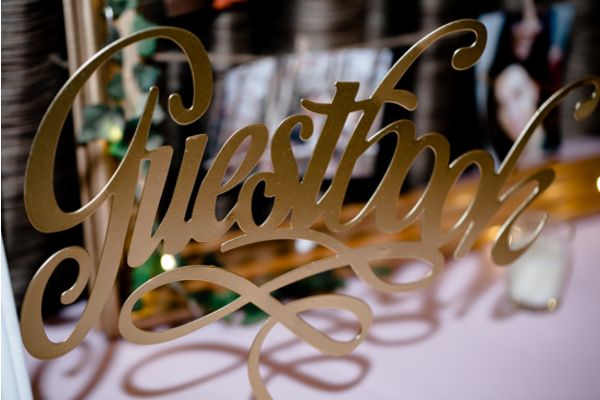 Next, it was time for guests to find their ceremony seats and get excited! 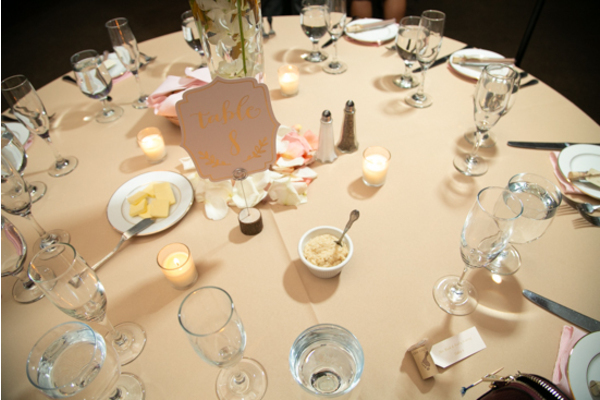 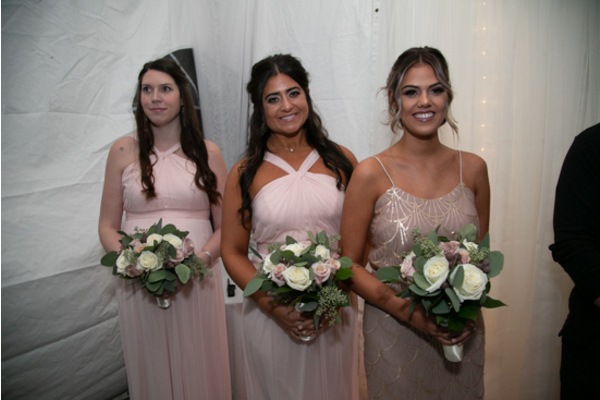 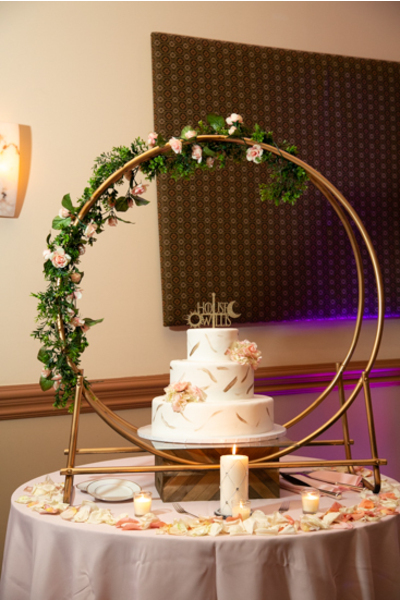 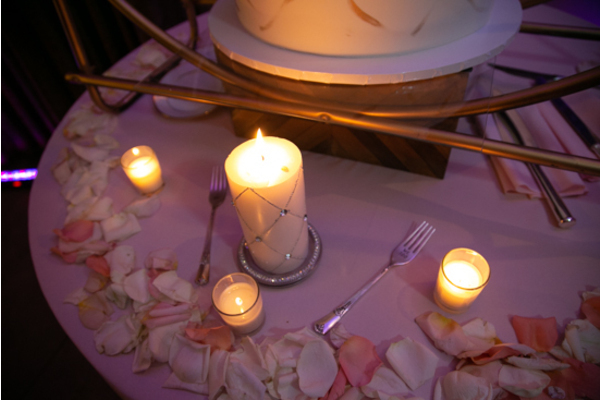 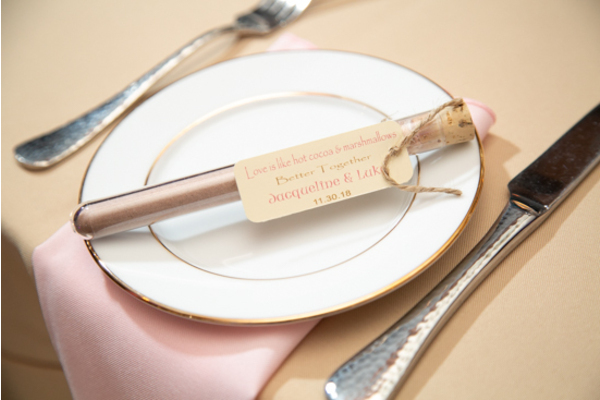 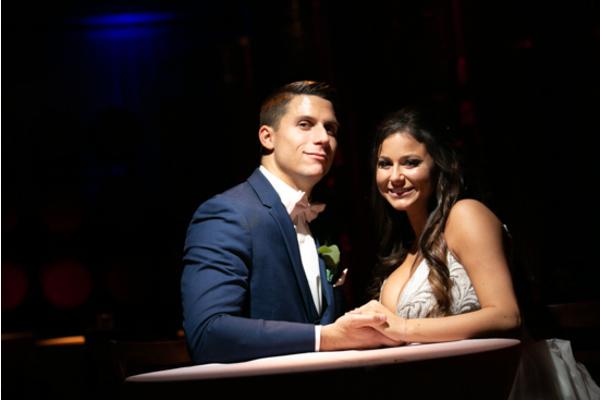 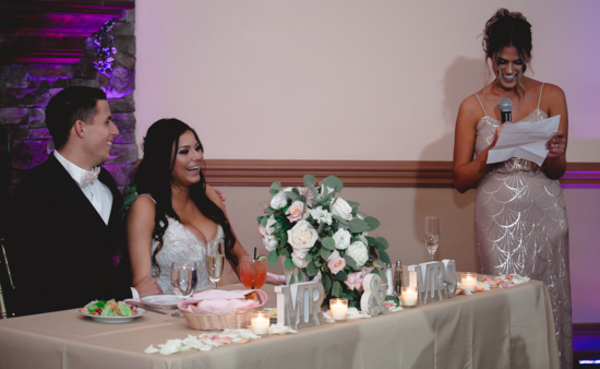 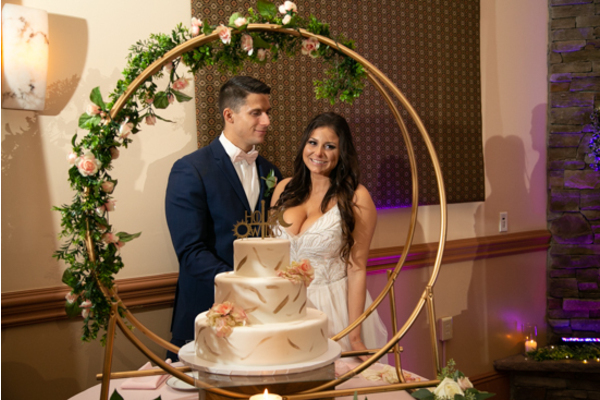 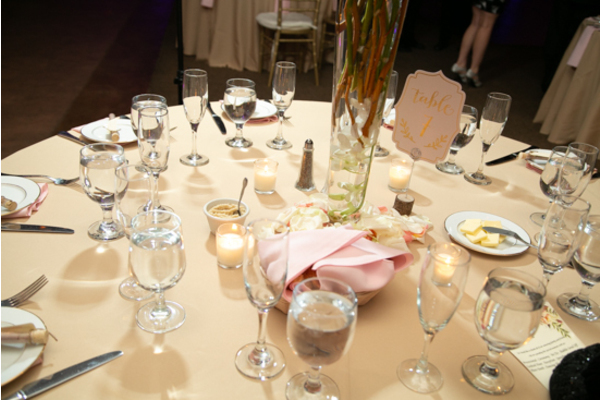 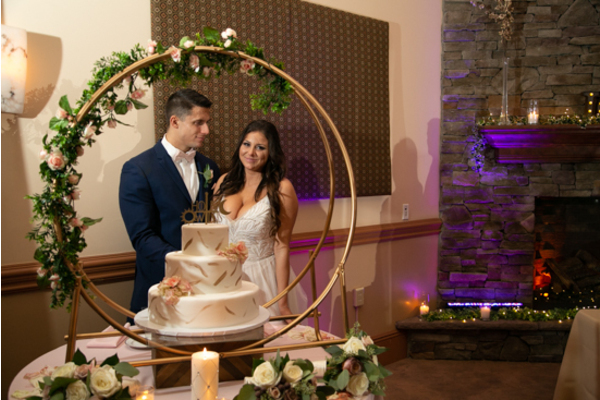 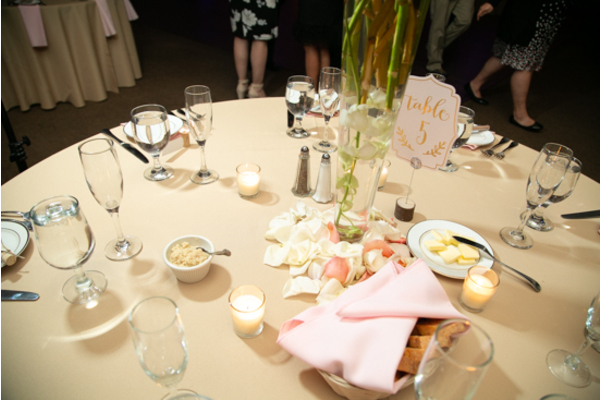 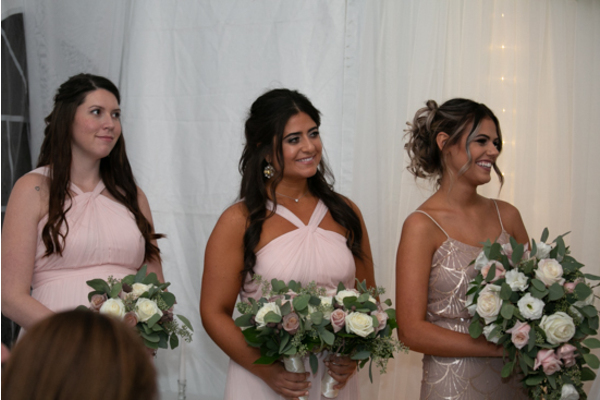 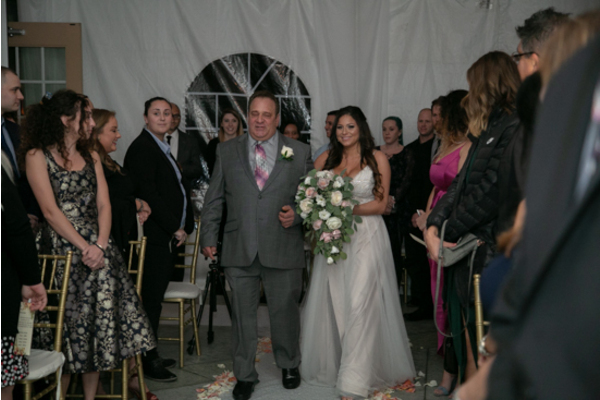 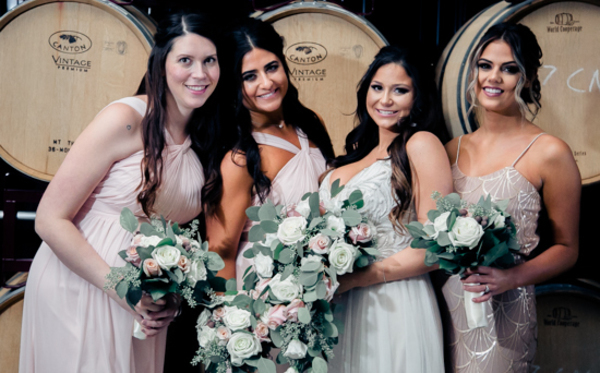 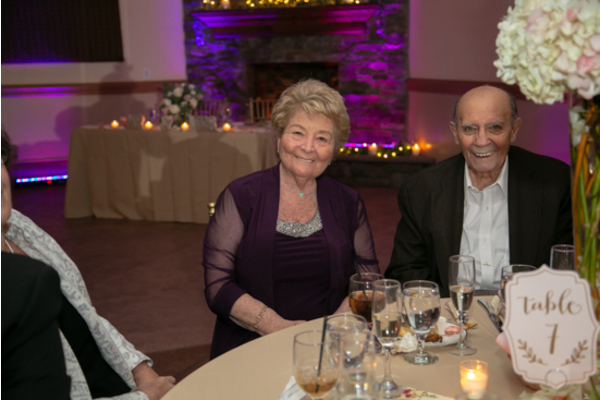 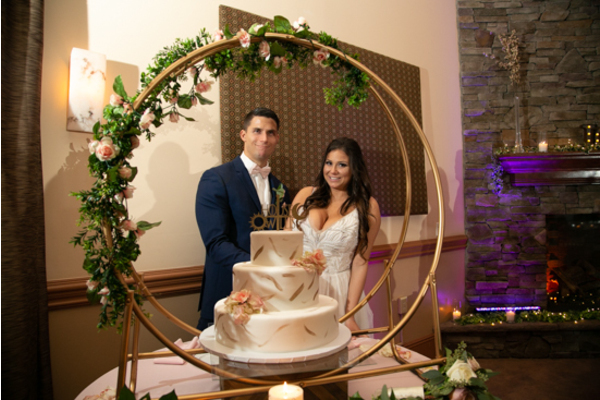 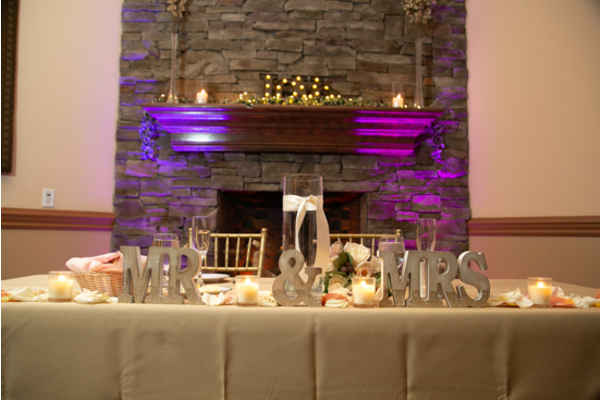 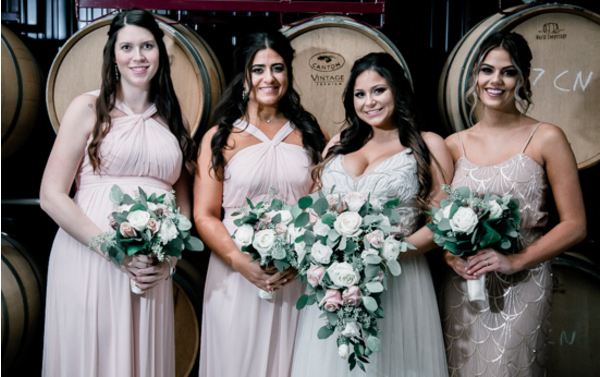 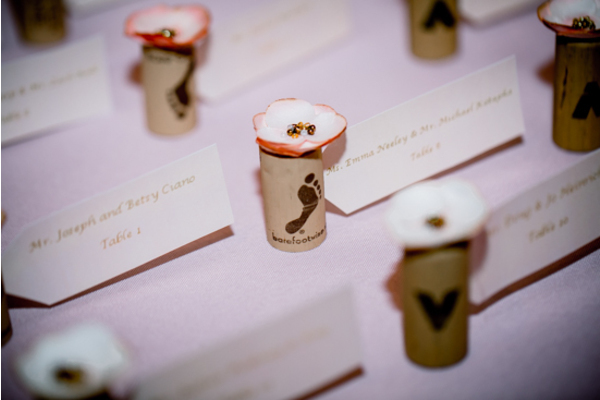 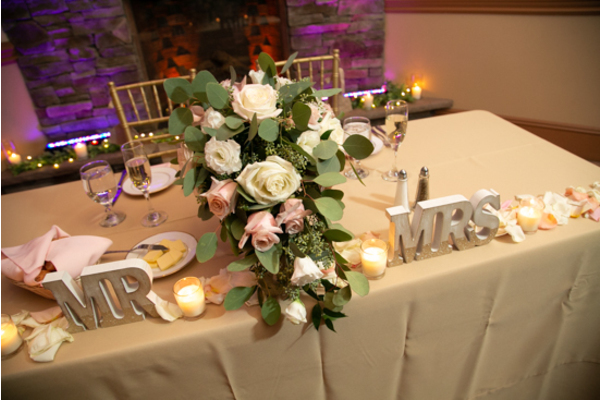 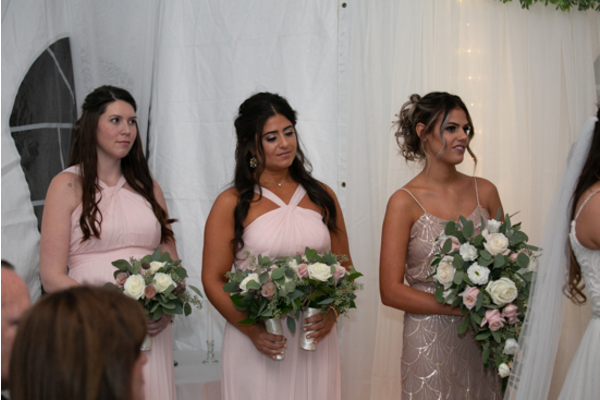 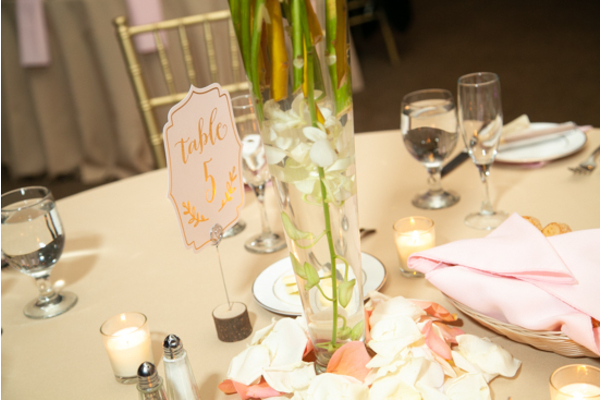 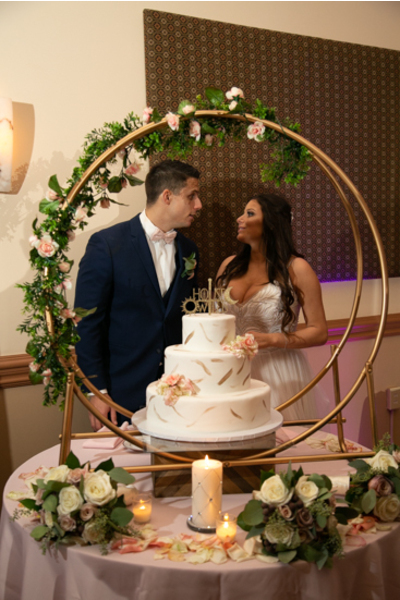 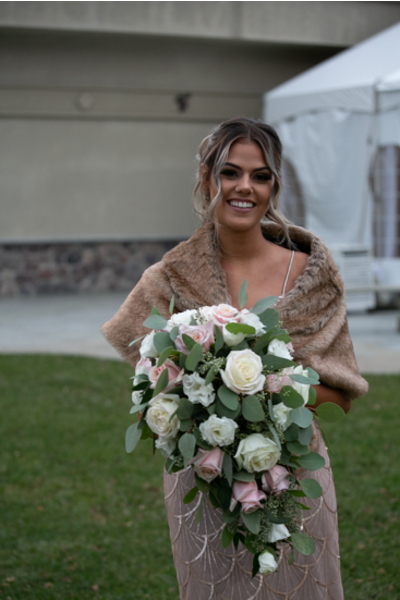 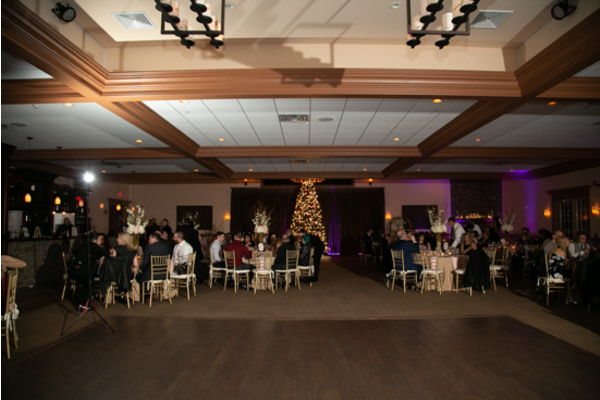 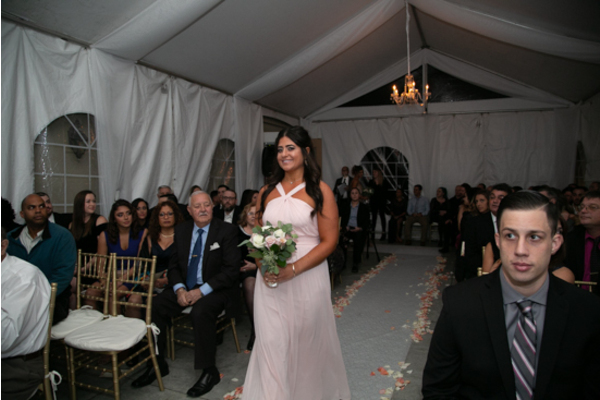 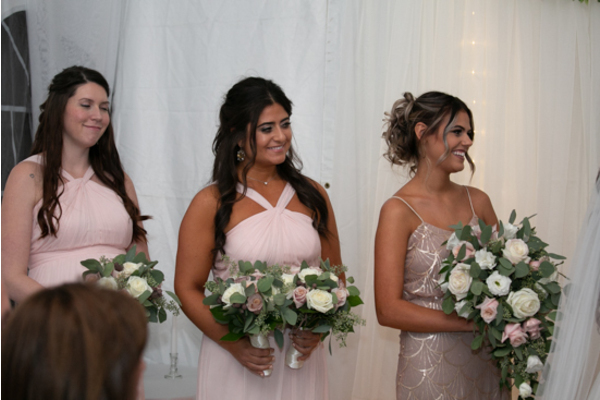 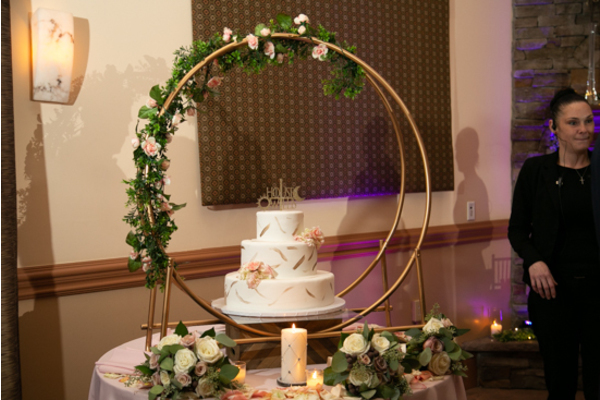 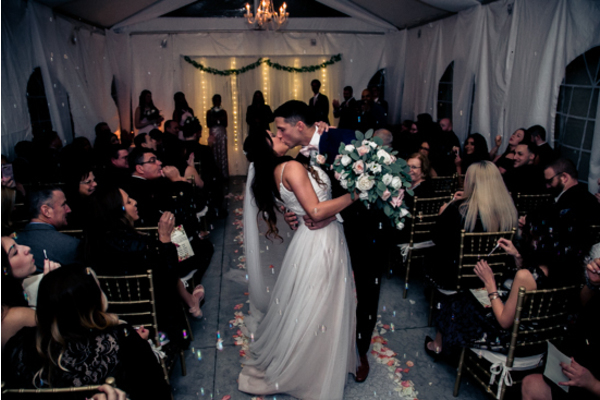 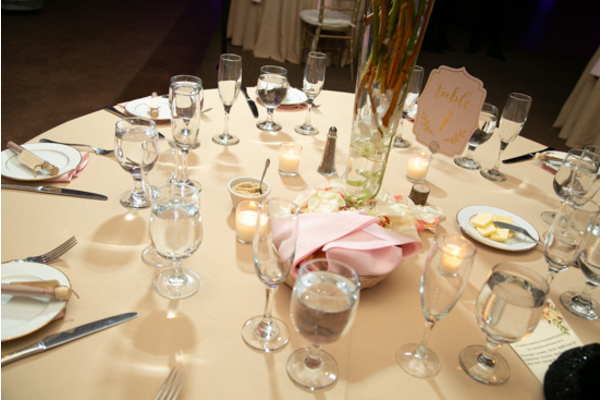 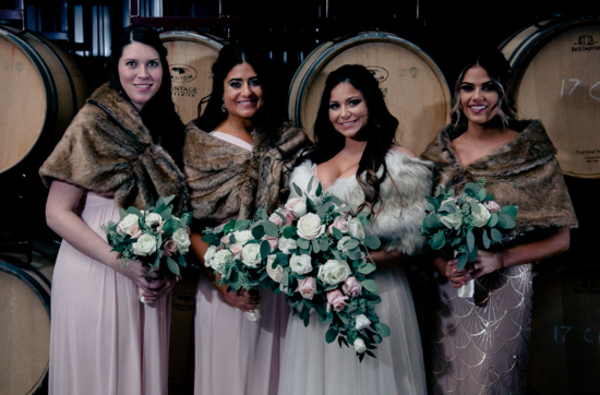 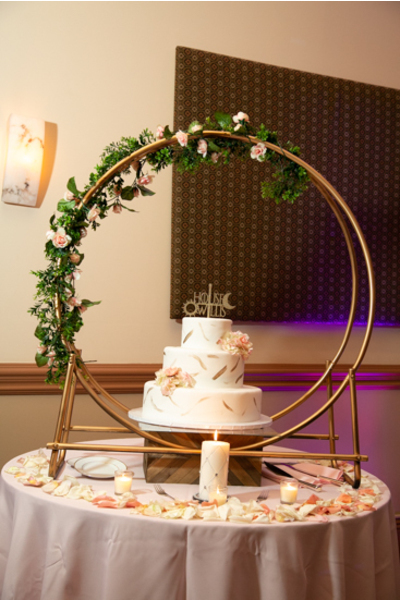 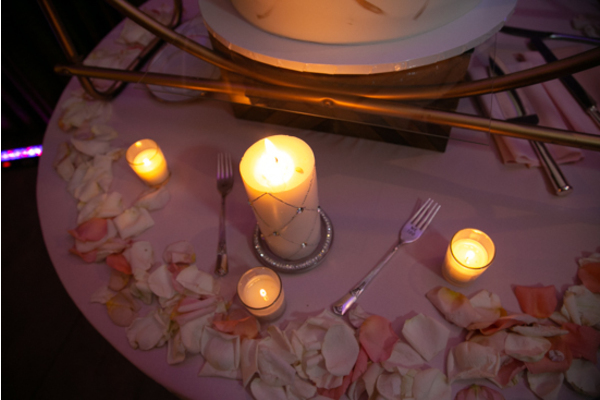 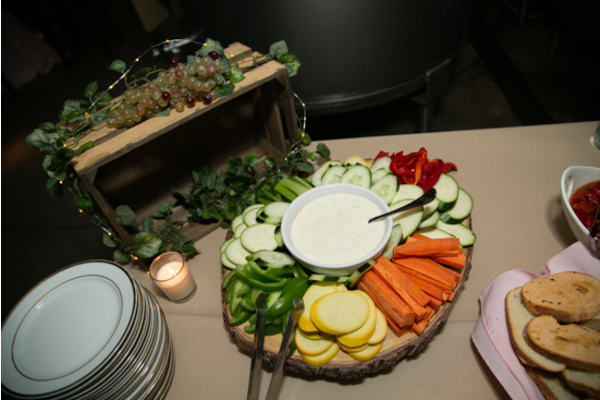 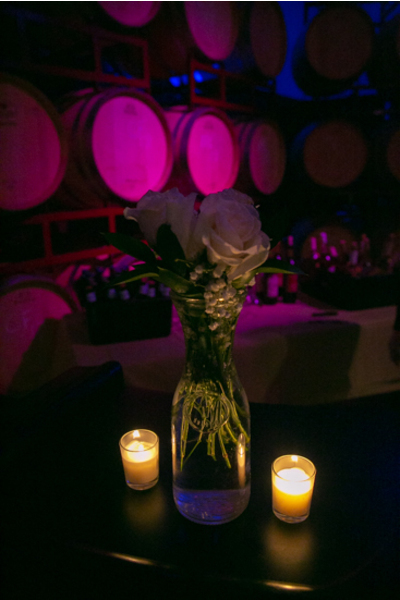 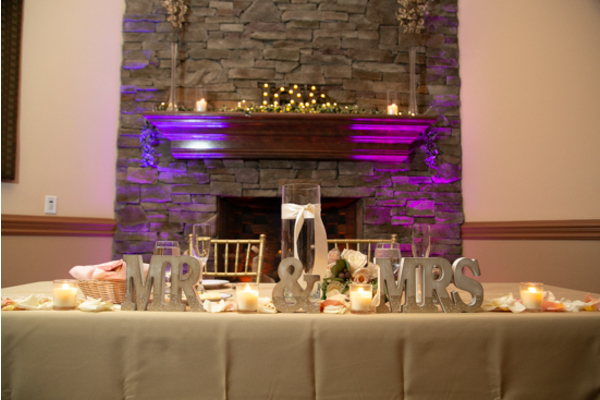 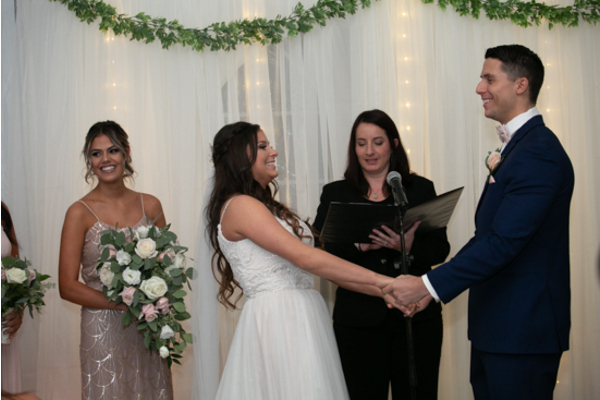 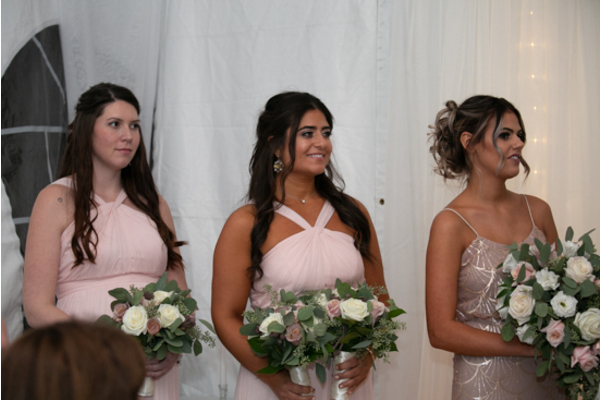 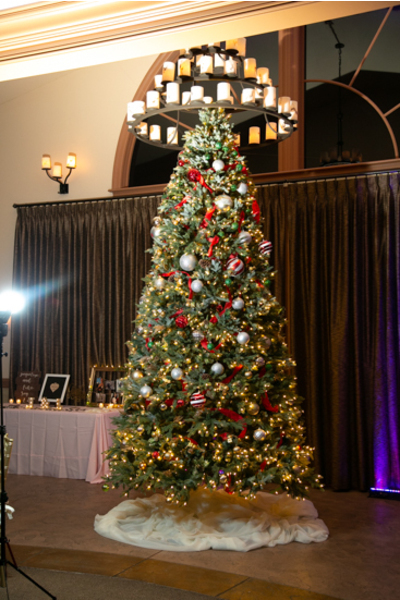 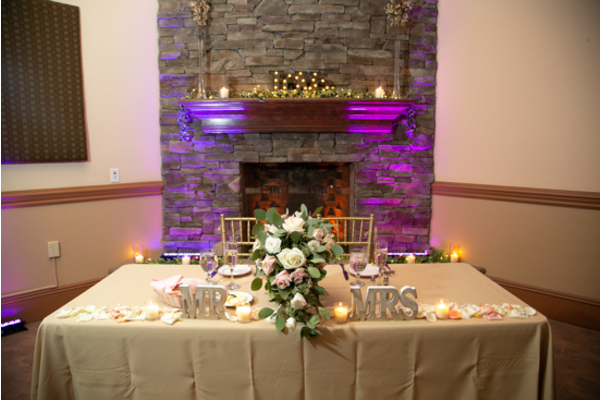 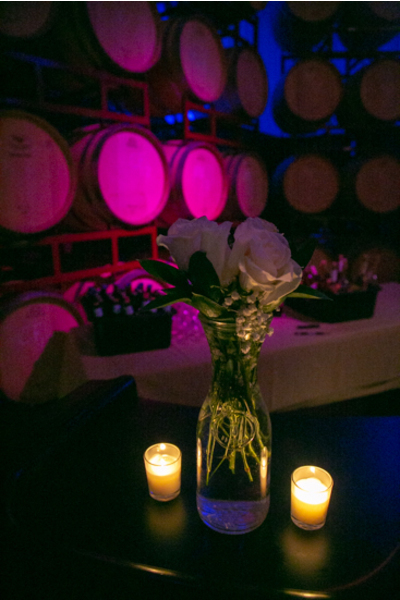 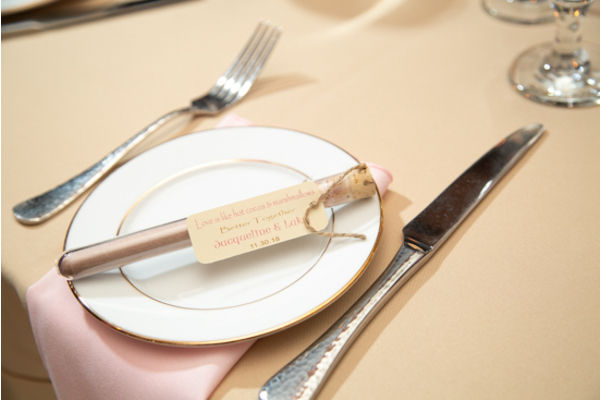 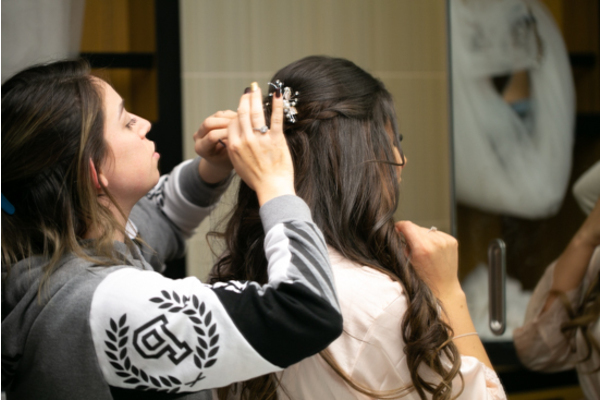 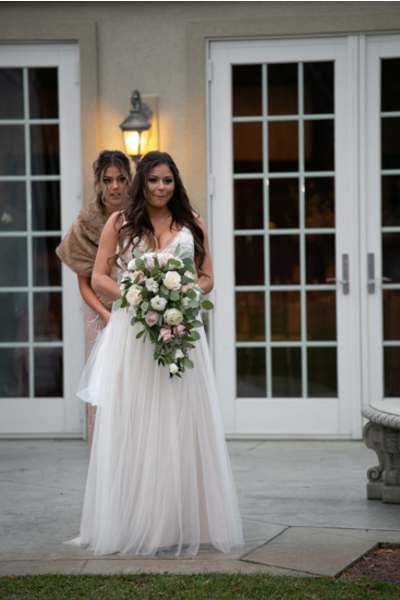 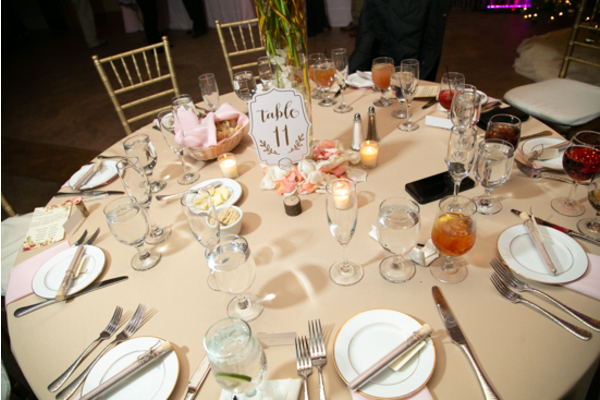 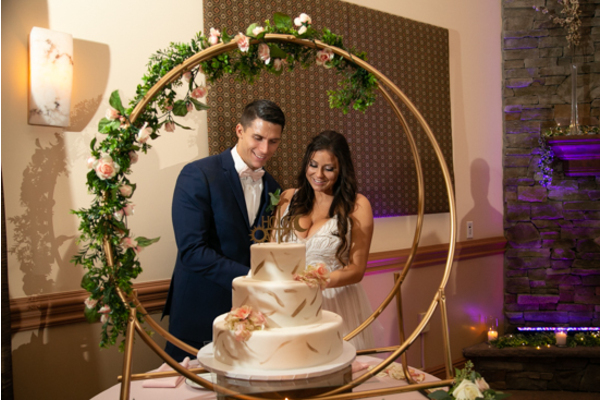 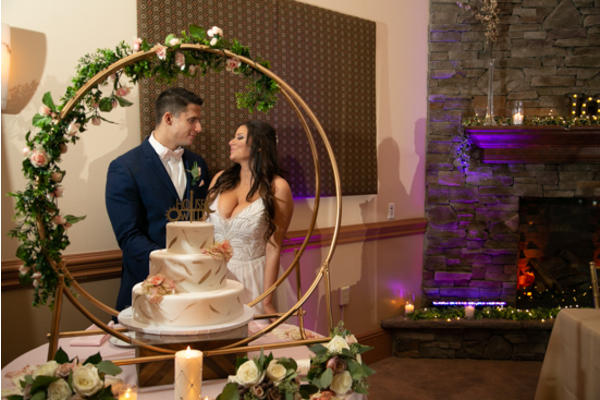 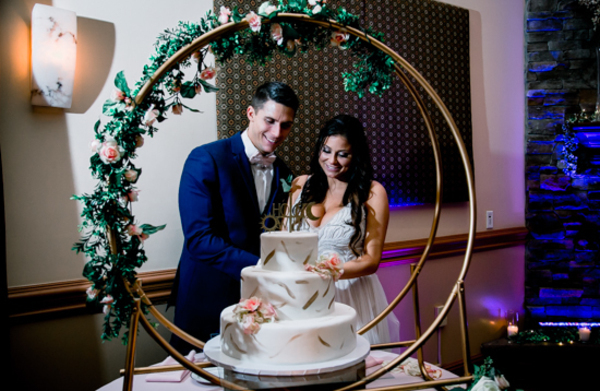 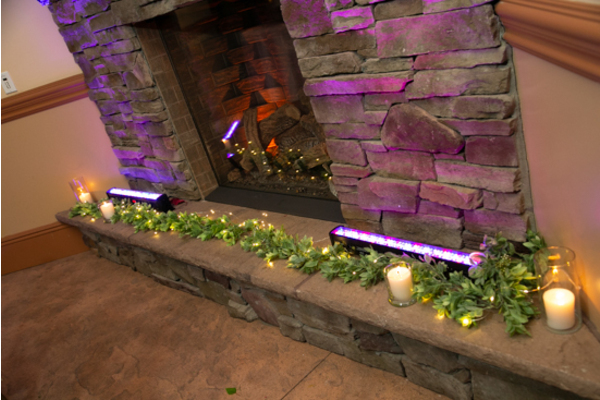 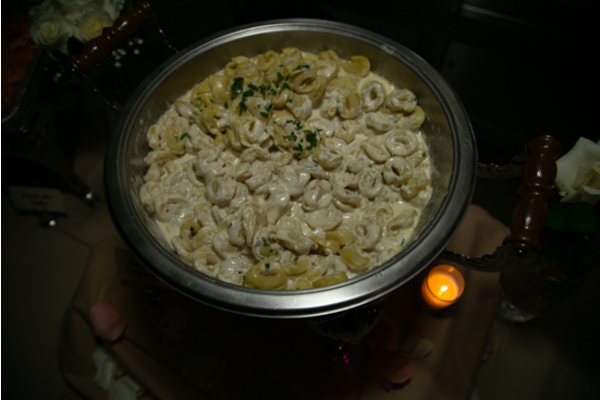 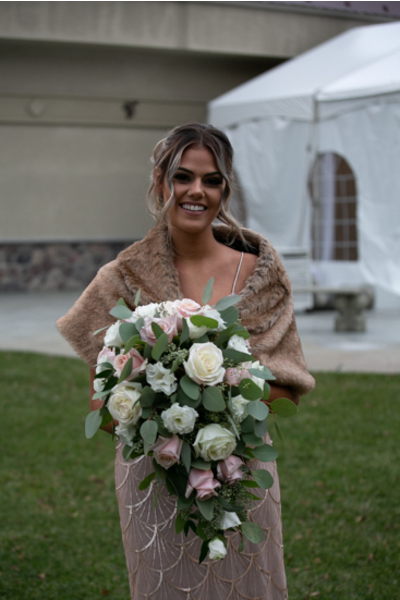 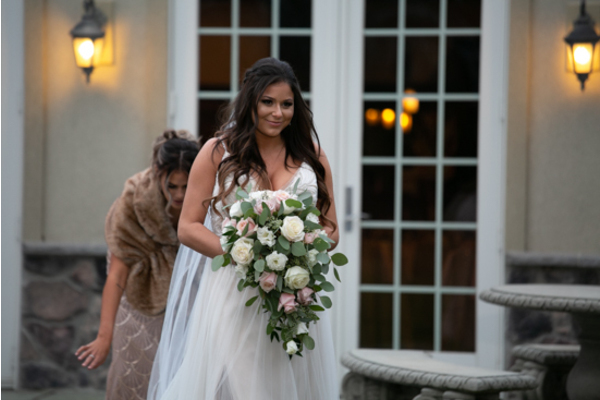 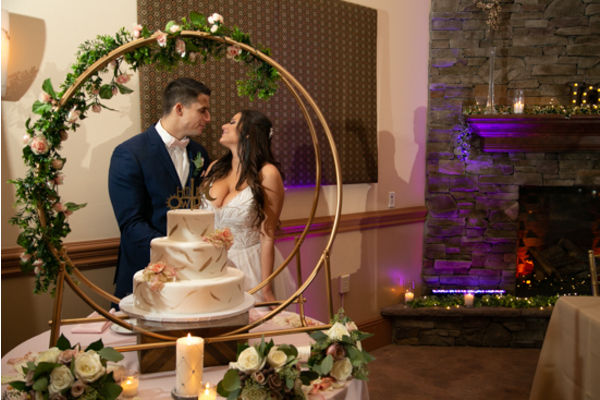 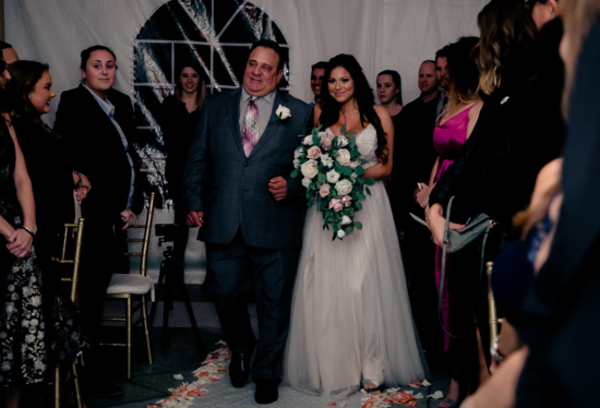 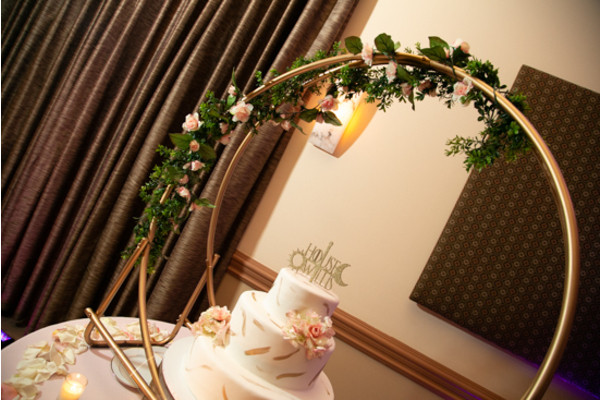 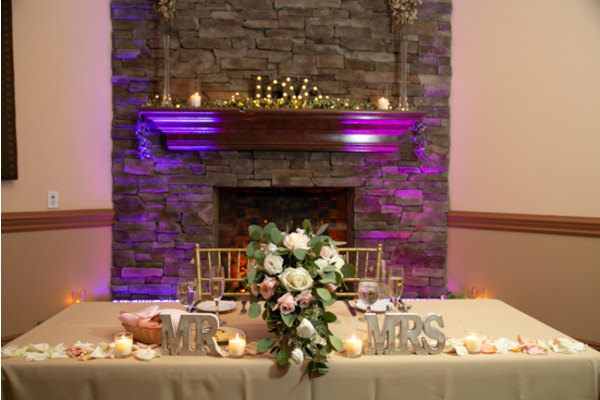 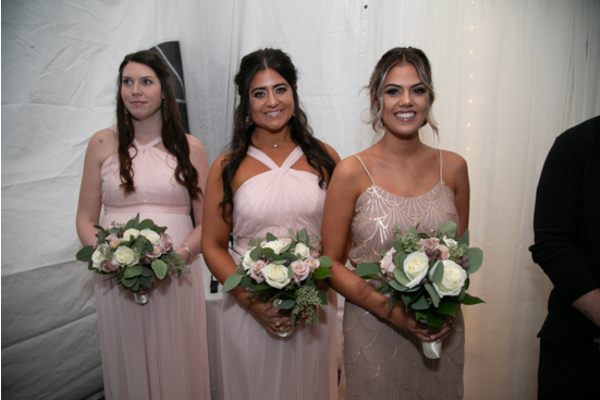 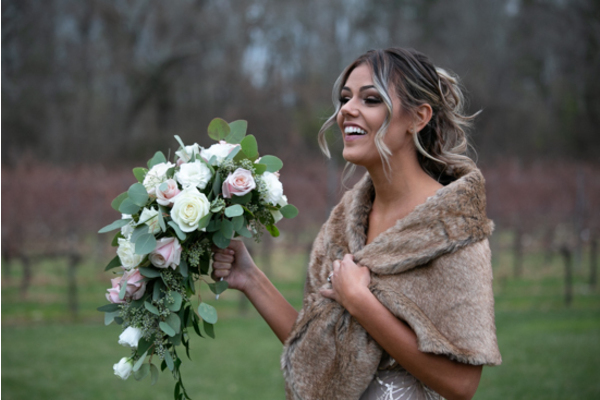 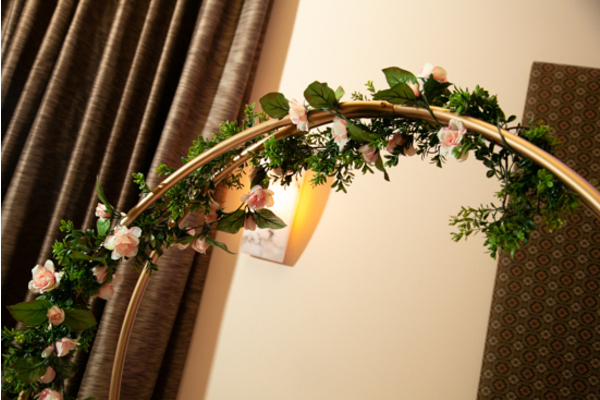 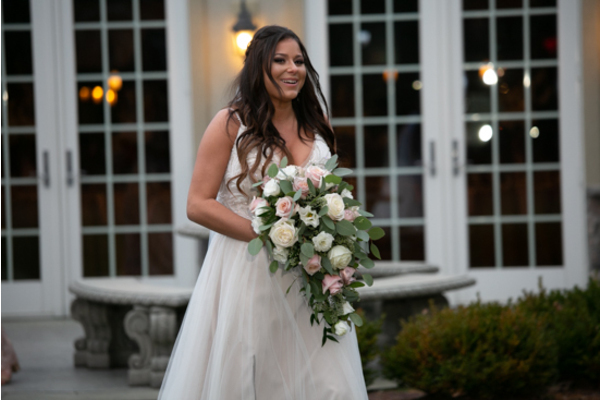 The venue was decorated with white, pink and lilac flowers that perfectly matched Jackie’s colors. 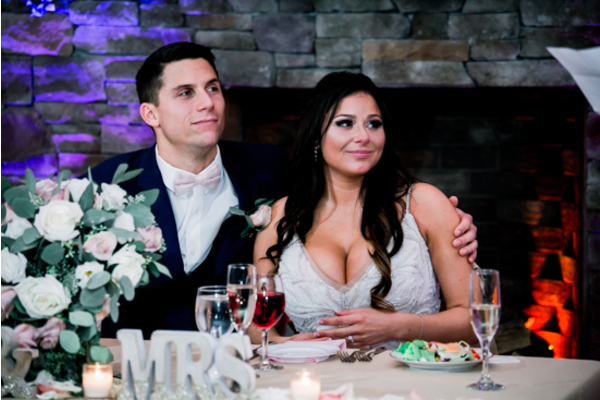 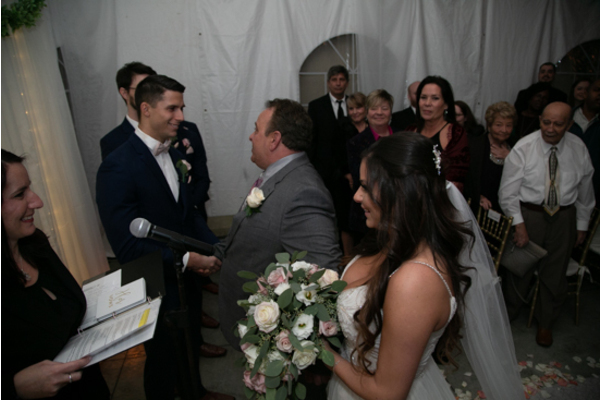 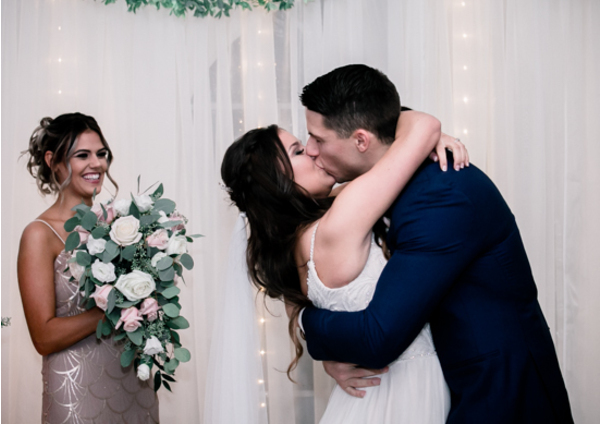 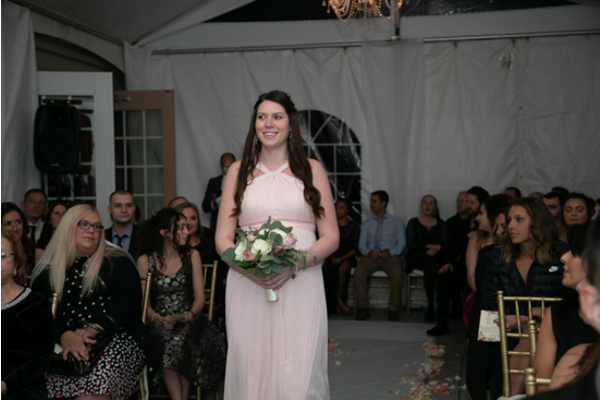 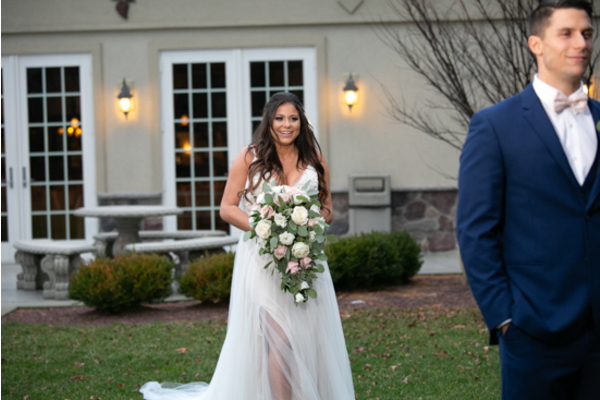 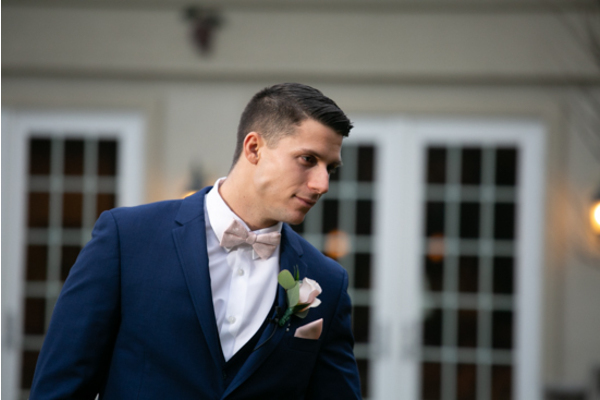 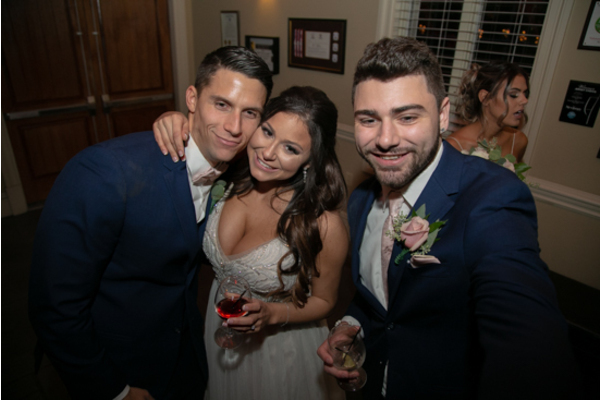 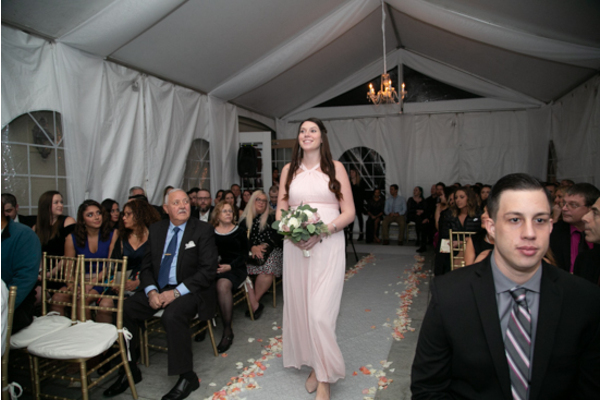 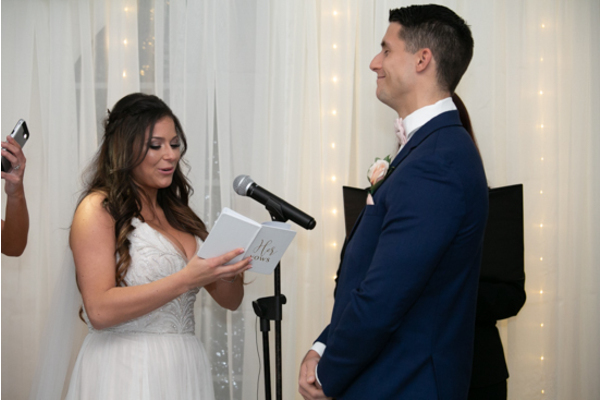 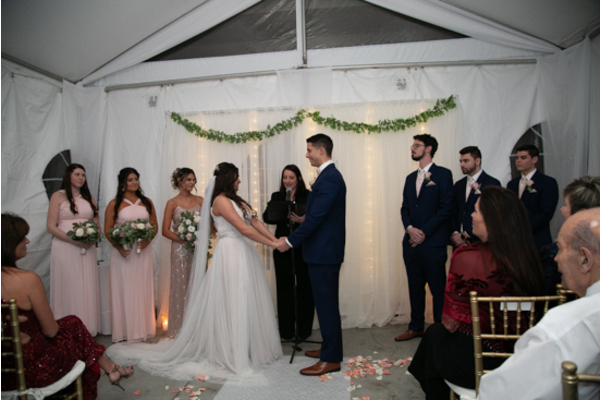 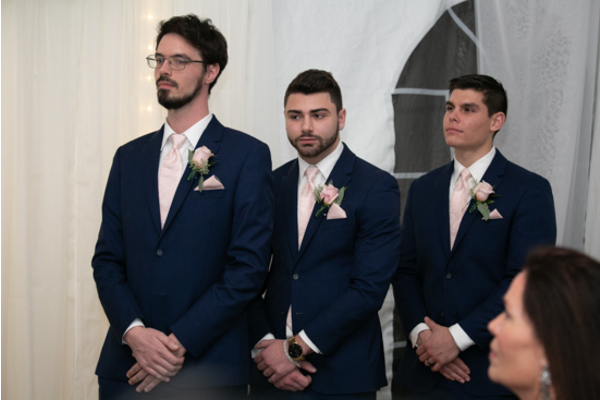 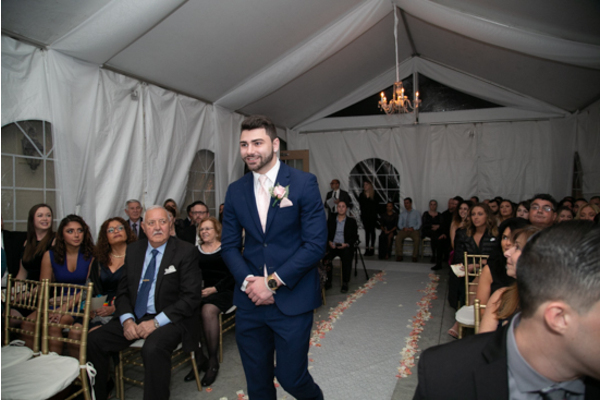 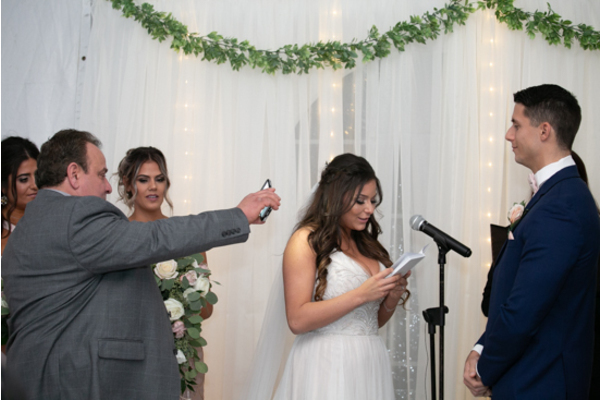 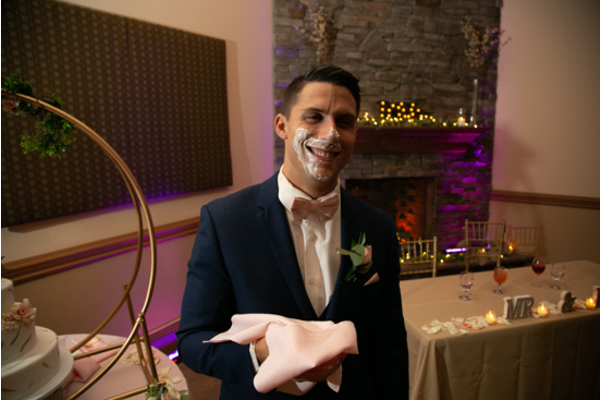 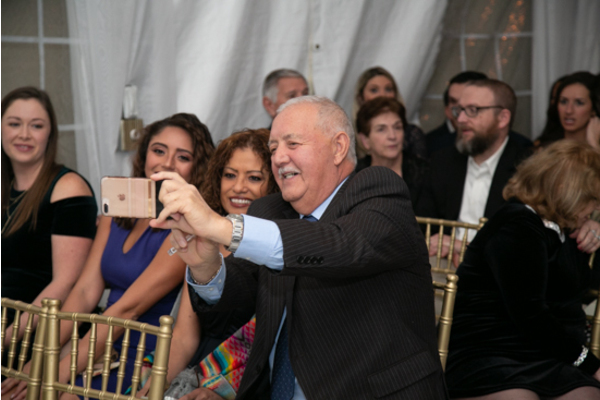 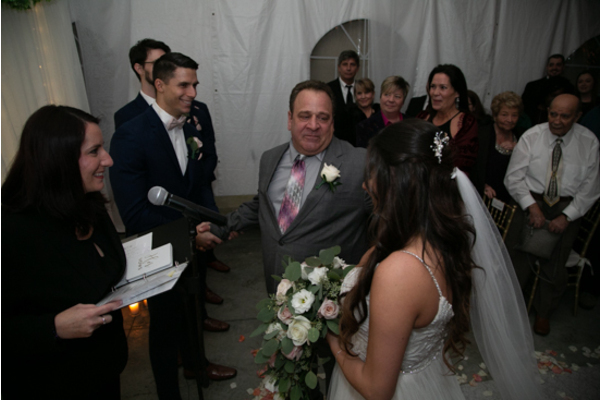 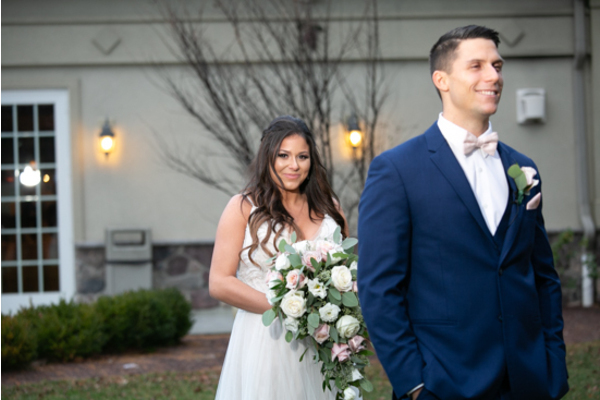 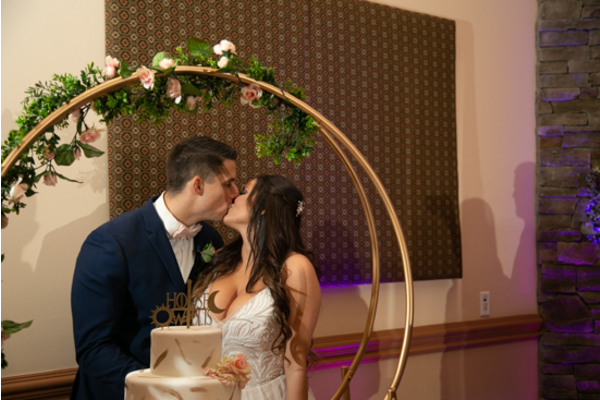 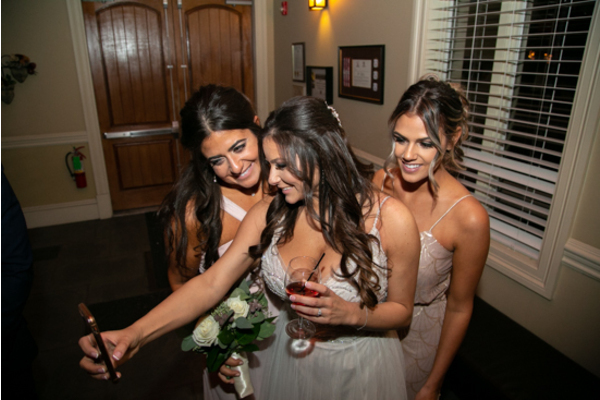 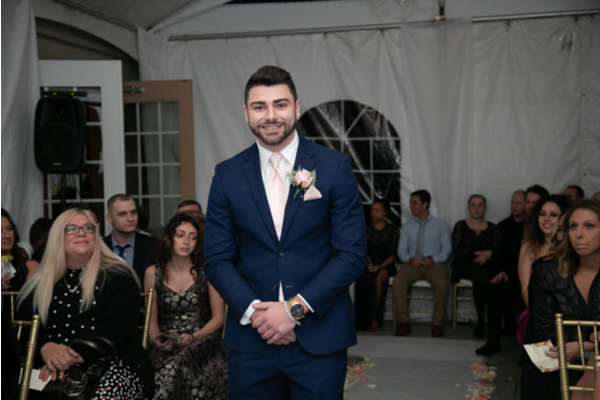 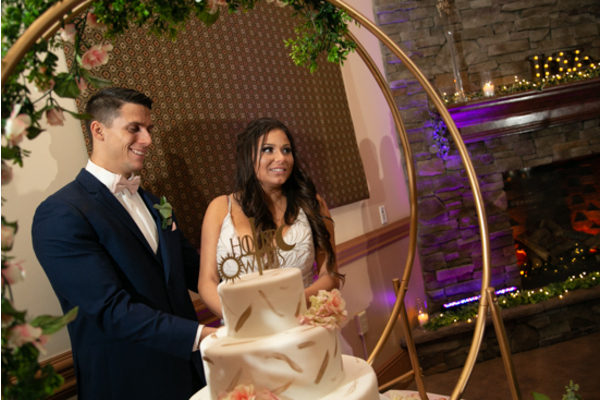 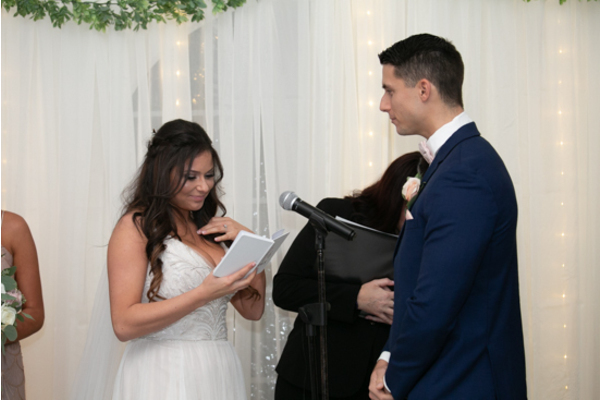 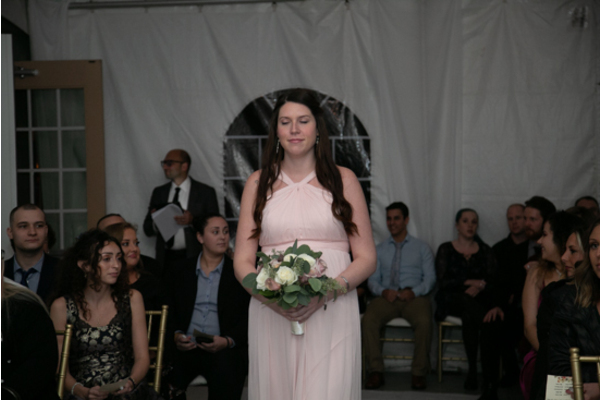 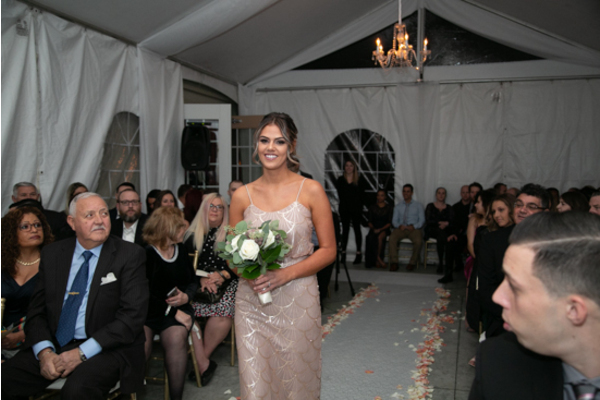 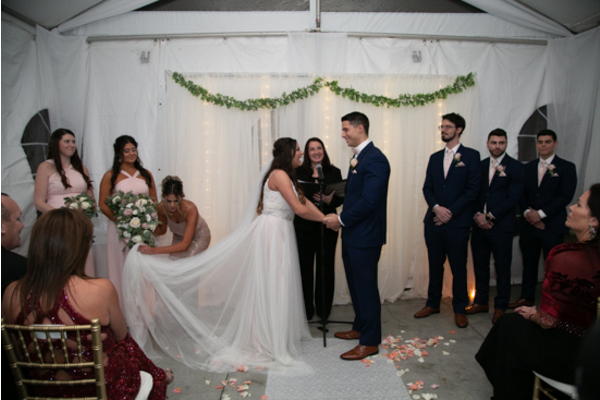 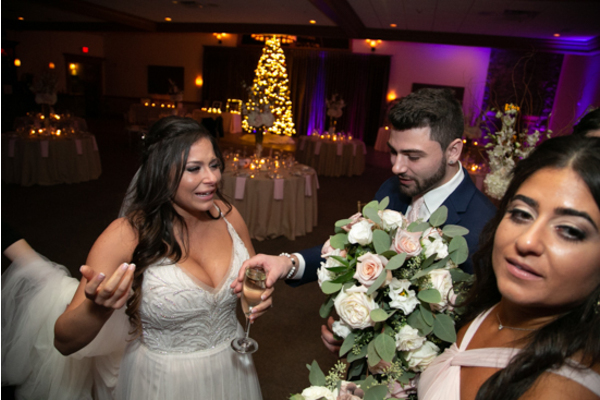 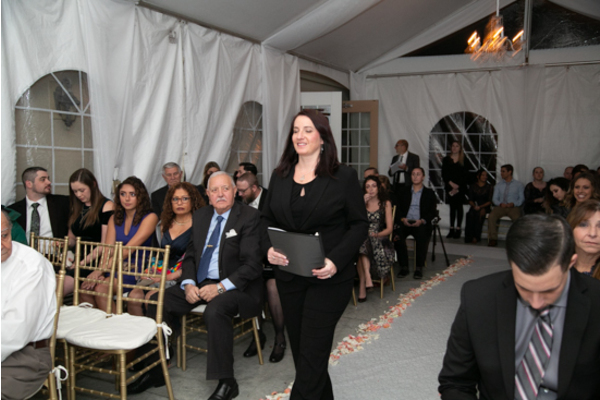 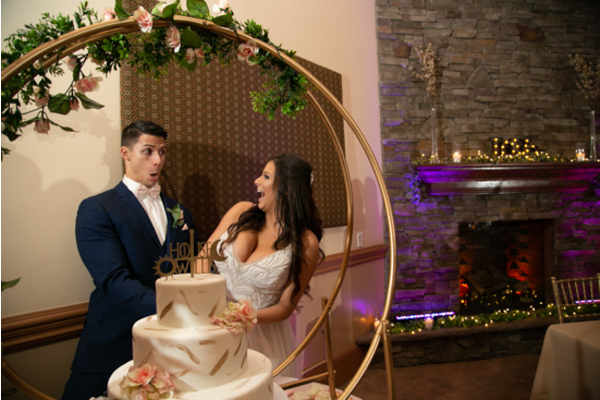 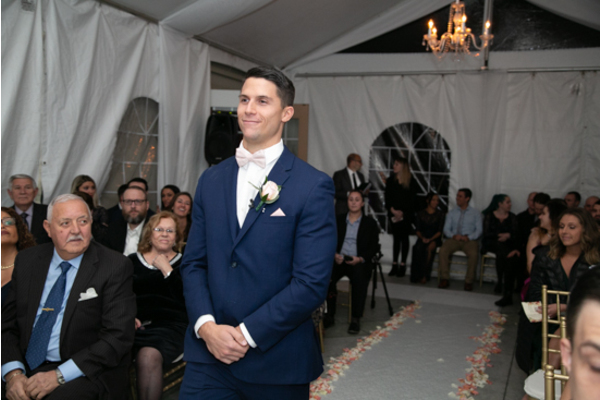 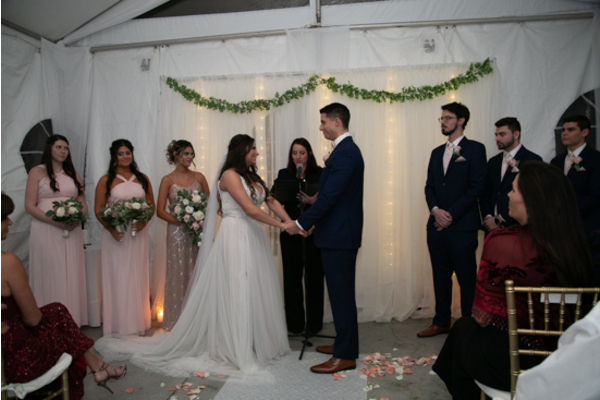 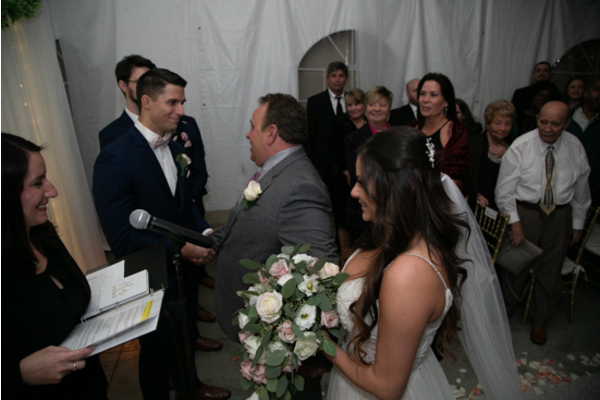 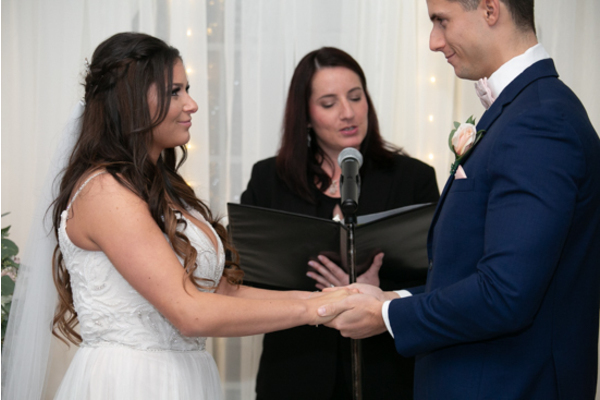 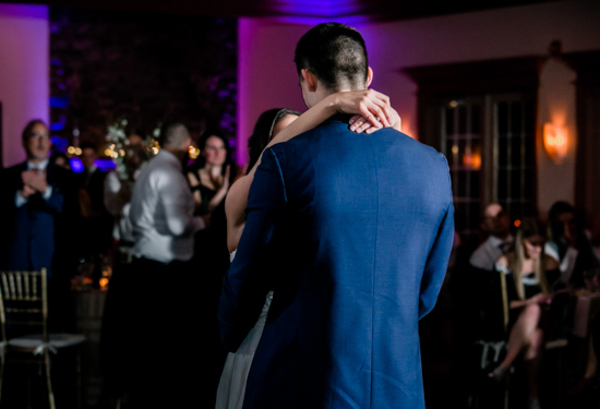 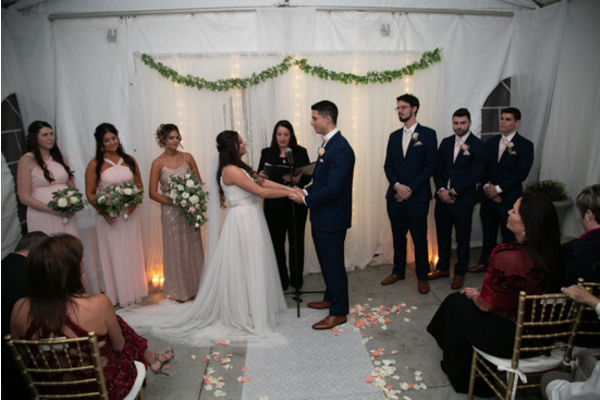 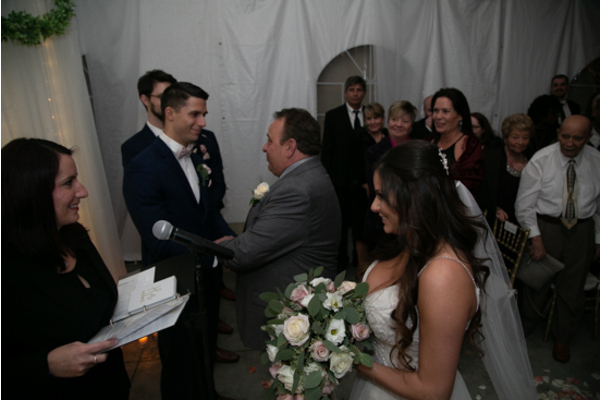 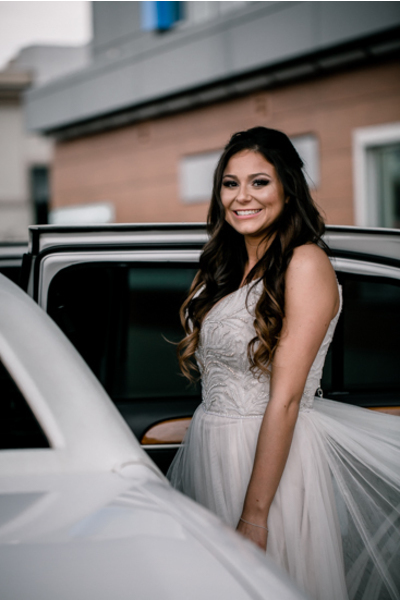 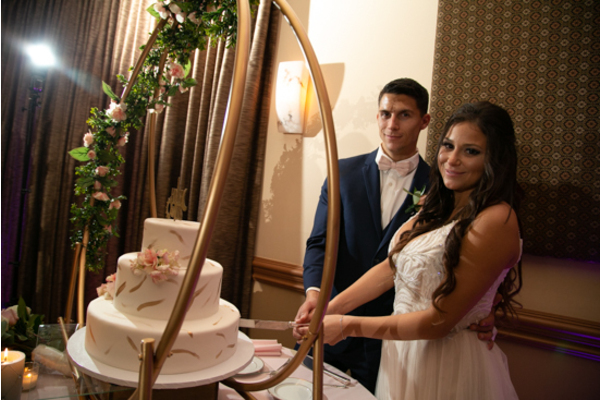 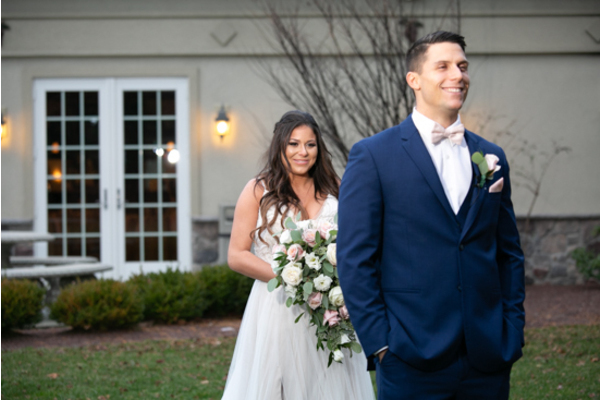 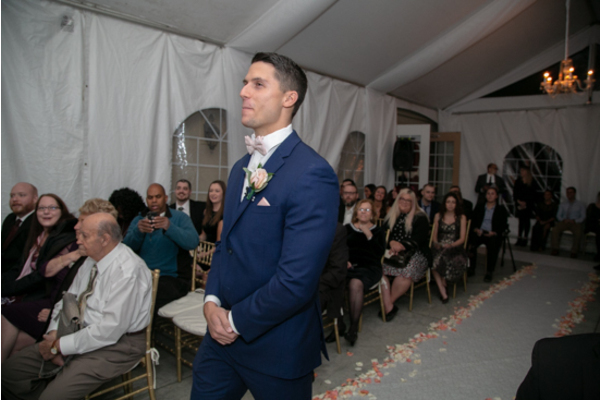 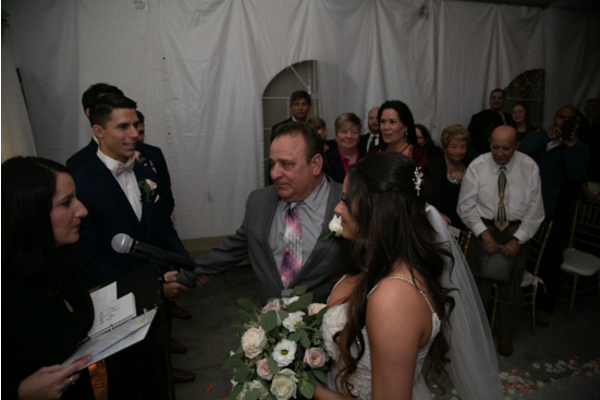 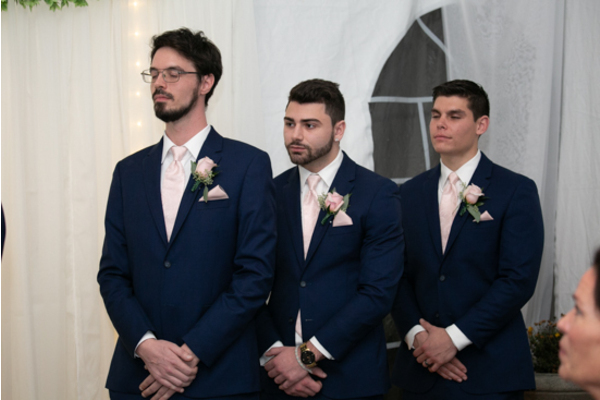 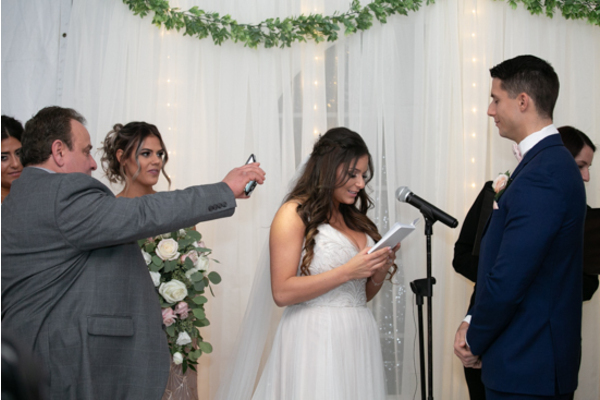 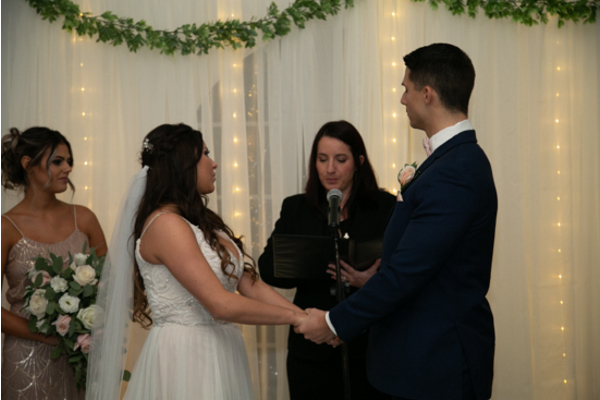 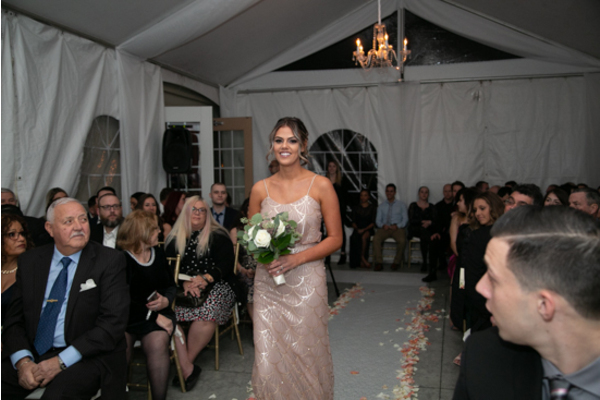 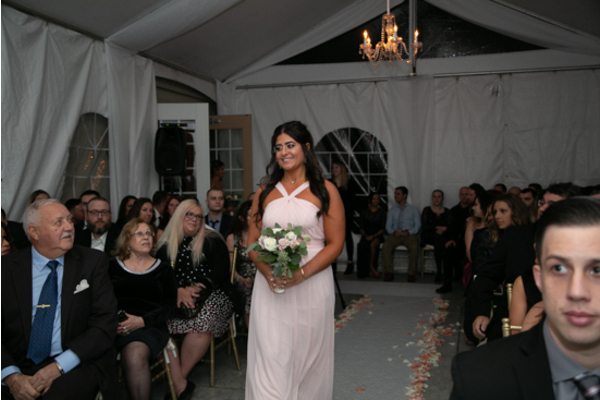 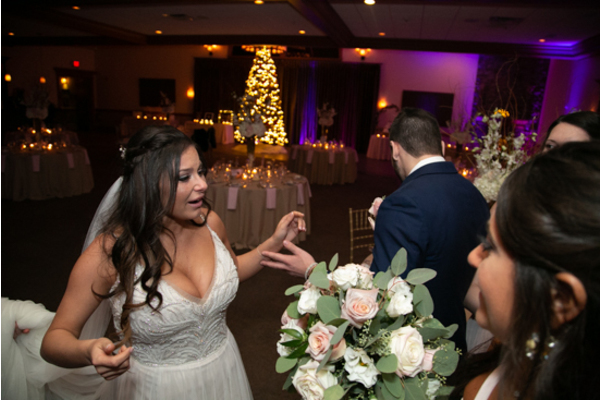 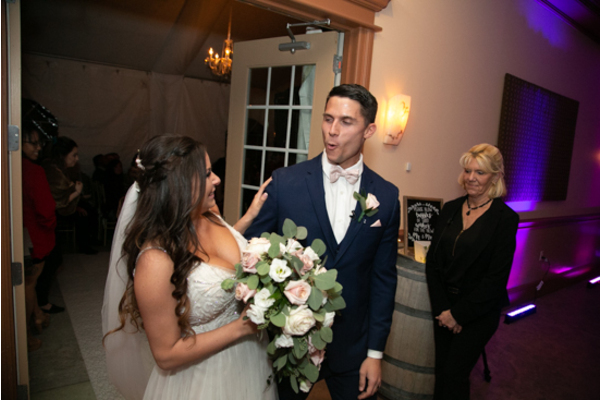 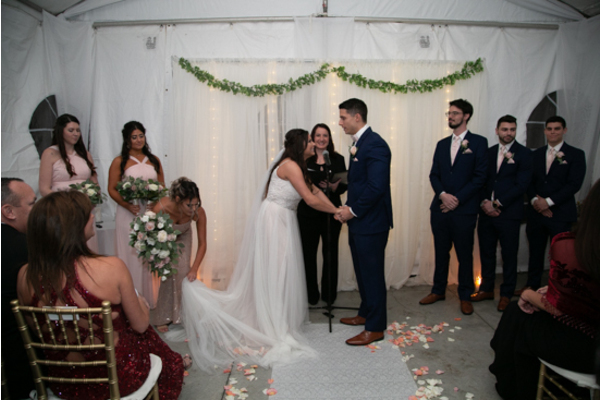 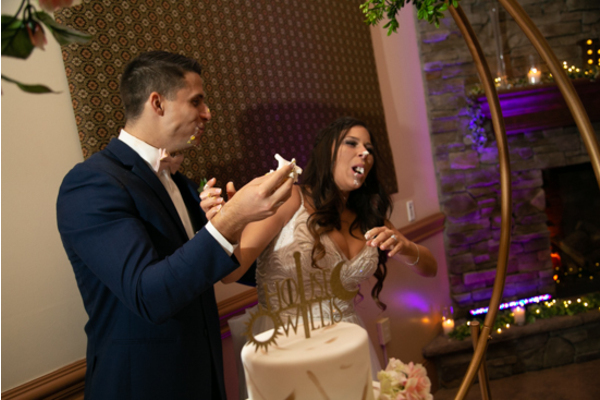 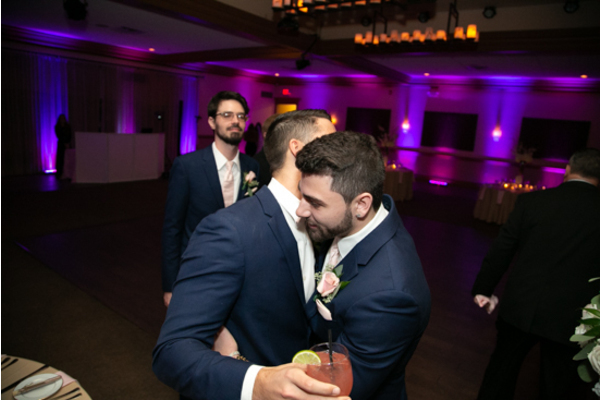 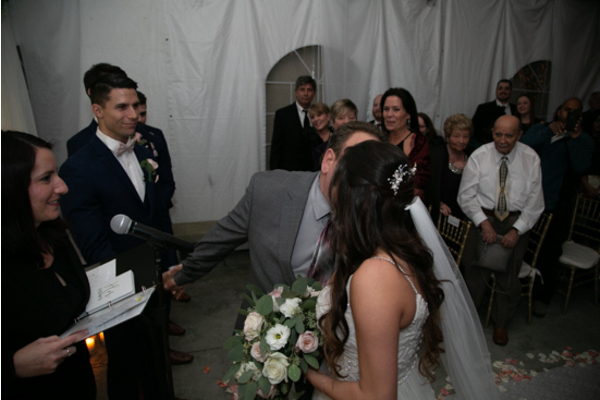 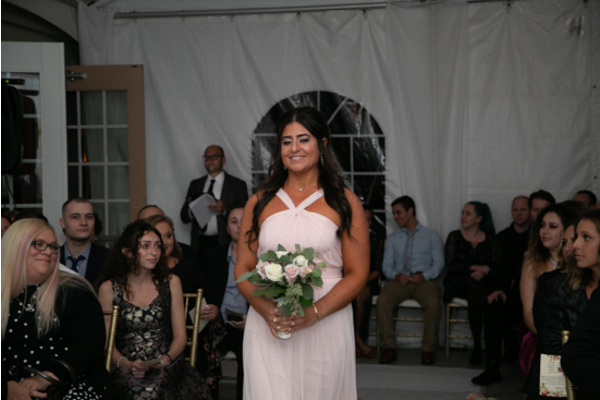 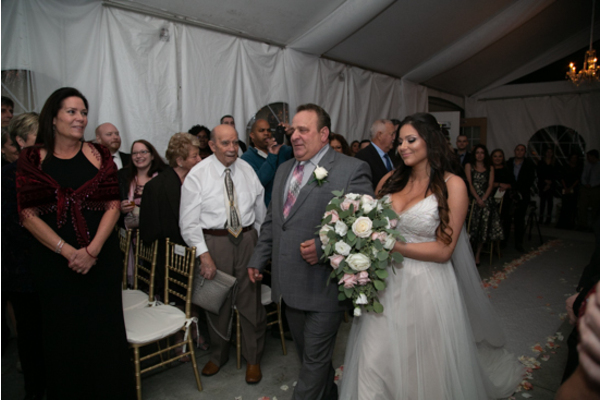 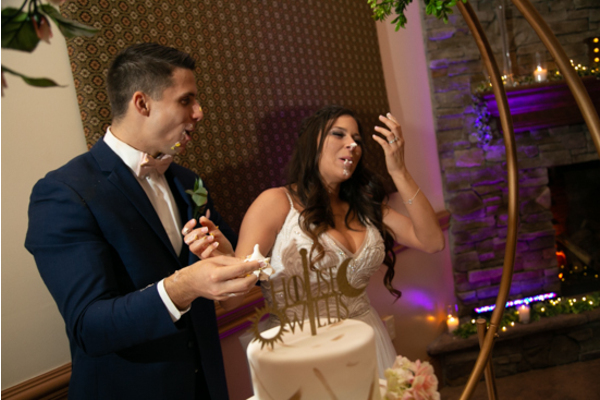 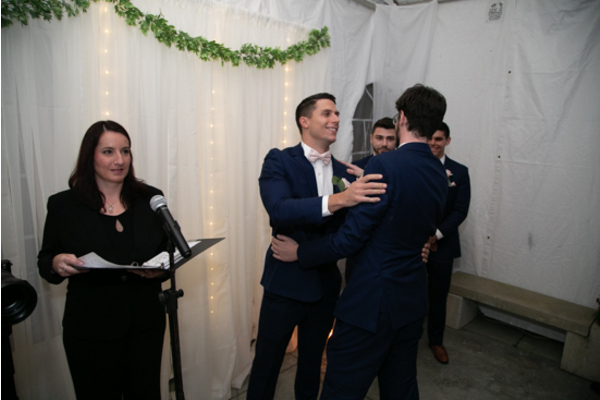 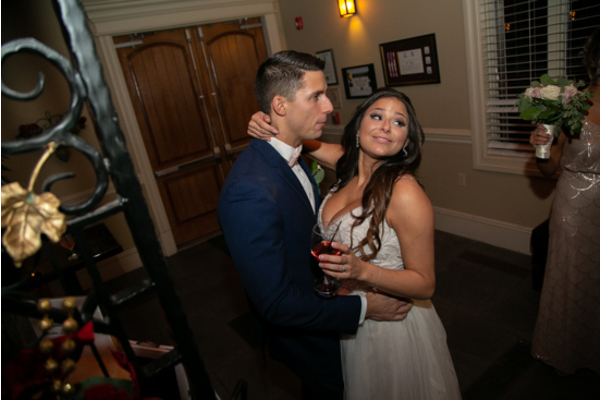 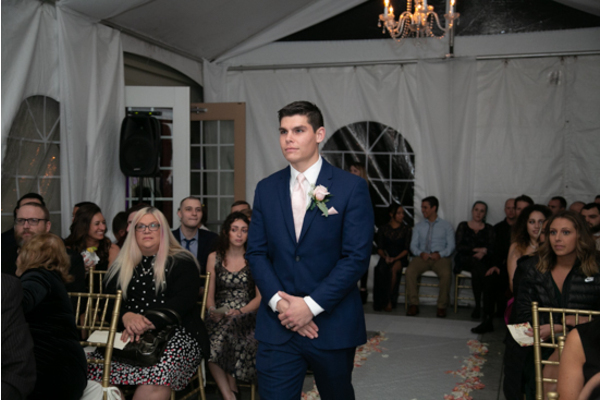 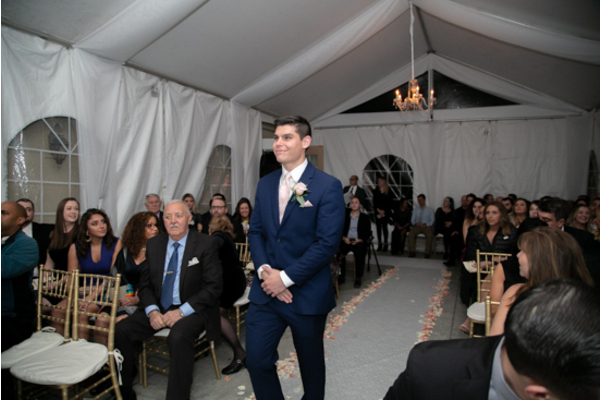 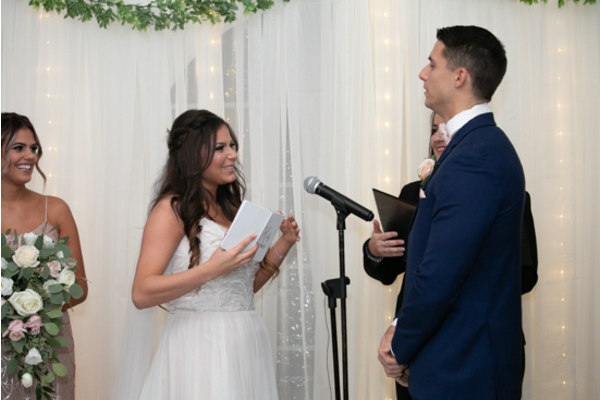 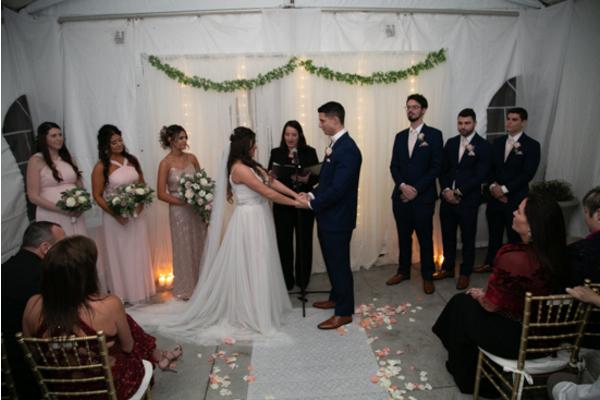 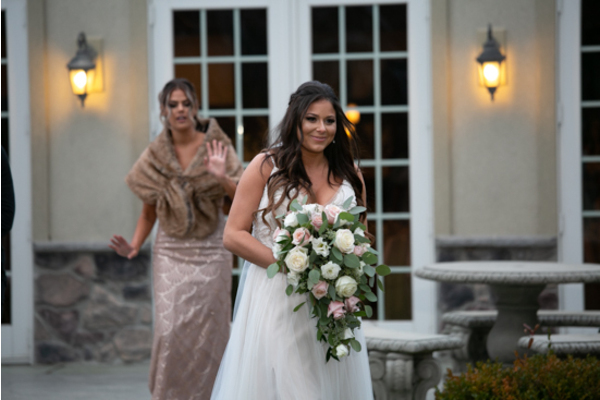 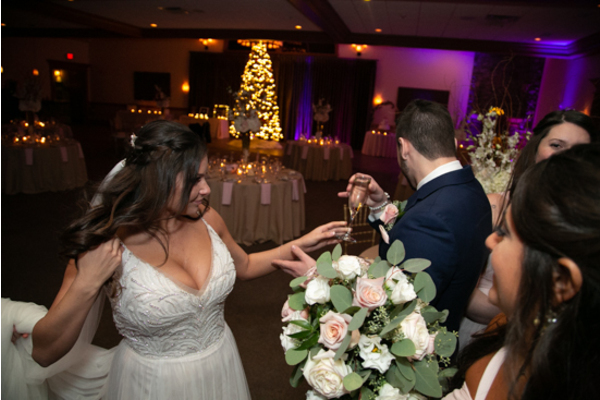 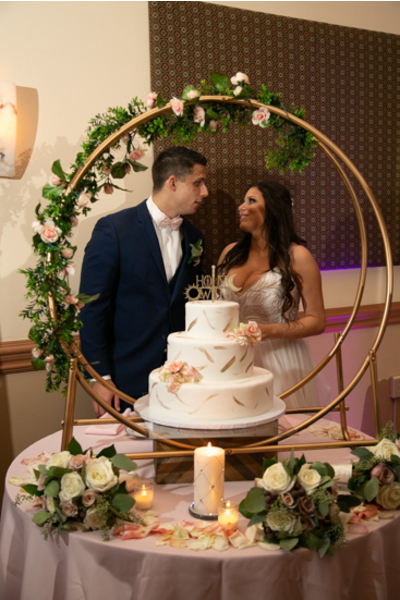 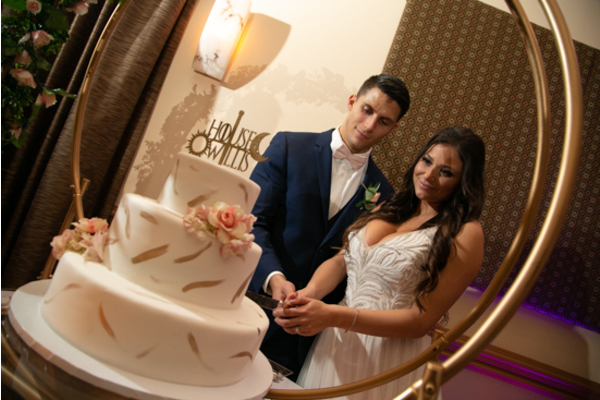 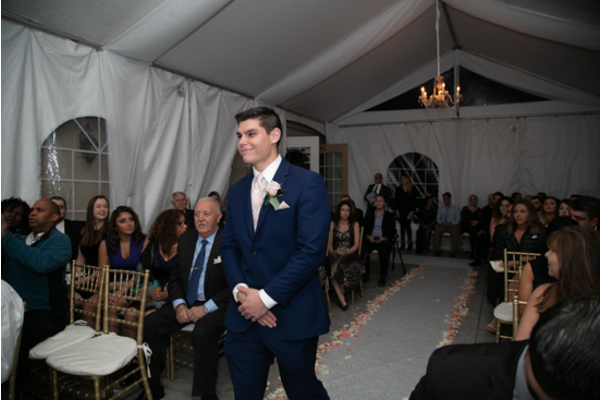 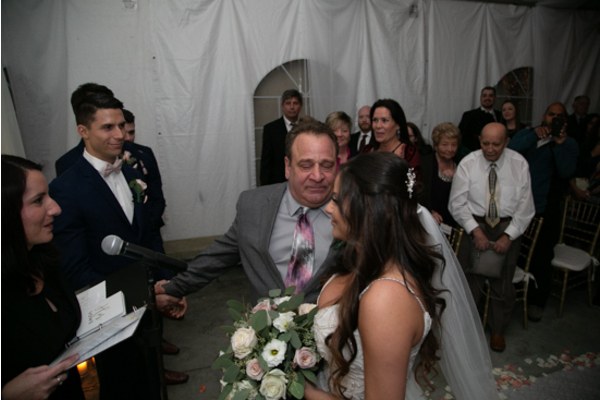 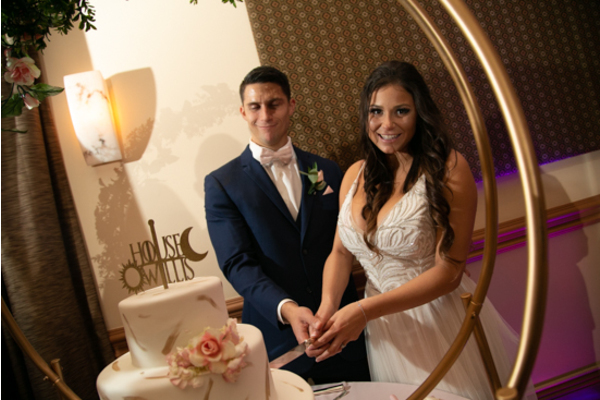 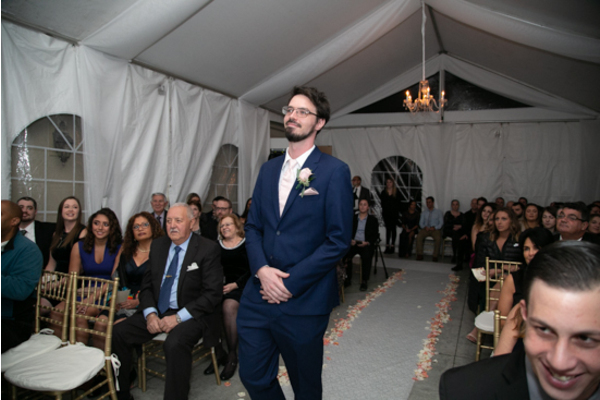 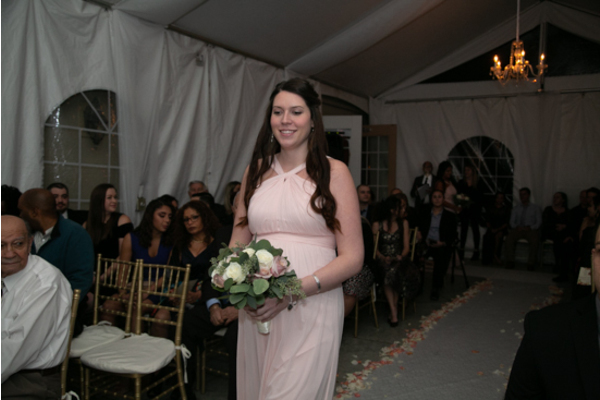 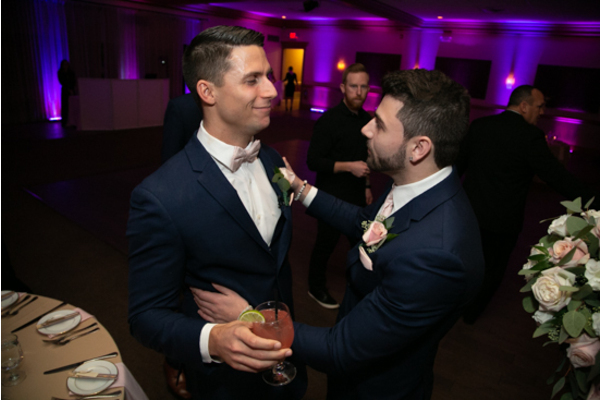 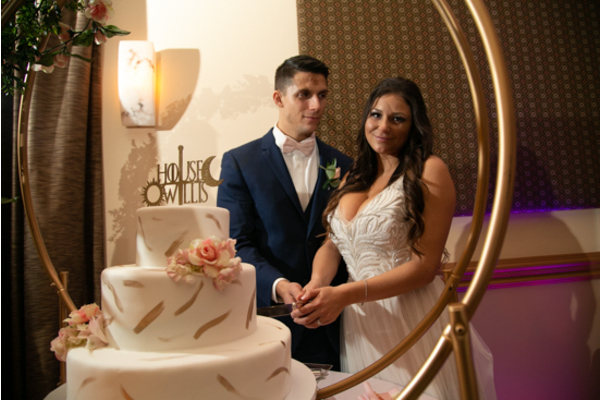 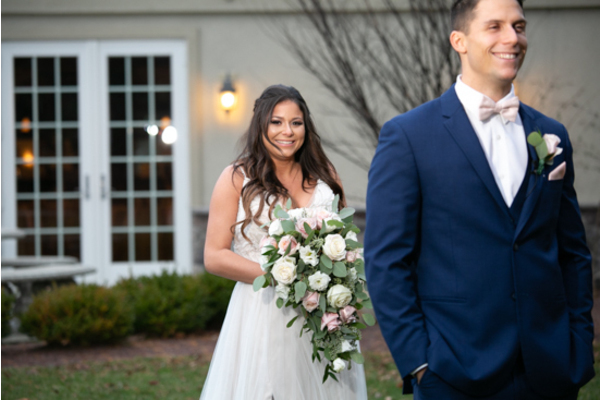 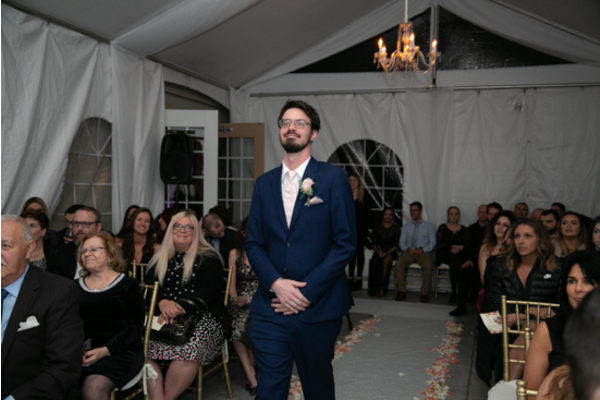 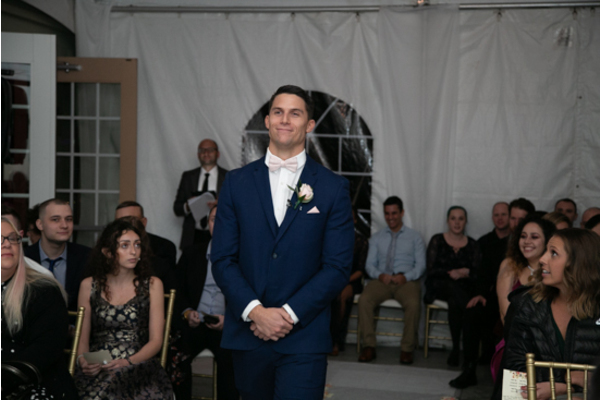 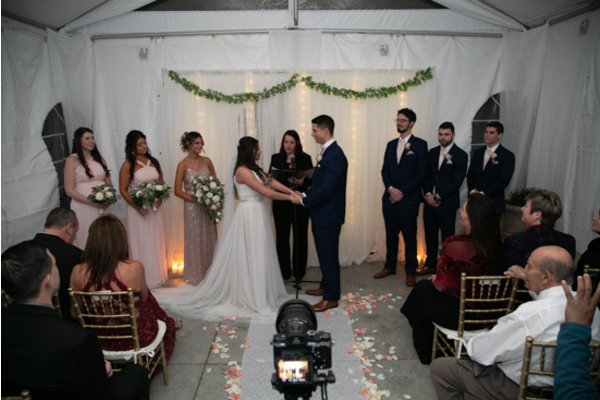 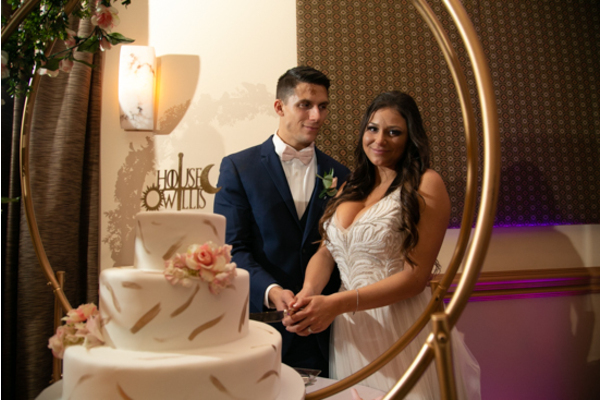 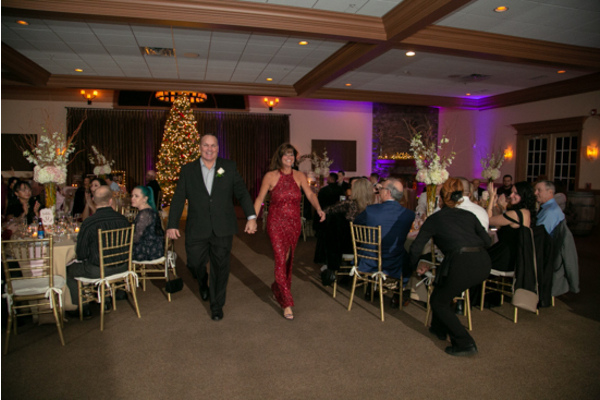 Our NJ Wedding Videographer recorded the crowd’s reaction as Jackie made her way into the room. 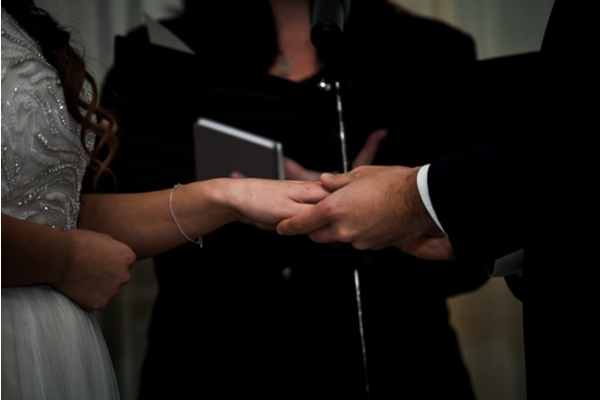 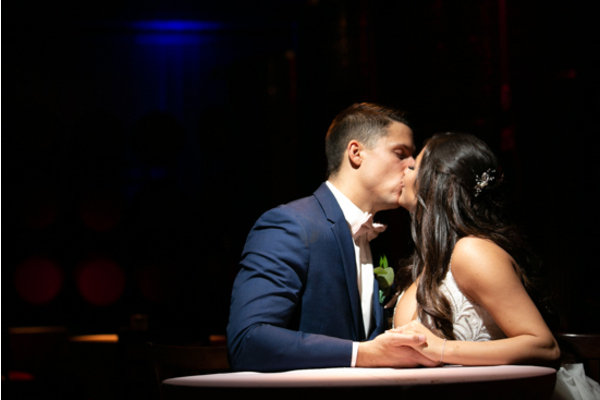 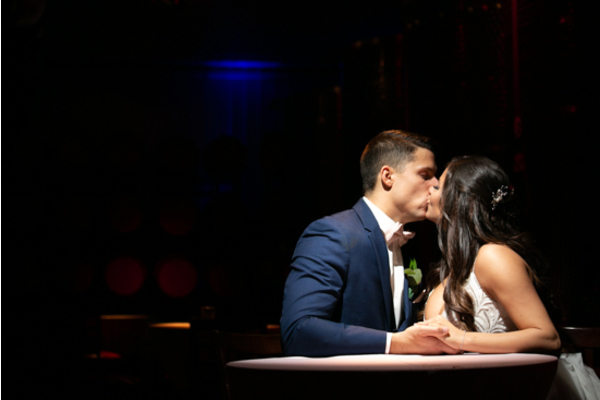 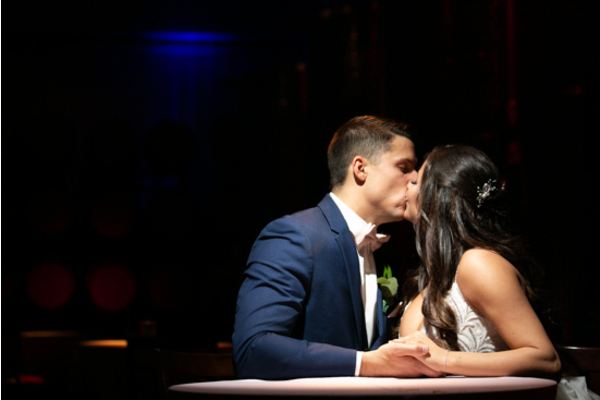 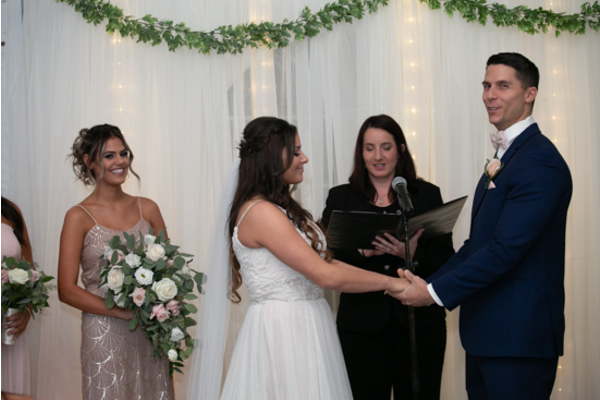 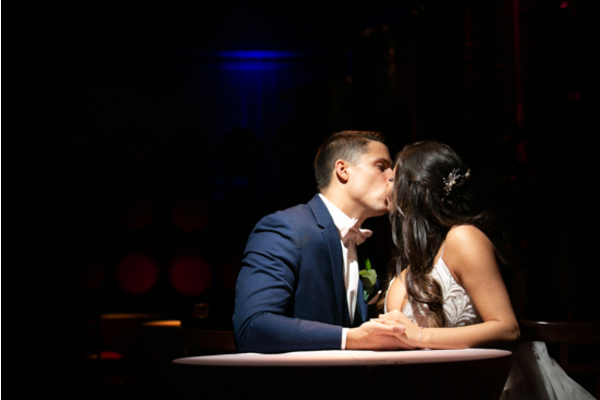 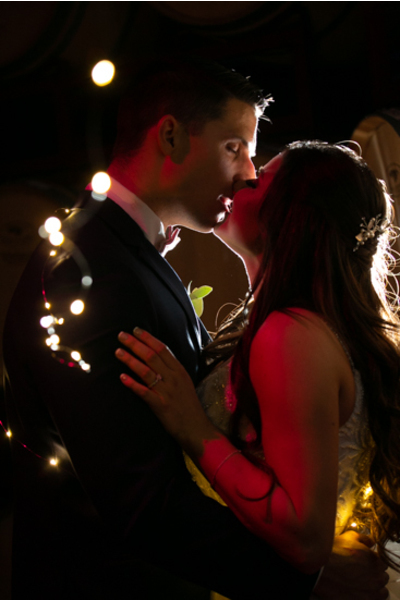 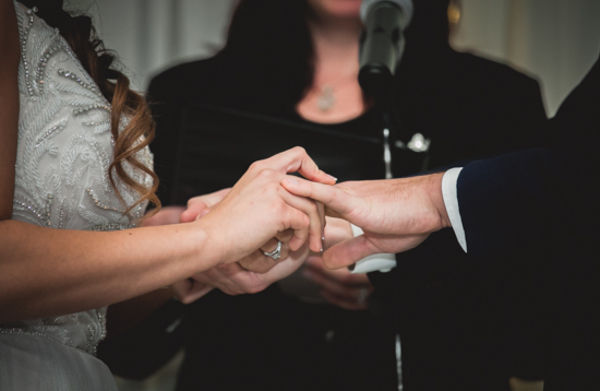 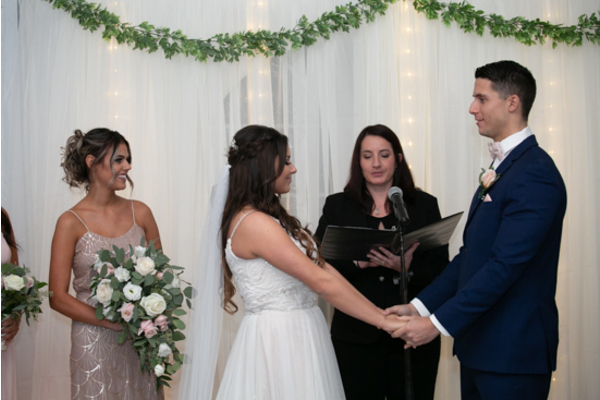 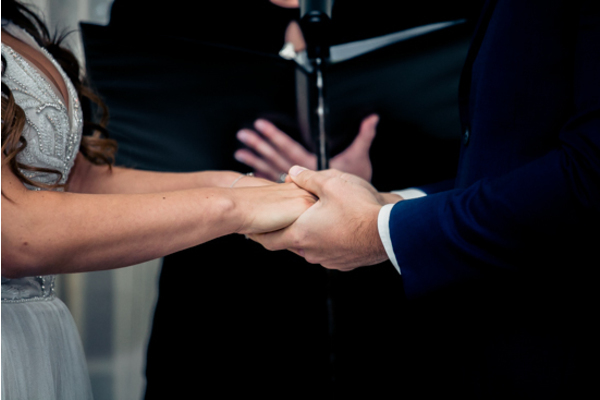 The couple recited their vows, and sealed them with a kiss. 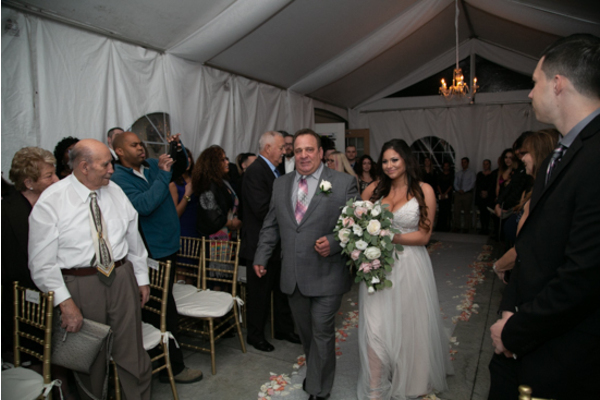 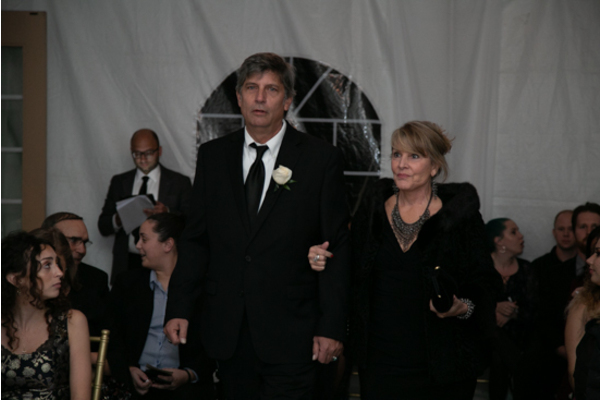 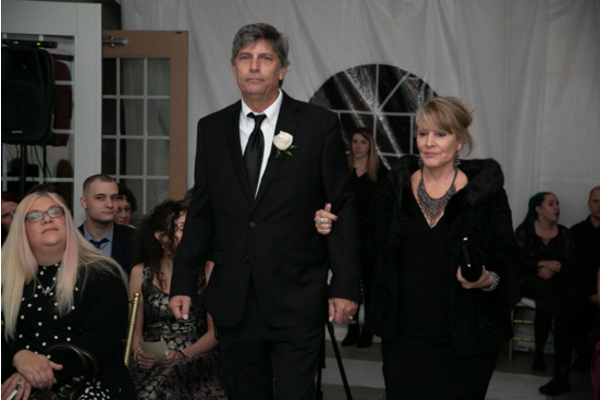 Making their way back down the aisle hand in hand,. 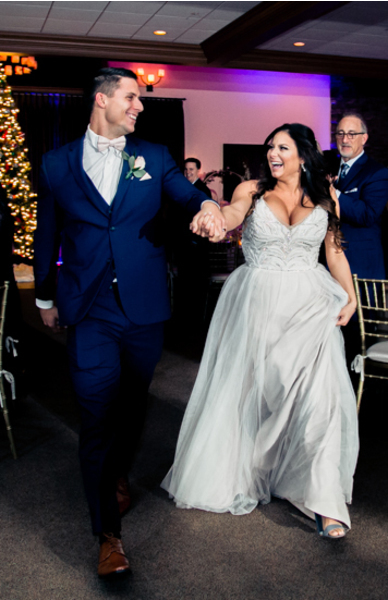 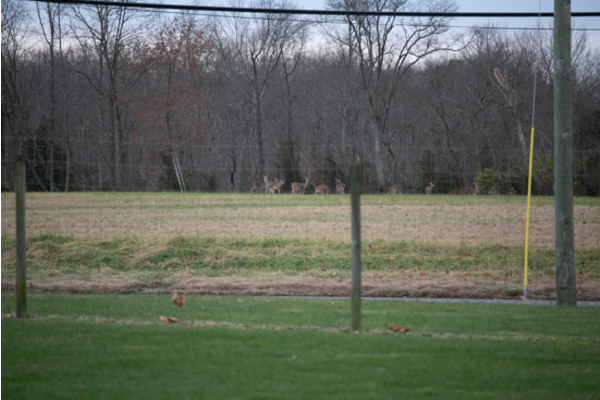 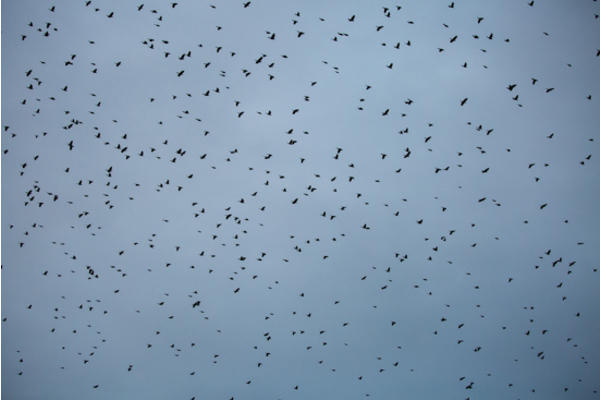 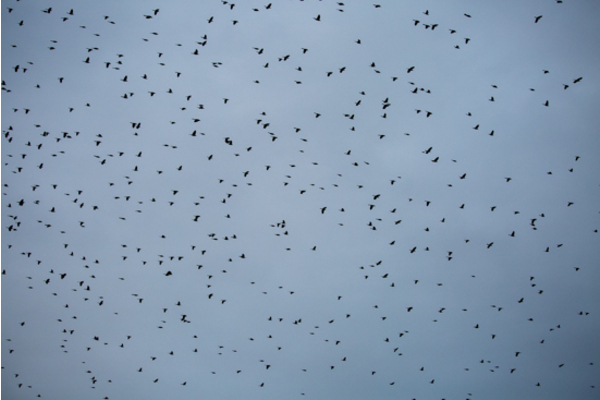 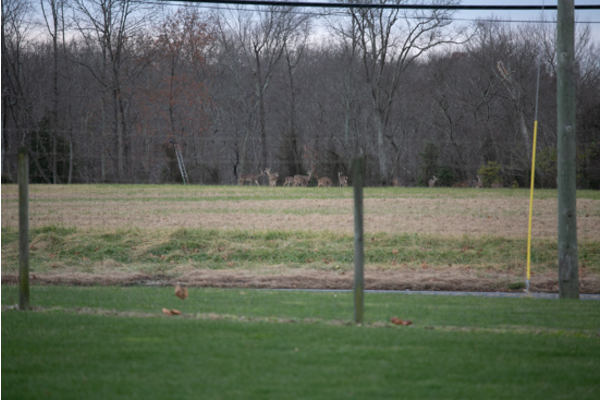 they were off to continue the festivities! 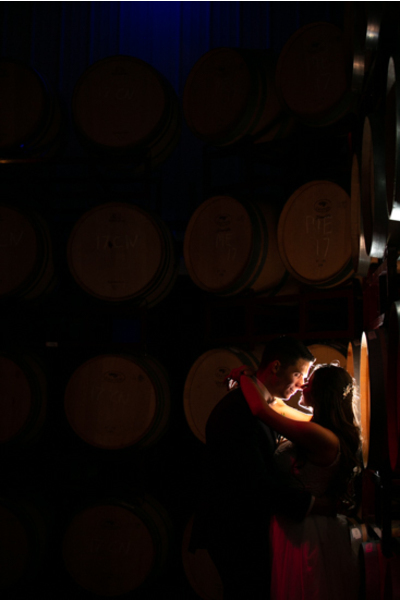 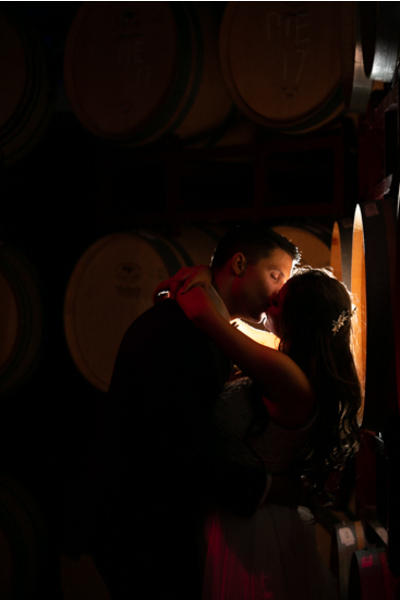 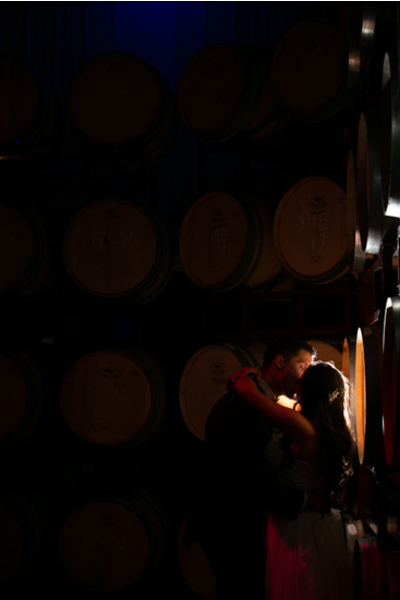 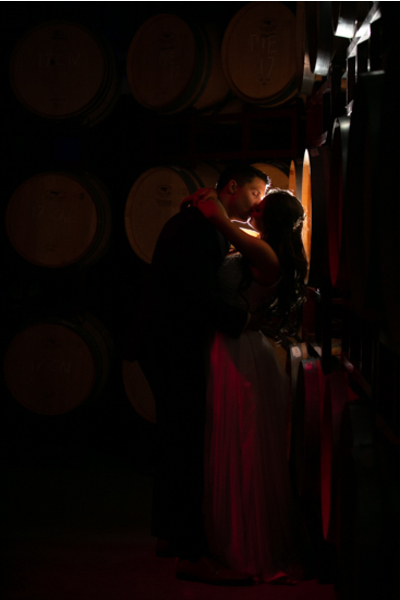 Before making their way to the reception venue, the newlyweds stole a few moments alone back outside at the winery. 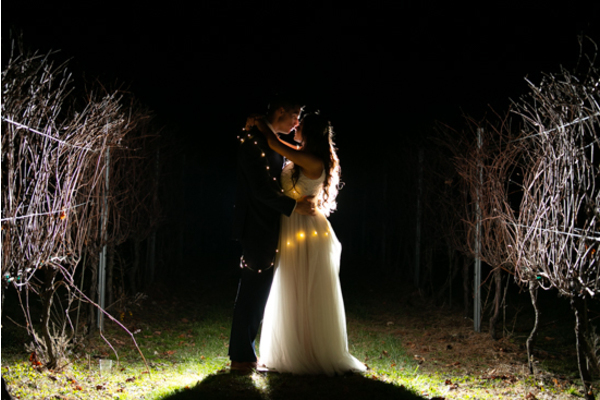 The beautifully illuminated portraits under the moonlight will be cherished forever. 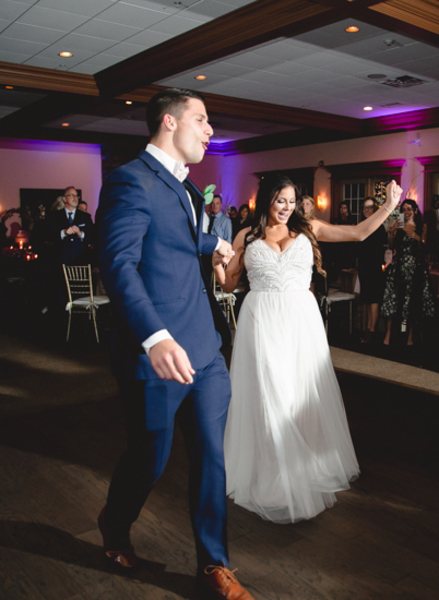 At the reception, guests had a blast watching the Jackie and Luke’s first dance. 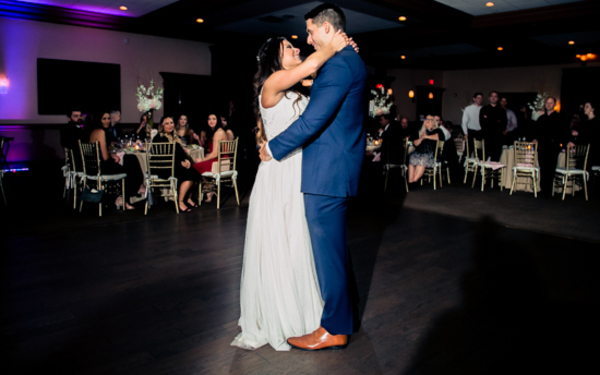 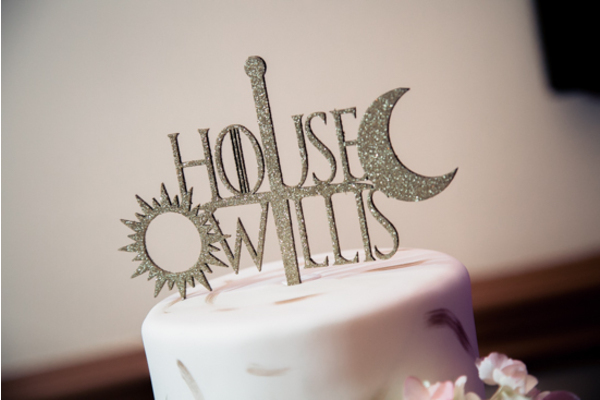 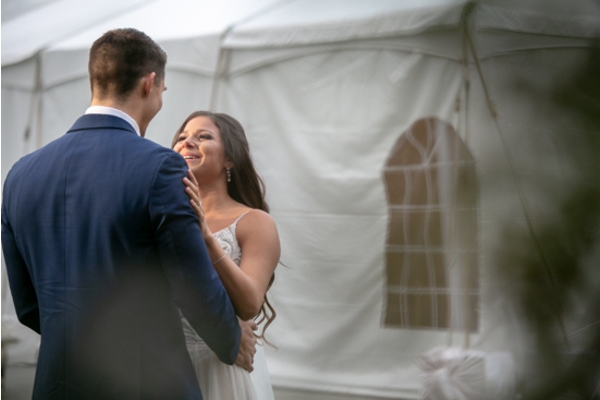 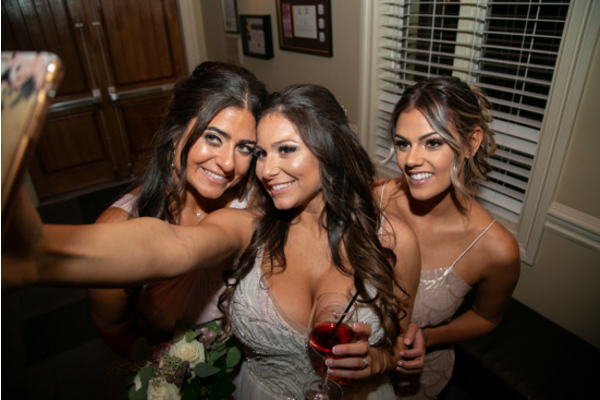 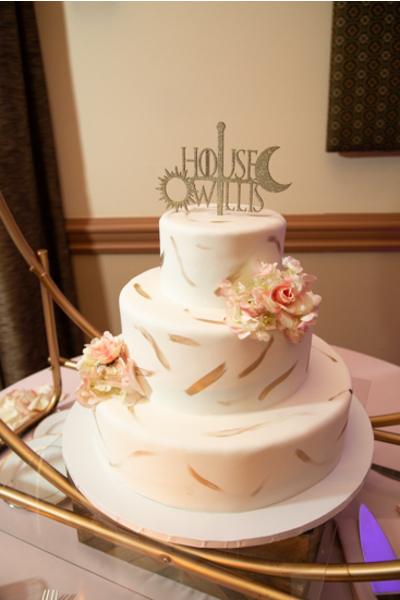 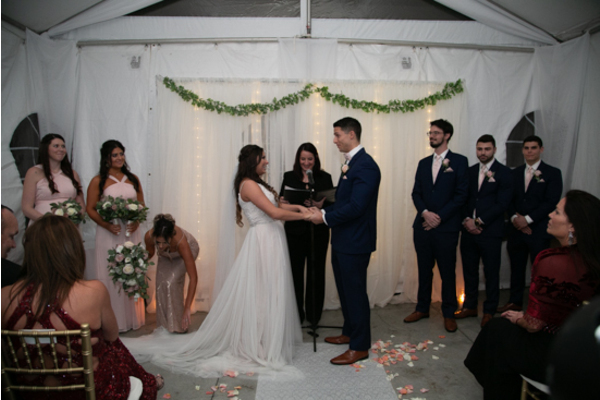 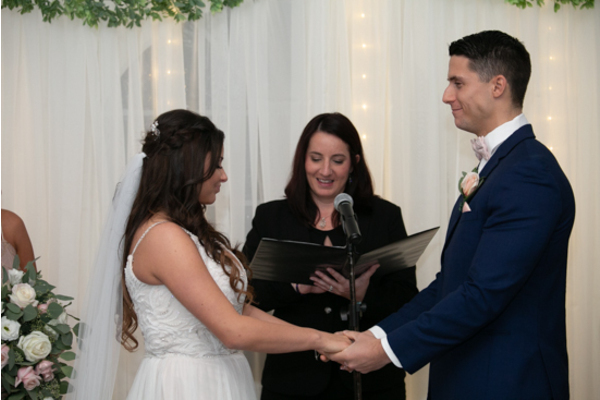 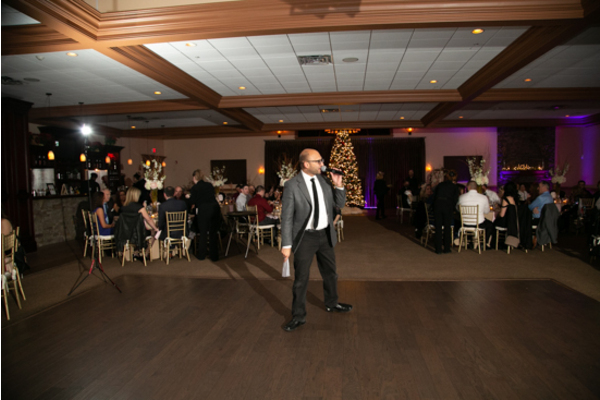 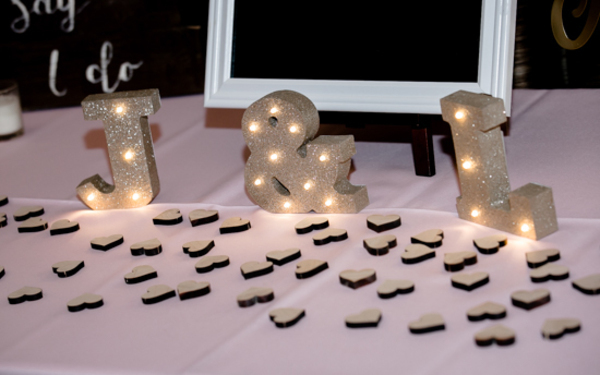 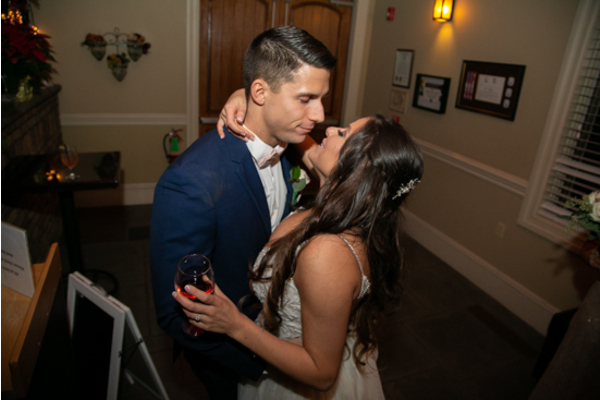 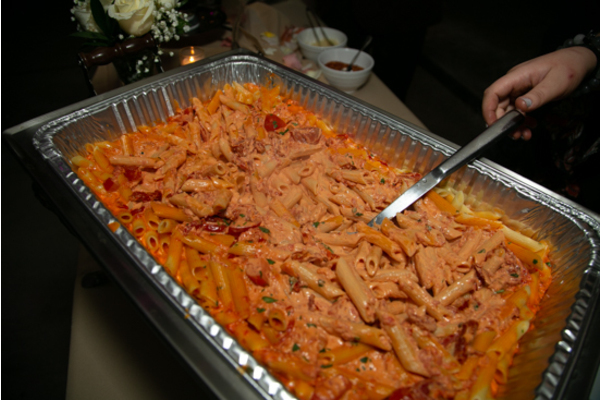 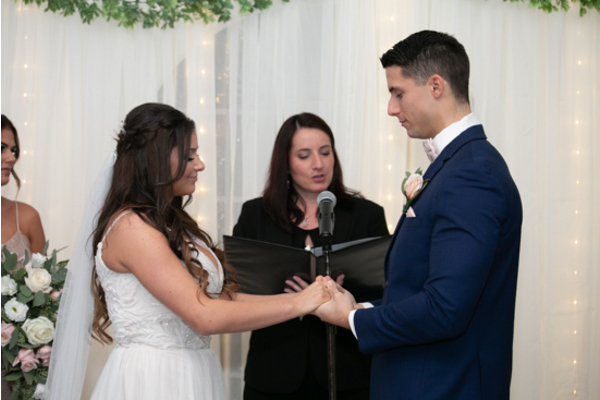 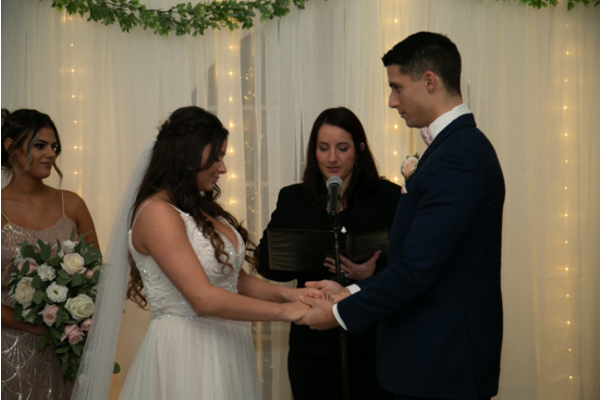 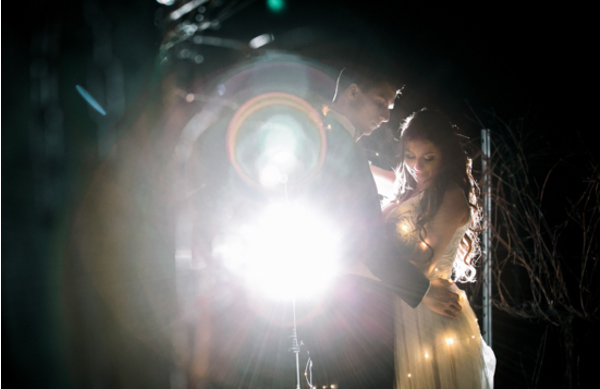 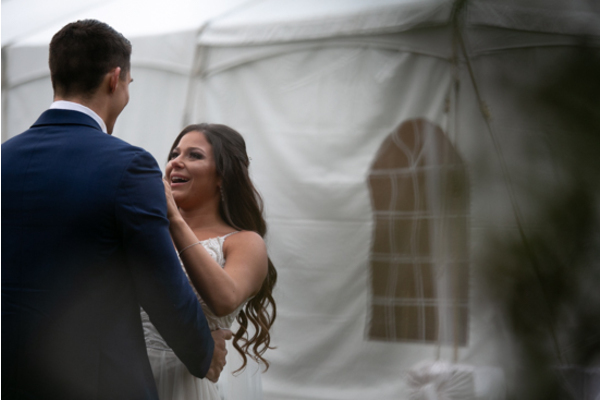 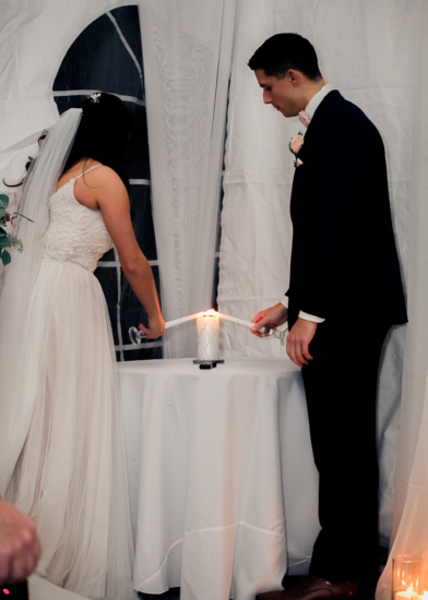 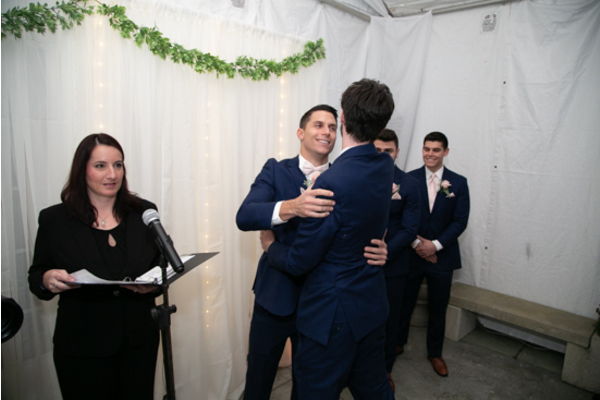 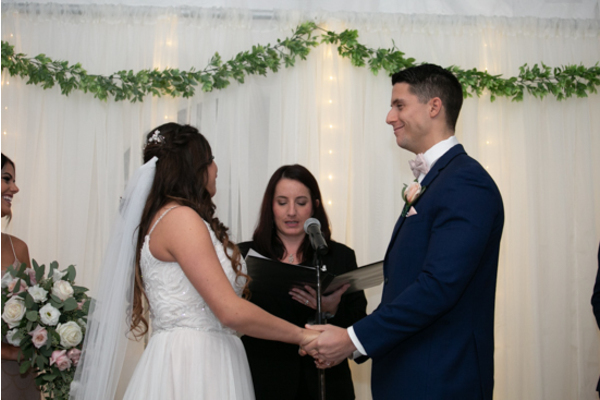 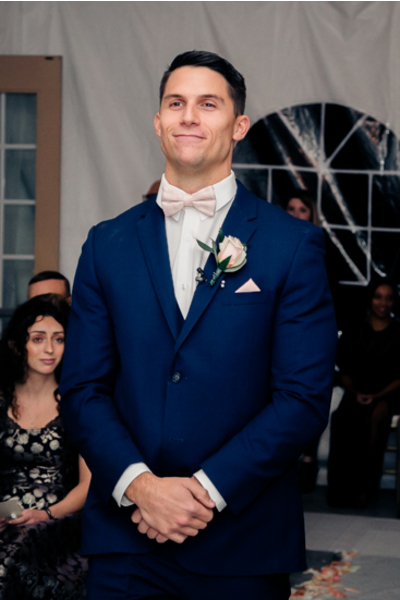 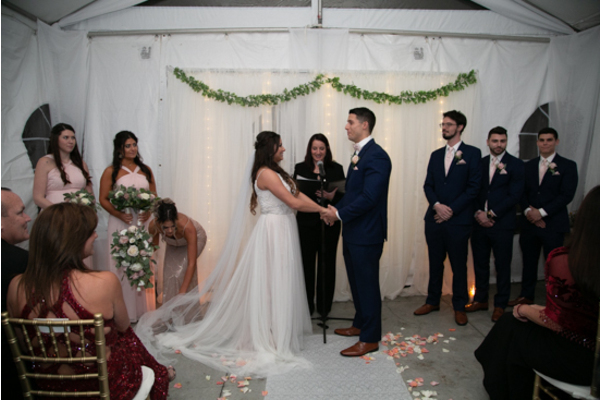 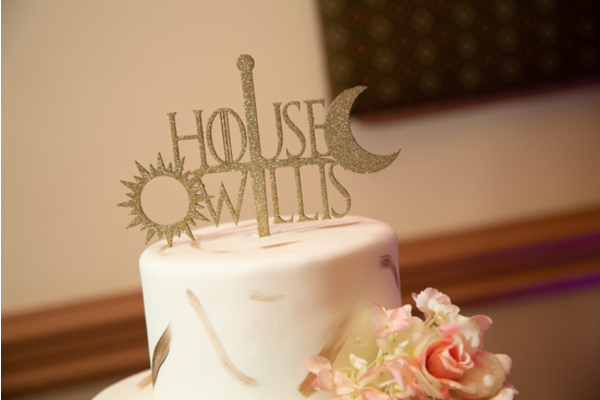 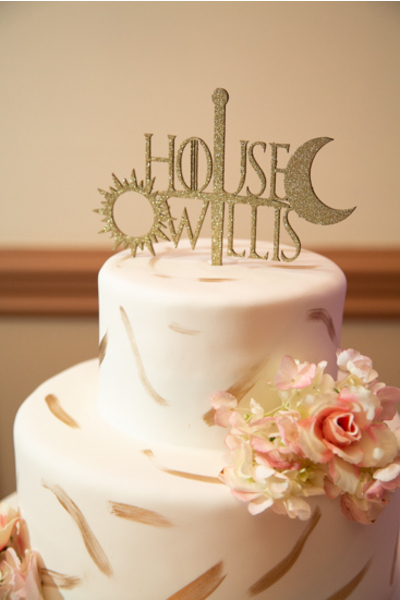 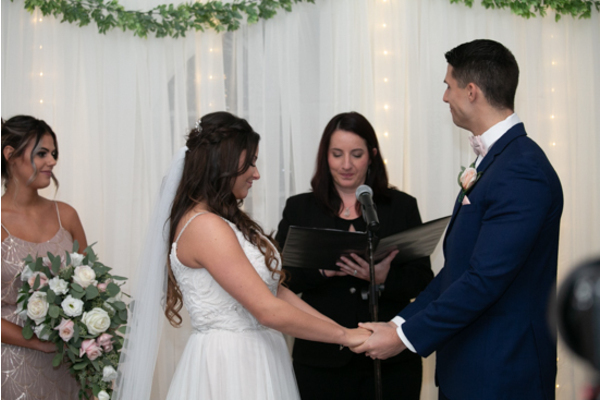 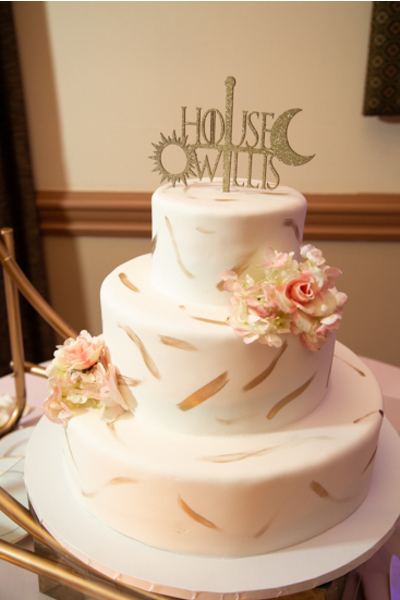 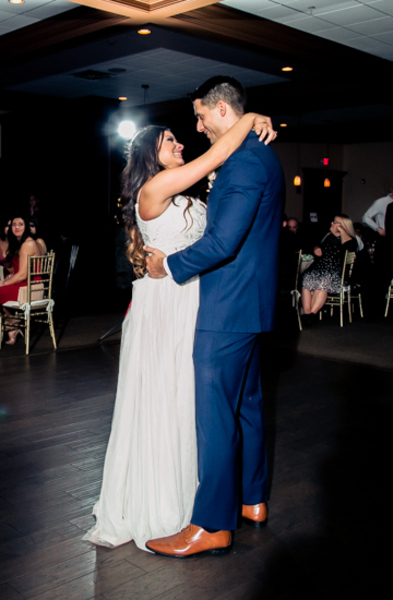 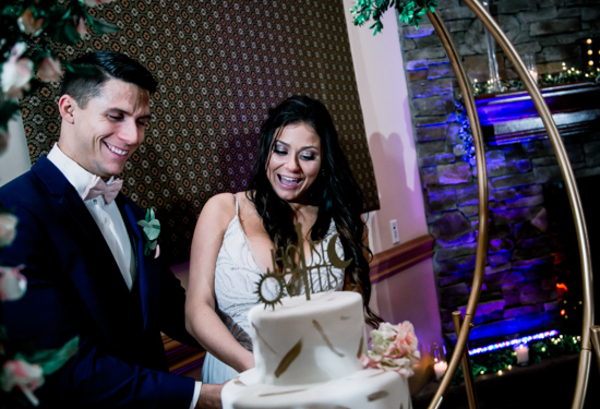 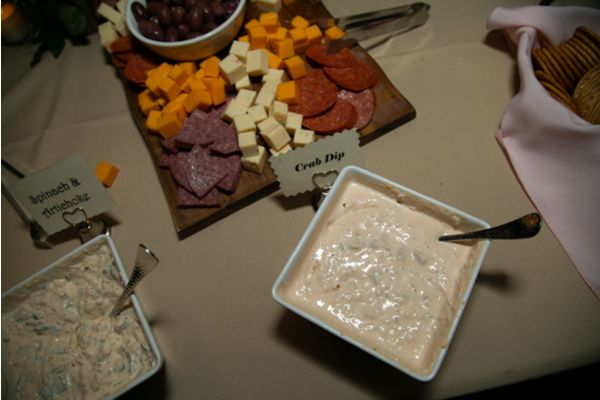 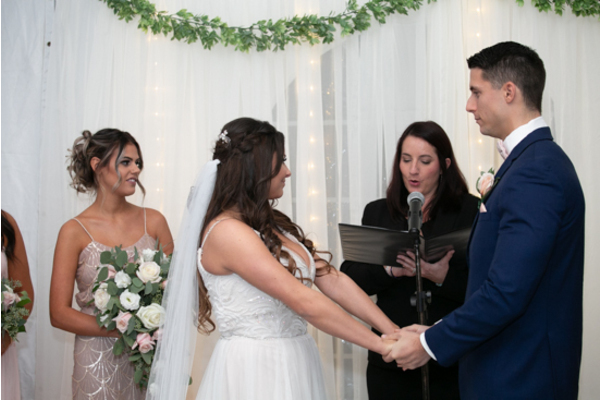 After a few sentimental speeches from their bridal party, our NJ Wedding DJ started this party up! 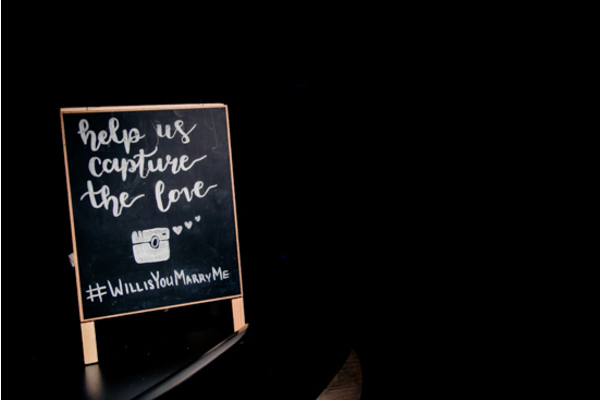 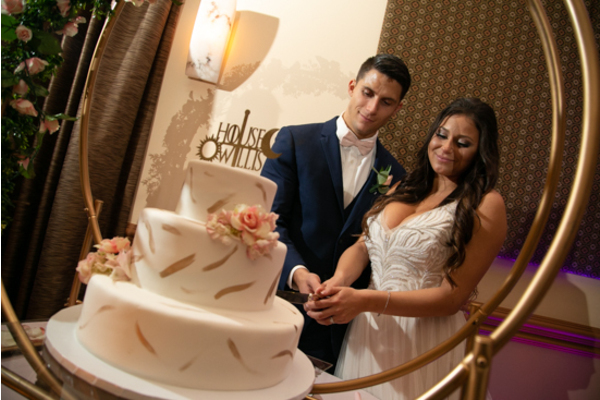 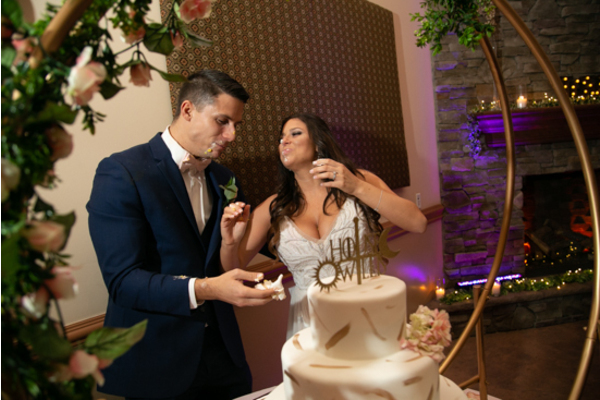 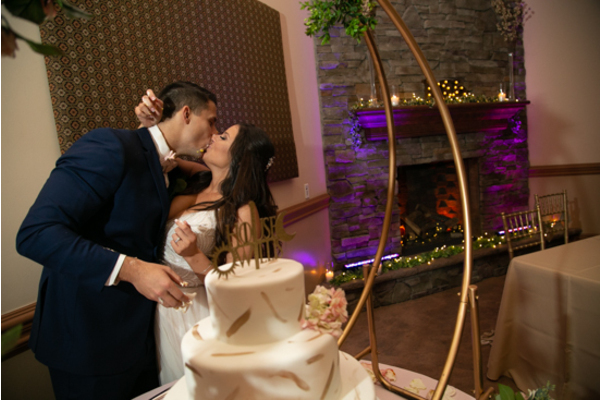 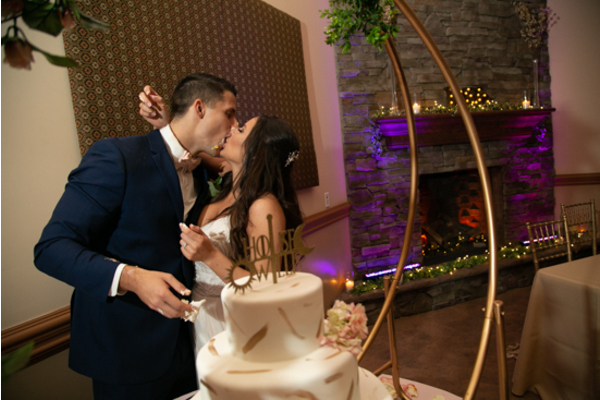 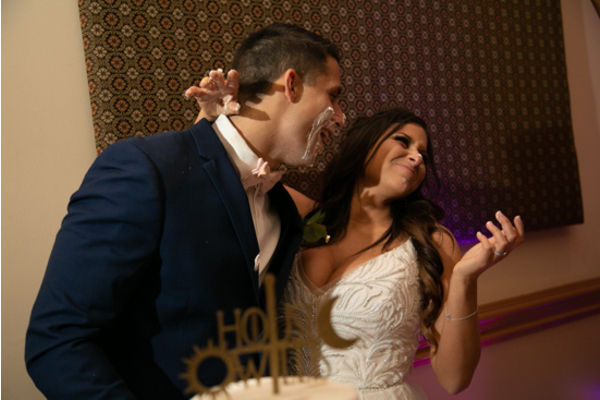 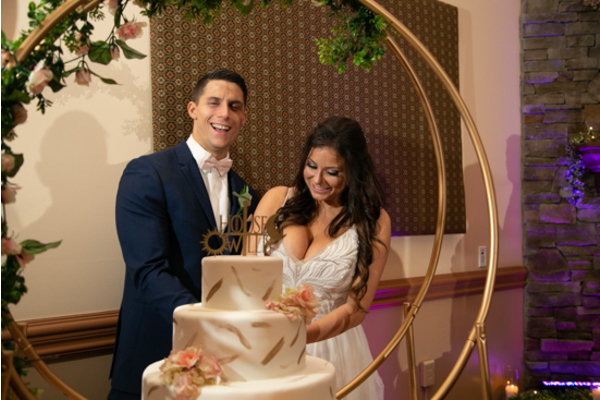 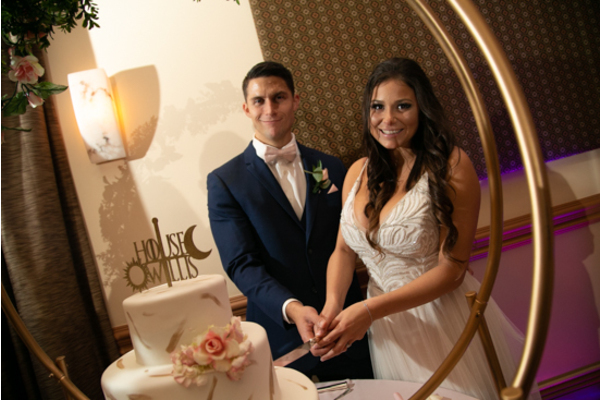 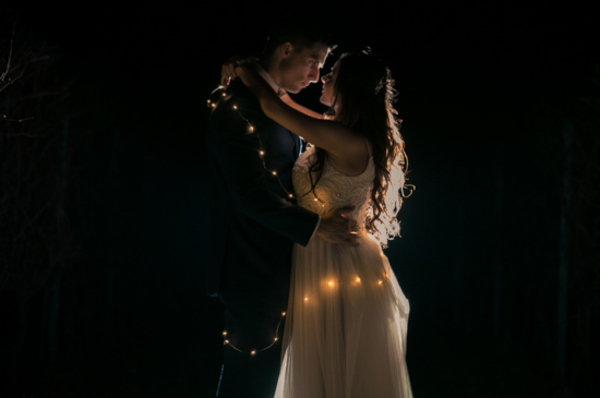 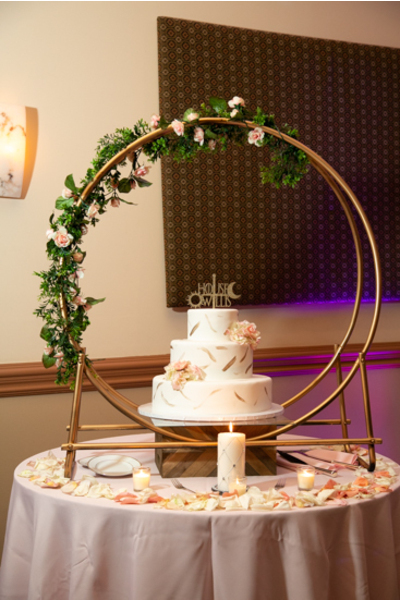 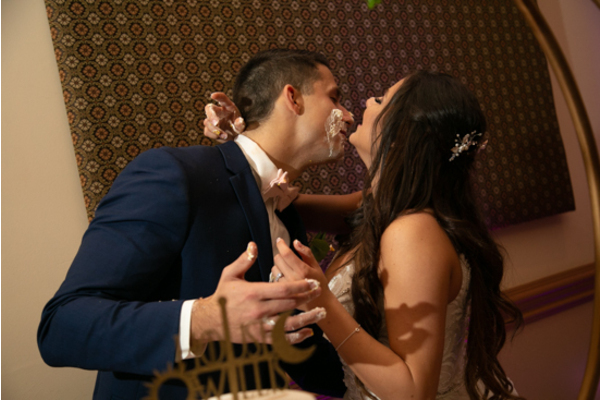 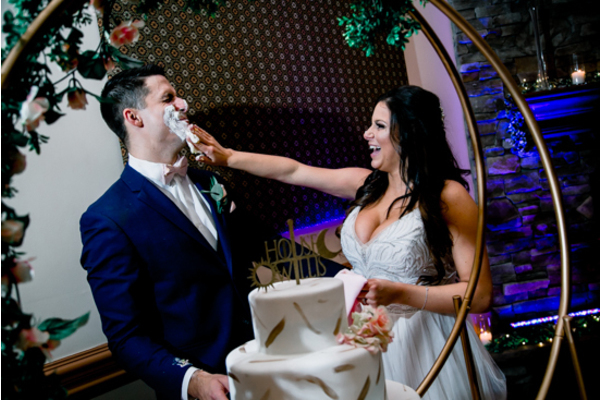 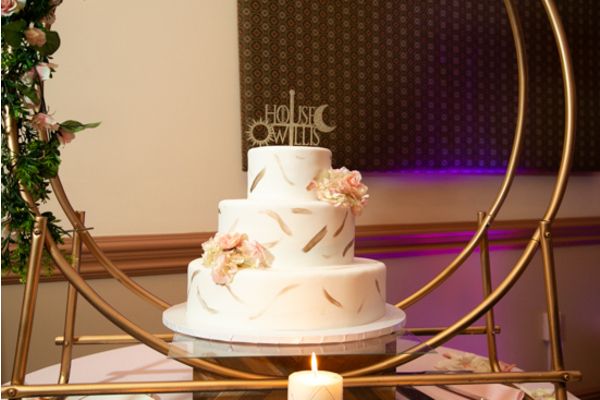 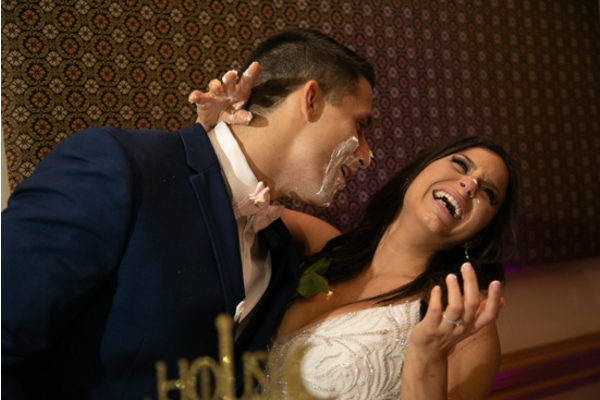 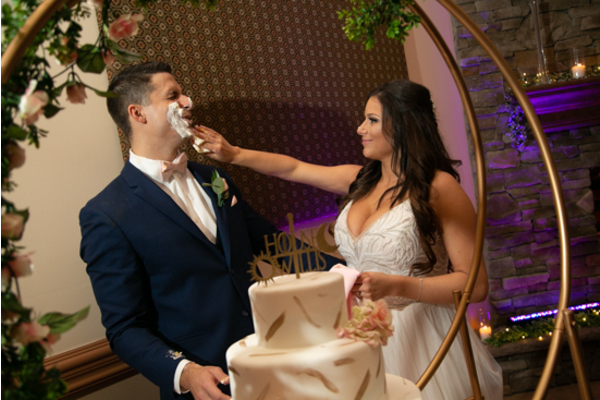 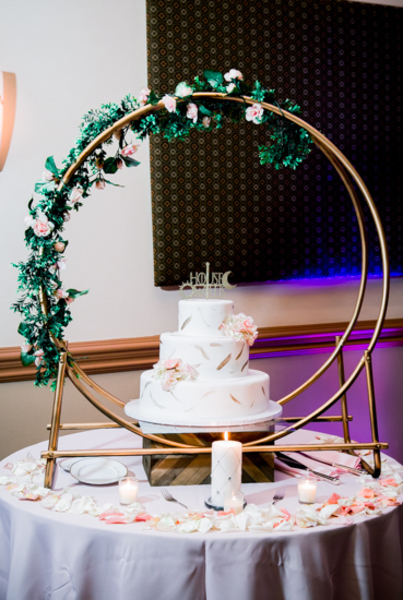 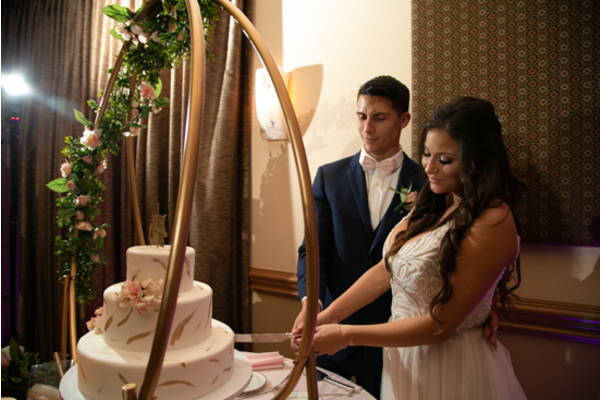 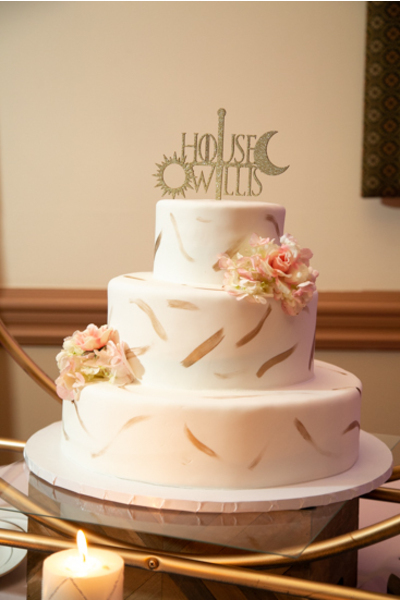 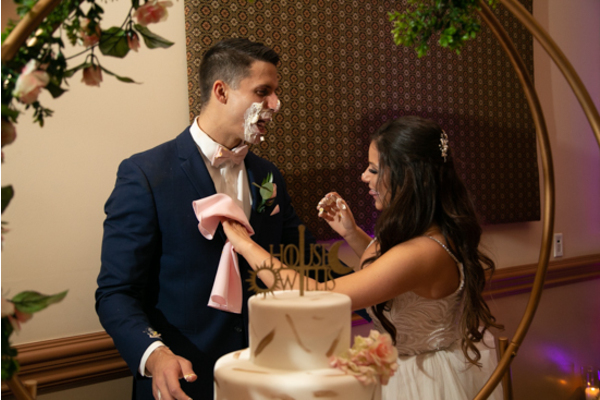 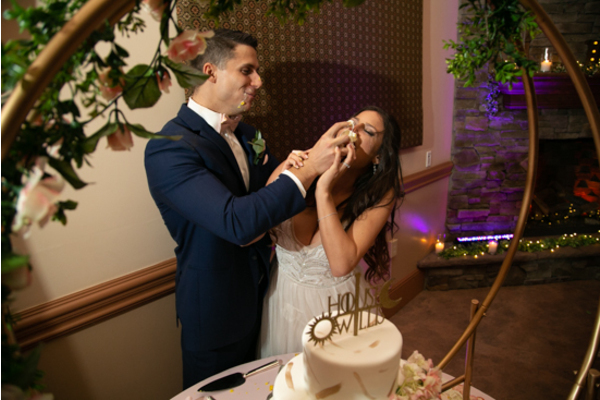 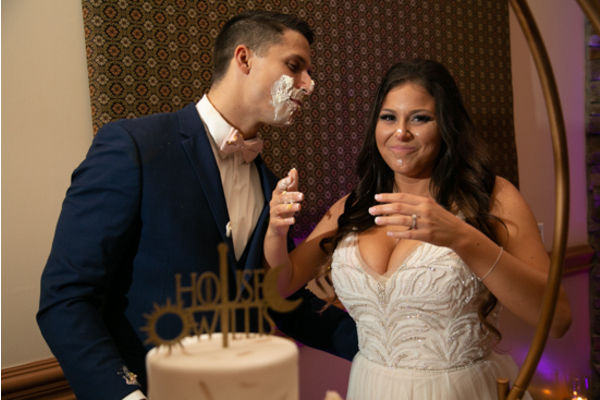 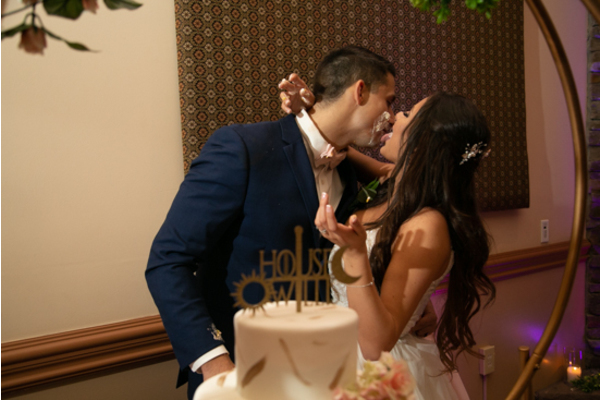 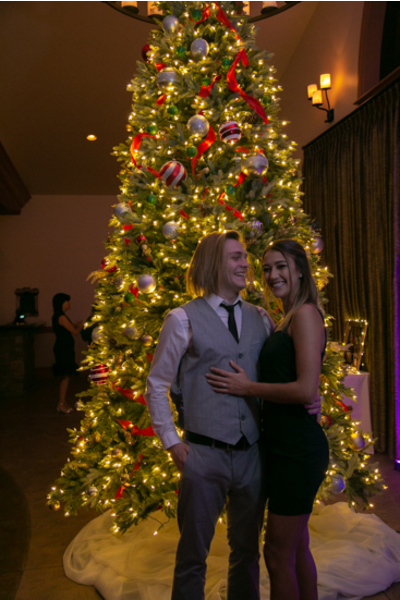 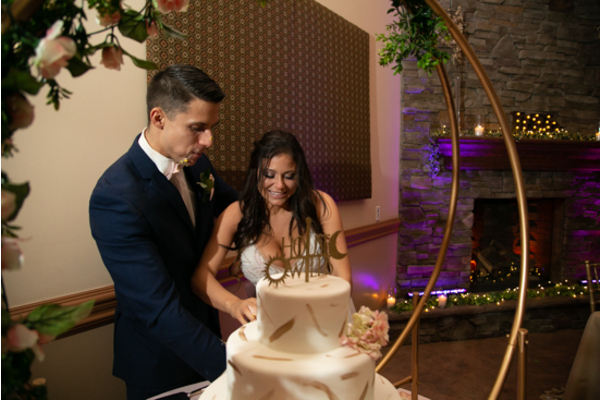 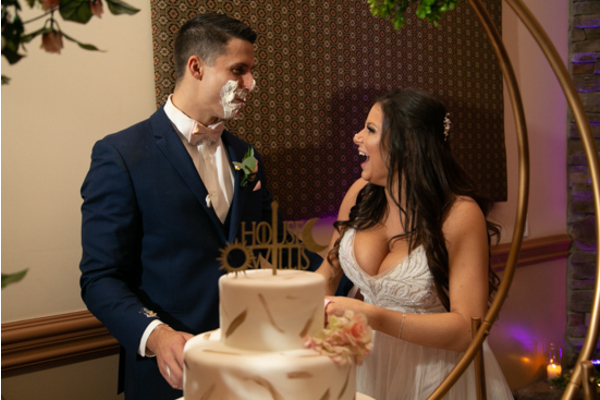 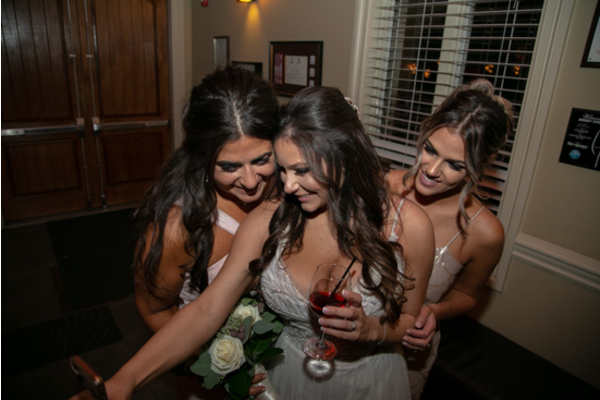 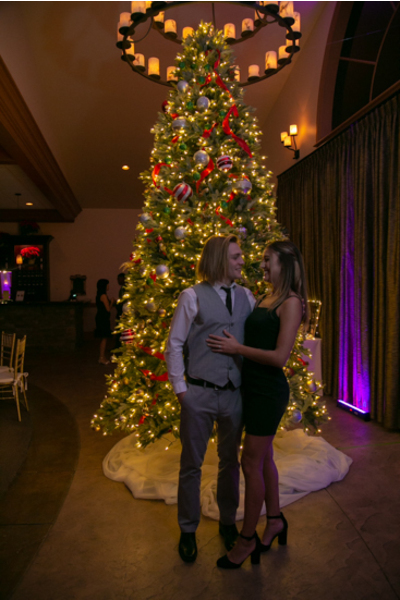 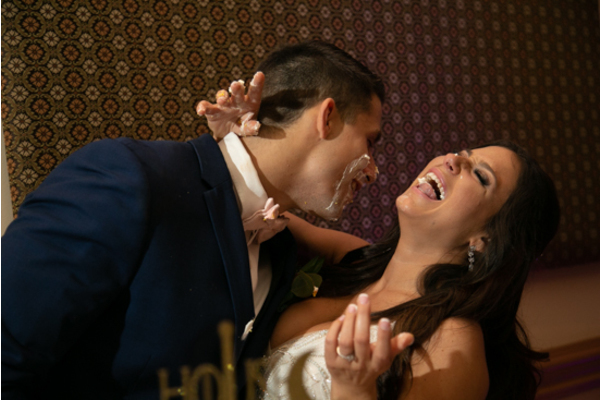 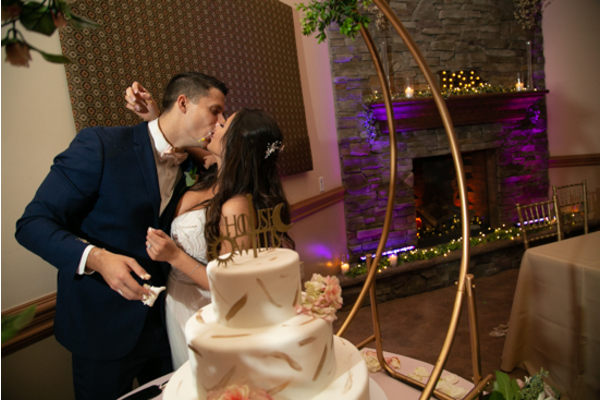 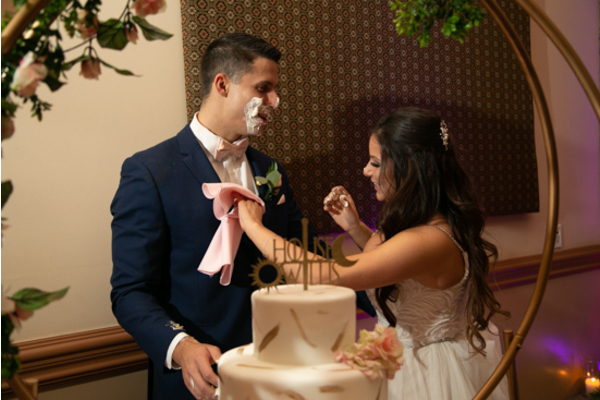 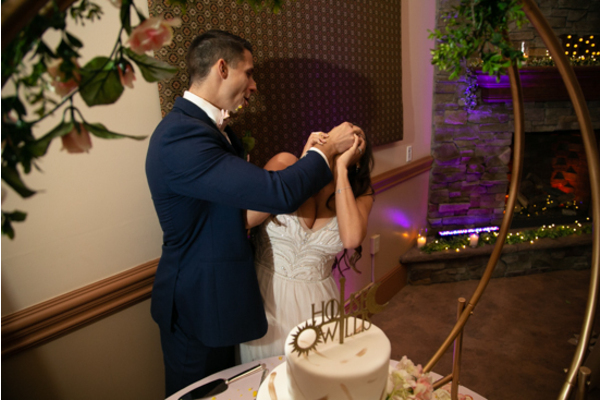 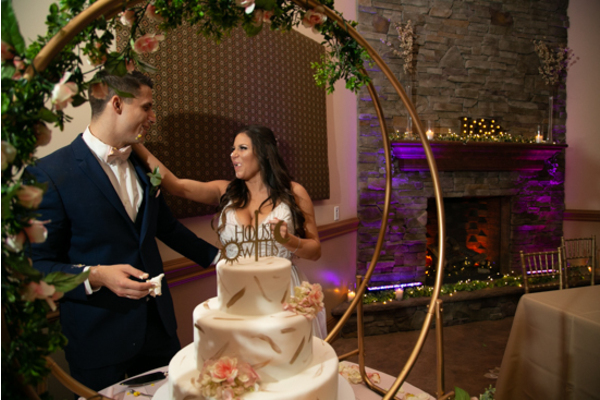 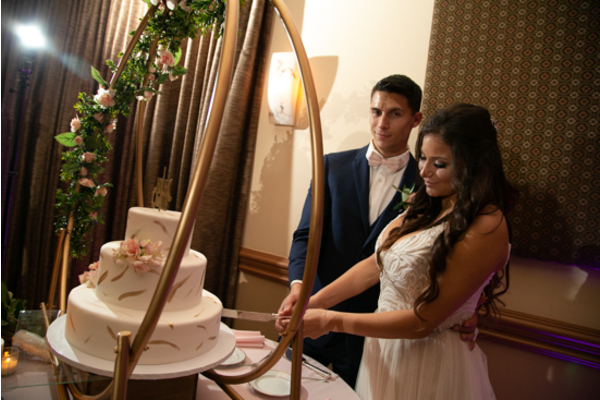 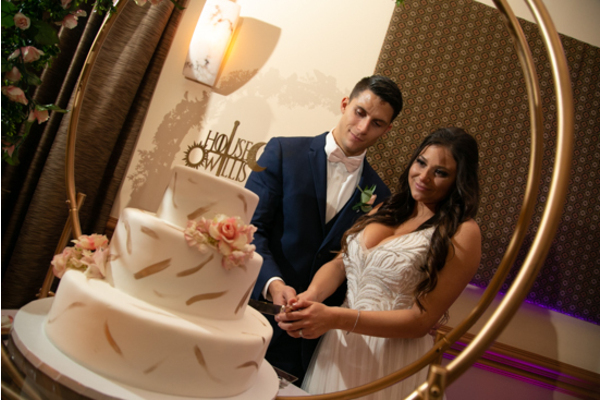 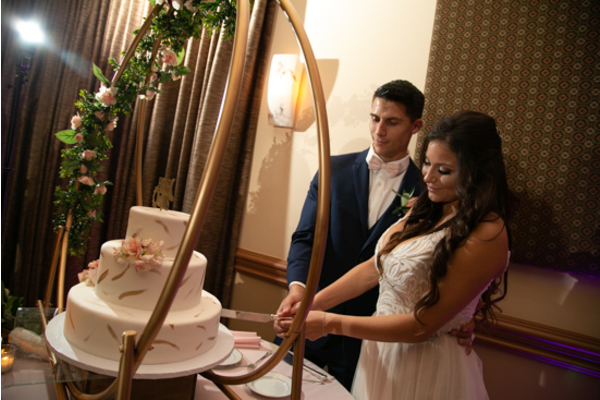 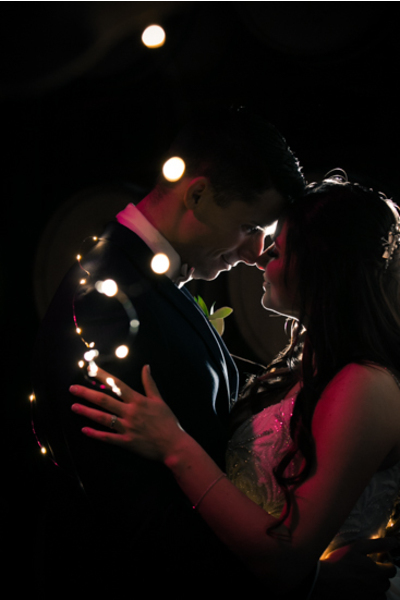 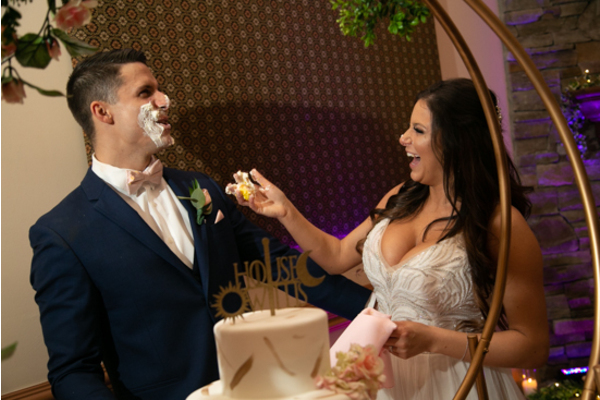 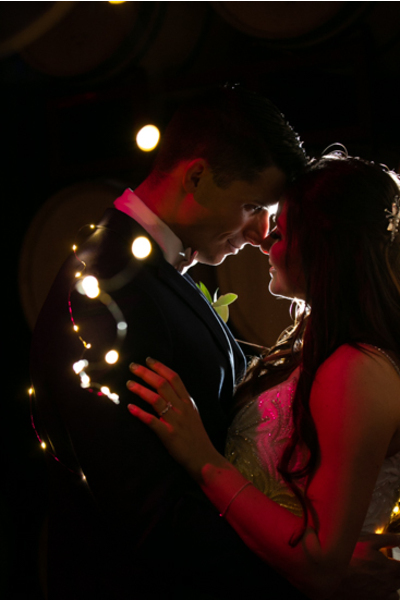 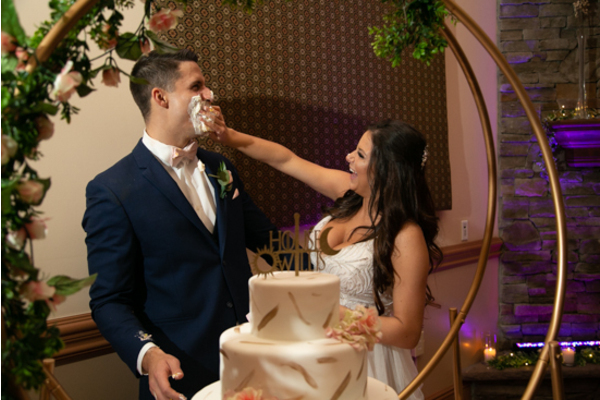 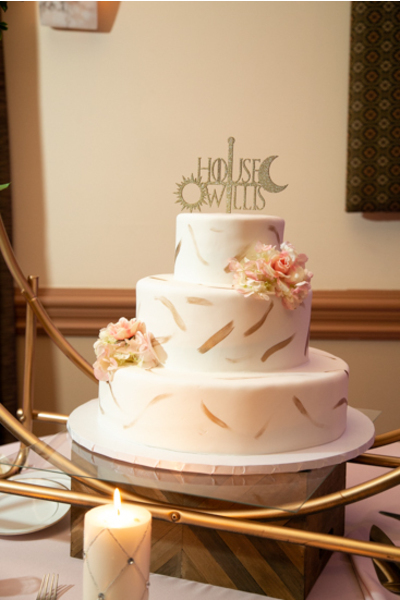 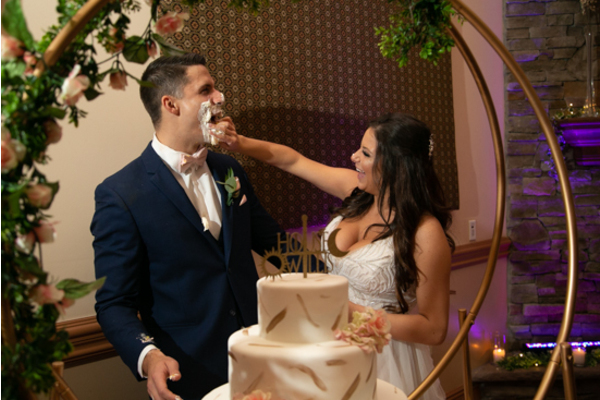 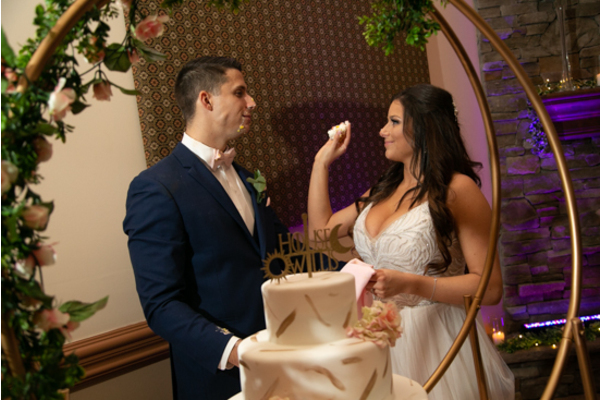 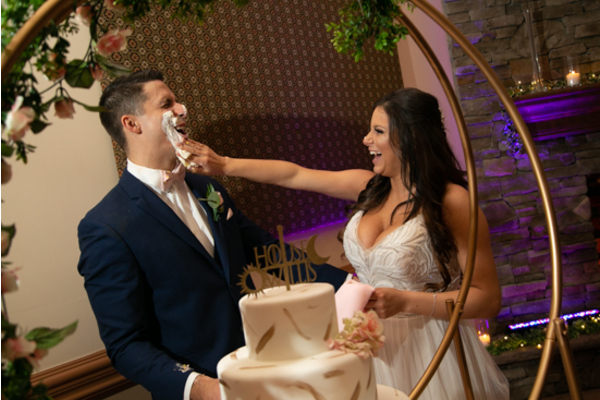 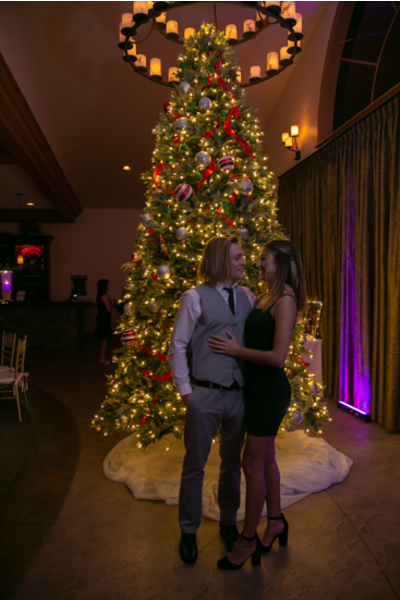 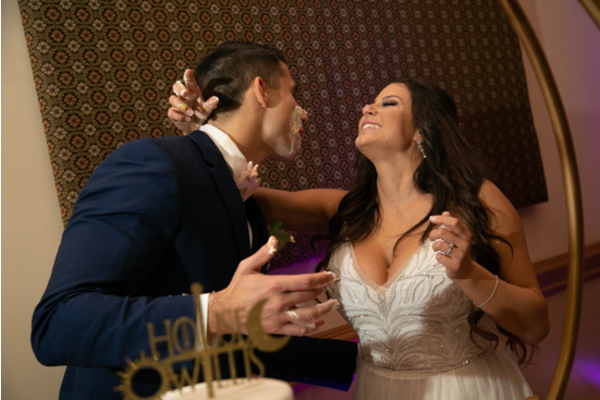 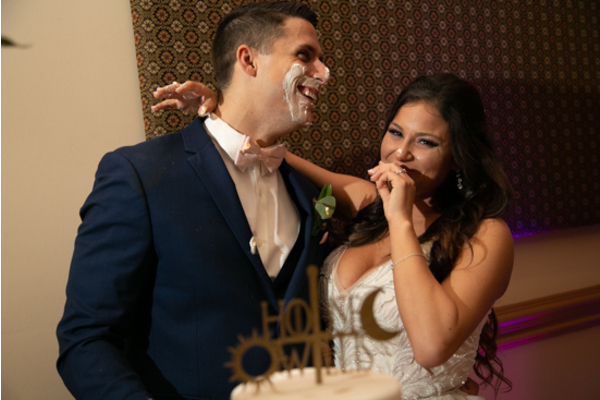 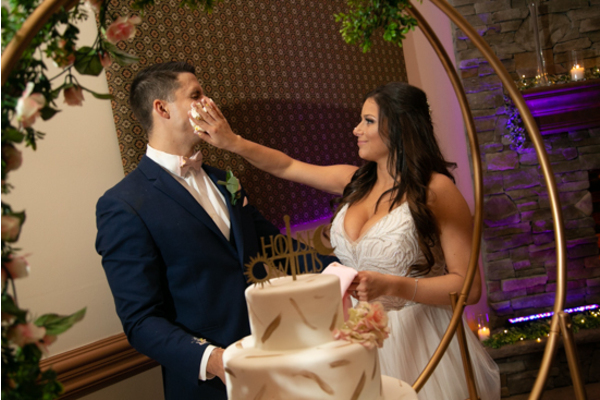 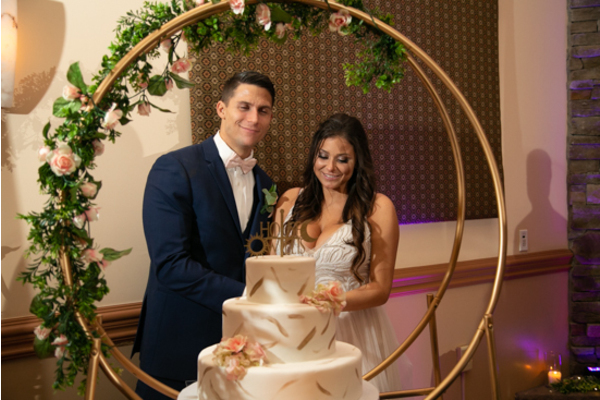 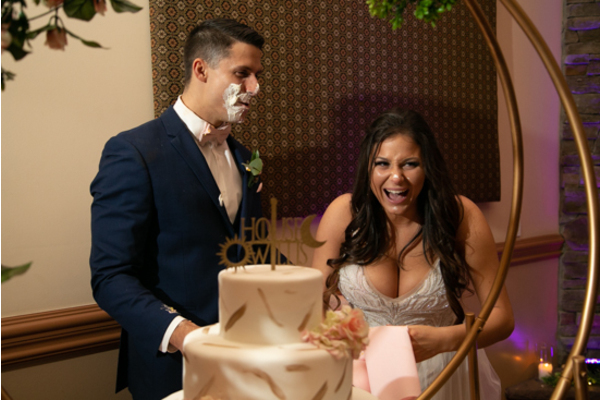 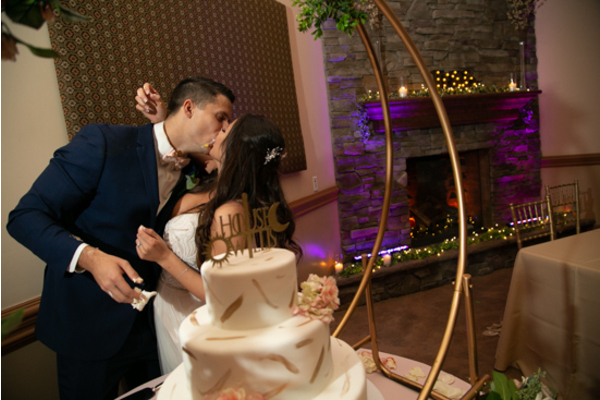 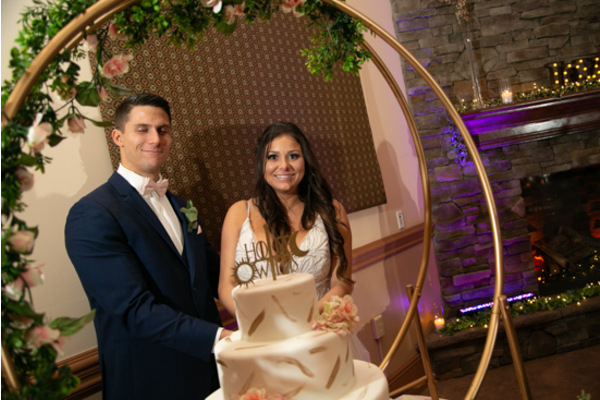 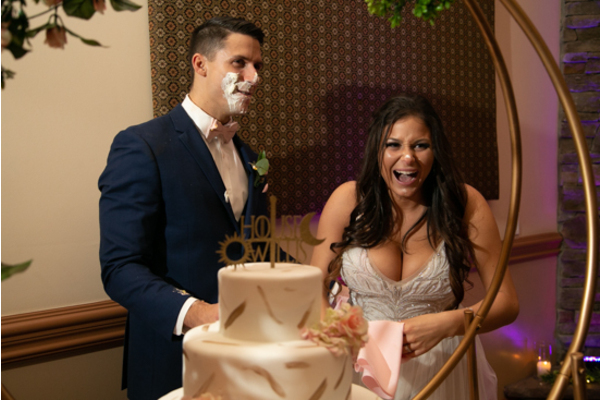 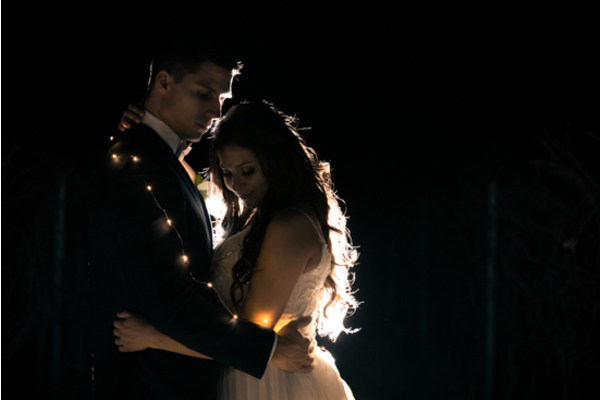 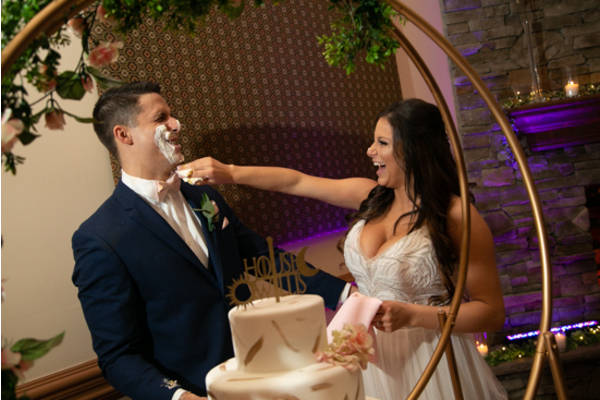 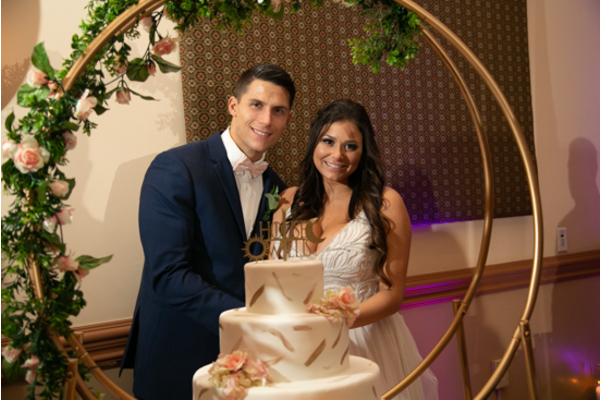 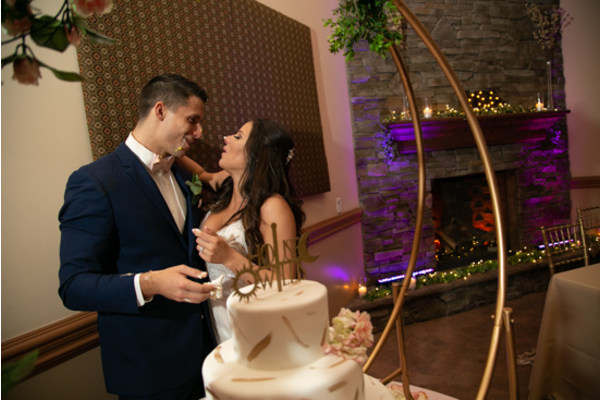 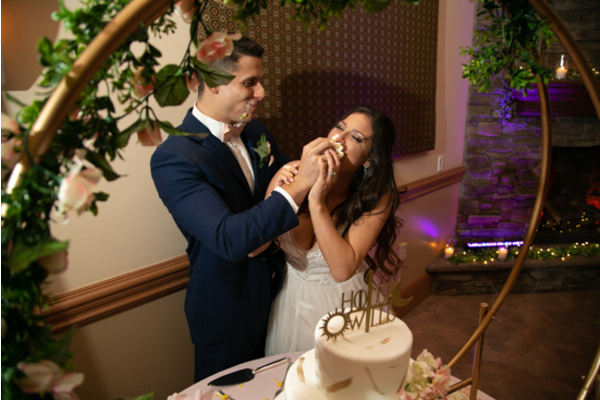 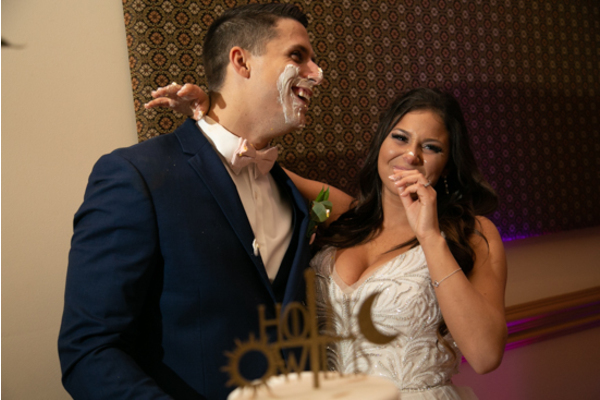 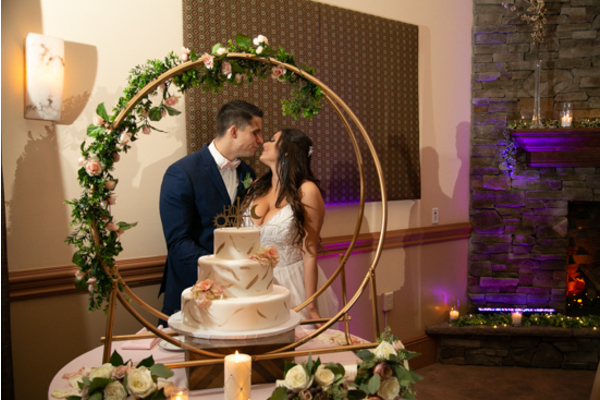 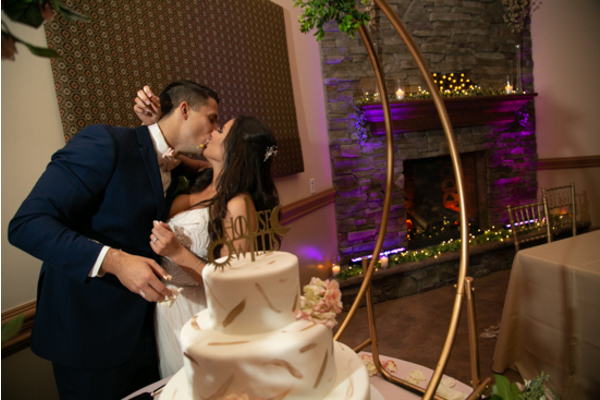 Once the cake had been cut and the bouquet thrown, the remainder of the night was spent making memories that would last a lifetime. 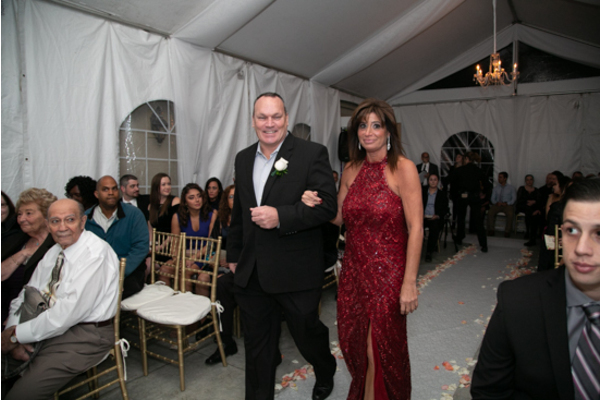 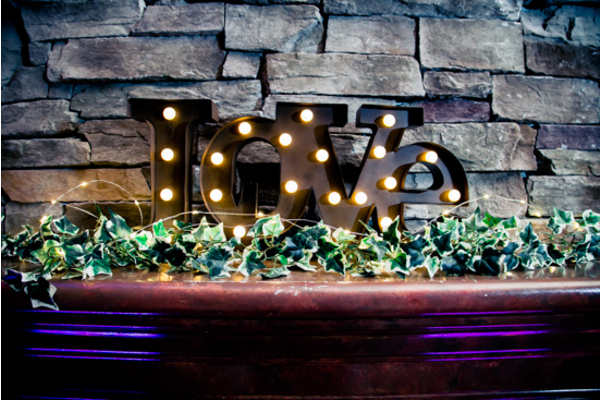 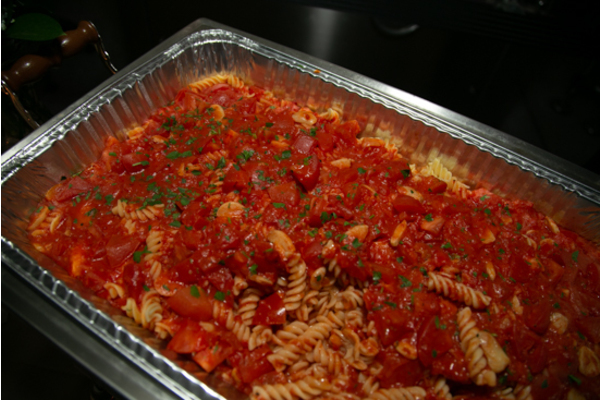 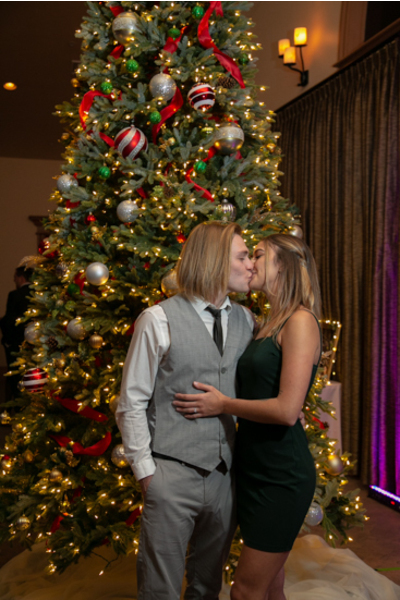 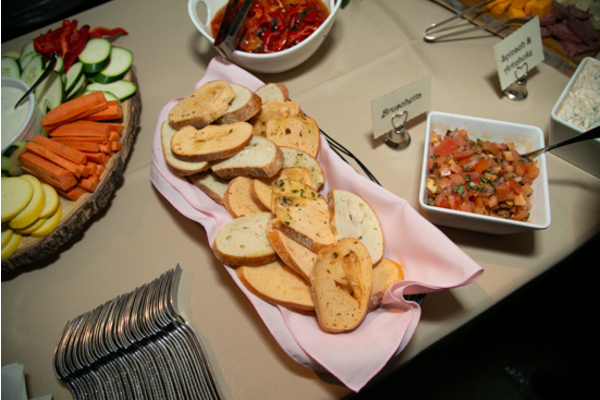 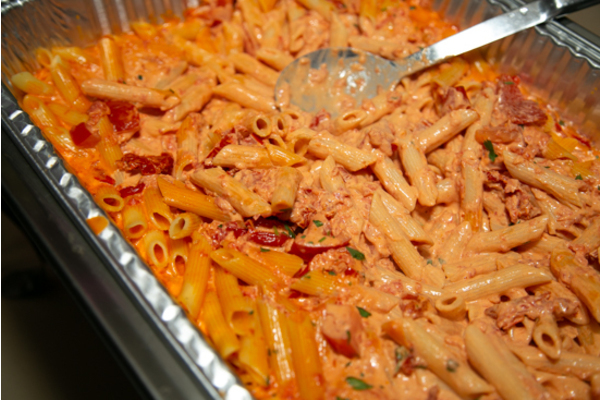 We are so grateful to have been apart of this truly one of a kind celebration! 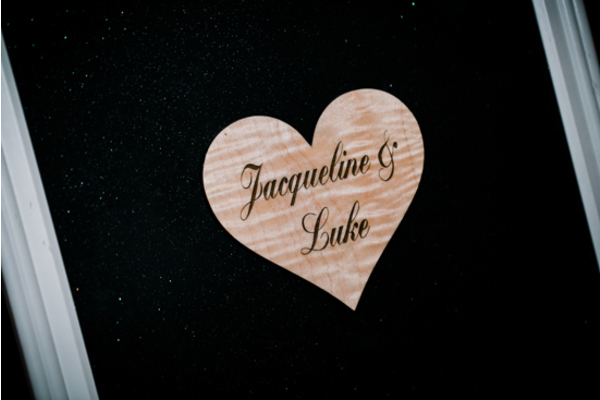 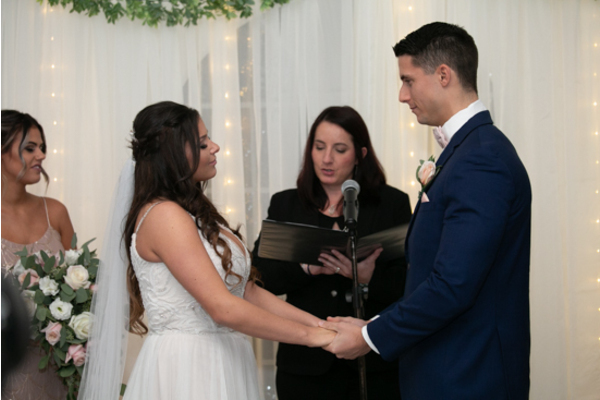 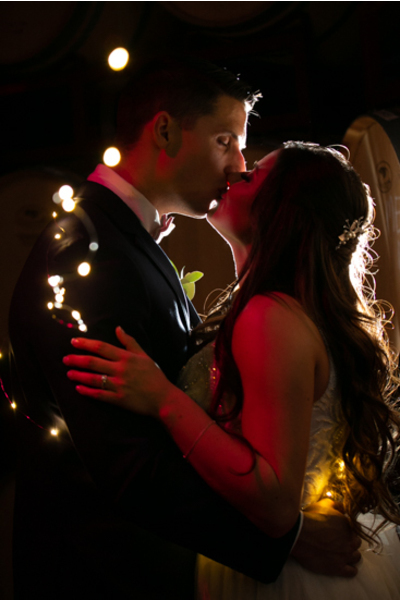 Congratulations once again to Jackie and Luke on their wedding day! 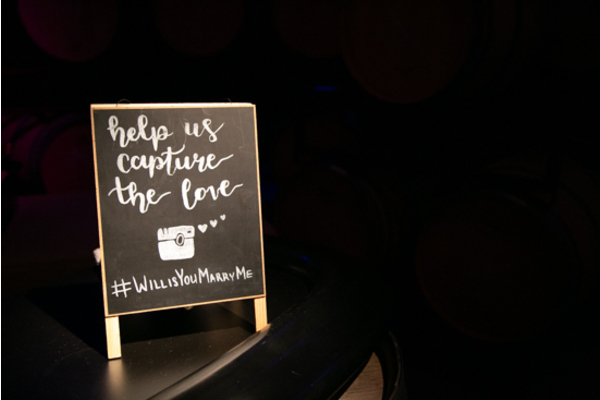 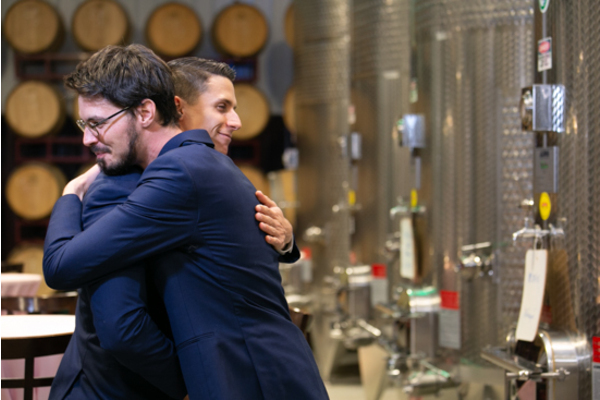 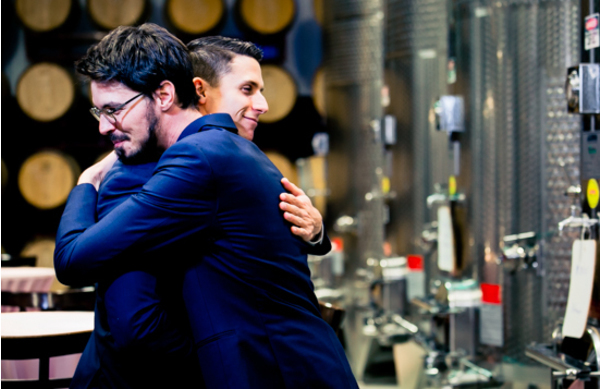 We can tell you two truly love the wine you are with!